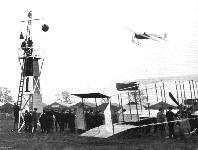 THE ARMY BIPLANE AT FARNBOROUGH. - Lieut. Mackworth in the pilot's seat prior to an early morning trip over the Common. 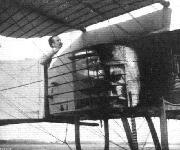 Mr. de Havilland in the pilot's seat of BE 2 at Farnborough. AVIATION IN SOUTH AFRICA. 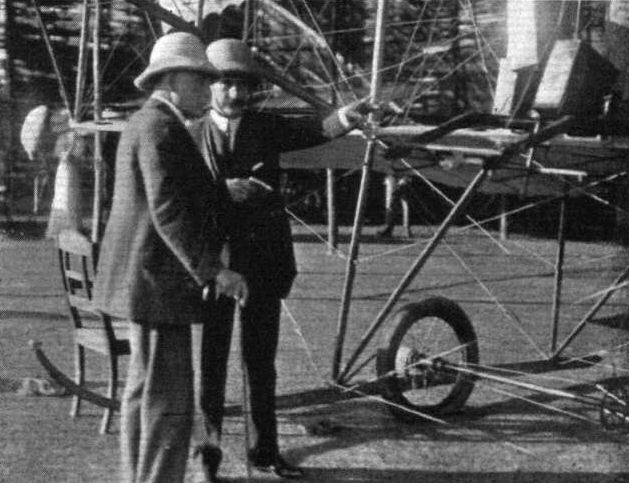 - On the left Mr. Compton-Paterson and Mr. Driver in the Good Hope Gardens with Captain Livingstone (in centre), who is associated with this aviation enterprise. On the right Mr. Driver ready for a start on his Bleriot. Review of the machines at the London Aerodrome, Hendon, at the Naval and Military Meeting last Saturday. - General view of the aeroplanes lined up. FLYING IN INDIA. - Jules Tyck starting for the first flight in India at the Tollygunj Golf Club. 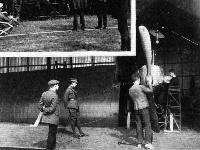 Robert, as a handy man at the London Aerodrome, giving some weighty help to Desoutter when about to start on his Bleriot for an exhibition flight. Waiting the signal to start in the cross-country handicap at Hendon, as seen from the Judges' box. 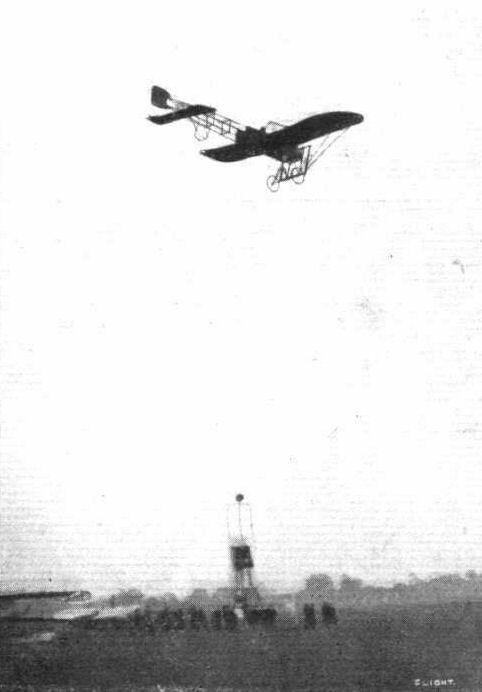 Mr. B. C. Hucks on his Bleriot awaiting the dropping of the flag. FLYING IN INDIA. - A curious effect from a double exposure of a negative whereby the two machines at Tollygunj were apparently flying at the same time. Note the excitement of the natives in following the evolutions of the machines. 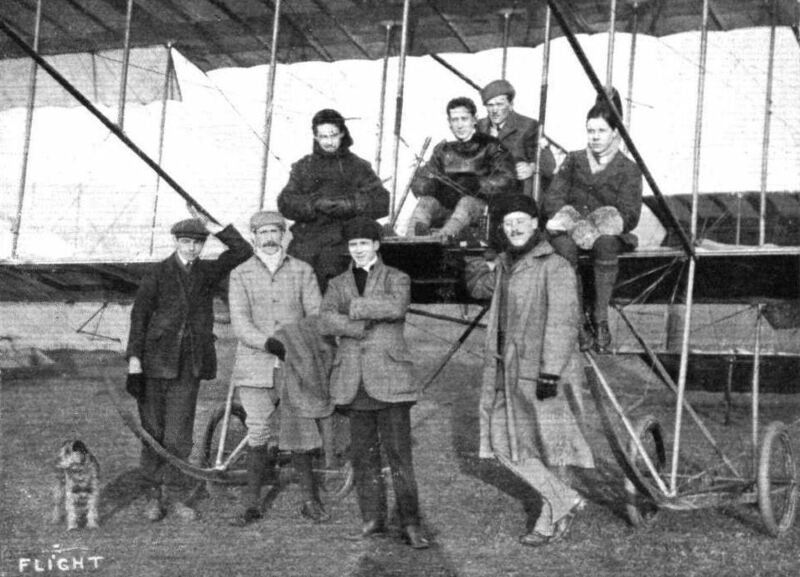 The Chanter Flying School at Shoreham, with their two Anzani-Bleriots and their 35-h.p. 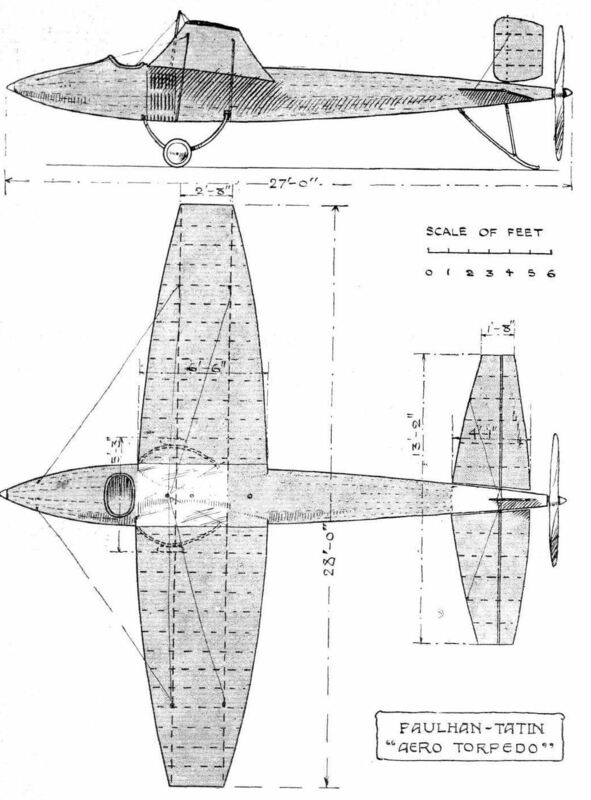 monoplane modelled on Nieuport lines. At the left-hand side is Mr. M. Chanter, the Director of the school. To the right are Messrs. De Villlers, Gassier, Kent, Ross, and two of the school mechanics. Miss Dorothy Prentice attending to the motor of the machine In which she practises at Hendon Aerodrome. MDME. 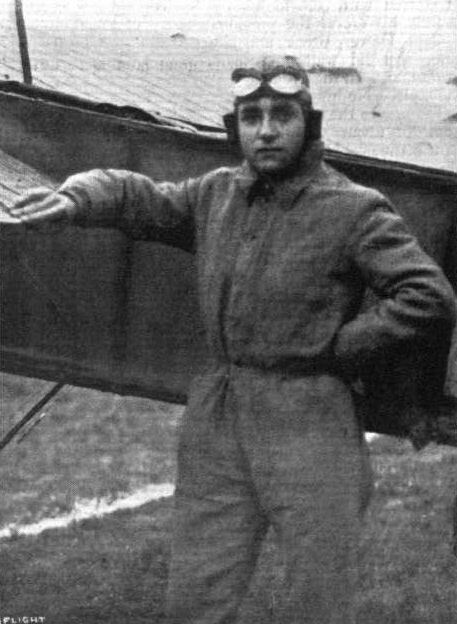 JANE HERVEU, Who, in competition for "La Coupe Femina," put up a flight at the Compiegne Aerodrome on December 31st, on a Bleriot monoplane, of 248 kiloms. in 2 hrs. 41 mins. Cyril Foggin, who has just passed for his brevet at Fowler's School, Eastbourne, and the machine on which he bad his safety helmet experience recently. 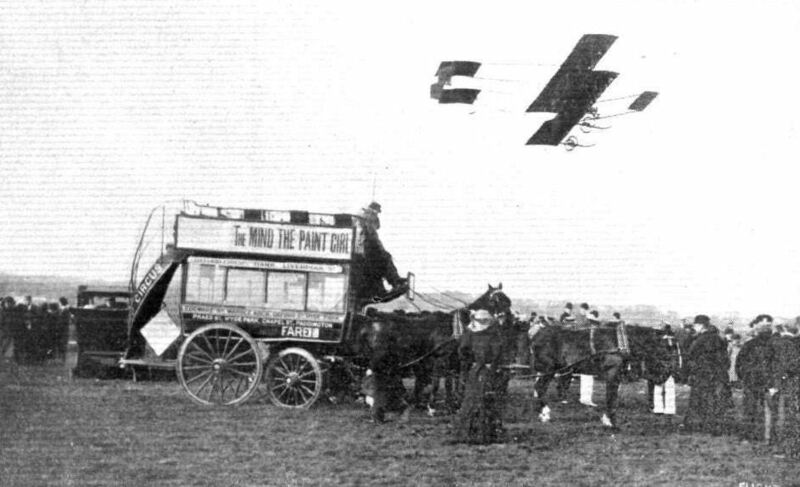 The special trolley which has been devised by the Eastbourne Aviation Co. for the purpose of conveying their aeroplanes by road, and for use as a breakdown vehicle. Miss Dorothy Prentice, of the Ewen School, being initiated into the Bleriot control. SOME OF THE HENDON PILOTS. - Mr. B. C. Hucks on the 50-h.p. 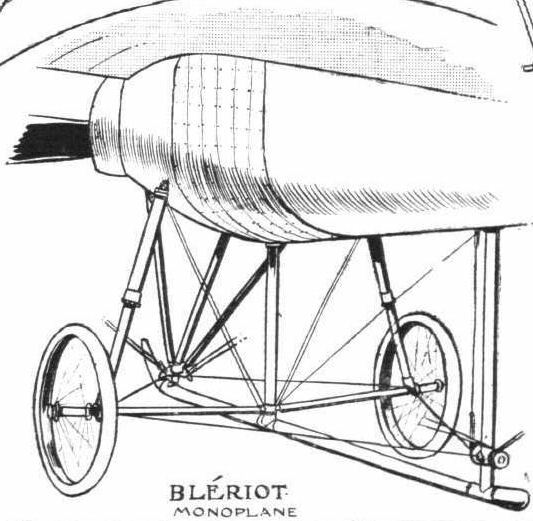 Bleriot. Lewis Turner, chief pilot of the Grahame White School, is learning to fly the Bleriot. Mrs. Stocks just about to start for a flight on her Bleriot monoplane at the Hendon Aerodrome. BRINGING BACK THE BITS. - A reminiscence of last summer at Hendon. On the left Messrs. W. Gibson, Clutterbuck, and S. Henderson, an old pupil at the Bleriot school. On the right, in front, H. Salmet and P. Prier, both of Paris-London-Paris fame, and poor Petitpierre, who was shot by the lunatic Hanot last autumn. 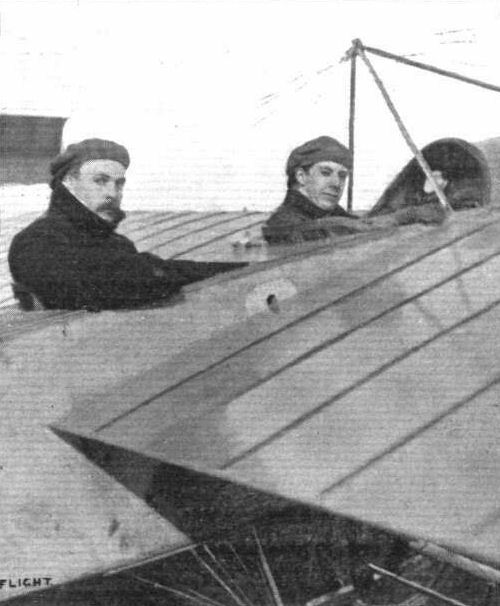 Supporting the tail are Frank Champion on the left and George Dyott, both of whom have been doing much good flying in the States, the former on a Gnome-Bleriot, the latter on a two-seater Anzani-Deperdussin. Frank Champion, as mentioned in this week's "Eddies," is now in bed suffering from a smashed leg, the result of the accidental discharge of a gun held by Gibson, who figures on the extreme left of the picture, while the two were out shooting rabbits at the Dominguez aerodrome, Southern California. Gordon Jones, of model fame, is walking alongside, bringing back a handful of propeller fragments. 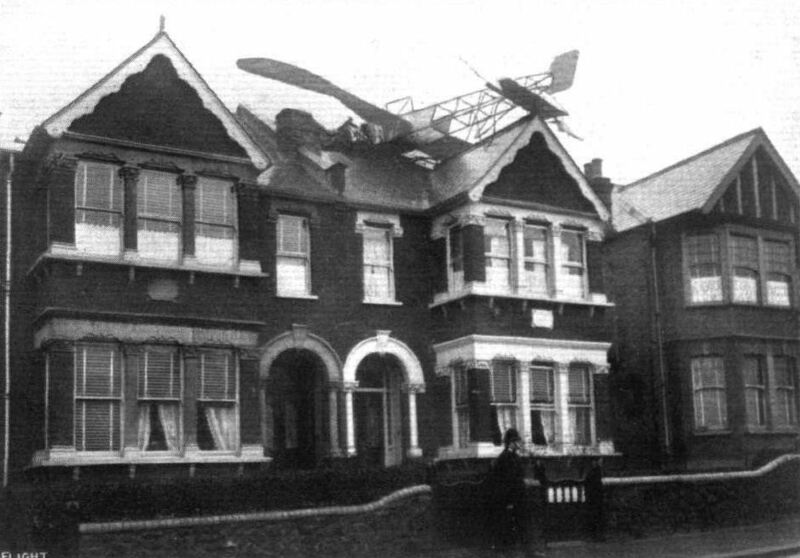 A flying visit to Palmer's Green, showing M. Manio's monoplane after it bad settled down on the roof of one of the houses in Derwent Road, Palmer's Green, through engine trouble during his attempt to reach Hendon last week. It is a remarkable fact that the pilot was not injured, although his machine was damaged and a considerable hole made in the roof. M. Manlo ultimately regained terra firma by means of a ladder. MR. C. HEMIN'S BLERIOT AND HOWARD WRIGHT MODELS. - The latter is fitted with a compressed-air motor with which some good flights have been obtained. FLYING IN INDIA. 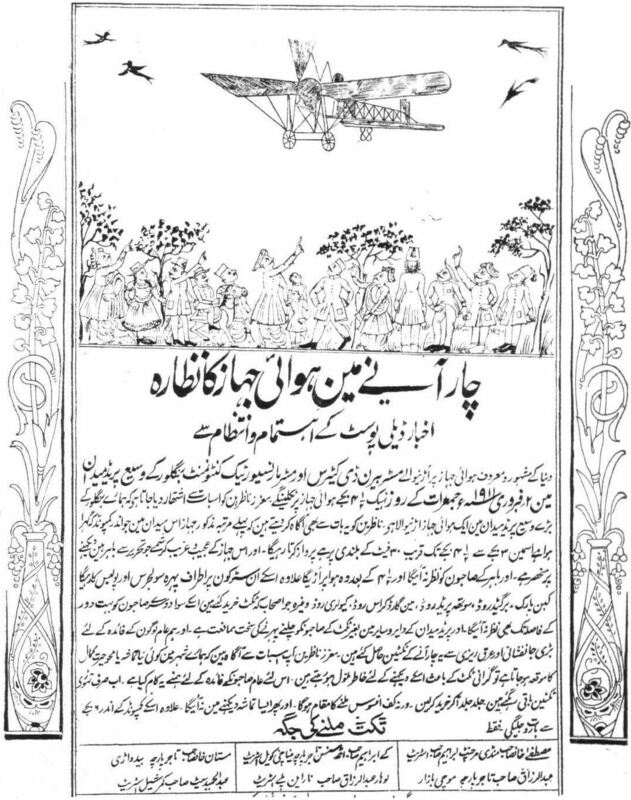 - A native poster, in Urdu, announcing the flights in Bangalore. This is chiefly interesting from the fact that it calls attention to the legend that according to the Sacred Vedas the end of things mundane will take place a thousand years after a man has come flying. We are indebted to Mr. Ernest Esdaile for being able to reproduce this poster, who has presented a copy to the Royal Aero Club. 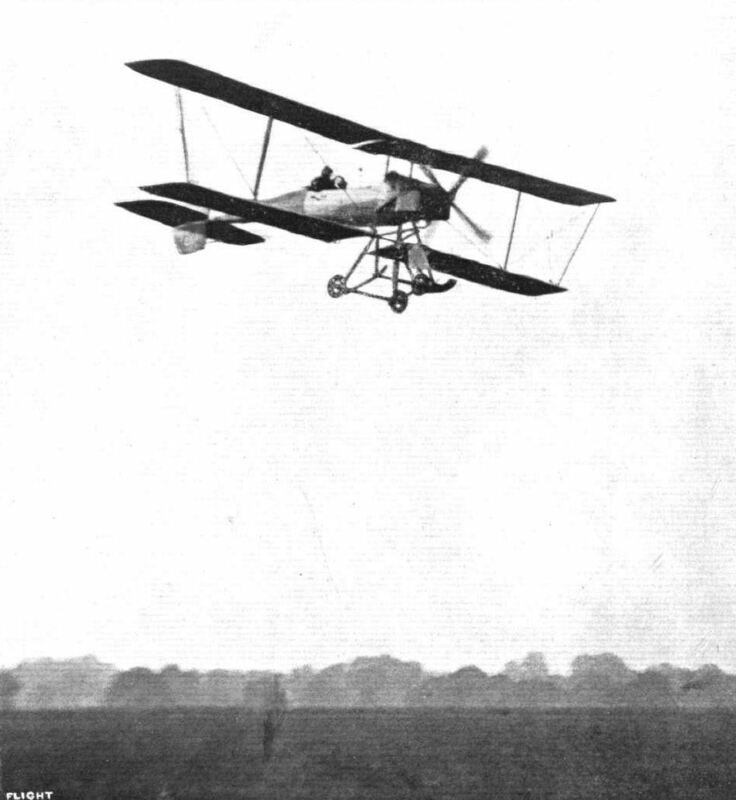 View of the British Deperdussin monoplane which secured a L500 prize in the Military Trials. 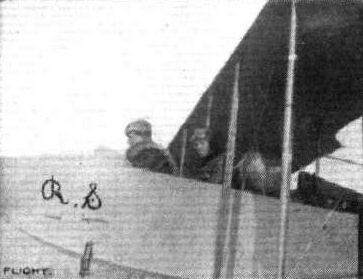 THE FIRST MONOPLANES FOR THE TURKISH ARMY. - Standing in the pilot's seat of the R.E.P. 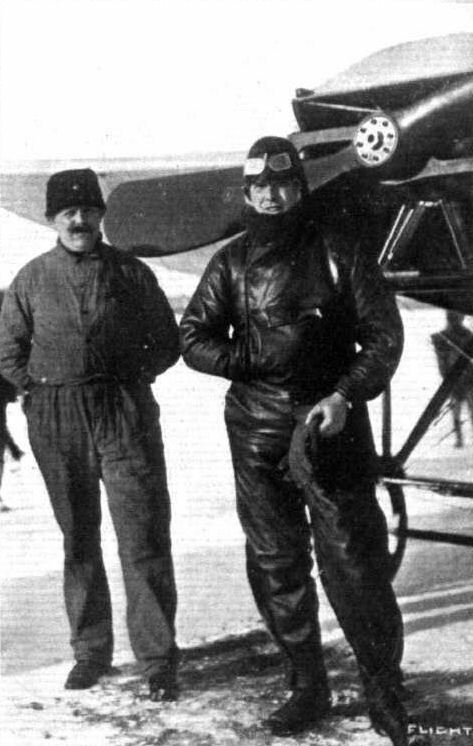 (left-hand machine) is Commander Fessa Bey, the first Turkish military pilot. In front the Turkish Military Commission is seen, the fifth from the left being Gen. Mabmud Schefket Pasha, the Turkish War Minister. On the right is a British pilot, who has been engaged, with his R.E.P. monoplane, by the Turkish Army as instructor. The Deperdussin monoplane escadrille at the great French aeroplane review at Villacoublay last week. 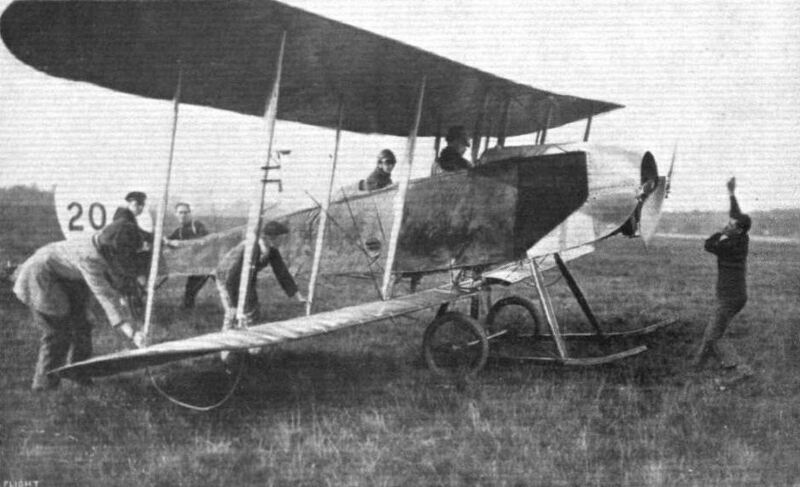 The British-bullt two-seater 60-h.p. Anzani Deperdussin for the Military Trials in flight from Hendon to Farnborough last Saturday, piloted by Lieut. Porte. THE MILITARY AVIATION TESTS. - Vedrines coming to earth en vol plane, after a test flight on the 100-h.p. 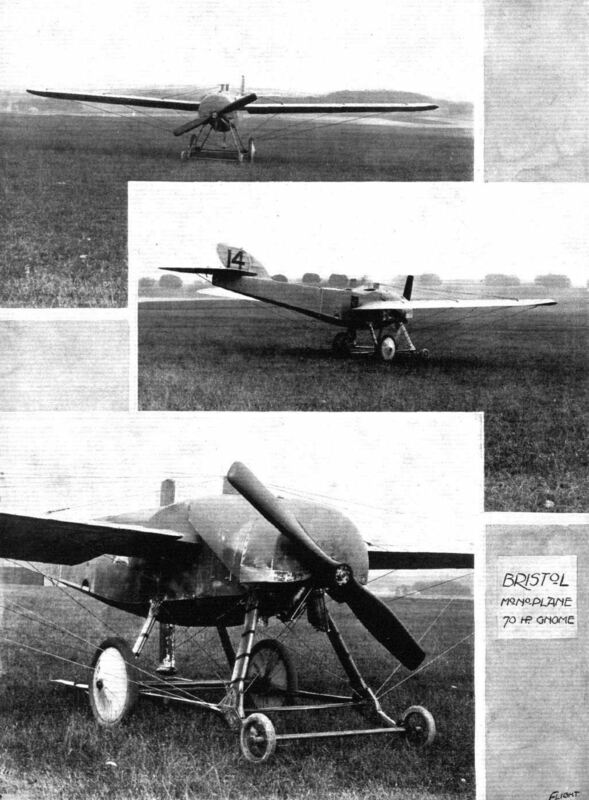 Gnome-engined British-built Deperdussln monoplane. The identical 70-h.p. 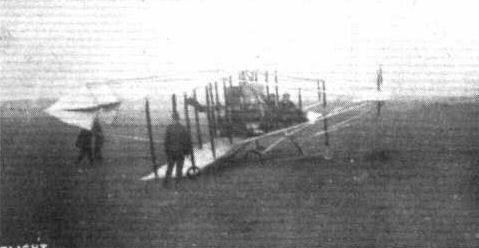 Deperdussin two-seated monoplane on which M. Prevost and Mr. Lawrence Santoni flew from Issy les Moulineaux to Eastchurch on Saturday the 13th, being tested on Thursday evening, prior to leaving the works, with a load of 2,500 lbs. of sand, in the presence of Lieut. Longmore, as the representative of the British Admiralty. THE MILITARY COMPETITION MACHINES. 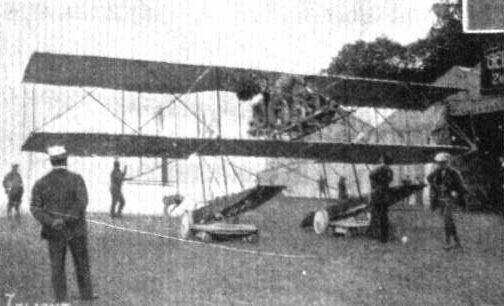 The mounting of the 100-h.p. 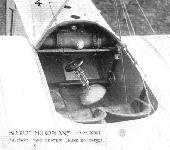 Gnome engine in the Deperdussin monoplane that will represent the British Deperdussin Co. in the War Office trials. THE MILITARY COMPETITION MACHINES. 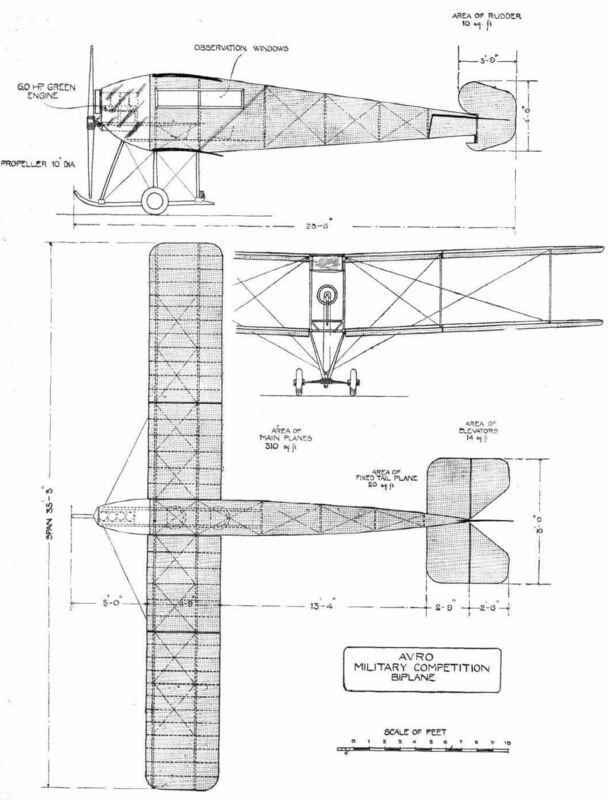 Detailed views of the 100-h.p. Anzani-Deperdussin monoplane that will be flying at Salisbury next month. Lieut. J. C. Porte will be the pilot. THE MILITARY COMPETITION MACHINES. - The 100-h.p. Anzani-engined British-built Deperdussin monoplane, which will be piloted by Lieut. J. C. Porte, who is standing at the left of the above group of aviators. On the right of the group is Mr. D. Lawrence Santoni, Joint Managing Director with Lieut. Porte, of the British Deperdussin Co. In the centre is M. Koolhoven, Chief Engineer and Works Manager of their Highgate works. Lieut. 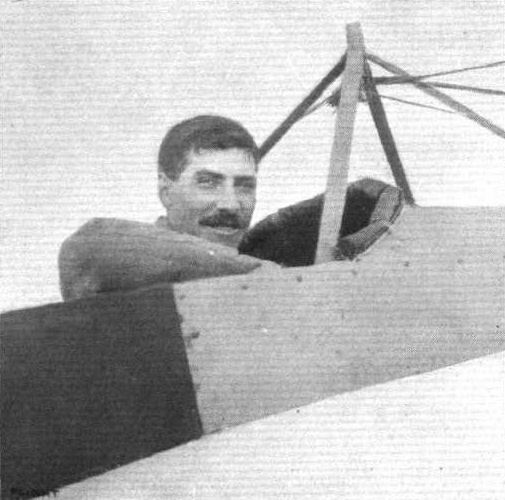 J. C. Porte, R.N., in the seat of the British-built Deperdussin monoplane. 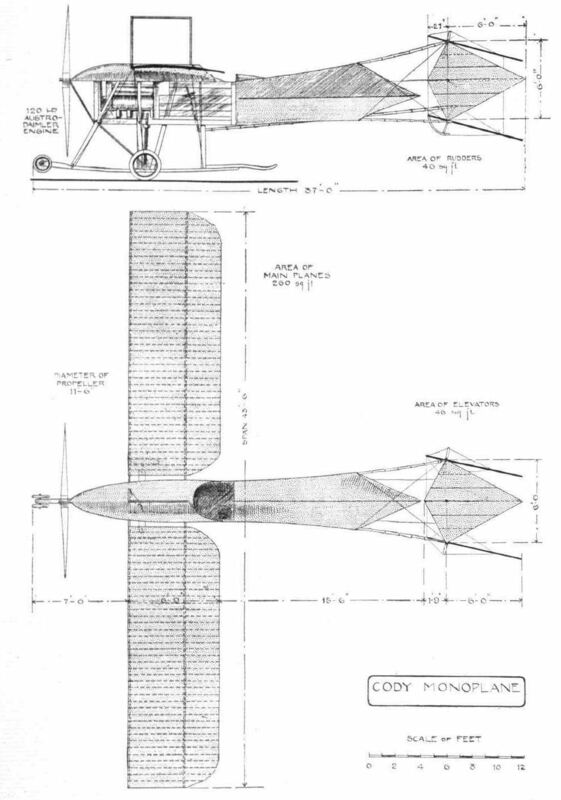 PLAN AND ELEVATION OF THE DEPERDUSSIN MONOPLANE. - The above drawings were prepared at the Highgate works of the British company, and illustrate the British design. 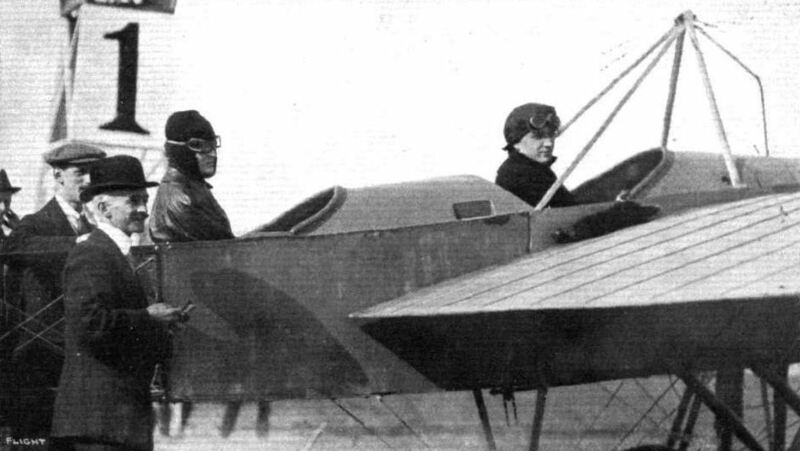 In the French design, the passenger sits behind the pilot, and the machine has a larger effective; supporting surface. 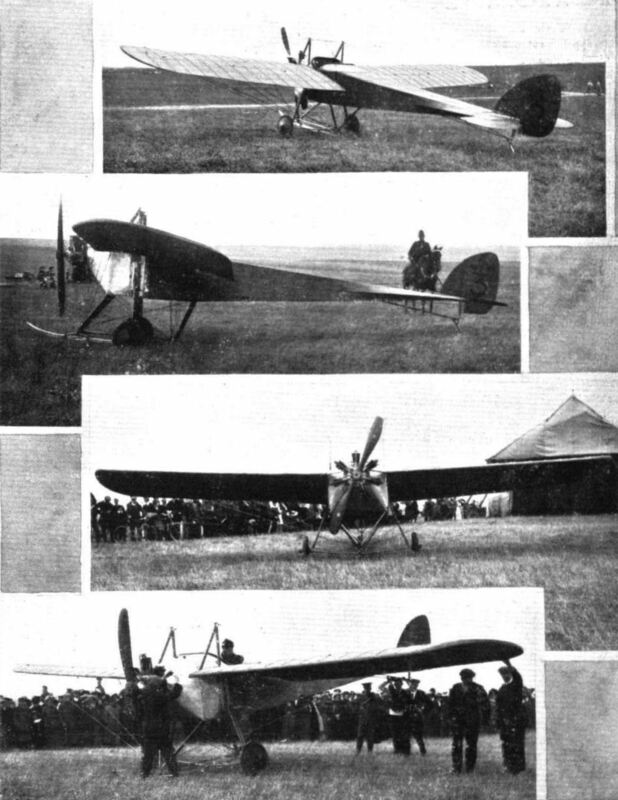 Several modifications were apparent in the Henry Farman biplanes seen at the Anjou meeting some time ago. The rear plane was quite flat and on a level with the top main plane. The lifting area amounted to 40 sq. metres. The 80-h.p. 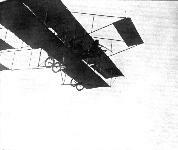 Henry Farman biplane, showing in detail the tail formation and engine mounting. 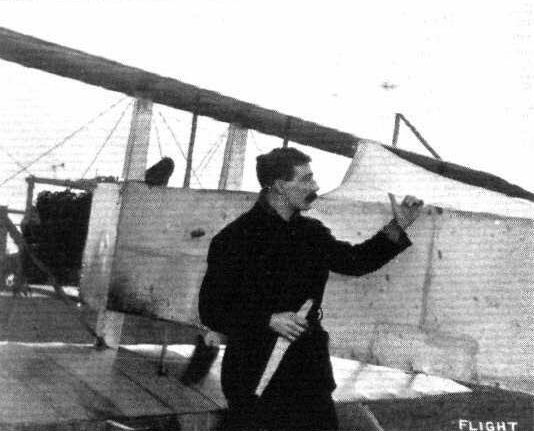 Mr. L. Noel on tbe Henry Farman at the Hendon Aerodrome. 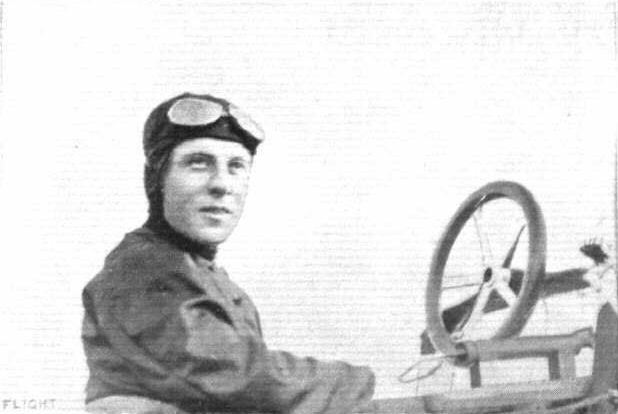 Mr Louis Noel, who has made such splendid flights at Hendon, in the pilot's seat of the Henry Farman, ready to get away in the first heat for the Speed Handicap at Hendon last week. A post impression of Thursday week's Illuminated Flying Meeting at the London Aetodrome, Hendon. - Capt. 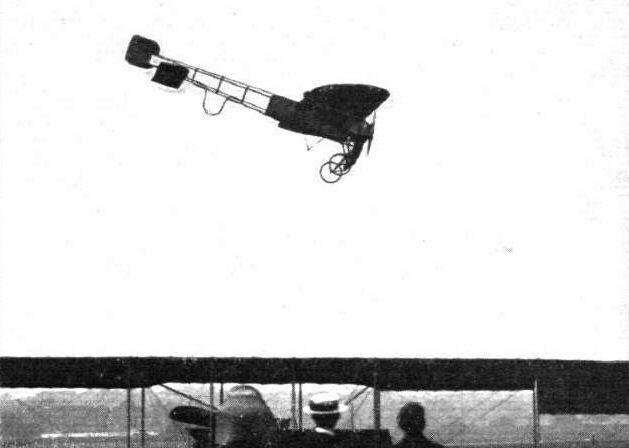 Tyrer, as a passenger on a Henry Farman biplane, throws bombs on a dummy battleship. 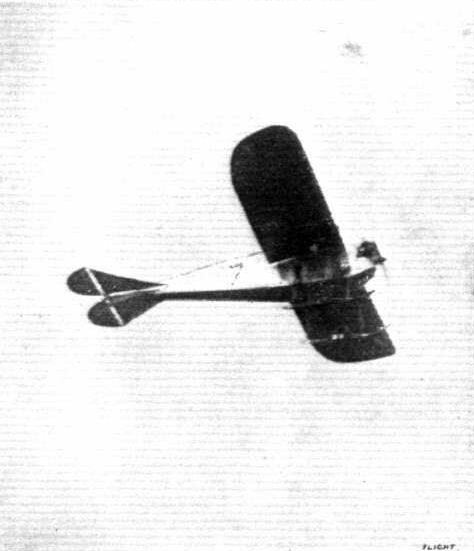 Another biplane, its leading edge starred with lights, forms a new "constellation" at the left top corner. The 80-h.p. Henry Farman biplane and its electric light and Klaxon horn fittings. - Fig. 1. - Side view. Fig. 2. - Empennage, showing the new rudder shape. Fig. 3. - Petrol and castor oil tanks. Fig. 4. - Control cable joint. Fig. 5. - Electric searchlight. Fig. 6. - Electric side lights. Fig. 7. - Klaxon electric horn. 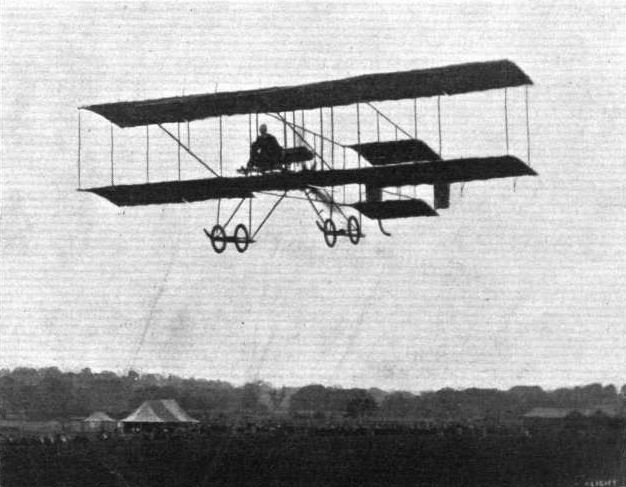 HENRY FARMAN BIPLANE. - Plan and elevation to scale. Fig. 4. - Breguet Biplane. 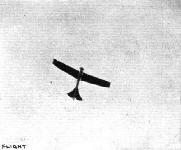 Mr. Dyott, who has been doing much good Flying Work in America, piloting one of the small Deperdussins. - A remarkable sunset picture secured at Rheims last year. A fine bank by Valentine on the Deperdussin round No. 2 pylon at Hendon in the cross-country handicap. THE DUBLIN-BELFAST AEROPLANE CONTEST. 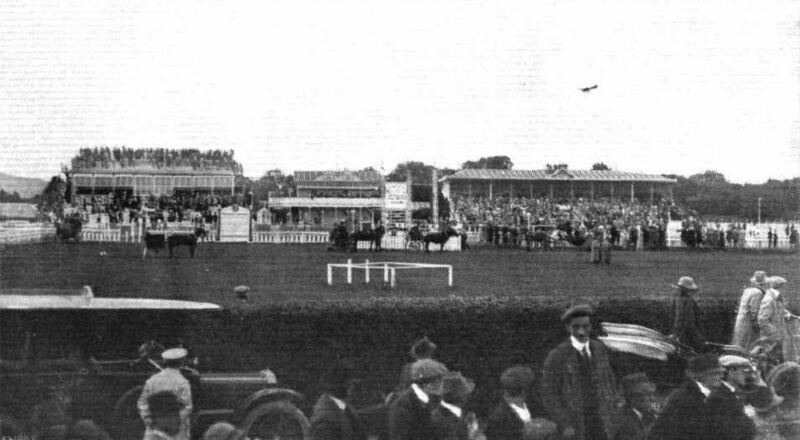 - Mr. J. Valentine flying over the grand stand, Leopardstown racecourse, Dublin, on his 60-h.p. Deperdussin. Remarkable flying was seen in the Speed Handicap at Hendon on Saturday. 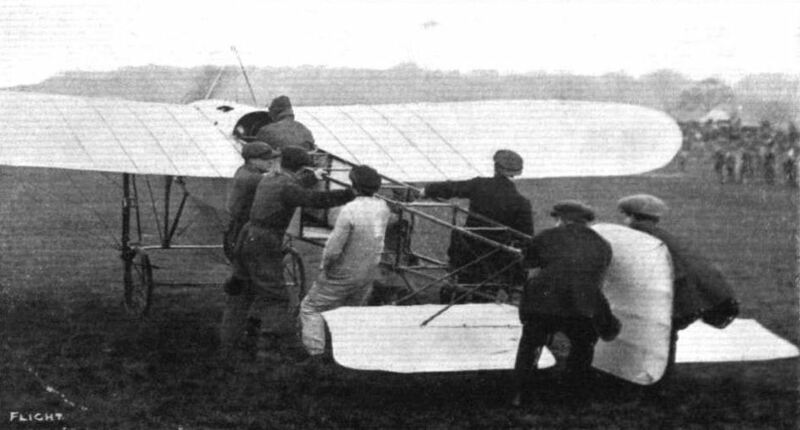 Our photograph shows, on the left, Jules Nardini on the Deperdussin, on the right Pierre Verrier on the Maurice Farman, and above, Marcel Desoutter, on the Bleriot, just about to enter on the last lap. A TRIO. - Finish of first heat of the Speed Handicap at Hendon, Saturday, the competitors being Mr. Gustav Hamel, Mr. J. L. Travers, and Mr. Sabelli in the order named. 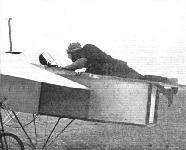 Prevost and his observer in the French Deperdussin, just landed in the ploughed field test in the Army competitions. 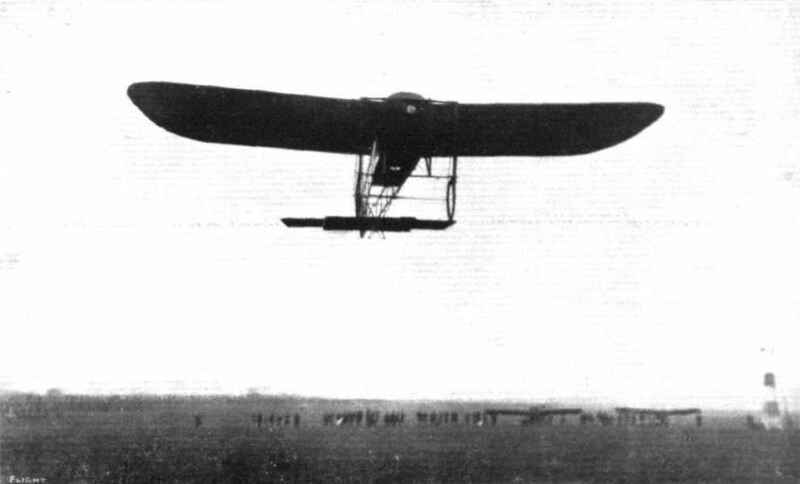 The French Deperdussin monoplane which secured the second prize of L2,000 in the Military Trials. 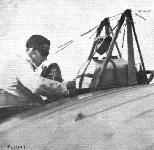 Marcel Desoutter piloting No. 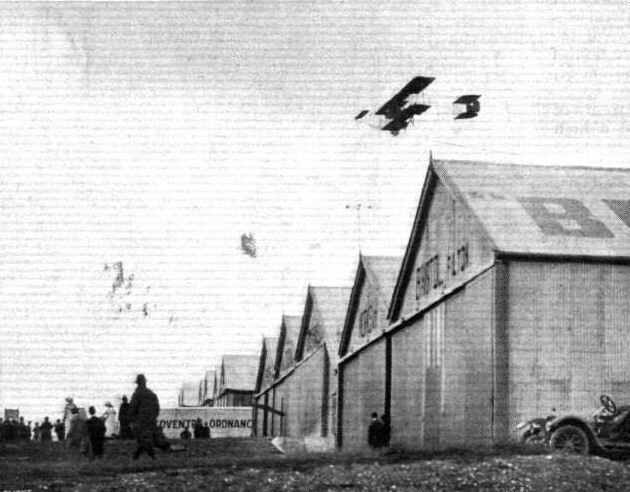 6 Bleriot in the Hendon Aerodrome competitions. Giovanni Sabelli and the 30-h.p. Anzani-engined military Deperdussin racing monoplane. Signor Sabelli is the first Italian to secure his brevet at Brooklands. His vol planes are executed in exceptionally fine style. 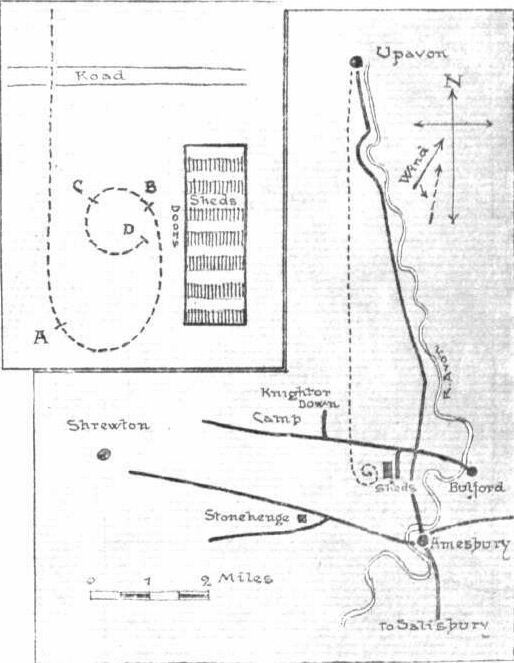 THE MILITARY COMPETITIONS AT SALISBURY. 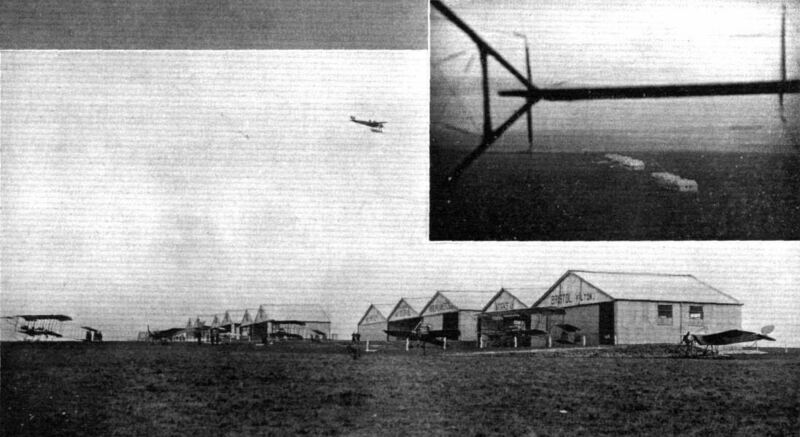 - On the left the French Deperdussin monoplane completing the transport test. On the right Prevost and Capt. 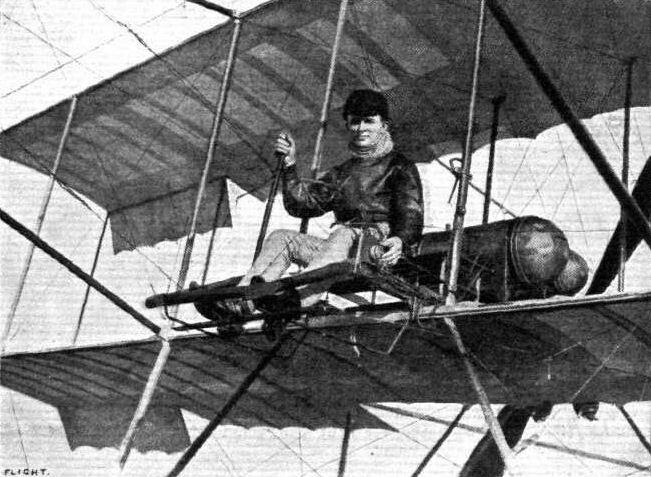 Dawes starting out for a flight on the same machine. 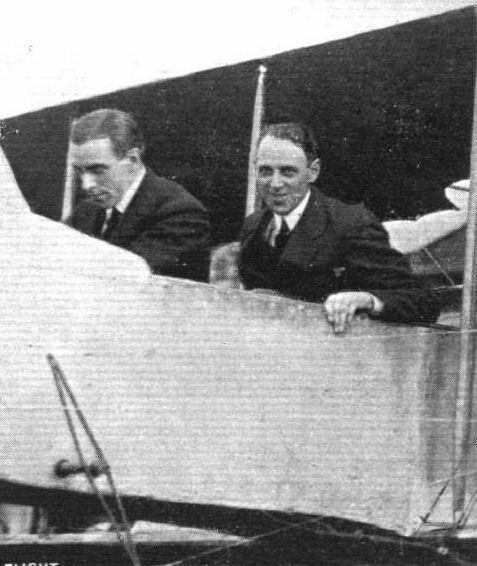 M. Prevost, on the left, and his passenger, Mr. D. Lawrence Santoni, Manager of the British Deperdussin Aeroplane Syndicate, who, on Saturday of last week, flew from Issy les Moultneaux to Eastchurch on a 70-h.p. Gnome-Deperdussin, delivering the machine to the Naval Aviation Section there. Sabelli at the wheel of his Deperdussin monoplane after he made a flight of 1h. 8m. at an altitude of about 1,500 feet on Sunday last at Brooklands. Mr. H. Petre, of the Brooklands Deperdussin School, starting off for a flight on the brevet machine. 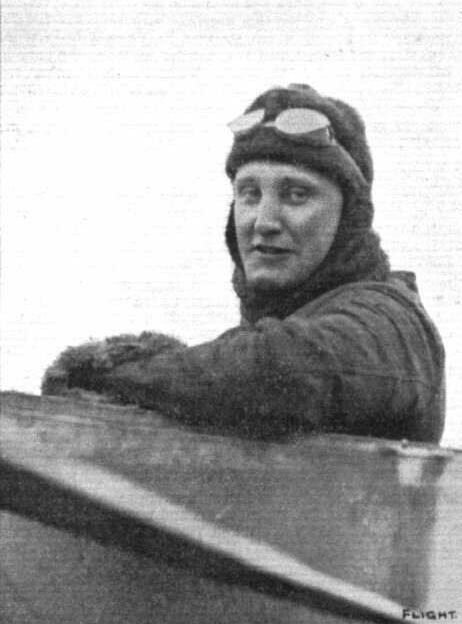 G. M. Dyott, who has been exhibition flying in America, and whose "adventures" were referred to in Eddies recently. Mr. Dyott has returned to England on a flying visit. Sig. Jules Nardini, who is now well known through his fine flying at Hendon. M. Prevost, who piloted the French Deperdussin monoplane which secured the second prize, open to the world. 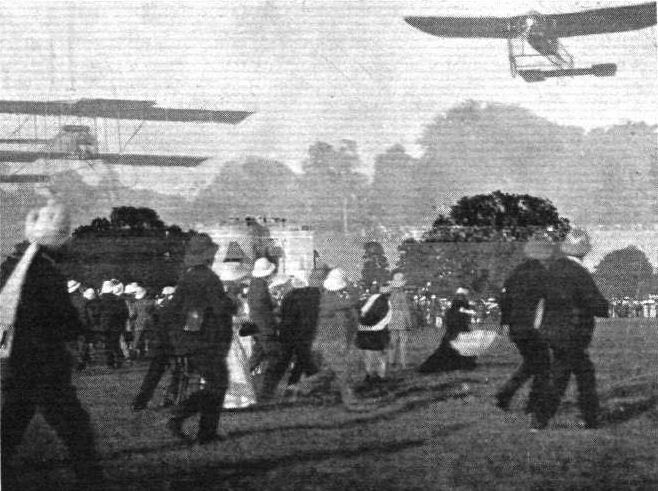 In the Military Aeroplane Trials. 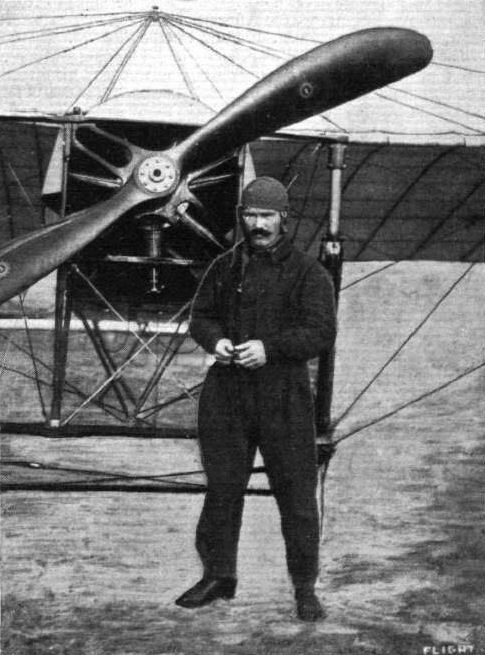 Mr. H. M. Brock in the pilot's seat of the Deperdussin mono at Hendon. The 100-h.p. 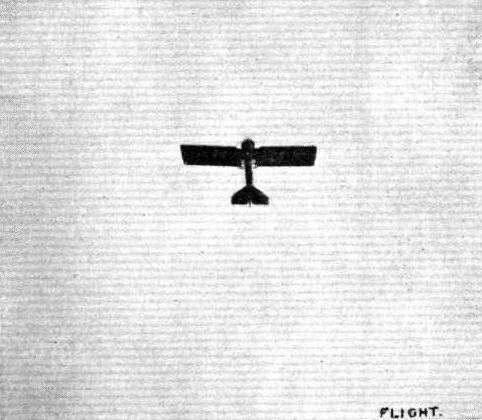 Deperdussin racing monoplane viewed from above, showing the pronounced butterfly-shape of the wings. 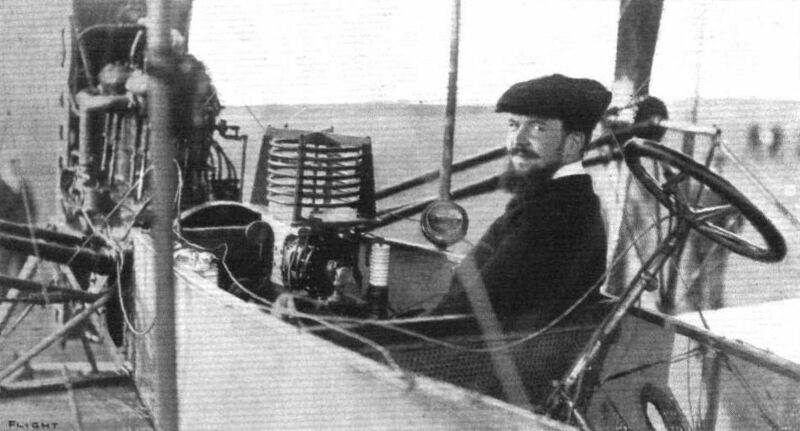 Vedrines is seen seated in the cockpit, and to his right is M. Bechereau, chief engineer of the Deperdussin firm, to whom the design of this machine is due. The 100-h.p. Gnome-engined racing Deperdussin monoplane, as seen from behind. In the pilot's seat is Vedrines, who, flying this machine, beat the existing world's speed records up to 150 kiloms. at Pau on January 13th, 1912. 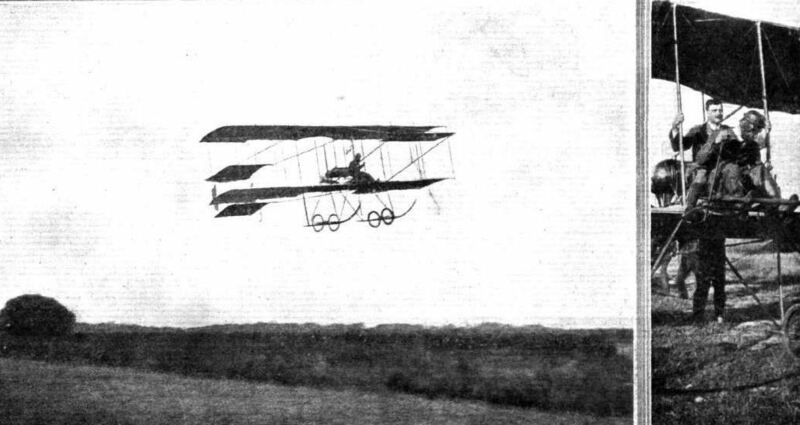 The latest form of the Deperdussin monoplane, as seen at the Anjou Circuit. Note the special shield over the engine and the substantial chassis. 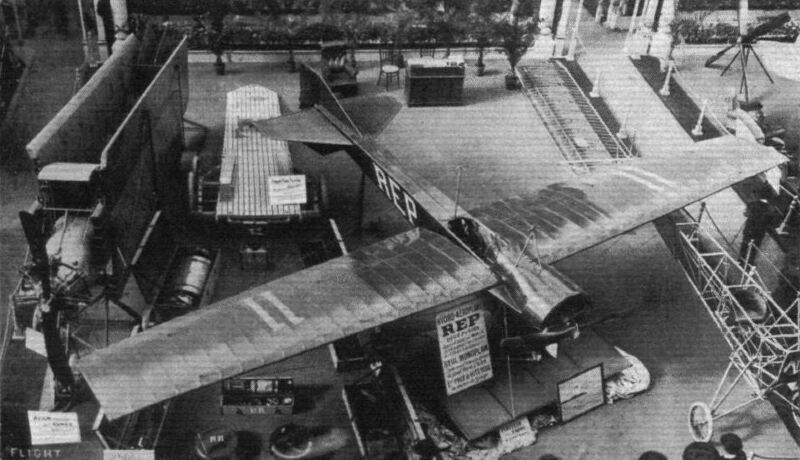 Part of the Deperdussin stand, showing one of their 80-h.p. Gnome monocoques. The picture gives a good idea of the elaborate scheme of decoration that was adopted at the Salon. NEW FORMS OF LANDING CHASSIS. 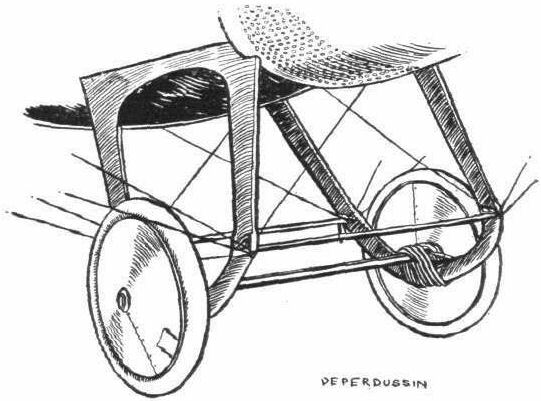 - The front of the latest Deperdussin monoplane, the "Monocoque." The spun cowl over the motor is to further reduce head resistance. The landing chassis of the Deperdussin monococque. The Gordon-Bennett winner - the 140-h.p. Dep. monocoque. THE 100-H.P. 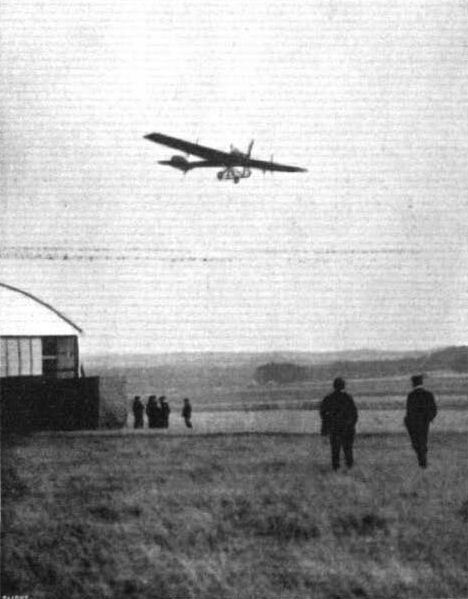 RACING DEPERDUSSIN MONOPLANE. - Plan and elevation to scale. MESSRS COMPTON-PATERSON AND DRIVER IN SOUTH AFRICA. 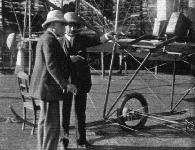 - Mr. Paterson giving an exhibition flight at the Kenilworth Racecourse, and on the right he is seen with Mr. Fred Barling ready for his first passenger flight. Mr. Lewis Turner flying the Grahame-White Farman in the Figure of Eight Competition. IN THE AIR DURING THE EASTER FLYING MEET AT HENDON. - Mr. Lewis Turner giving an exhibition on the Henry Farman. 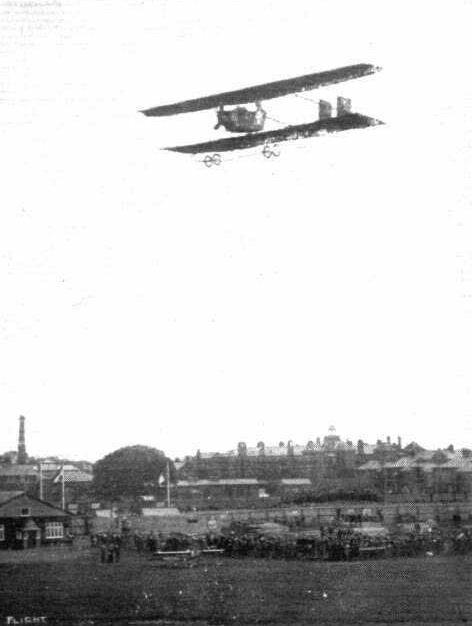 Mr. Richard T. Gates flying at Hendon on the school Farman. MR. LEWIS TURNER FLYING AT HENDON ON SATURDAY. - Note, in contrast, the ancient 'bus relic. 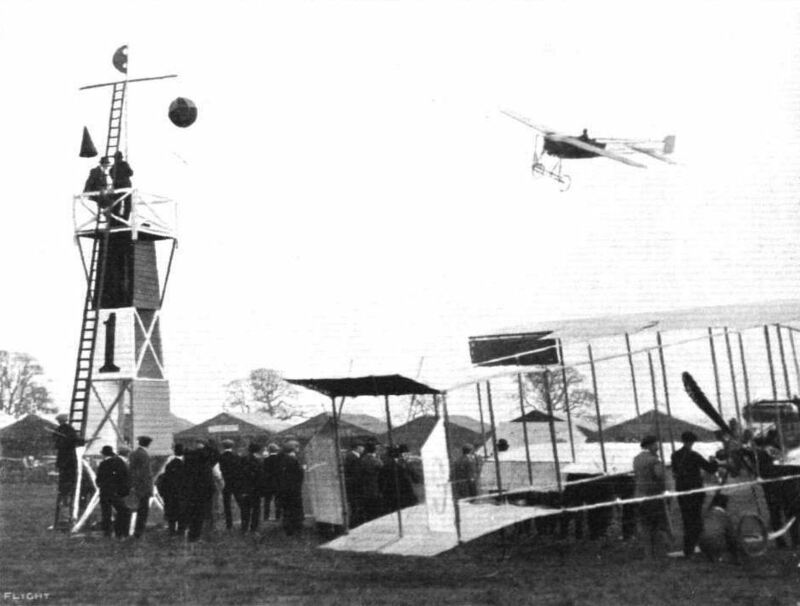 An exhibition flight at Hendon by Mr. Grahame-White in the Farman 'bus, as seen from outside the entrance to the aerodrome. Note one of the 3-horses conveyances which are now regularly flying for passengers to and from the meeting. HARE SHOOTING BY AEROPLANE. - Recently at Corbeaulieu those "heavenly twins," Martinet and Legagneux, have been amusing themselves by shooting hares and partridges from one of their Farman biplanes. 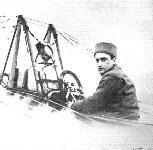 The above photograph depicts Martinet, sitting astride the nacelle, taking his aim, while behind him are Legagneux, at the lever, and another fellow sportsman in the rear passengers seat. 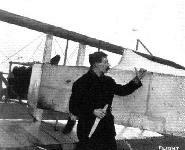 Mr. J. L. Travers making a fine banking on the Farman biplane at the London Aerodrome, Hendon. FLYING AT THE NANCY AVIATION FETE. - A fine natural grand stand. 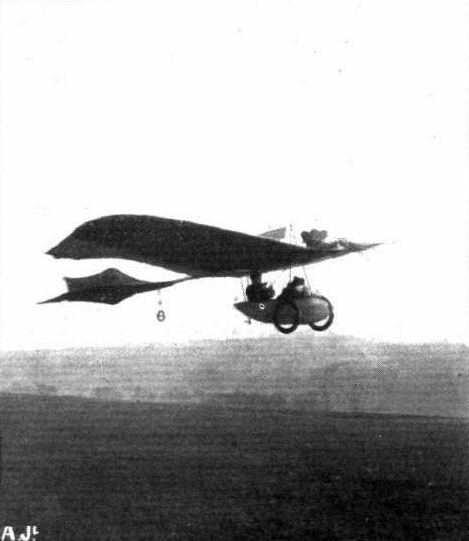 Kuhling on his Bleriot monoplane, and Loridan on a Henry Farman machine, are seen in flight. An incident between two biplanes in the recent race for the "Shell" Spirit Prize at Hendon. 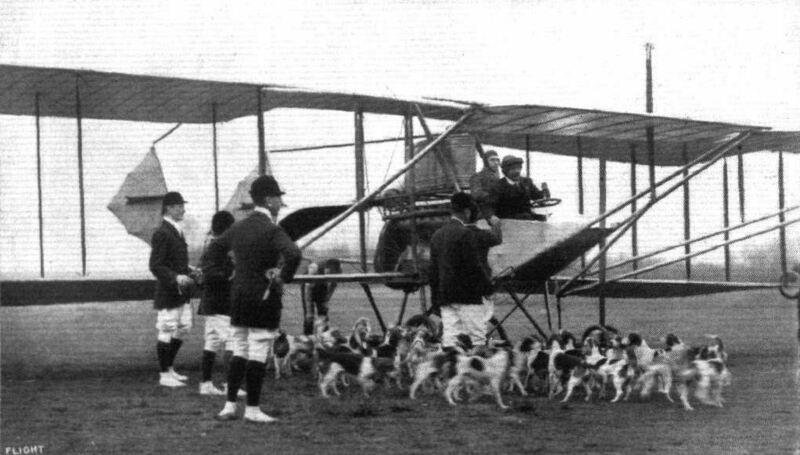 - Lewis Turner on Farman, and Raynham on the Burgess-Wright, travelling down the aerodrome. 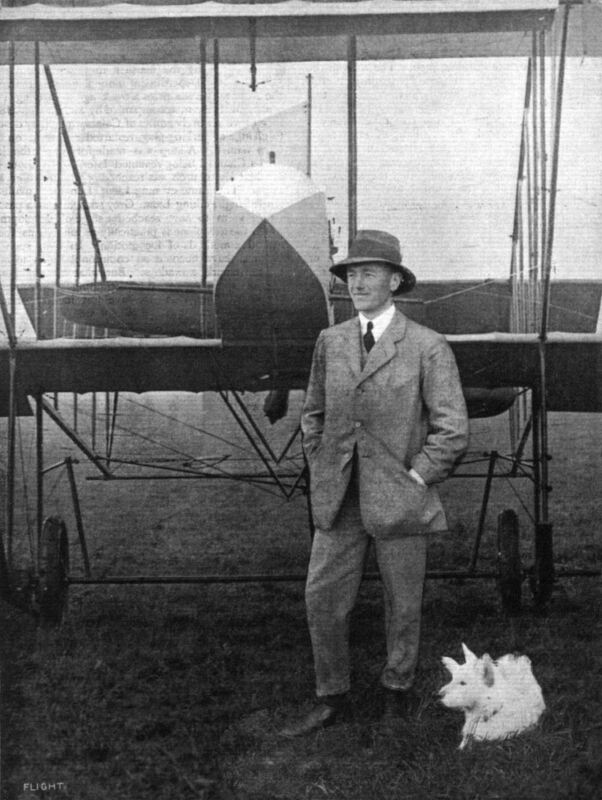 Mr. Claude Grahame-White and a favourite passenger of his, Master S, Guy Lewin, another promising aviation son of Mr. F. Guy Lewin, so well known in the motor world. Mr. Grahame-White about to start an exhibition flight at Hendon last Saturday in remembrance of the second anniversary of the great Manchester flight. 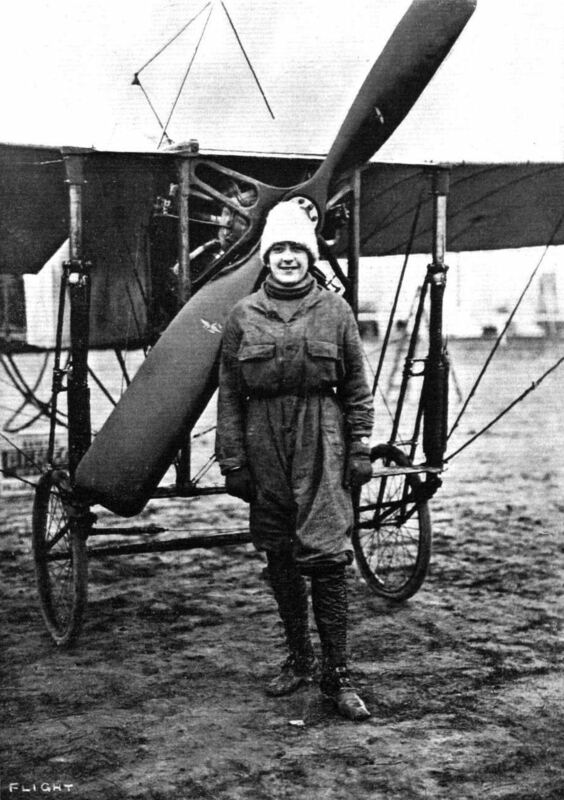 Mrs. C. Stocks, the clever aviatress who was amongst those who flew at Hendon during the Easter Meeting. Mdlle. 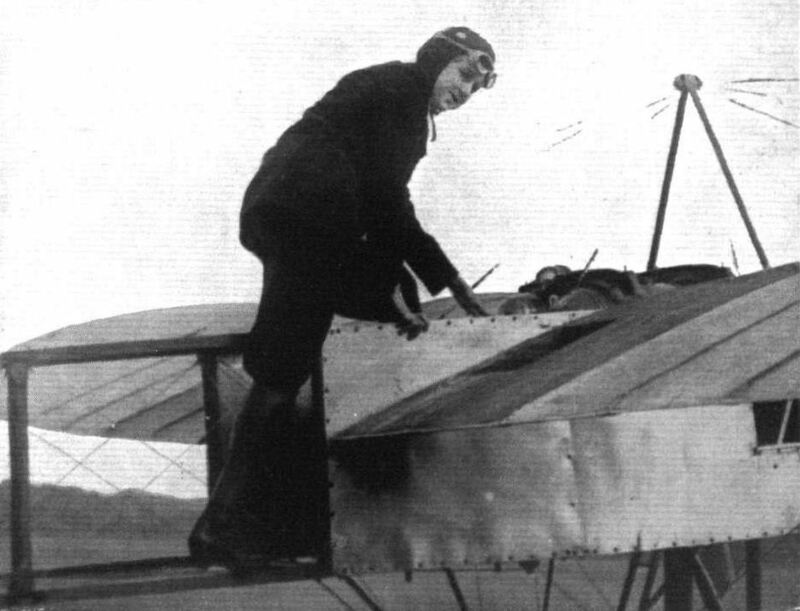 Bernard, the young aviatress who, in endeavouring to obtain her Aero Club of France certificate for flying, was unfortunately fatally injured at Etampes last week-end. Mdlle. Bernard is reported to have endeavoured to rise when making a turn. THE GRAHAME-WHITE SCHOOL AT HENDON. - Photograph of five members of the Grahame-White establishment at work on Monday morning last. In the pilot's seat Mr. Lewis Turner, with Mr. Ramsay seated behind him. Standing, from left to right, Messrs. Manton, Fowler and Biard. 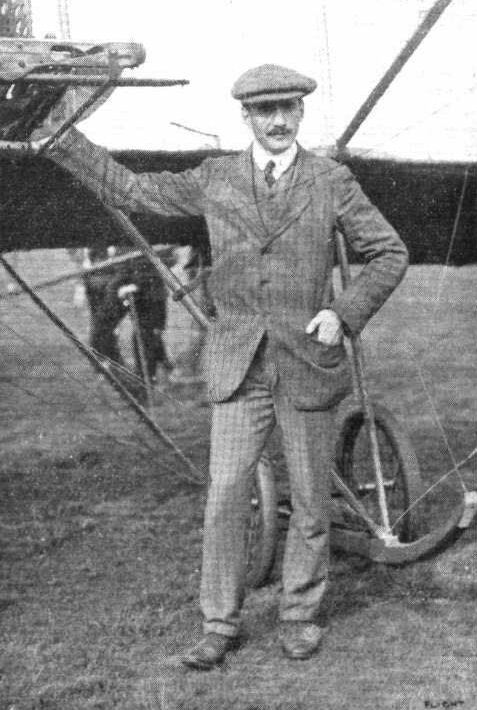 Mr. J. L. Travers, who is now flying so well at Hendon. Mr. Marcus Manton, who has just secured his pilot's brevet and made his debut in exhibition flying for the Grahame-White Co. at Hendon on October 5th. AFTER THE MISHAP IN THE GALE TO GRAHAME-WHITE'S BIPLANE AT HENDON ON EASTER MONDAY. - On the top of the overturned machine are seen Messrs. Grahame-White, Lewis Turner, and Hamel. FLYING IN INDIA. - The Farman machine has a little mishap from a backfire igniting the petrol. Fortunately there was plenty of sand on the Tollygunj golf course with which to save the machine before much damage was done. Fig. 2. 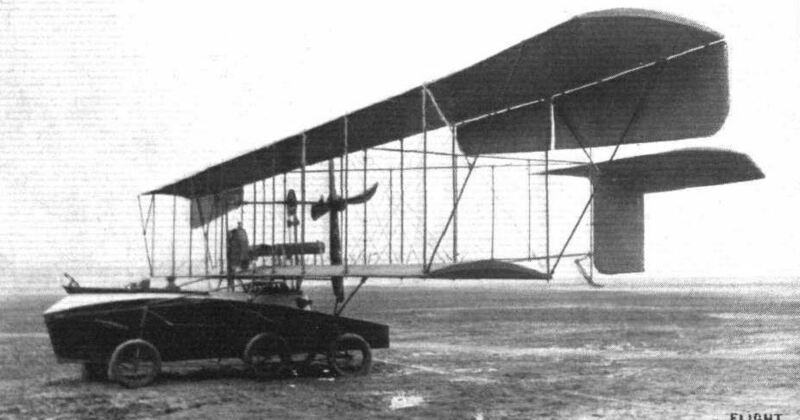 - Farman Biplane. THE MILITARY COMPETITION MACHINES. THE 80-H.P. GNOME-BOREL MONOPLANE. - Three-quarter view. THE MILITARY COMPETITION MACHINES. THE 80-H.P. 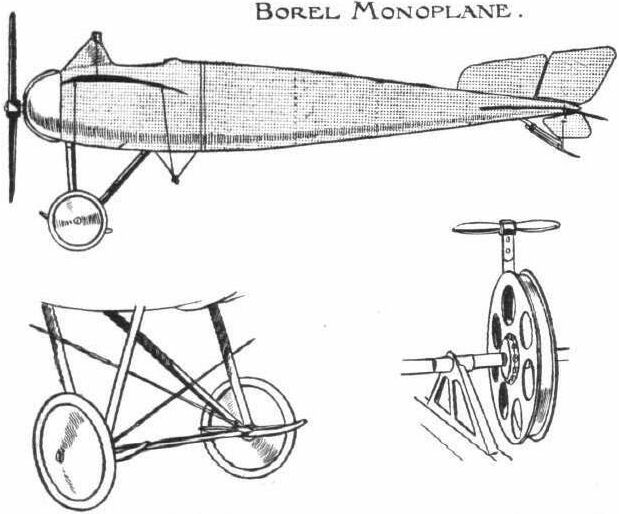 GNOME-BOREL MONOPLANE. - Front view. Lieut. 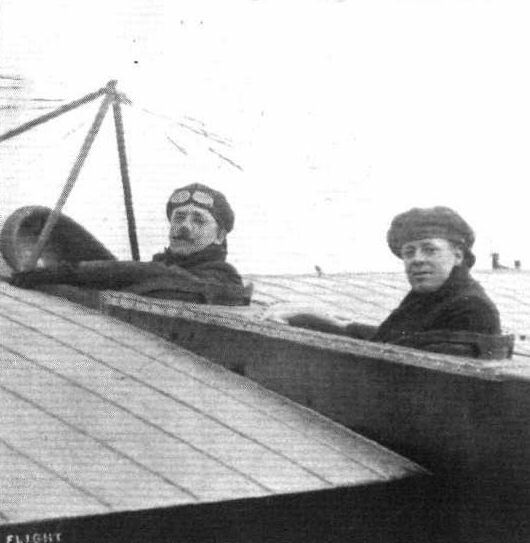 H. B. Barrington-Kennett, of the Air Battalion, and his passenger, Corpl. Ridd, R.E., taking olf on Wednesday of last week at Salisbury Plain for the Mortimer Singer Prize, when he covered 249 miles 840 yds in 4 hrs 51 mins. Capt. Gerrard on the military Nieuport at the Royal Aero Club's Eastchurch flying ground. A fine piece of steering round a mark tower, at 67 miles per hour, by Mr. Grahame-White on his Nieuport monoplane. HYDRO-AEROPLANES AT THE HEILIGENDAMM MEETING. - View of the Albatross from behind. HYDRO-AEROPLANES AT THE HEILIGENDAMM MEETING. - Slipway and protecting breakwater. HYDRO-AEROPLANES AT THE HEILIGENDAMM MEETING. - The forward floats of the Albatross..
HYDRO-AEROPLANES AT THE HEILIGENDAMM MEETING. - Thelen in the Albatross. HYDRO-AEROPLANES AT THE HEILIGENDAMM MEETING. 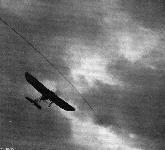 - The Albatross biplane flying round the cruiser "Munchen." 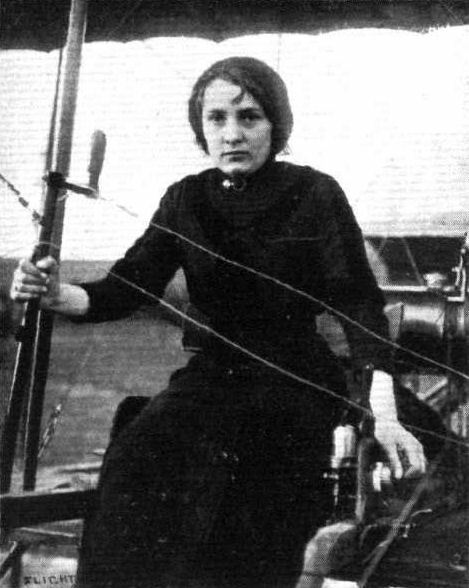 Miss L. Galanschikoff (X), the Russian aviatress who, on November 22nd, at Johannisthal, on a 100-h.p. Fokker monoplane, made a world's altitude record for lady flyers with 2,400 metres. The previous record was to the credit of Miss Melly Beese with 820 metres. 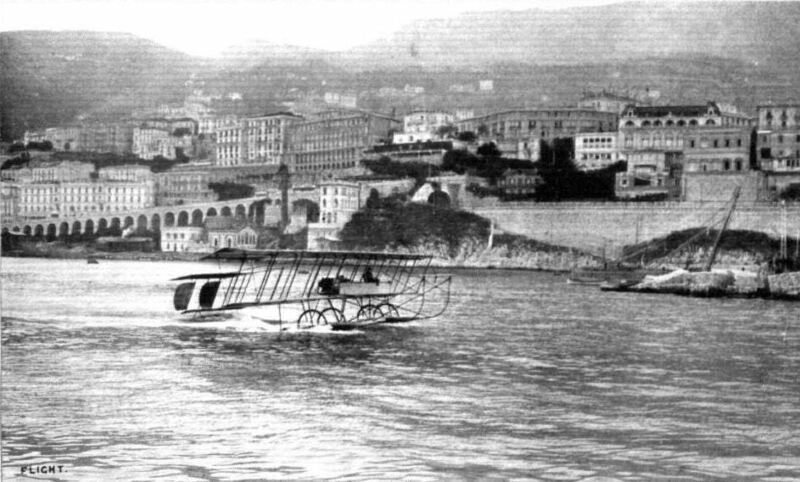 HYDRO-AEROPLANING AT NICE. - The start and the finish of one of Hugh Robinson's flights over the sea on a Curtiss "triad." Below is the machine on the beach ready for a demonstration. 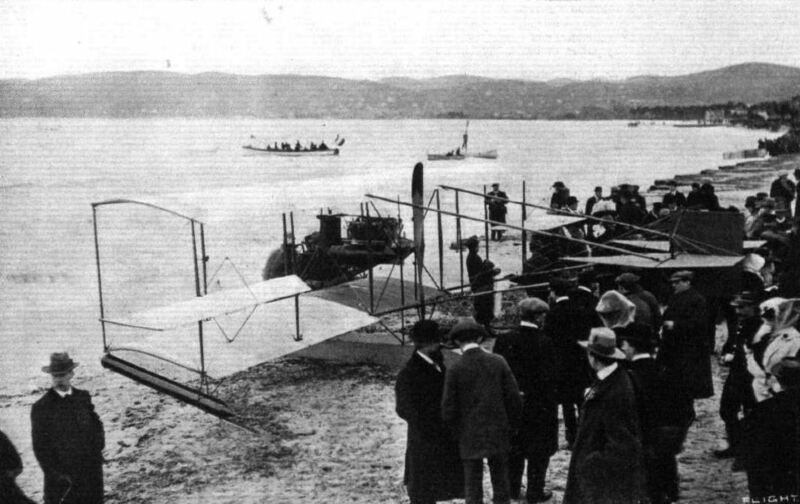 THE CURTISS HYDRO-AEROPLANE AT NICE. - Our picture shows very clearly the arrangement of the elevator, the main float, and the position of the pilot's seat, engine, &c. This is the machine which, under the direction of Mons. 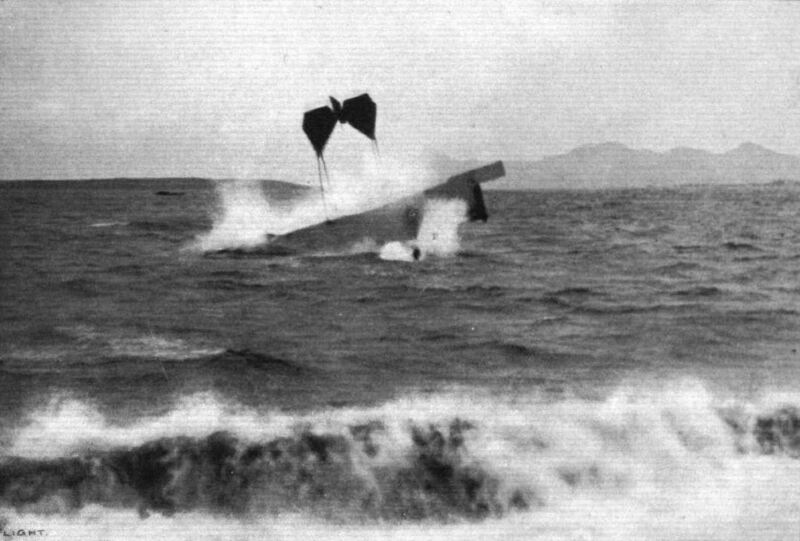 Paulhan, has been flown by Hugh Robinson, and of which the two photographs appeared in a recent issue, showing the machine in connection with the flight when Robinson was pitched into the sea. 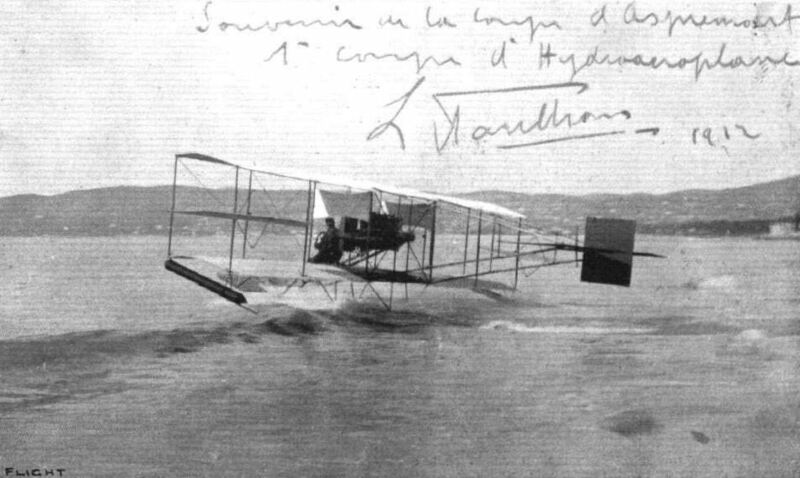 A souvenir postcard from M. L. Paulhan, sent to Mr. Holt Thomas, of his hydro-aeroplane work by which be has iust secured the Coupe d'Aspremont. 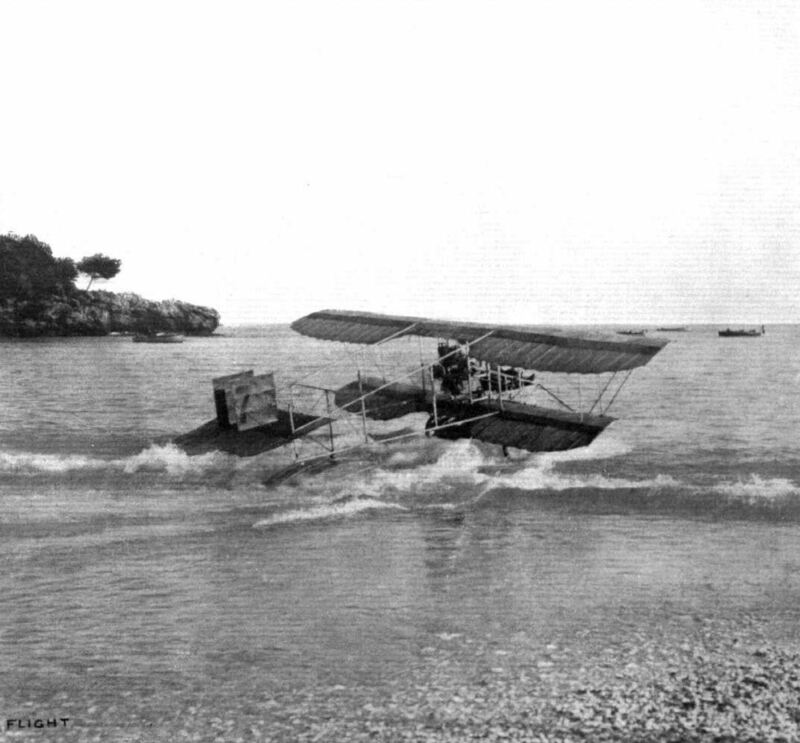 HYDRO-AEROPLANING AT NICE. 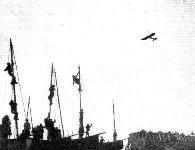 - The start and the finish of one of Hugh Robinson's flights over the sea on a Curtiss "triad." Above is a remarkable "snap" at the moment when it struck the water. 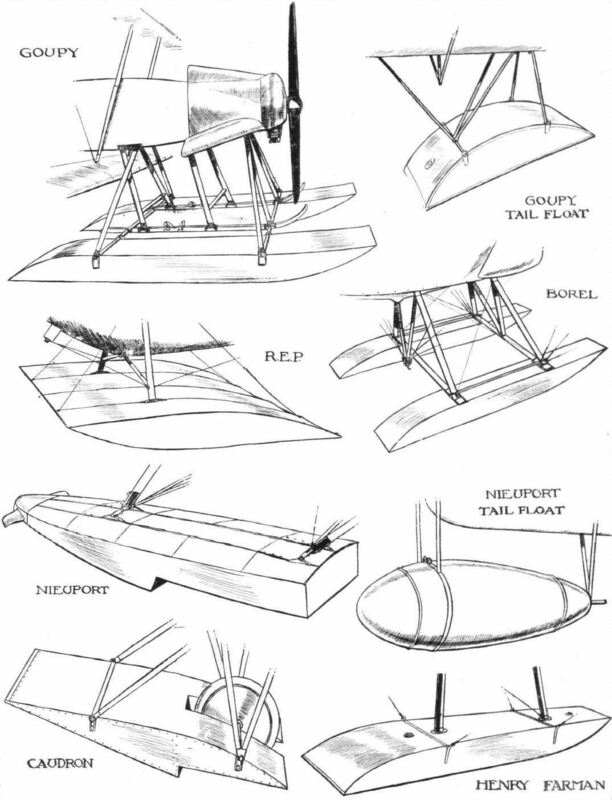 Hydro-aeroplanes, illustrating the paper by Mr. Holt Thomas. Mr. Alec Ogilvie flying his N.E.C.-engined Wright biplane at the Royal Aero Club's Eastchurch grounds last week. 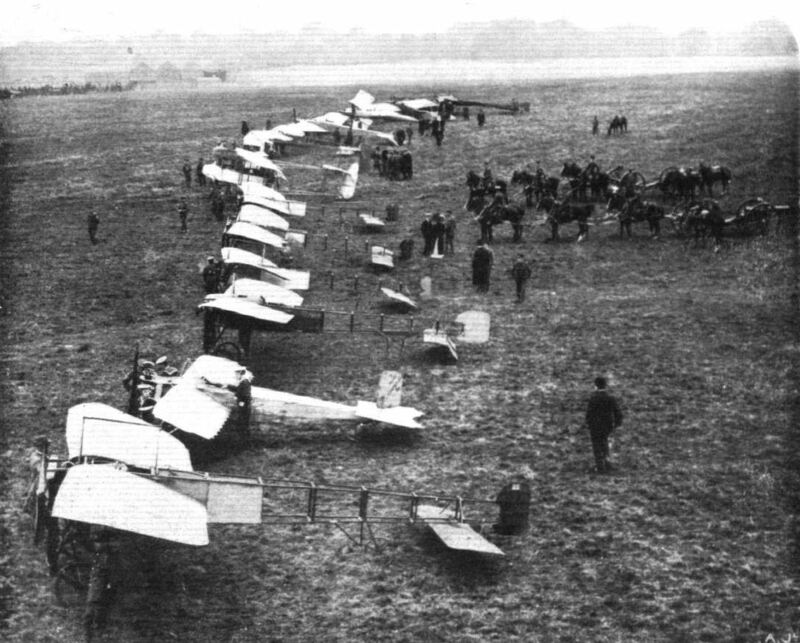 A series of German aeroplanes at Johannisthal from photographs kindly sent to us by the Hon. Lady Shelley. - German Wright Biplane. FLYING AT BROOKLANDS. - Raynham, with a passenger, making a fine turn on the Burgess-Wright biplane on Sunday at Brooklands. 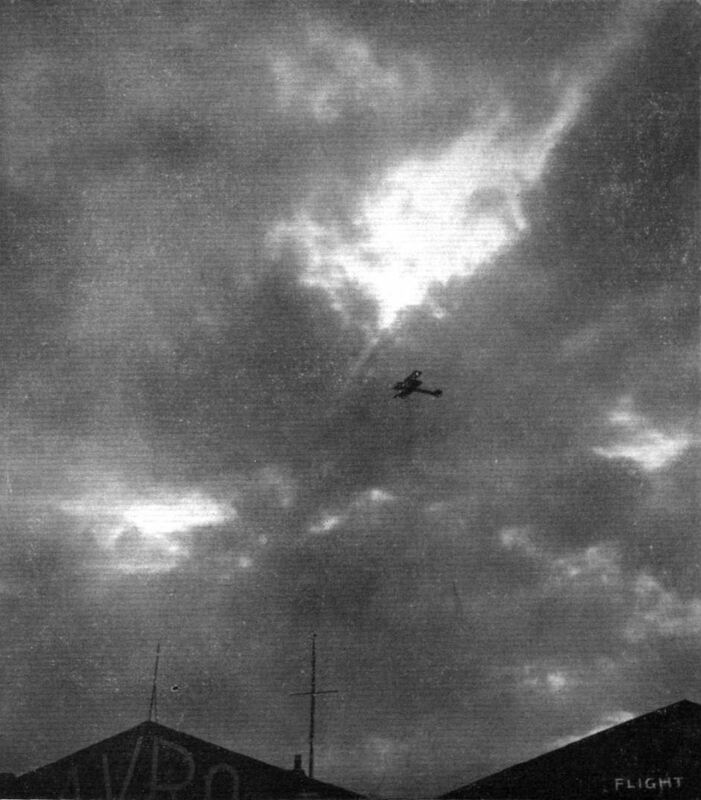 A snap of Rayham flying on the Burgess-Wright in connection with one of the contests - the Shell - at Hendon Aerodrome during the past season. 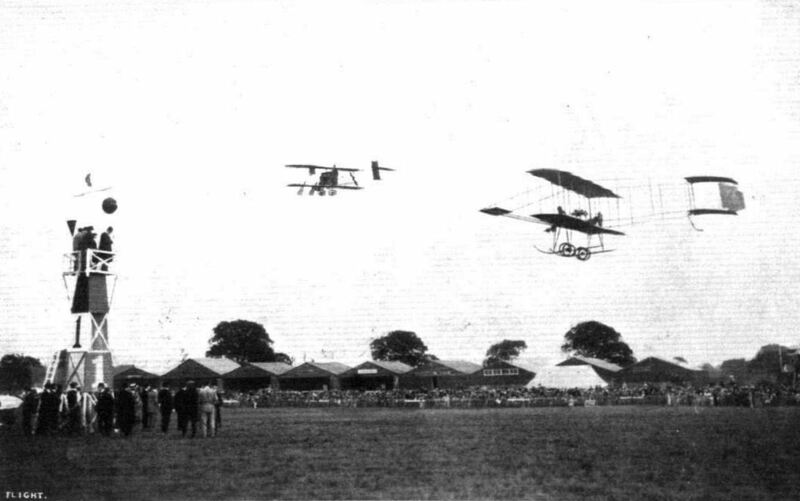 Raynham, on the Burgess-Wright and Lewis Turner putting up a fine finish in the order named for the "Shell" Speed Contest at Hendon on Aerial Derby Day. 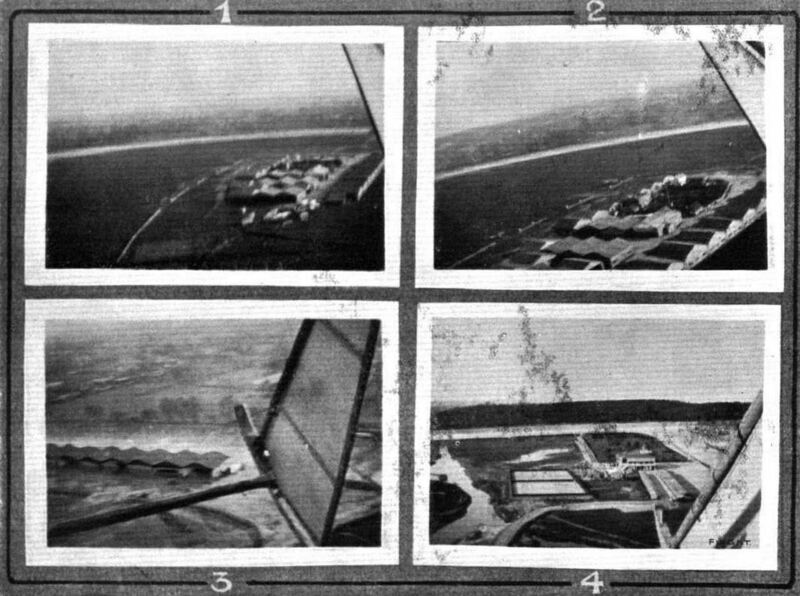 A selection of photographs of the Brooklands flight colony secured by Mr. P. Raynham, piloting a Burgess-Wright biplane. - 1. The sheds as seen from above the sewage farm. 2. As they appear from above the railway straight. 3. The sheds against the Byfleet banking. 4. The Club House, paddock, and tennis courts. 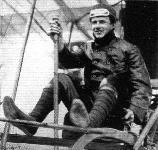 Cal Rodgers, the first American cross-Continental aviator, who was killed at Long Beach on April 22nd. 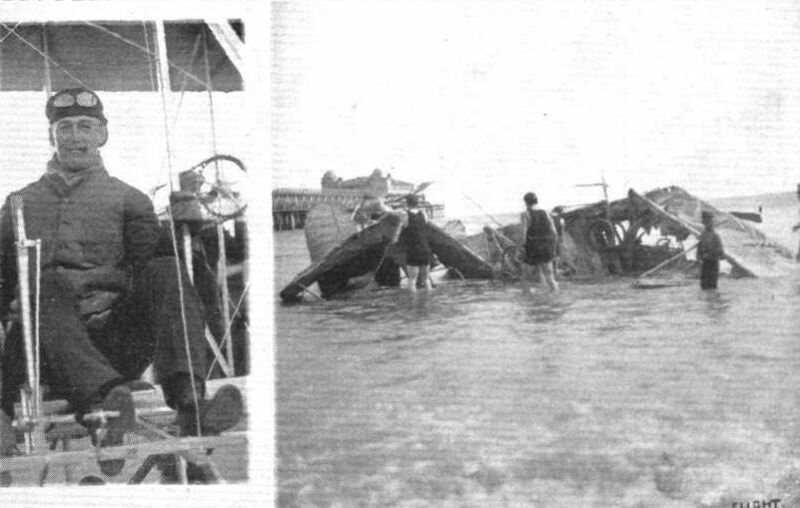 On the right is a photograph of the wrecked machine showing where it fell to the edge of the surf. 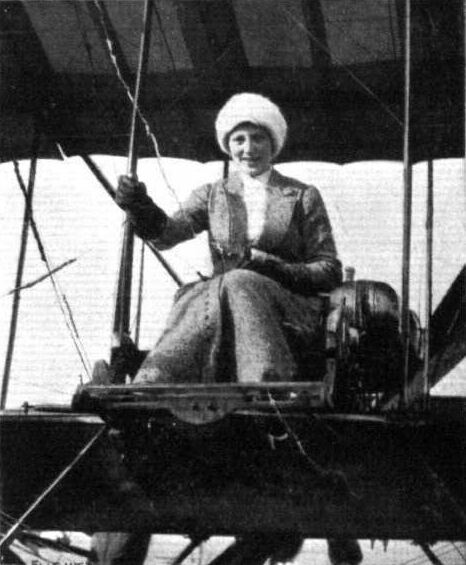 Miss Katherine Stinson, a lady pilot who recently obtained her brevet in America at Cicero Field, where she passed for her certificate on a Wright biplane. 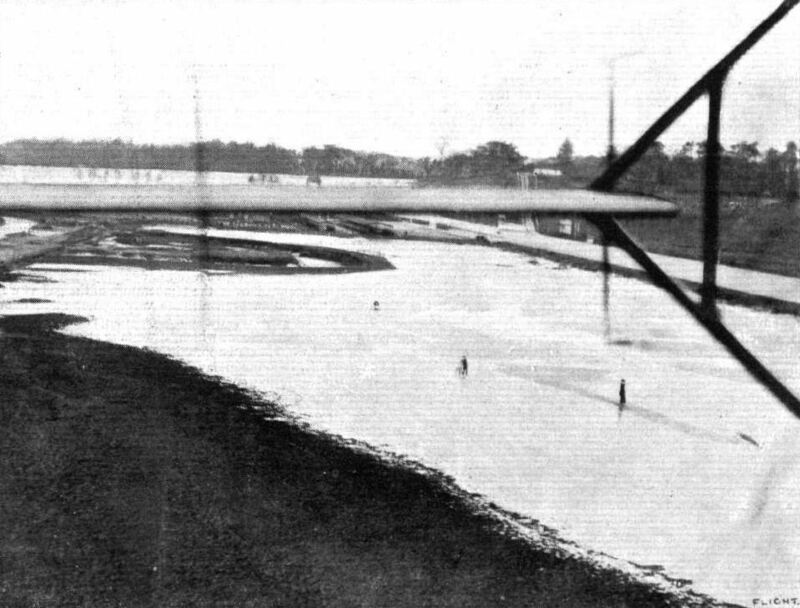 A German-built Bristol biplane at Halberstadt piloted by Mr. E. Harrison of the Bristol Co.
A view of Brooklands during the skating spell which has been in force recently, showing the flooded meadows reaching right up to the paddock sheds. This picture was taken from Pizey's Bristol biplane last week. FROM TERRA FIRMA AND FROM ON HIGH. 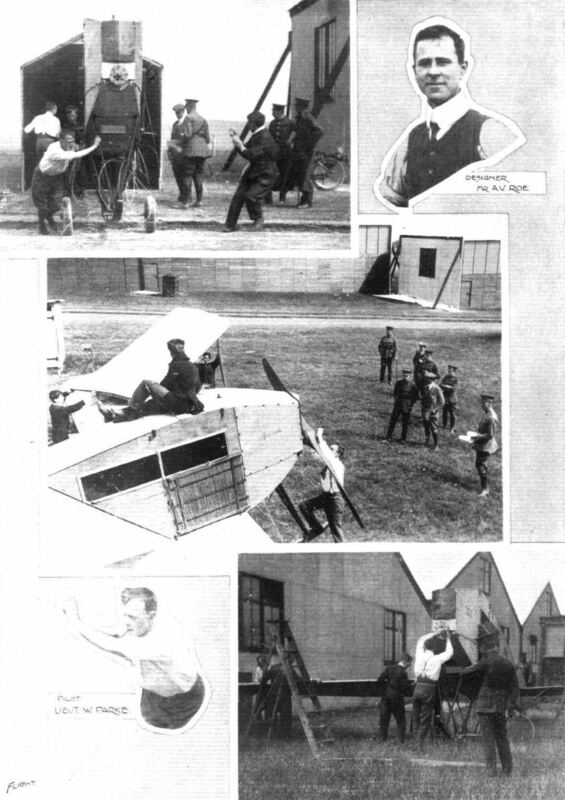 - The "Bristol" aviation schools at Salisbury Plain, with a Bristol two-seater monoplane in flight; and inset is a view of the same scene from a Bristol biplane. Pizey, of the Bristol School at Brooklands, making a clean landing after a tuition flight with a pupil. The two photos sent by Mr. G. W. Whatmore, showing Mr. Hammond just alighting on his machine, and ready to start with Mrs. Hammond, the first occasion of a lady passenger being carried in Australia. Lieut. 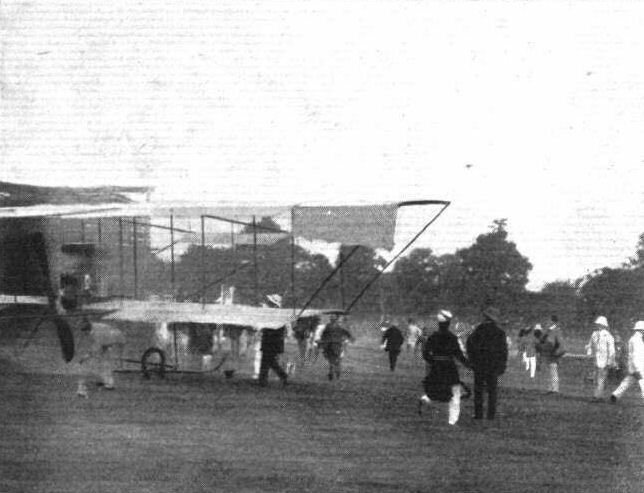 H. H.Harford's Bristol biplane at Peshawur, in India. Lieut. Harford's mechanic is standing by the machine. Second Lieut. Hotchkiss who was killed in company with Lieut. Bettington on Tuesday. 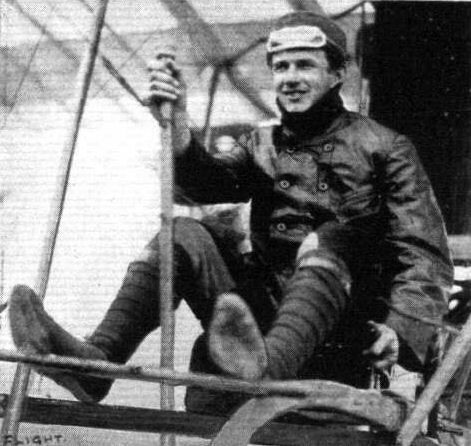 W. E. Hart, the Australian aviator who recently made a flight of 47 miles from Penrith to Sydney, accomplishing the distance in 55 mins. 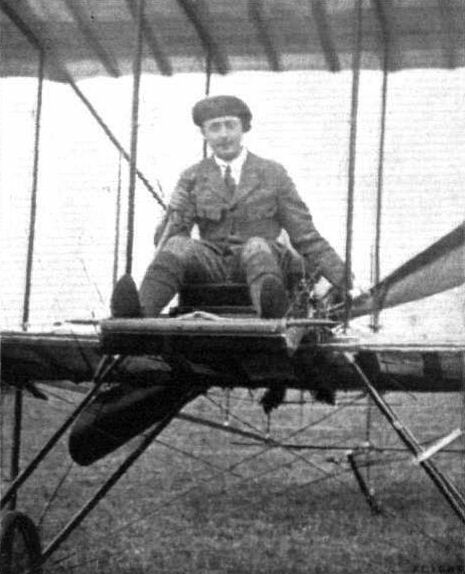 Mr. F. Warren Merriam, who has just obtained his brevet on a Bristol biplane at Brooklands. 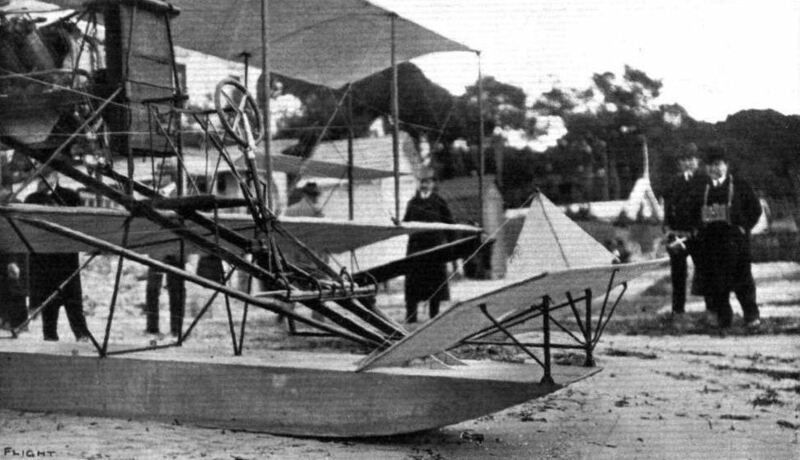 Mr. J. J. Hammond, the Australian aviation pioneer. Mr. Fielding, another pilot who has just obtained his brevet on a Bristol biplane at Brookiands. Lieut. 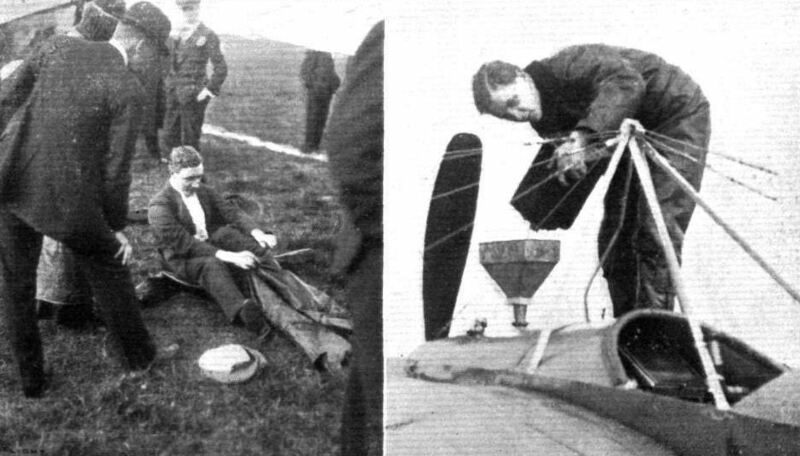 Longcroft, an old pupil of the Bristol School, at the control of one of that school's biplanes. Mr. Collyns Pizey, of the Brookiands Bristol School, and his cousin, Mr. C. H. Pizey, in the passenger's seat. C. Lindsay-Campbell starting for his brevet altitude test on a Bristol biplane at Salisbury Plain. AT THE BRISTOL FLYING SCHOOL AT BROOKLANDS. - Some aviators and pupils. From left to right, top row Lieut. Smith, Mr. Collyns Pizey, head of the Bristol School at Brooklands, Mr. Carfrae, and Mr. Lane. In the bottom row Mr. Merriman, and Capt. Weeding are standing to the right of the picture. AT BROOKLANDS AERODROME - A FEW PUPILS AT THE BRISTOL SCHOOL. - Reading from left; (top row) Mr. W. Bendall (instructor), Hon. Lieut. 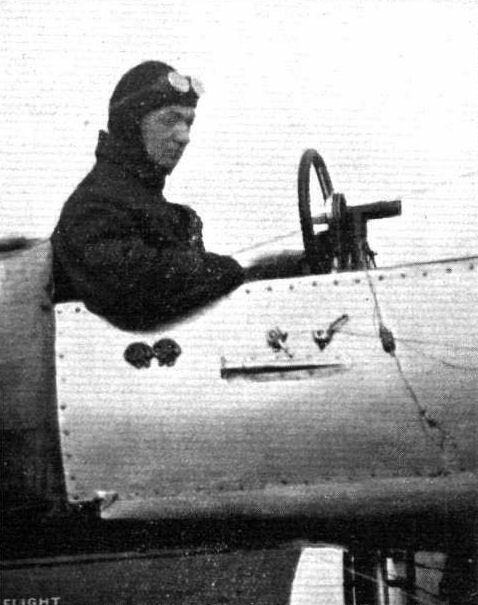 Boyle (passenger seat and who has just obtained his certificate), Capt. Pigot (in front seat, who has also just obtained his brevet), Mr. F. W. Merriam (chief instructor); (bottom row) Lieut. Empson, Major Forman, Lieut. Kitson, and Lieut. Rodwell. ALL BRITSH. - A snap group at the Bristol School, Lark Hill, Salisbury Plain. From left to right (on the machine) : E. Harrison (pilot instructor, Australian), V. P. Taylor (recently passed pilot, Australian), Geoffrey England (pilot instructor, English). Standing: H. Busteed (pilot instructor, Australian), and C. P. Pizey (pilot instructor, the school manager, and Lieut. in the R.F.C.). THE MILITARY COMPETITION MACHINES. - It is a similar machine to the above that Messrs. Handley Page are entering in the trials. The main differences of the Military machine from the one appearing in the above photographs are that pilot and passenger sit side by side, and the tail is somewhat changed. 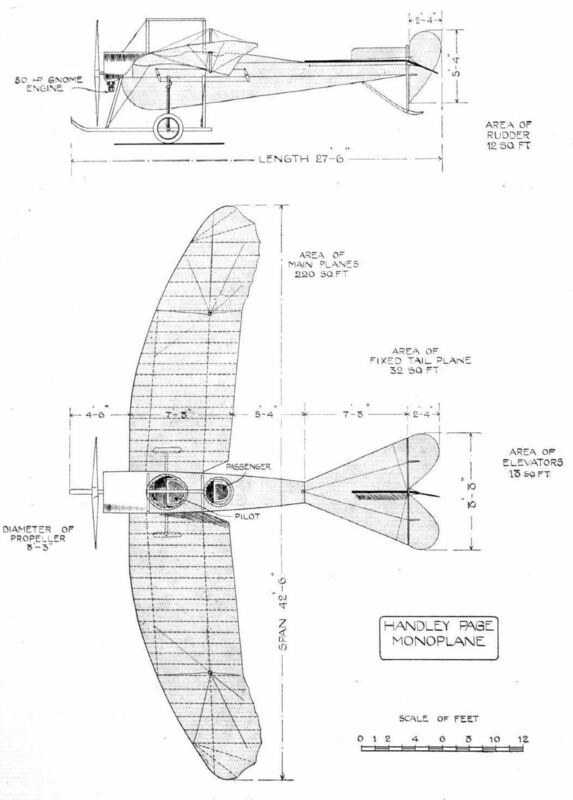 The Handley Page monoplane, showing, on the left, general view of the chassis, & c; top right, diagrammatic view of the fuselage; and, beneath, diagram of controls, the rudder bar not being shown. 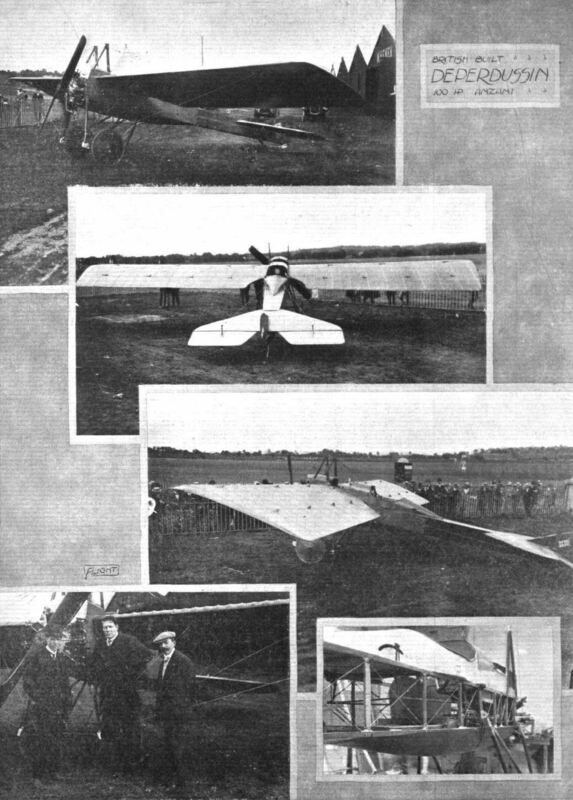 THE HANDLEY PAGE MONOPLANE. - Plan, and elevation to scale. A REMINISCENCE OF AUDEMARS AT BOURNEMOUTH. - A silhouette of Audemars in the pilot's seat of his Demoiselle which he then flew. Note the rod which runs up to his shoulder blades at the back. This was secured in a strap round his chest, and by means of body movements he was able to warp the wings. An example of a banking by Lincoln Beachey at Los Angeles not to be imitated. With this sort of circus performance it is hardly surprising to hear of so many sudden death from America. 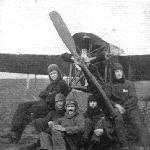 A series of German aeroplanes at Johannisthal from photographs kindly sent to us by the Hon. Lady Shelley. - Grade monoplane. One of the newest Grade, military-type, monoplanes. 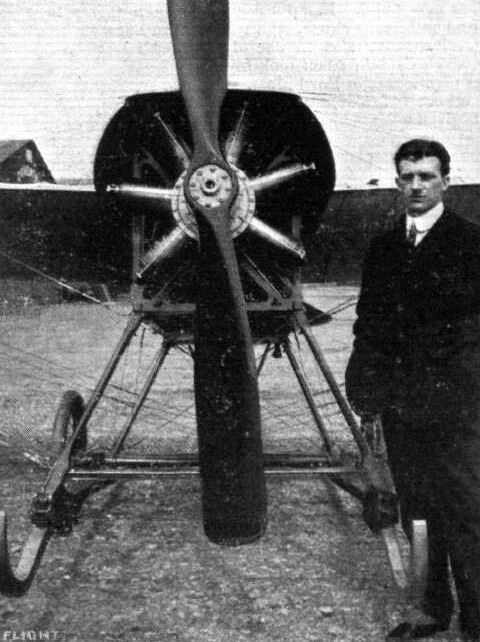 M. Pierre Verrier, of the Aircraft Co., in front of his Maurice Farman biplane. 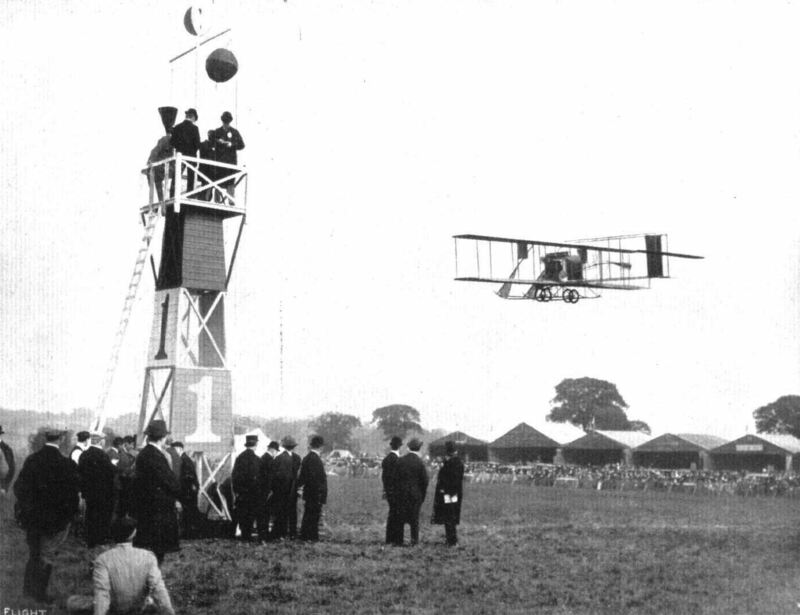 He made his first appearance at Hendon Aerodrome last Saturday with the M. Farman machine, and gave some remarkable demonstrations of his qualities as a skilful pilot. MR. VIVIAN HEWITT, Who, on Friday, April 26th, flew over the Irish Sea from Holyhead to Dublin on his 50-h.p. 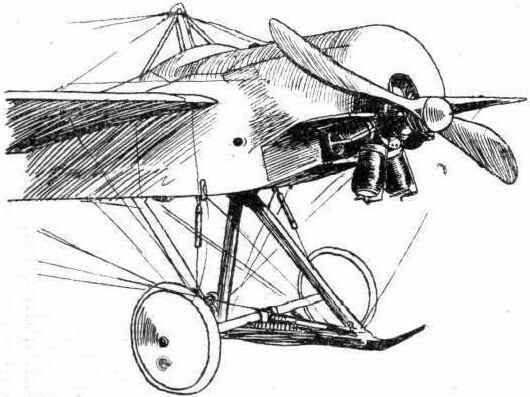 Gnome-engined Bleriot in 1 hr. 15 mins. Territorials at the Royal Aero Club's Eastchurch flying grounds practising with "Short" biplane, No. 32. Lieut. 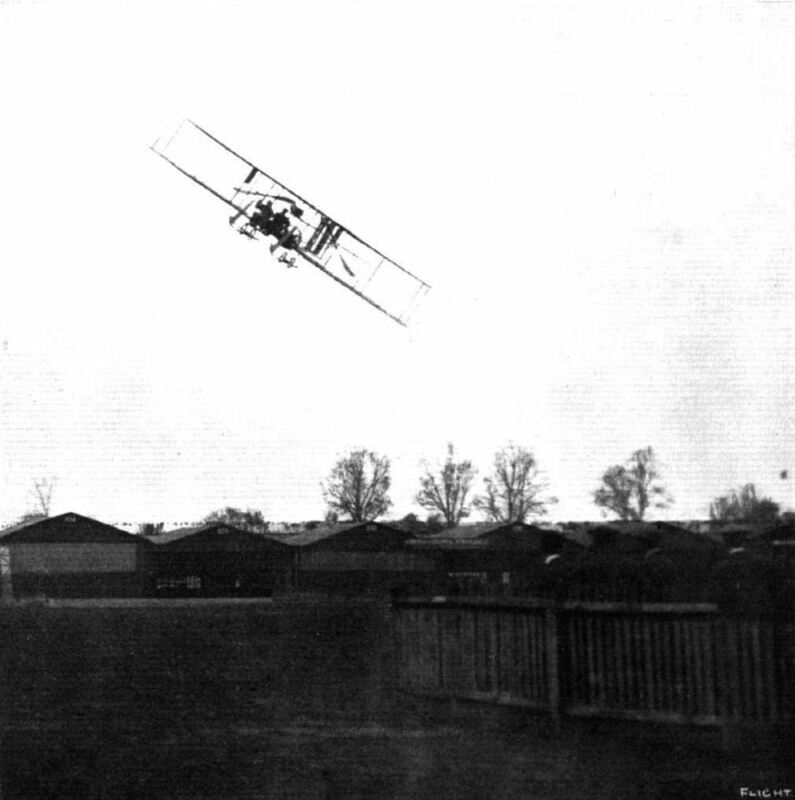 A. V. Barrington-Kennett qualifying for his pilot's certificate on the Short dual control biplane at the Royal Aero Club's Eastchurch flying grounds. Commander Samson, R.N., making a spiral vol plane at Eastchurch recently on one of the Short biplanes. Mr. Cutler on the Short biplane. Capt. 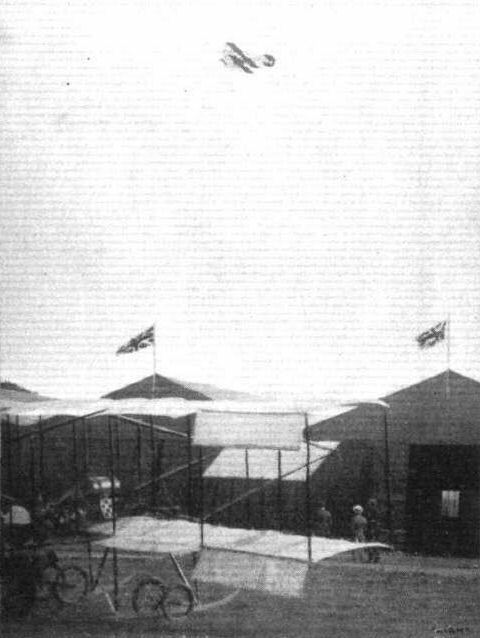 Gordon at Eastchurch flying grounds, another competitor for the Mortimer Singer Naval and Military Aviation Competition. 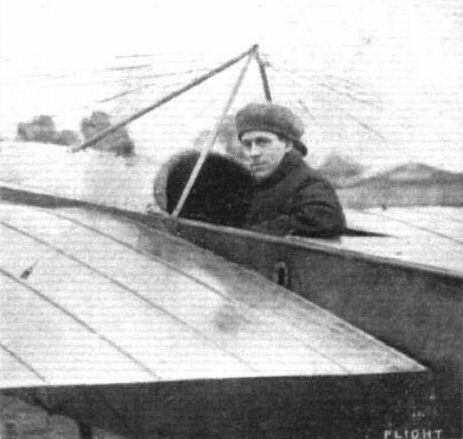 Capt Gerrard on his Short biplane at Eastchurch, where he is one of the foremost competitors for the Mortimer Singer Aviation Prize for Naval and Military Officers. Engineer Lieut. Briggs, R.N., with Leading Seaman Russell, on Short biplane No. 34, upon which he took his pilot's certificate on July 27th. Fig. 6. - Cody Biplane. 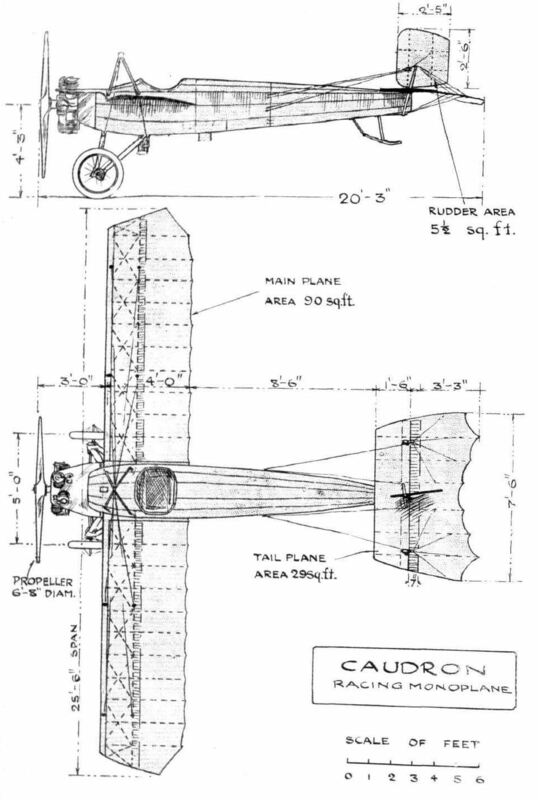 The Savary biplane, showing the landing gear and the disposition of the two tractors. WIRELESS TELEGRAPHY AND AEROPLANES. - The wireless telegraphy installation on the military Savary biplane. 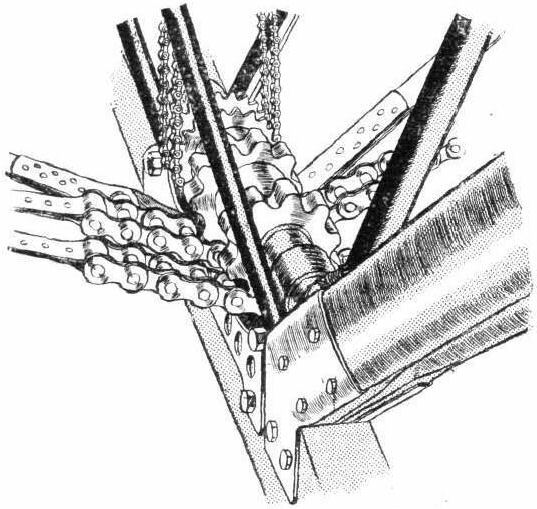 Diagrammatic sketch of the Savary single-chain transmission. Showing the method of mounting the 75-h.p. Renault motor on the Savary biplane. Mr. Burghope's flying scale model Nieuport - a fine piece of workmanship. 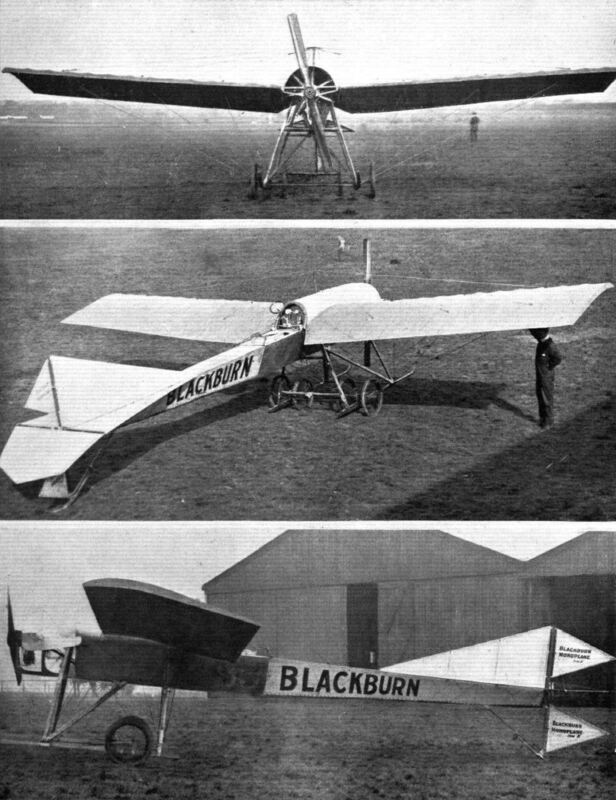 Three views of the Blackburn School monoplane. Lieut. Walter Lawrence, of the 7th Essex Regiment, and the 50-h.p. 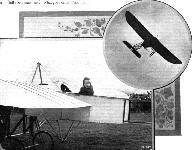 Blackburn monoplane with which he intends shortly to cross the Channel with Mrs. Leeming, a well-known Society hostess, as passenger. He is at present at Shoreham. TO FLY THE CHANNEL. - Lieut. Lawrence in the pilot's seat of his Blackburn monoplane with Mrs. Leeming, who will accompany him as passenger when he makes his trip across the Channel as referred in FLIGHT recently. Lieut. 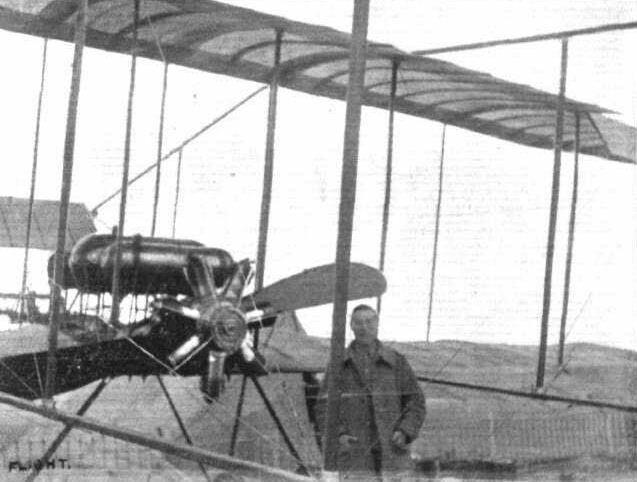 Spencer Grey and the Blackburn monoplane, with which he has been carrying out exceedingly successful flights at Eastchurch. 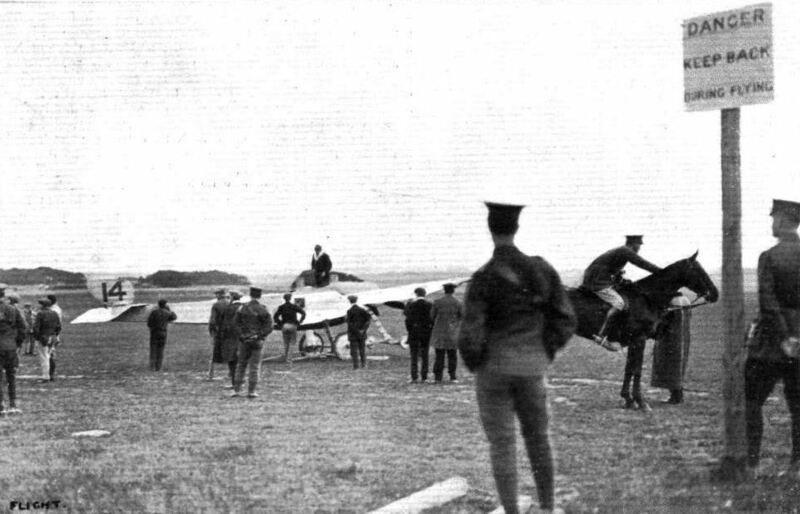 On the left, the monoplane being brought from the hangar. On the right, the engine being primed preliminary to starting. Sketches illustrating interesting constructional details in the 50-h.p. 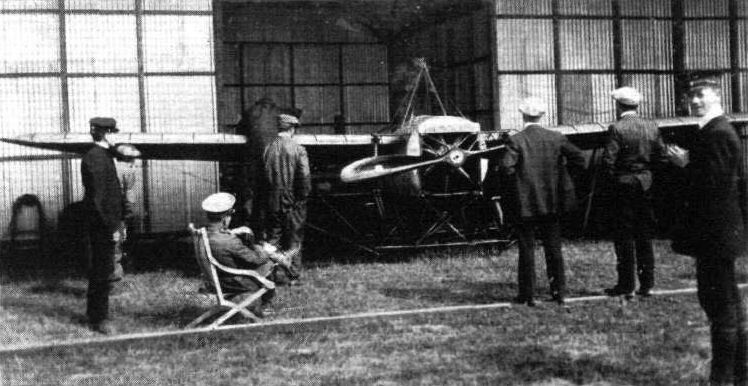 Blackburn monoplane, which is used as a practice machine at their school at the London Aerodrome. 1. 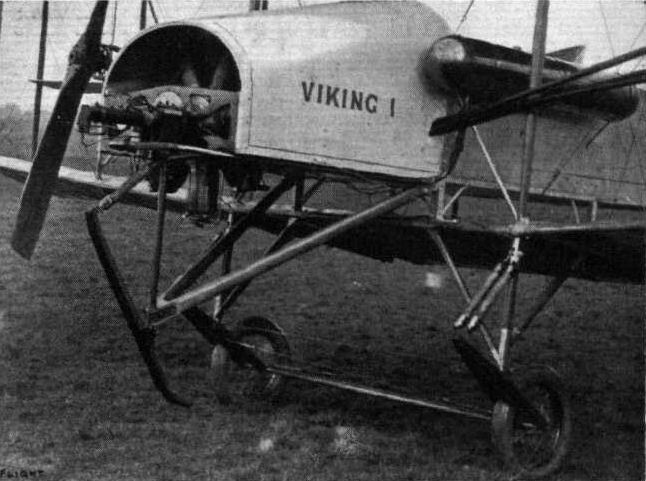 The landing-chassis; also showing the mast of the cabane. 2. 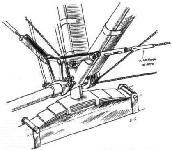 Joint between the front chassis-struts and the skid; the position of the joint is seen clearly in 1. 3. 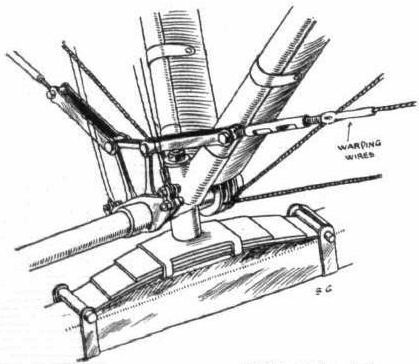 Joint between the base of the mast and the diagonal chassis-struts. 4. Hinge between the elevator and the backbone. 6. Details of the wing attachment to the body. 6. General view of the control system. 7. Joint of the back-wing spar to the body. 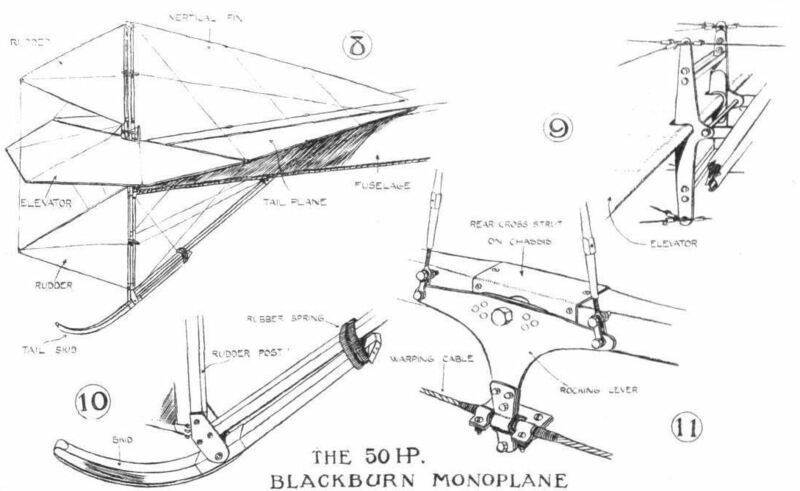 MORE SKETCHES OF BLACKBURN MONOPLANE DETAILS. - 8. General view ol the tail, showing the elevator and rudder-flaps, which form extensions of fixed fins. 9. The levers by which the control-wires are attached to the elevator. 10. 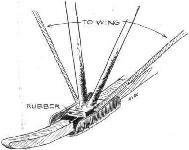 The trailing-skid under the rudder-post, showing the rubber spring. 11. 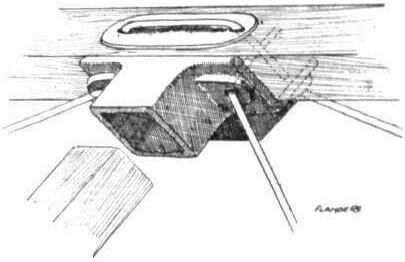 The rocking-lever of the warp, showing the attachment of the wires. 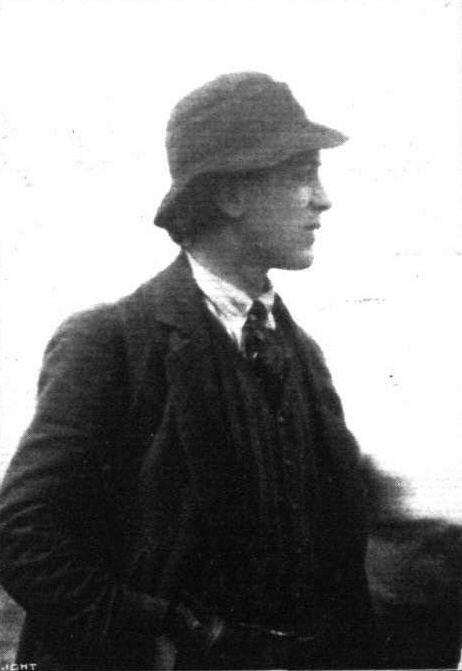 Mr. Herbert Spencer, who took part in the handicap races at Brocklands on the machine which he has re-constructed from the Macfie biplane. IN THE AIR DURING THE EASTER FLYING MEET AT HENDON. - Mr. W. H. Ewen on his Deperdussin. SOME OF THE HENDON PILOTS. - Mr. W. H. Ewen on his Deperdussin. 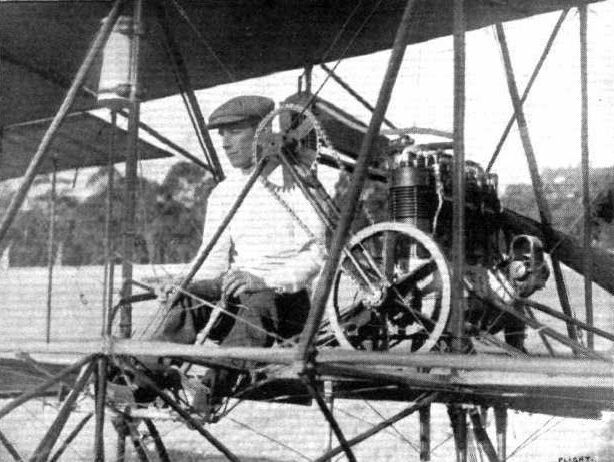 Mr. W. C. England on his E.N.V.-englned Howard Wright biplane at Rangoon, Burma, where he has been introducing aviation at the Rangoon Golf Club at Mingaladon. Mrs. Stocks just before starting for a flight in the Howard Wright biplane at Hendon last week-end is introduced to the Daily Mirror's "Baby Jumbo," but unfortunately (?) Mrs. Stocks already had the passenger seat occupied, and Jumbo therefore was not invited for a spin. THE WEEKLY FLYING MEETINGS AT HENDON. - Mr. Lewis Turner on the Howard Wright just getting away in the cross-country handicap. Mr. Lewis Turner finishing first and Mons. Verrier second in the second heat of the Speed Handicap at Hendon on Saturday last. 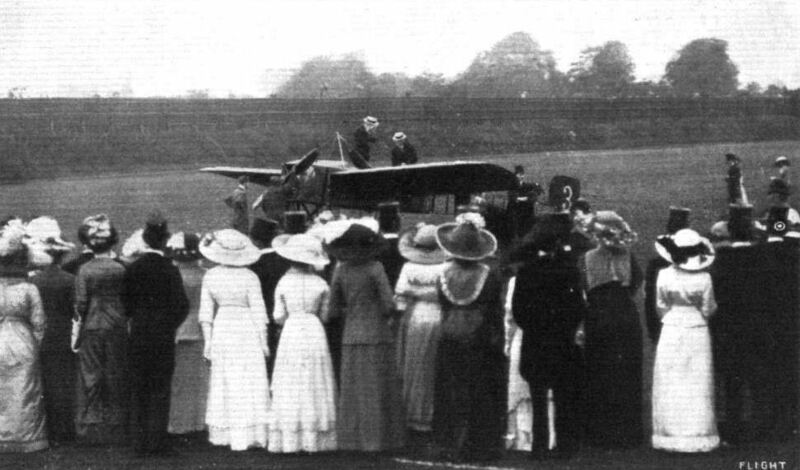 Guests at Mr. Claude Grahame-White's wedding at Sir Daniel Gooch's residence, "Hylands," watching Mr. B. C. Hucks flying on his Bleriot during the afternoon. On the ground in front of the mansion is Mr. Grahame-White's Howard Wright biplane on which he flew over, and on the right is the Aircraft Co.'s Maurice Farman biplane on which M. Verrier during the afternoon gave some remarkable exhibitions in a strong wind. Lieut. 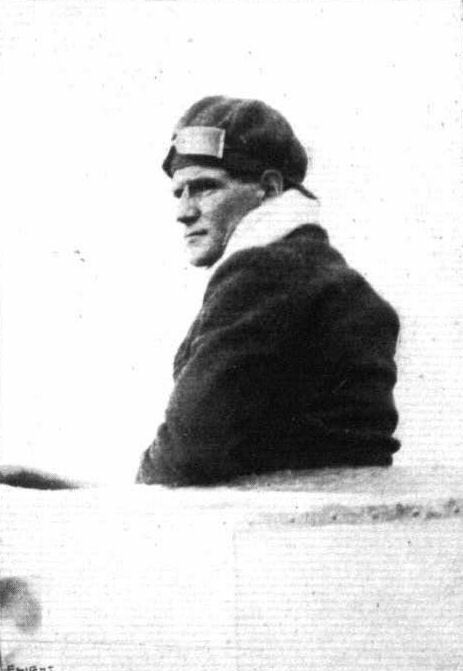 B. T. James, who qualified for his pilot's certificate on a Howard Wright at Hendon on June 1st after the fourth day only in an aeroplane. 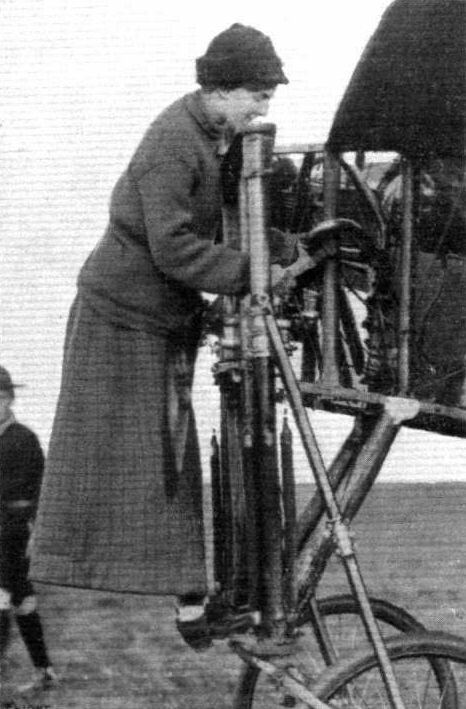 Baroness Schenk, one of the lady aviators who are practising at Hendon Aerodrome. 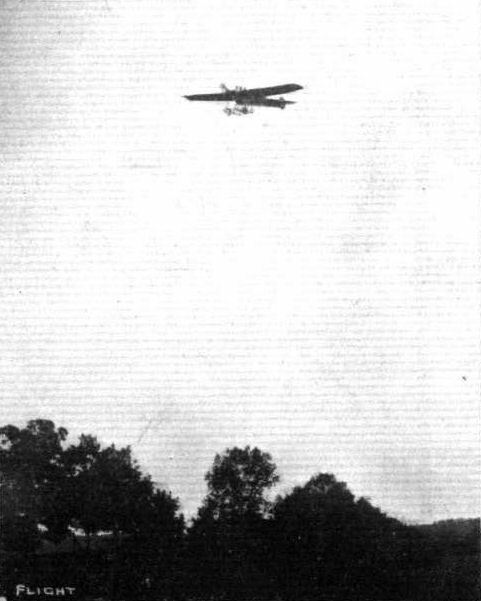 How Grahame-White's School Howard Wright biplane appeared after it had dashed into trees. Apart from the broken elevator, splintered propeller, two or three ribs smashed, and a damaged tail tip, no further damage was done. "A flying machine is neither an open grave nor a toy for children." Such is the expression to which Prince Henry of Prussia, certified aviator, has subscribed his signature as above for his portrait on the Euler biplane on which he qualified for his pilot's certificate. THE HYDRO-AEROPLANES AT MONACO. - The Voisin Canard well up in a flight over the course. 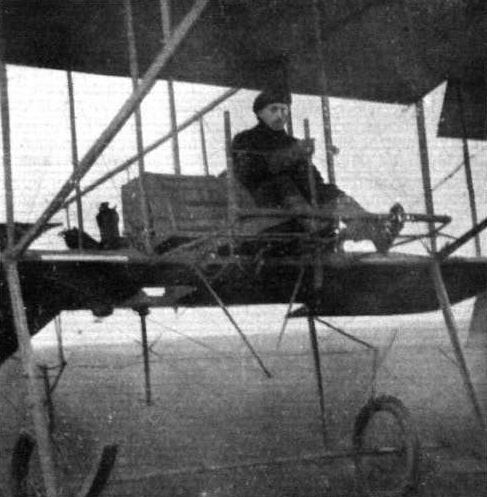 Fabre floats were adopted for several types of aircraft. This Voisin 'canard' had no fewer than four. A series of German aeroplanes at Johannisthal from photographs kindly sent to us by the Hon. Lady Shelley. - Harlan monoplane. Pizey and Game on the Bristol biplane in a handicap race at Brooklands. Lieut. 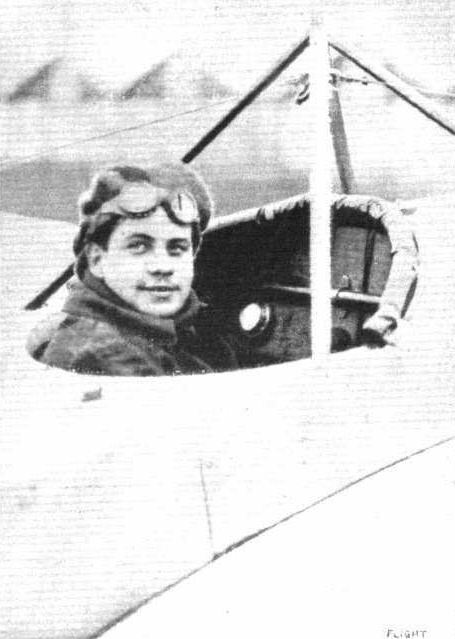 Eric Mackay Murray, who secured his brevet at Salisbury on January 24th on a Bristol military extension biplane. J.W. 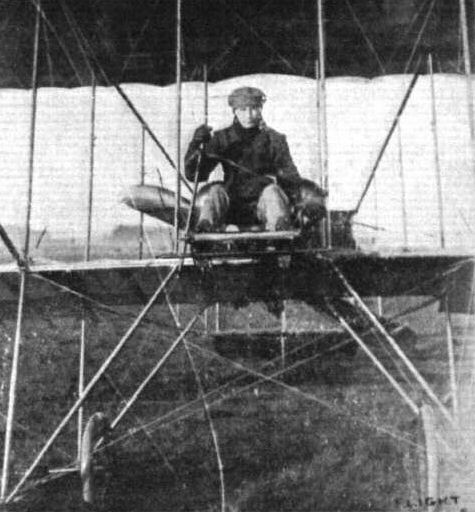 Dunne in the D7bis monoplane at Eastchurch in 1912 where the reconstruction from D6 was carried out. 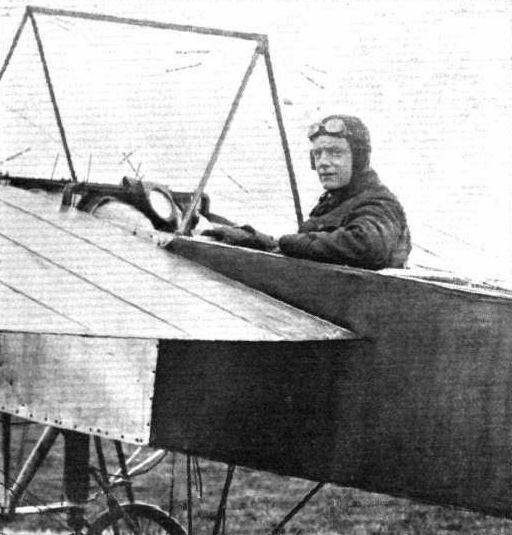 J. W. Dunne on his monoplane at Eastchurch, where, having recovered from his illness, he has been fiying again most successfully. The Astra Co, have taken up the rights for manufacturing the Dunne machines in France. HYDRO-AEROPLANE EXPERIMENTS AT BARROW. 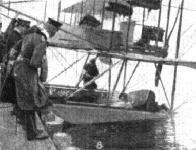 - On the left Commander Schwann's machine, an Avro hydrobiplane, leaving its dock, with Sidney V. Sippe at the lever. On the right the machine is seen skimming the water just prior to taking the air, with its tail well up and the elevators just moved in the position for ascent. 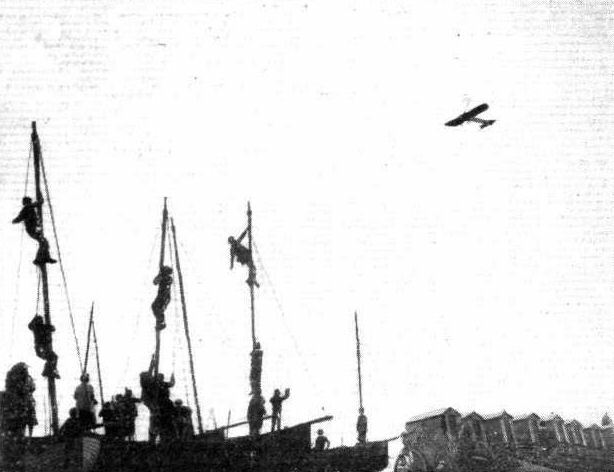 Sippe well up on the Avro hydro-biplane over Cavendish Dock, Barrow. 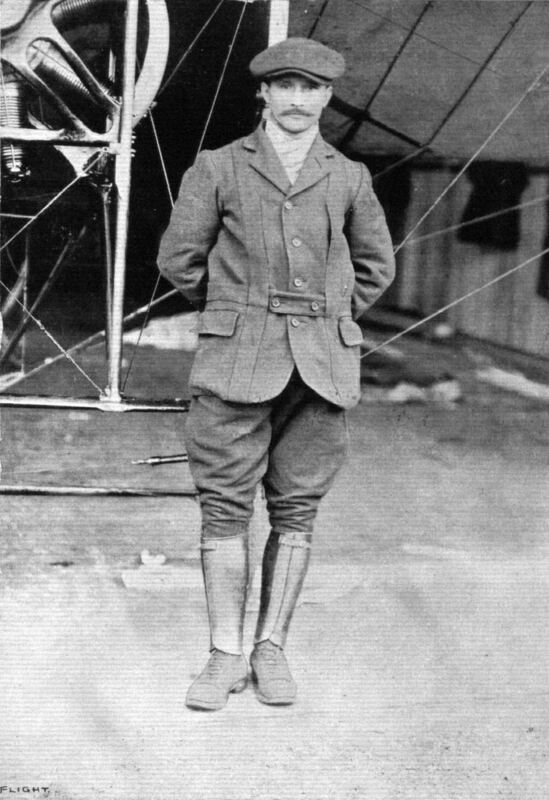 Sydney V. Sippe, who has just secured his certificate on an Avro biplane. 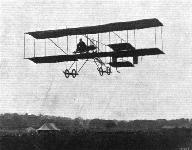 MAURICE FARMAN BIPLANE. - Three-quarter view from in front. 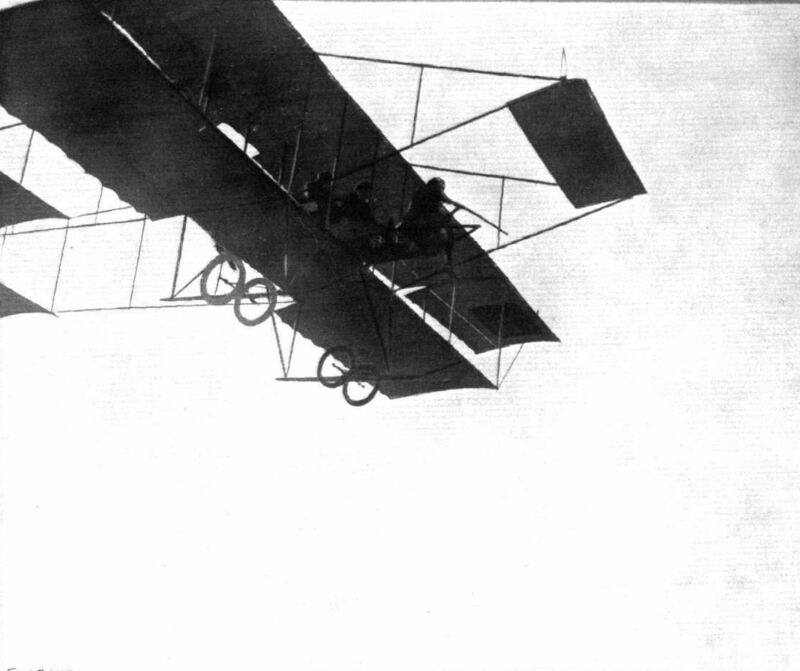 MAURICE FARMAN BIPLANE. - Side view. THE MILITARY COMPETITION MACHINES. 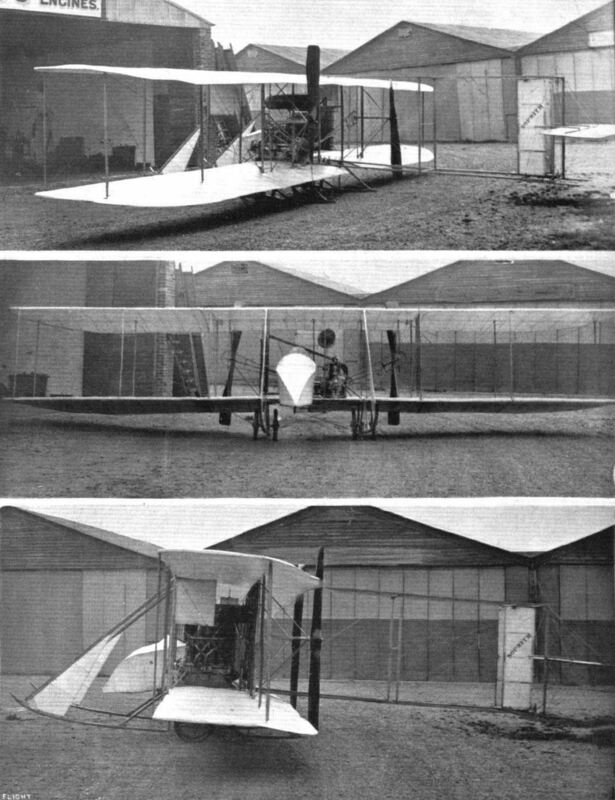 General view of the Maurice Farman biplane figuring in the trials. 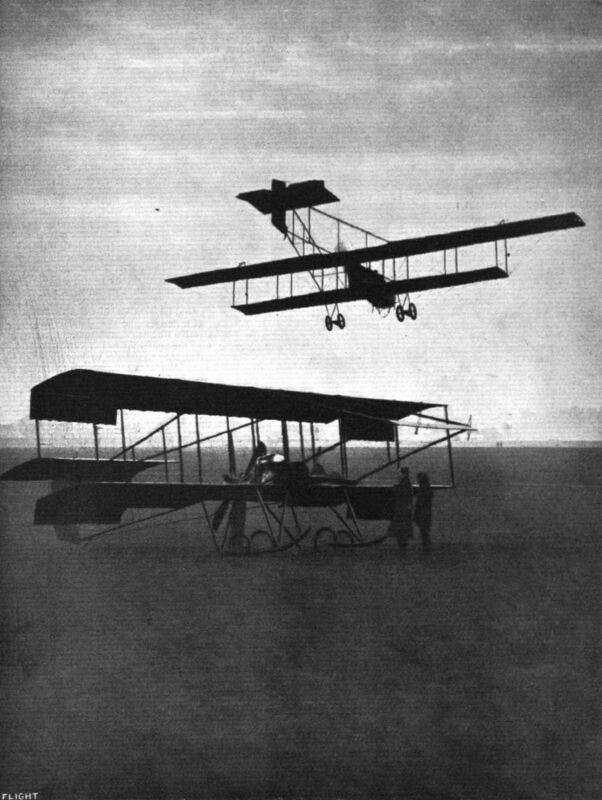 MAURICE FARMAN BIPLANE. - View from in front. 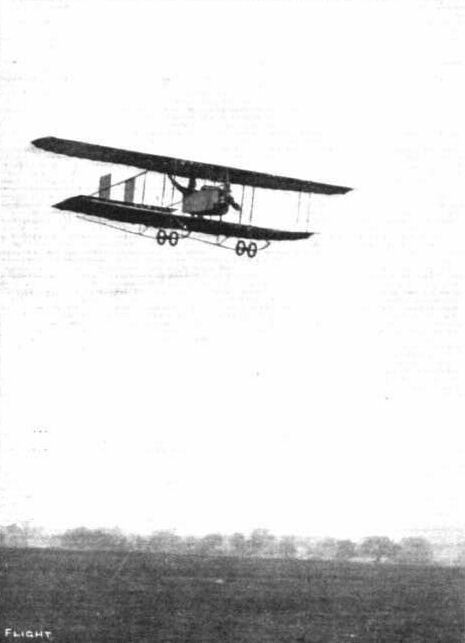 MAURICE FARMAN BIPLANE. - View from behind. THE GREAT FRENCH AEROPLANE REVIEW AT VILLACOUBLAY LAST WEEK. 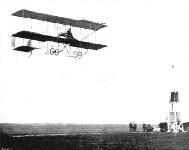 - General view of the Maurice Farman escadrille. 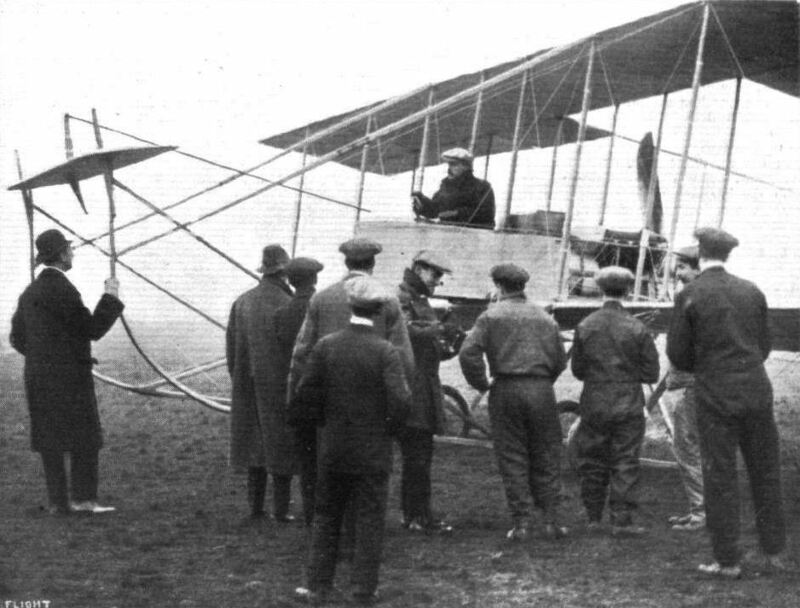 The visit of Mr. Maurice Farman to Hendon Aerodrome last Sunday, for the purpose of testing some of the machines built by the Aircraft Co. to his design, created a considerable amount of interest. 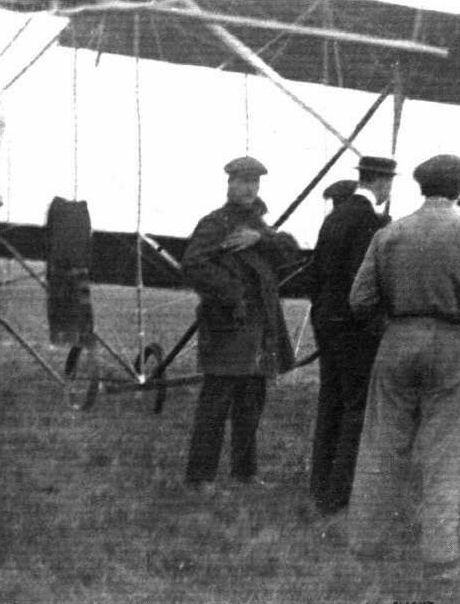 He made several trial flights, and our picture shows him discussing points with Mr. Holt Thomas, with interested mechanics, &C, prior to one of his flights. AERIAL DERBY DAY AT HENDON AERODROME. 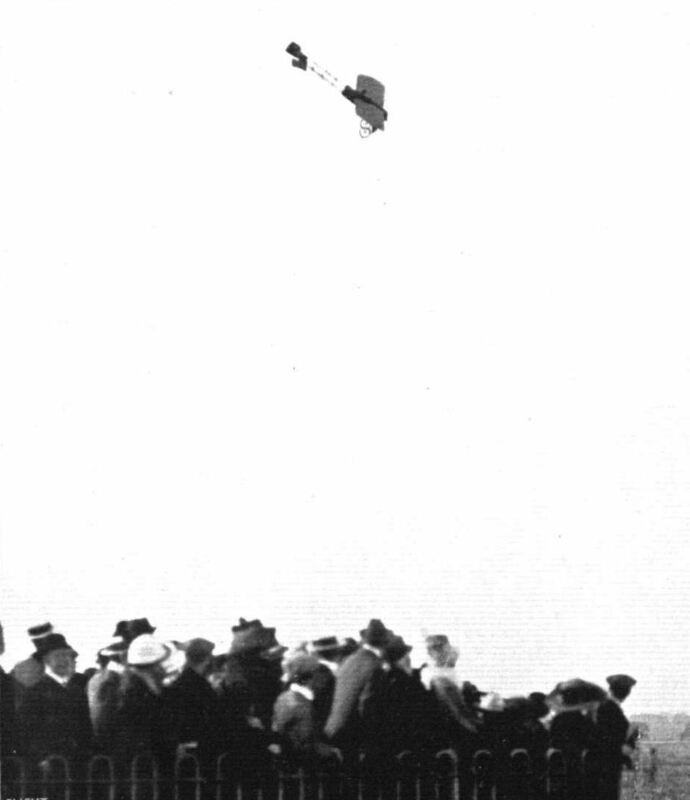 - Pierre Verrier flying on the Maurice Farman biplane. FLYING AT THE ARMY COMPETITIONS IN A 25-MILE WIND. 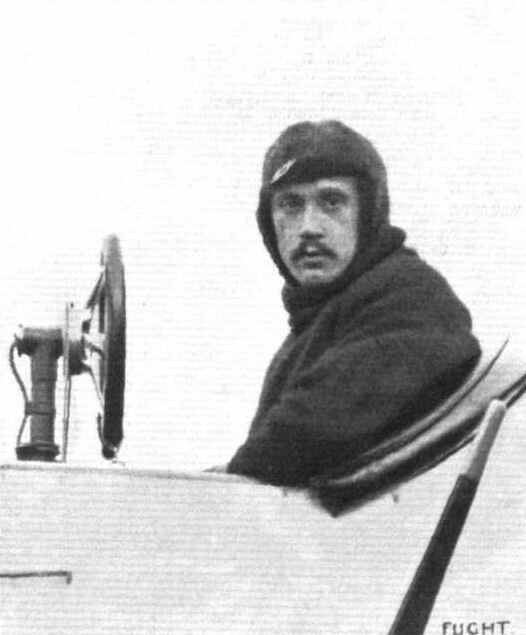 - Verrier, on the Aircraft Co.'s Maurice Farman, passing over the sheds. 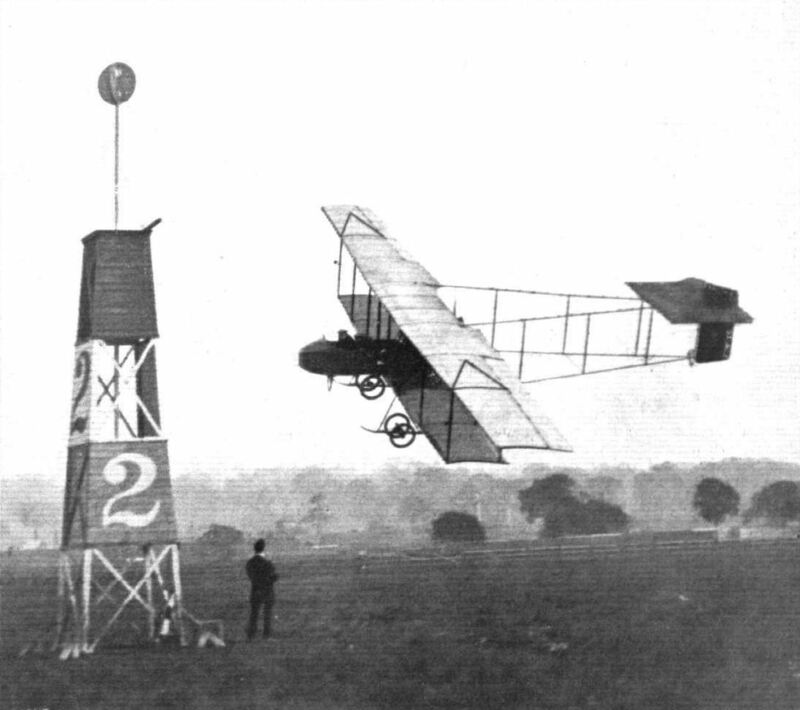 A test flight by Mr. Maurice Farman at Hendon in the British-built machine of his own design. OFF TO BRIGHTON. 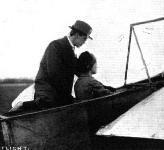 - M. Pierre Verrier, with his mechanic as passenger, leaving the Hendon aerodrome for his trip to Brighton on Sunday. 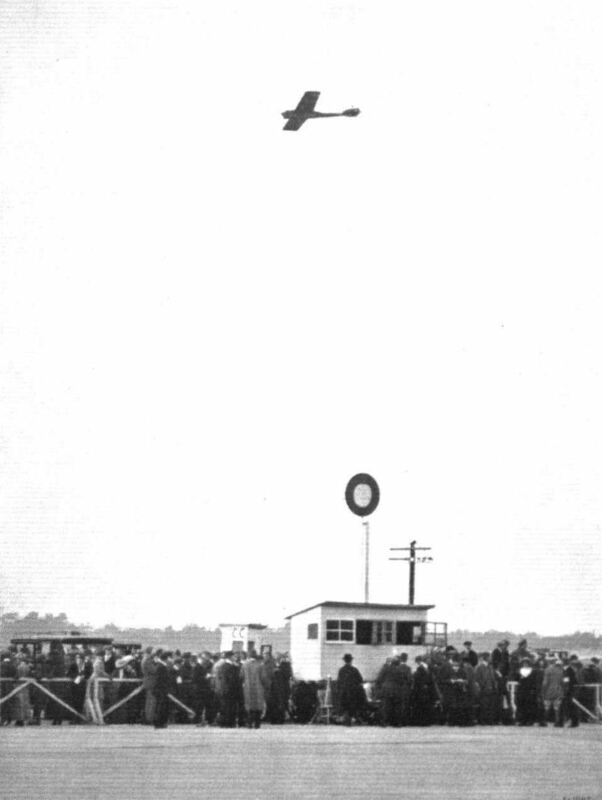 THE THIRD AEROPLANE HANDICAP AT BROOKLANDS, SATURDAY LAST. - Capt. 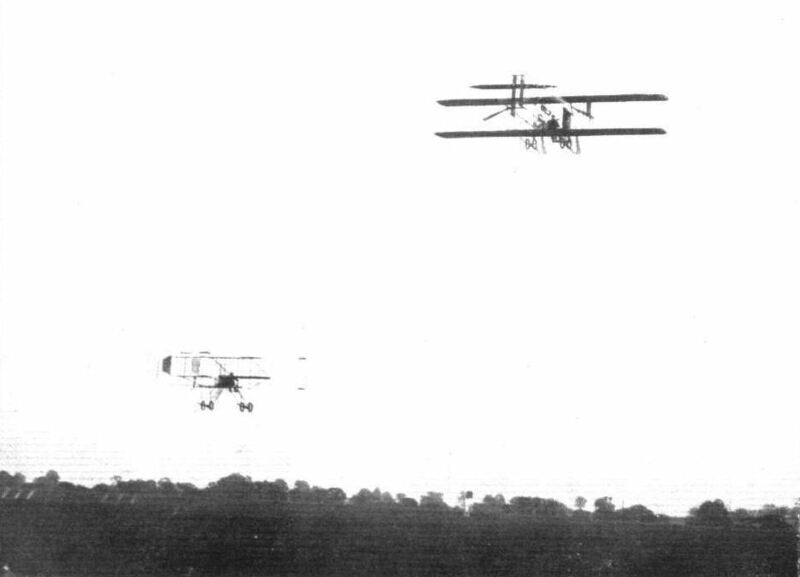 H. Wood on his Vickers monoplane and P. Verrier on his Maurice Farman biplane getting away from the start. 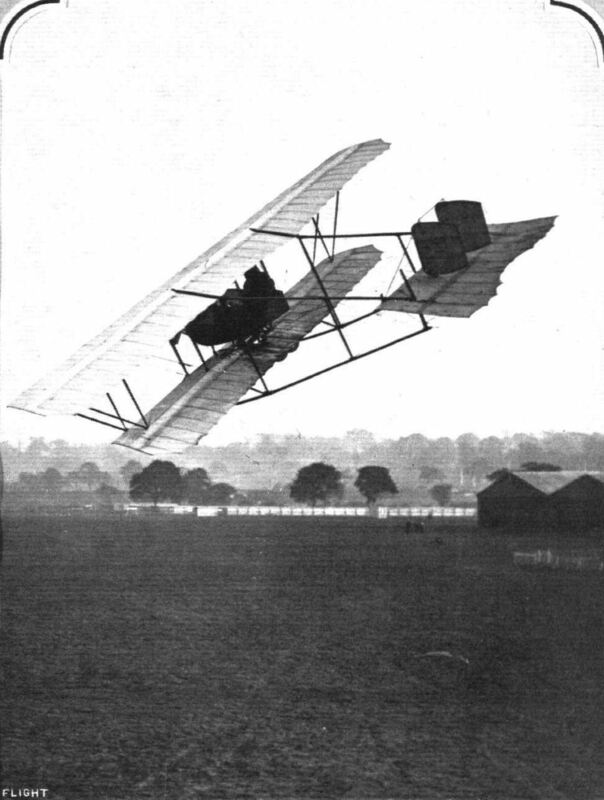 MAURICE FARMAN BIPLANE. - Near view from behind, showing the pilot's seat, position of engine, &c.
Mr. Maurice Farman, accompanied by Mrs. Holt Thomas as passenger, about to start for a Aerodrome on Sunday last in the British-built Maurice Farman machine. 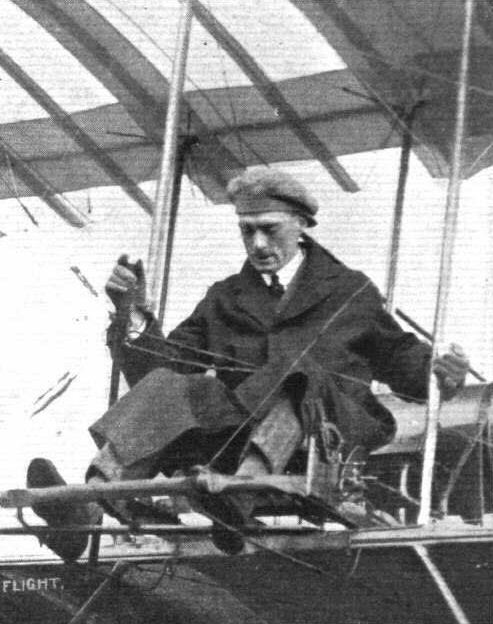 M. Pierre Verrier, who has been giving some fine exhibitions of the capabilities of the Maurice Farman biplane before a number of British military and naval officials at Hendon, in the pilot's seat of his machine. 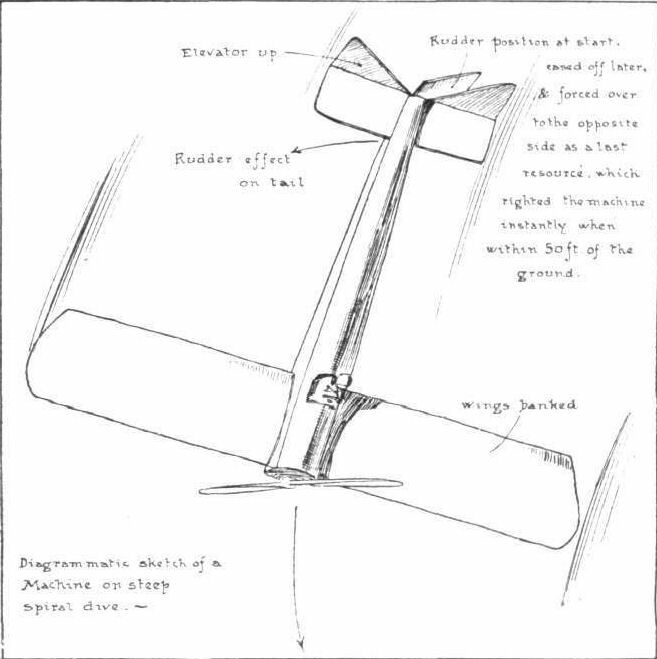 Details of the control of the Maurice Farman biplane sketched from the passenger's seat. 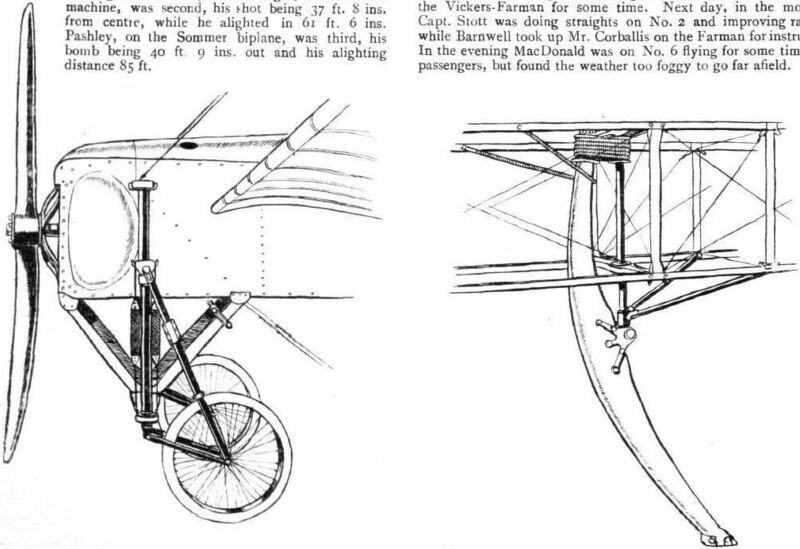 DETAILS OF THE MAURICE FARMAN. - Above, the new form ol nacelle, showing the windows provided to give the pilot a clearer view of what is beneath him; below, shows how the rear ends of the main skids are turned down to form landing-brakes. 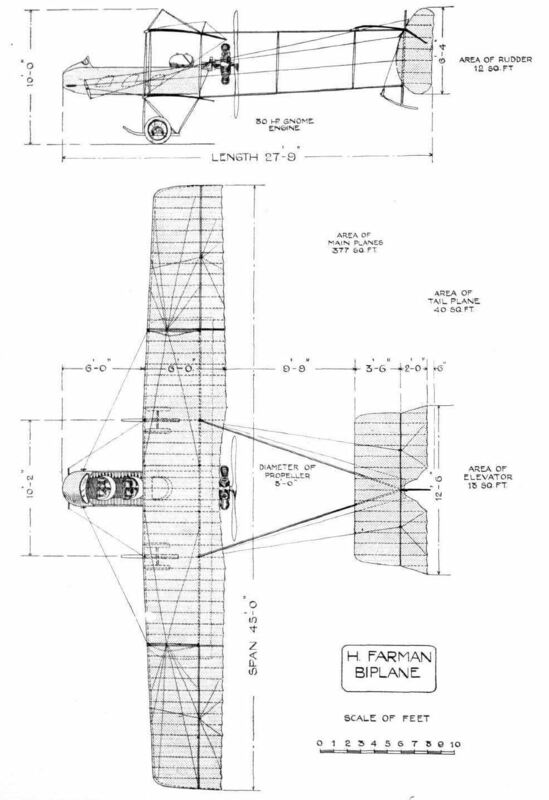 Constructional details of the Maurice Farman biplane. 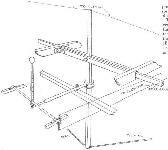 - On top a diagrammatical sketch of a joint in the landing chassis. 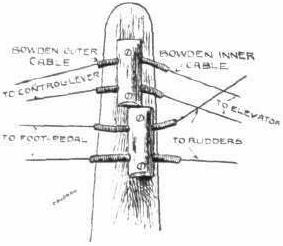 The two struts are half-lapped and strengthened with wooden angle-pieces; the whole is then bound securely and strengthened with steel plates. 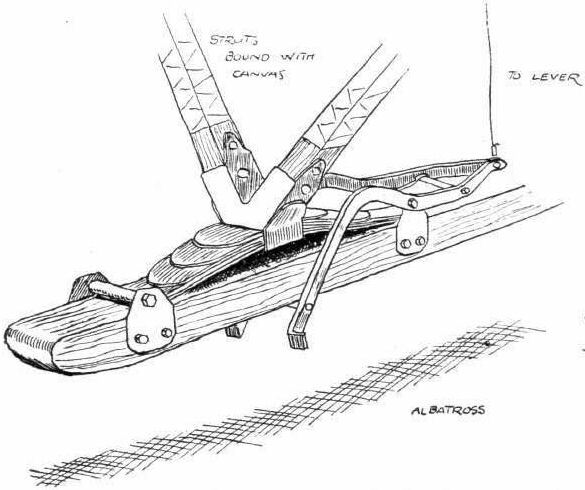 Below is a sketch of a hollow strut. The combined steel socket and extension fitting. 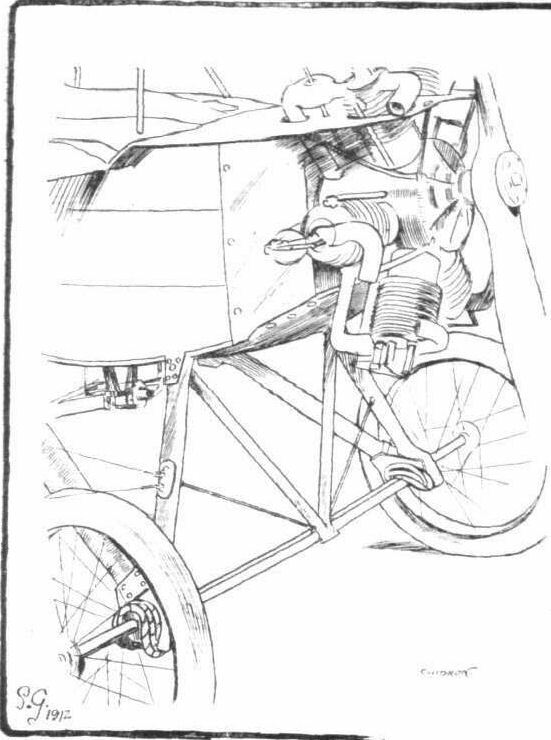 Showing how the control cord is applied to the aileron lever of the Maurice Farman biplane. 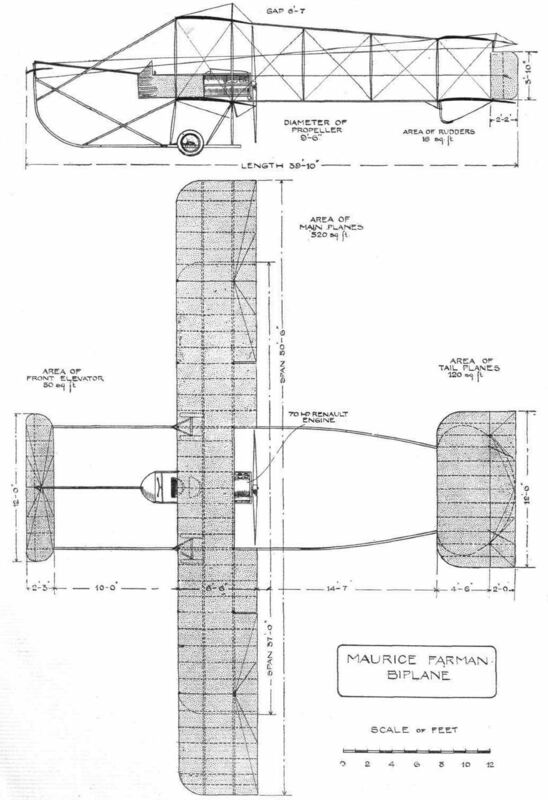 DETAILS OF THE MAURICE FARMAN BIPLANE. - On the left one of the tail skids. 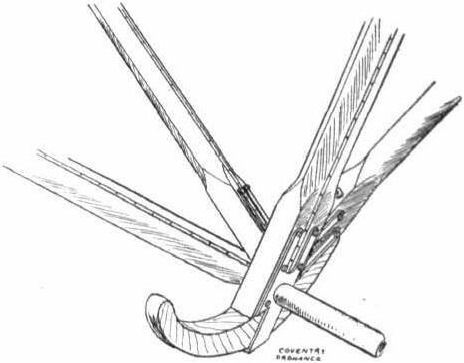 On the right the fitting by which the extension may be folded down to reduce overall dimensions. MAURICE FARM AN BIPLANE. - Plan and elevation to scale. LIEUT. 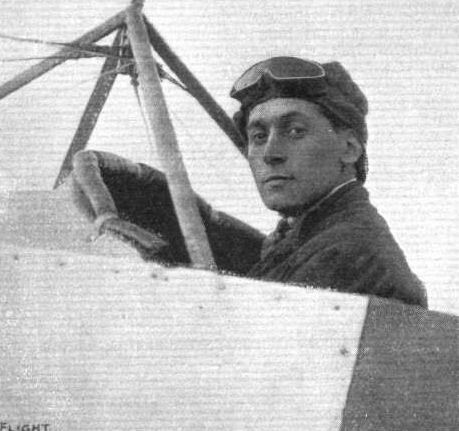 A. M. LONGMORE, R.N., Winner of the Mortimer Singer Navy Aviation Prize by his 172-miles flight at Eastihurch on March 11th, on a 70-h.p. Gnome-engined Short tractor biplane. AVIATION IN AUSTRALIA. - Mr. Duigan pancaking at Bendigo Race Course on May 3rd, 1911, after doing about three-quarters of a mile. He had to steer between two trees, hence his proximity to the one seen. AVIATION IN AUSTRALIA. 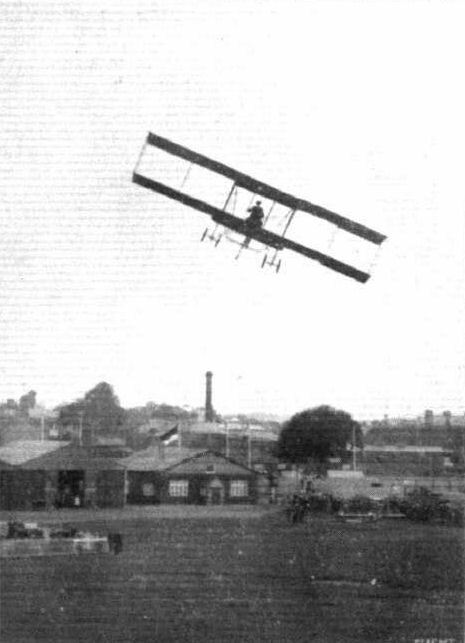 - On the left, Mr. J. R. Duigan flying over Bendigo Race Course on May 3rd, 1911. 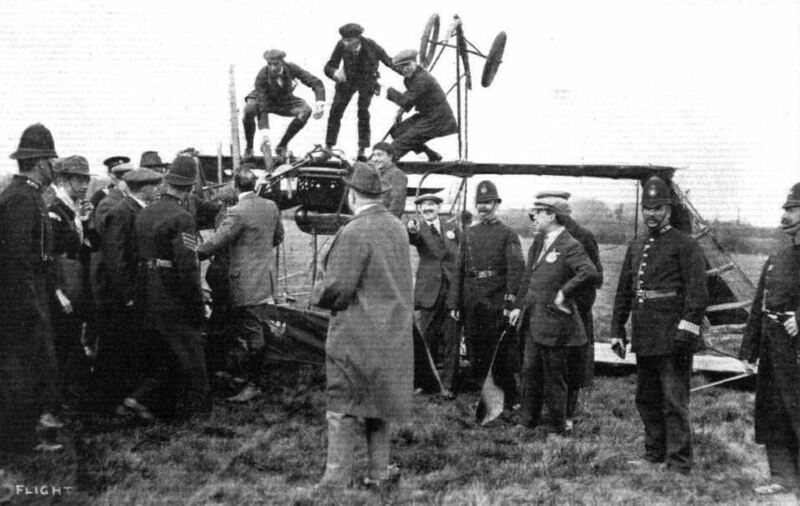 The machine had been in the air for about 200 yards when photograph was taken, and the crowd are facing the machine, out of the picture. 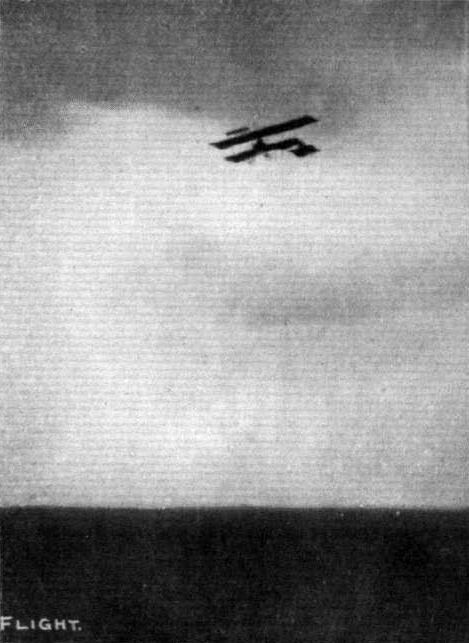 On the right, Mr. Duigan is seen flying at second attempt in 12 m.p.h. wind on May 31st, when he landed safely. 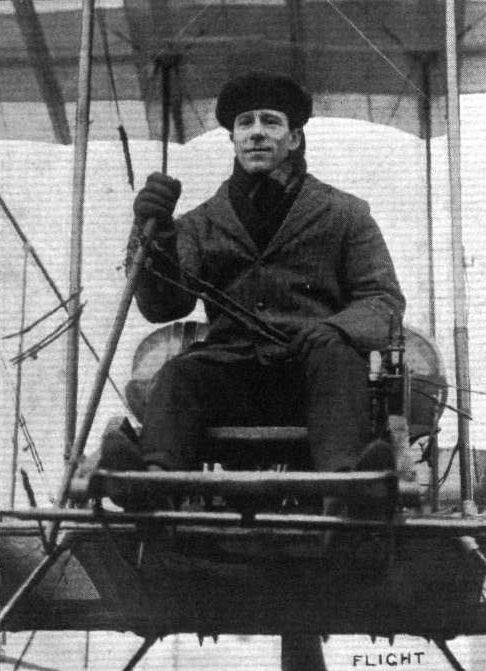 Mr. J. R. Duigan on his machine, which he designed, built, and piloted himself. BRITISH AEROPLANES ON THE CONTINENT. 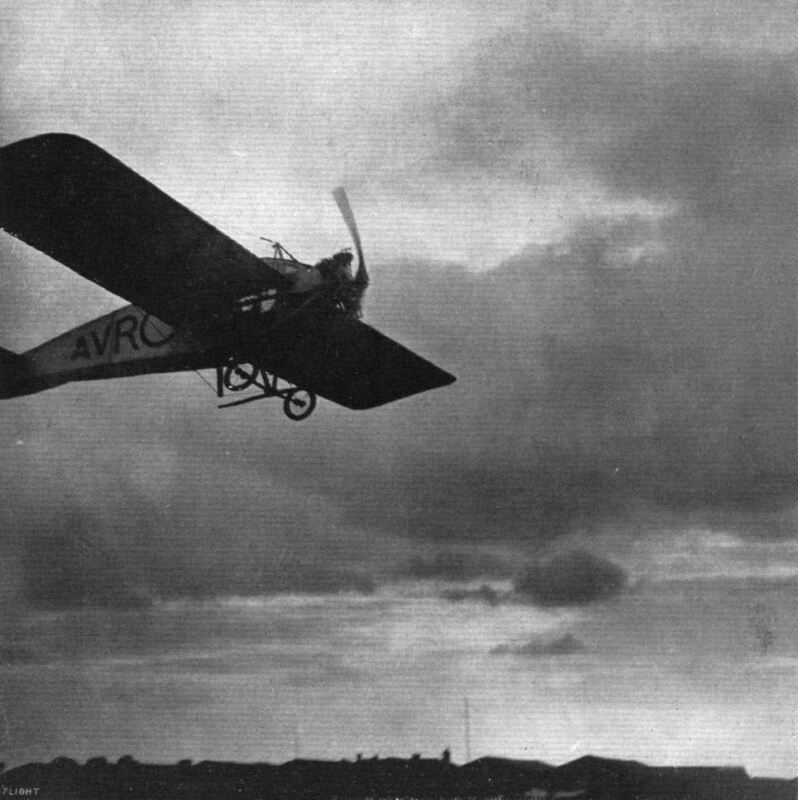 - A two-seater Bristol monoplane in Germany in charge of Mr. Jullerot. FAMILIAR OBJECTS ON SALISBURY PLAIN. 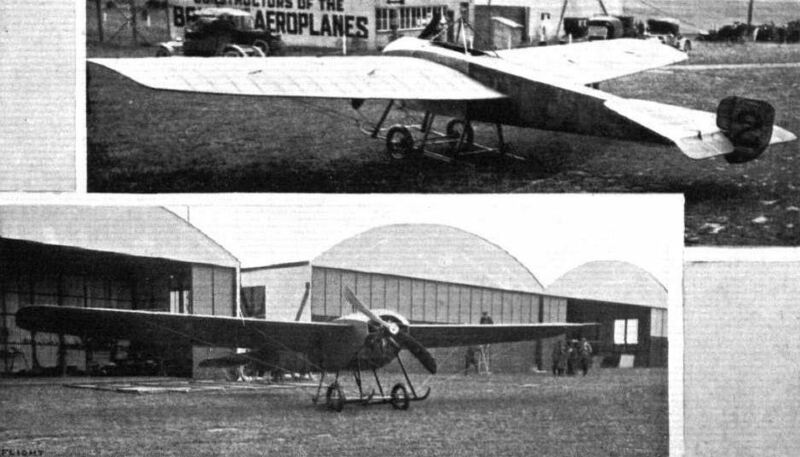 - A couple of the double-seater Bristol monoplanes. 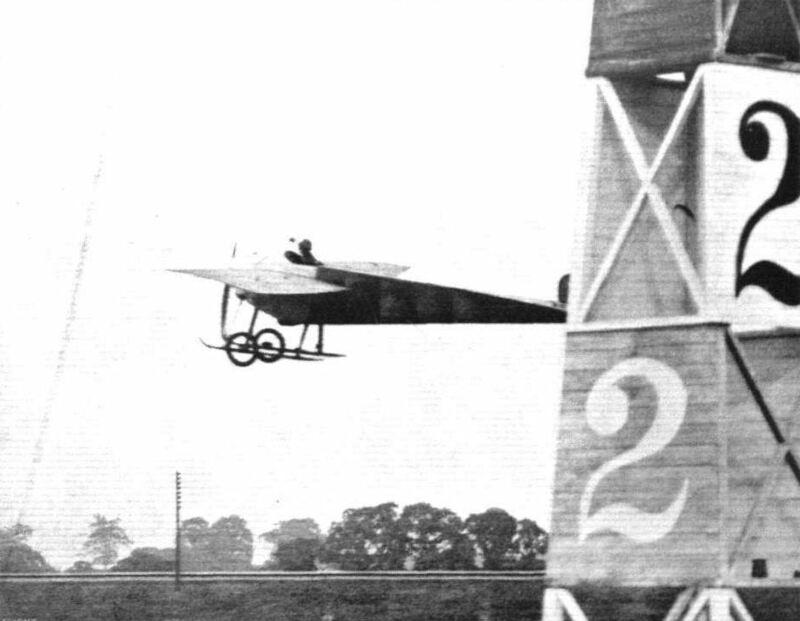 The single-seater Bristol monoplane making a banked turn at Brooklands, piloted by Pizey. This machine, which is making fine way, is fitted with a 35-h.p. Anzani engine, and has a speed of about 58 m.p.h. Mr. Arthur, who took his brevet last week at Brooklands at the Bristol school. 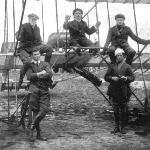 The "Terrible Five," being some prominent aviation men at Salisbury. 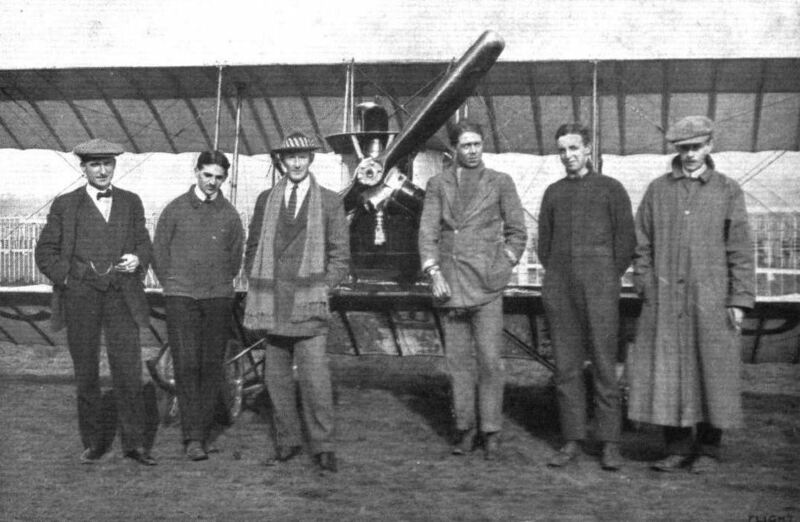 From left to right: Messrs. England, Barnwell, Lindsay Campbell, Grelg and Sydney Pickles (Australian monoplane pupils), and the machine they fly. Lieut. 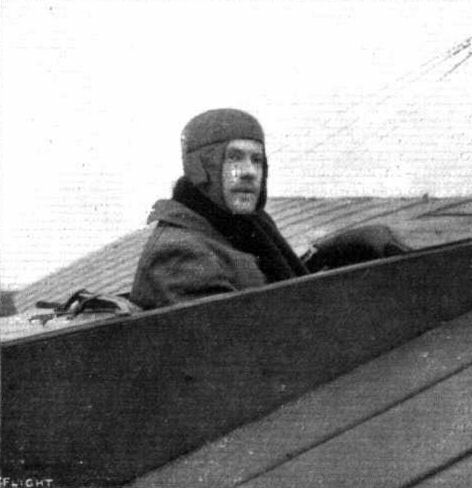 Reynolds, R.E., at the pilot's seat on his Bristol two-seater monoplane. A PROMISING AVIATOR. 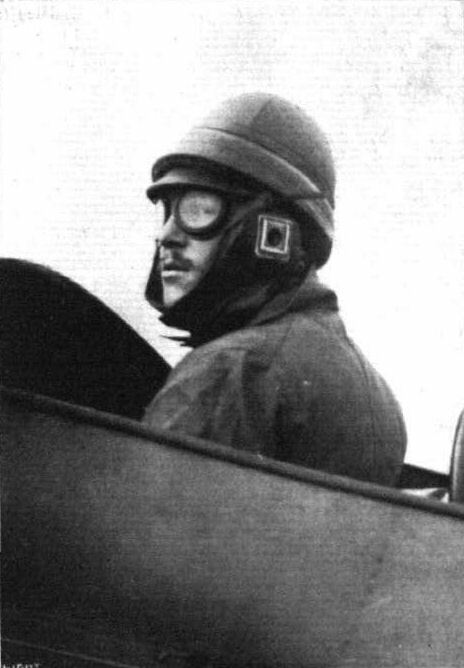 - Mr. Sydney Pickles, an Australian, on the single-seater Bristol monoplane, which he has been flying at Brooklands. 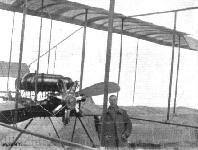 He has also flown the two-seater, of same make, exceedingly well, doing figures of 8 on it, &c. Extremely enthusiastic and the makings of a fine flyer. 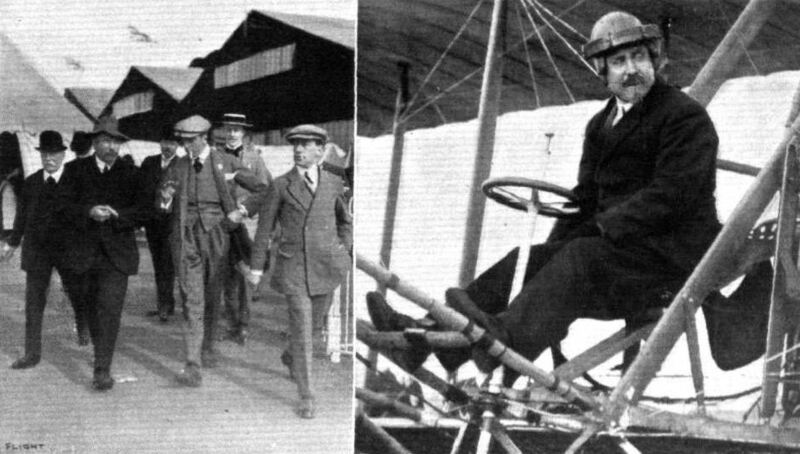 Mr. F. Warren Merriam, the very able manager of the Bristol Co. at Brooklands Aerodrome, just going for a flight to test one of the Bristol monoplanes for Prince Cantacuzene. 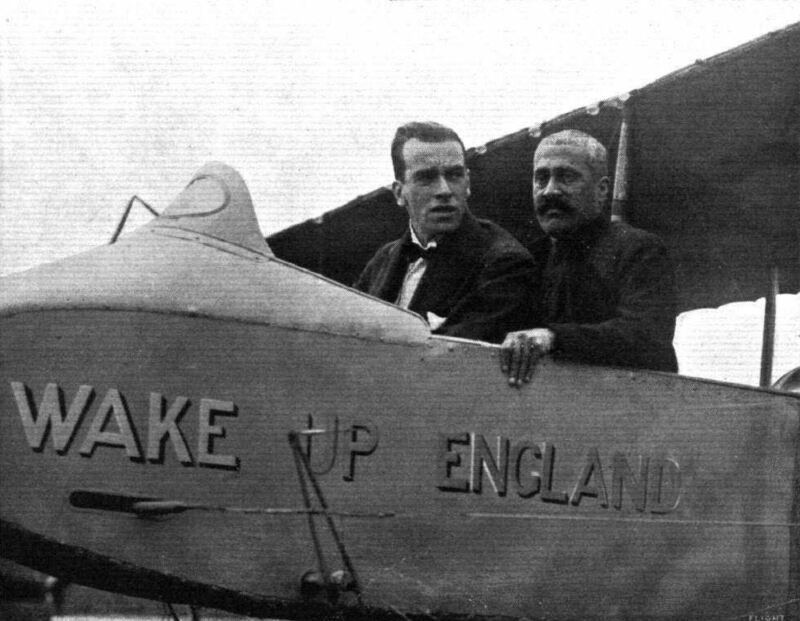 Messrs. Howard Pixton and his pupil, Harold Lane, on the two-seater Gnome-Bristol monoplane, on which they flew on Thursday morning of last week from Brooklands to Salisbury, a distance of over 60 miles in one hour. A couple of flying Australians at Lark Hill, Salisbury Plain. 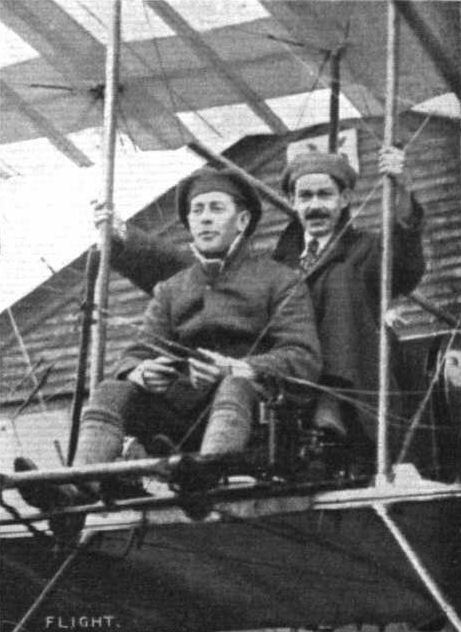 - Mr. Vincent P. Taylor (well known in the balloon world as "Captain" Penfold) in front on the two-seater Military Bristol, and on the right Mr. Eric Harrison, one of the Bristol Co.'s instructors. MESSRS. ROLFE BROTHERS' MODELS. - On the left their distinctive type model, and on the right their Bristol type. Mr. S. F. Cody taking a turn round Hendon Aerodrome in his biplane on Saturday last. Mr. S. F. Cody and his freight of four passengers, Miss Buckoke and Messrs. Haves, Dackett, and Frank Cody, totalling to 738 lbs., with whom be flew last Saturday afternoon at Aldershot at a height of about 70 to 80 ft. on his new 'bus for a distance of about 7 miles. Mr. S. F. Cody just after arrival at the Hendon Whitsun Meeting on his biplane, with fingers numbed with cold. Mr. Grahame White is just explaining he also suffers from cold hands, but, needless to add, both know nothing about "cold feet." On the right, Mr. Cody in the seat of his machine just before starting a flight. 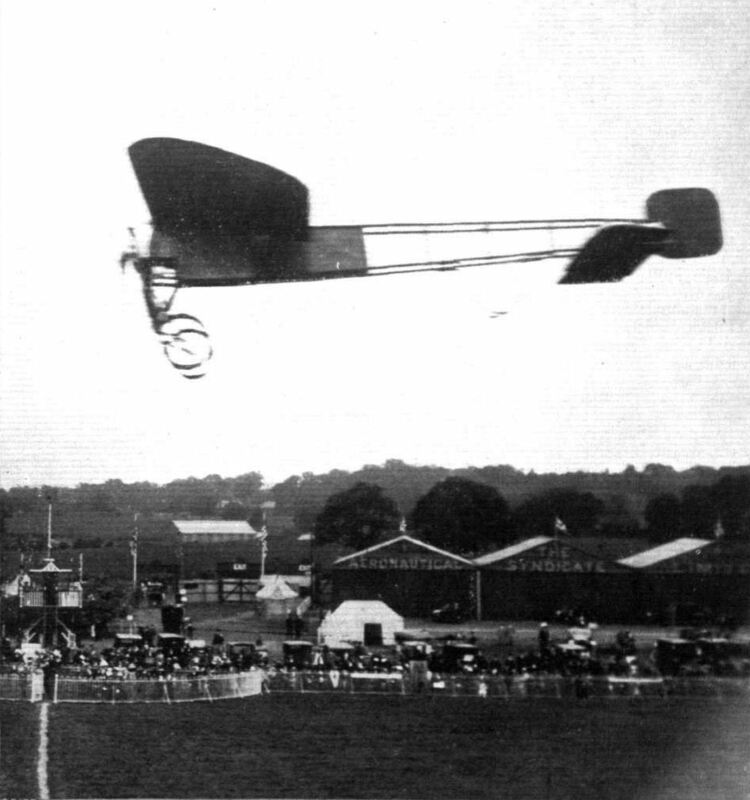 The Vickers monoplane in flight at Brooklands. 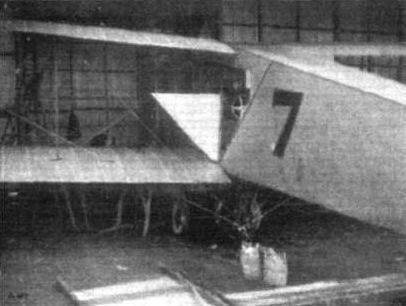 Side view of the Zodiac biplane. 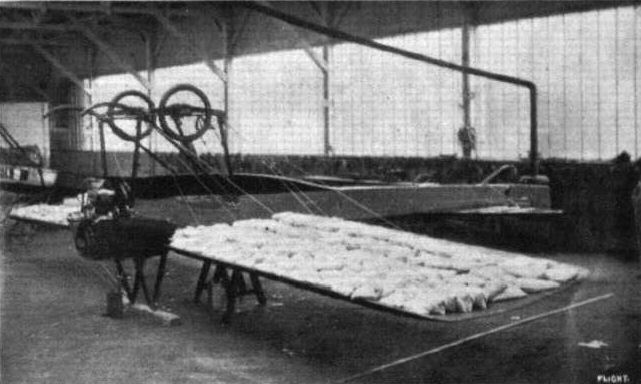 The pilot's seat of the Zodiac biplane, covered in with non-inflammable celluloid to protect the occupant from the rush of wind. 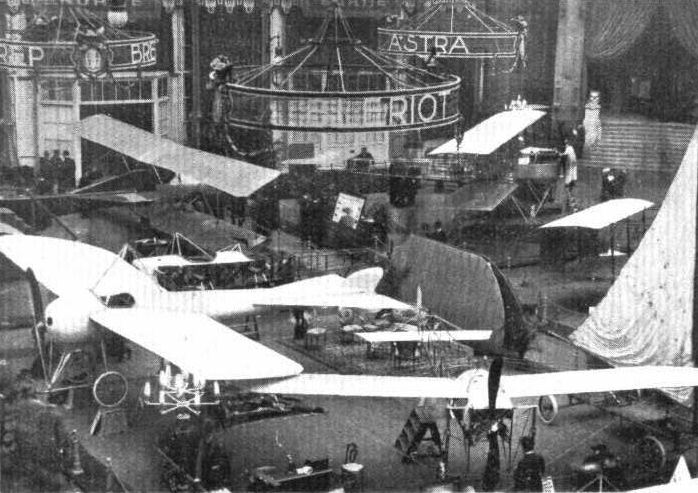 The Bleriot stand at the Paris Aero Salon, showing the extremely neat 50 h.p. Gnome-englned racer in the centre. The clean design of the landing chassis is the chief feature of this machine. Representative stand at the Salon - the Breguet-R.E.P. Mr. Gordon Bell standing in front of one of the R.E.P. monoplanes on which he has been making such splendid flights during the past few weeks over Buc and the surrounding country. 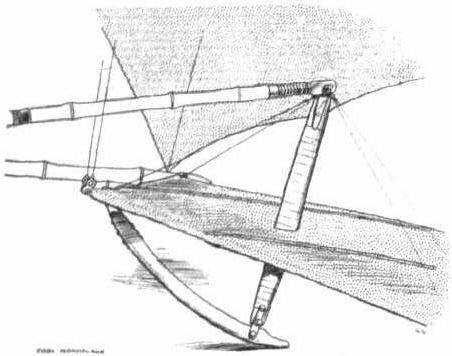 The Flanders monoplane, as seen from the side, giving an idea of the stream-line form of the body. 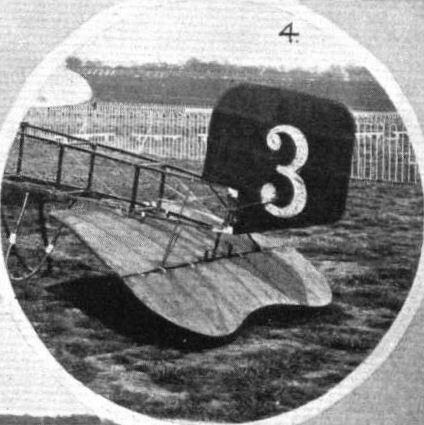 The Flanders F.3 monoplane raced by R. C. Kemp at Brooklands during 1912. 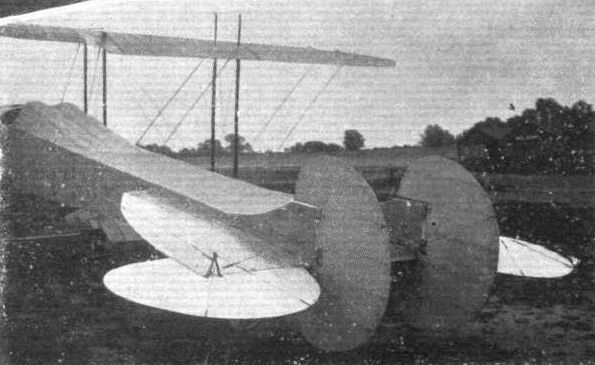 The Flanders monoplane, as seen from behind. 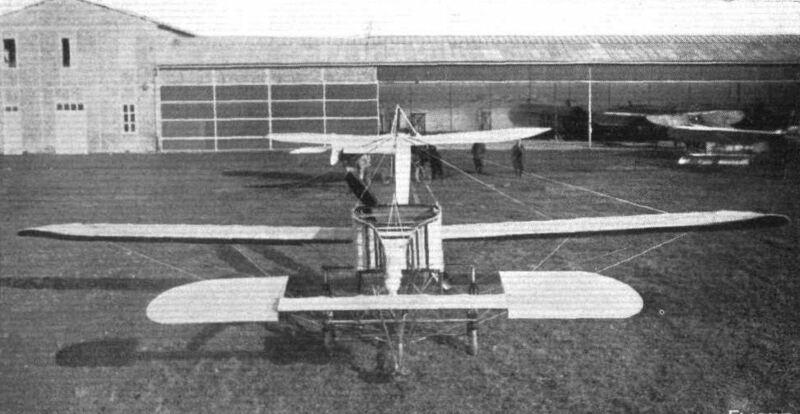 The Flanders monoplane, three-quarter front view. The general arrangement of the landing chassis is clearly seen. 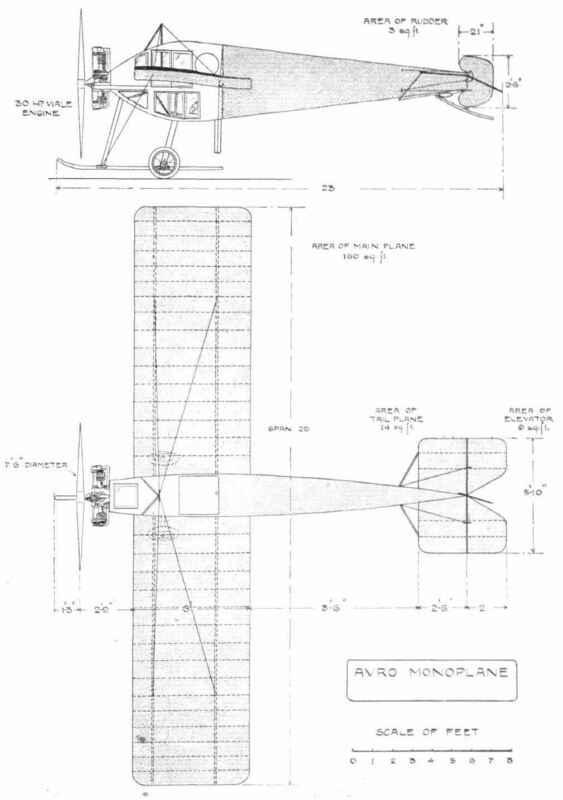 The Flanders monoplane, front view. 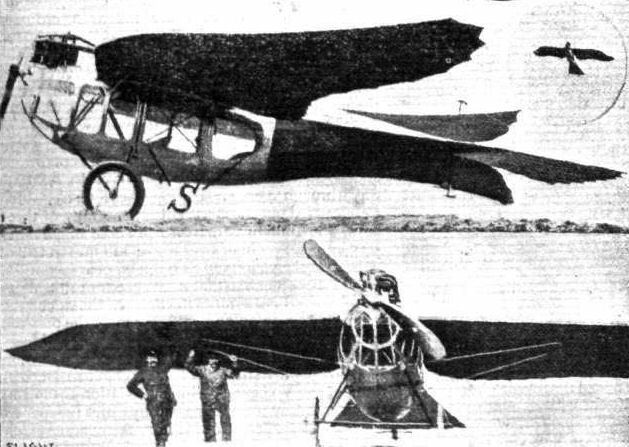 The Flanders Monoplane, showing modifications since reconstruction. Note the silencer to the 60-b.p. Green engine. Also the position of the radiators between the planes and the cabane. 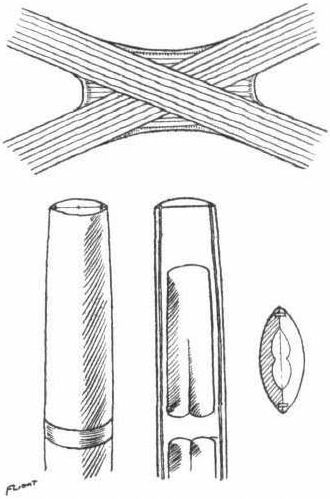 The apparent slenderness of the struts of this is due to their being of stream-line section. A REMINISCENCE. 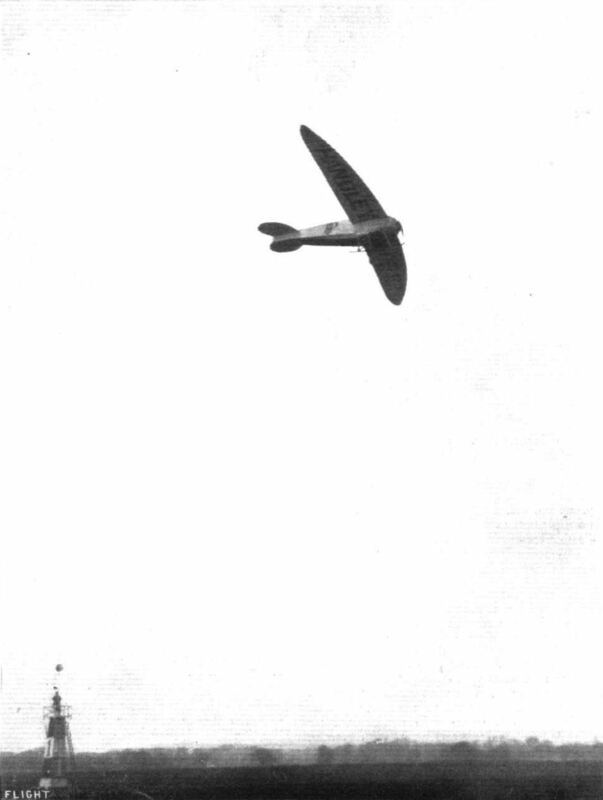 - The Flanders monoplane at Brooklands, as seen from the roof of its hangar. In conversation before it are Mr. E. V. B. Fisher, the pilot in the muffler, and Mr. Dukinfield-Jones. The Green-engined Flanders monoplane getting off smartly with a passenger at Brooklands. 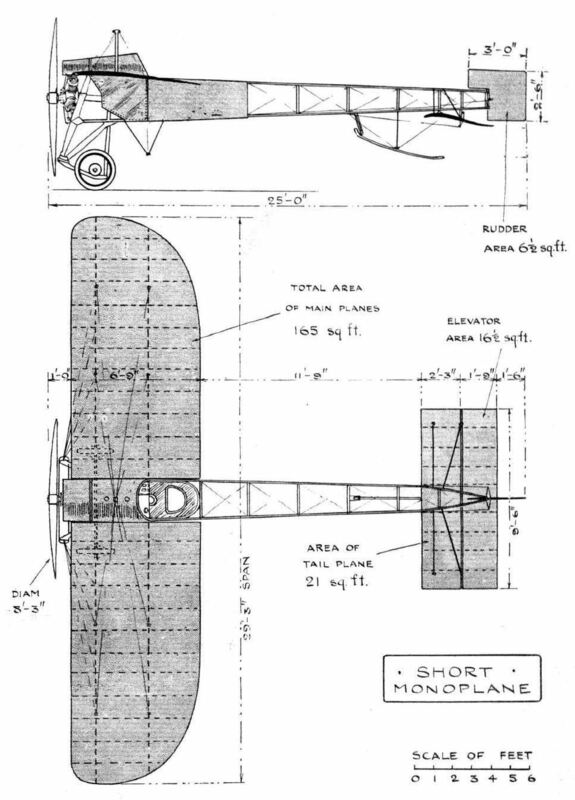 Sketch showing general arrangement of the front section of the Flanders monoplane. 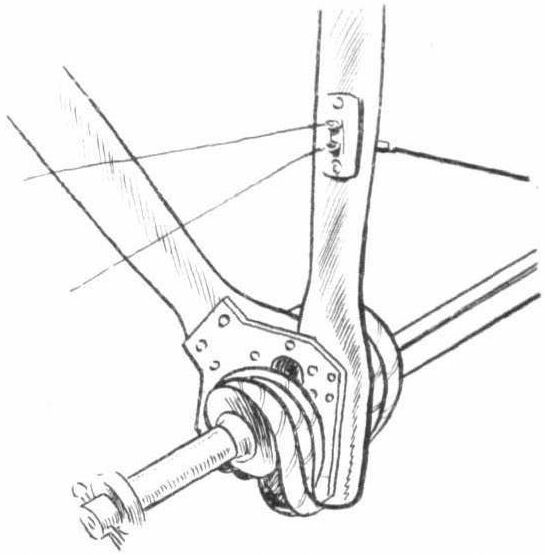 Sketch illustrating the Flanders method of cross bracing. 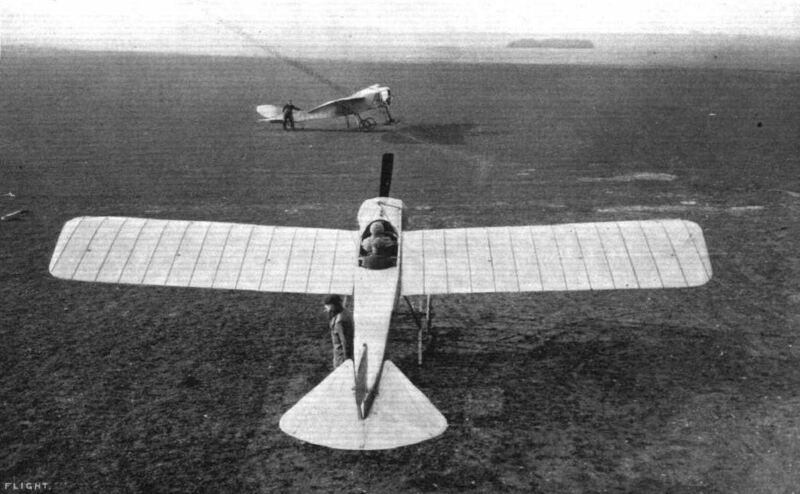 THE FLANDERS MONOPLANE. - Plan and elevation to scale. Lieut. Hynes at Salisbury Plain, just about to start on a Breguet machine in connection with the Army work. Lieut. 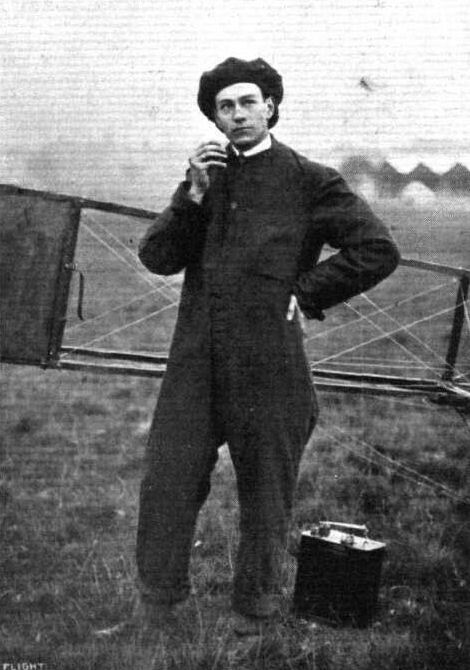 Hynes is, we believe, the first Englishman to fly a Breguet in this country. 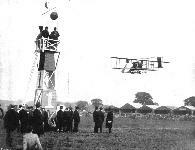 THE ARMY BIPLANE AT FARNBOROUGH. - Capt. Rayleigh in the pilot's seat prior to an early morning trip over the Common. A NEWCOMER AT HENDON AERODROME. - The big Breguet warplane flying under the pilotage of M. Moineau. THE MILITARY COMPETITION MACHINES. The 100-h.p. Breguet biplane that Moineau will probably fly at Salisbury next month. THE MILITARY COMPETITION MACHINES. The front part of the 100-h.p. 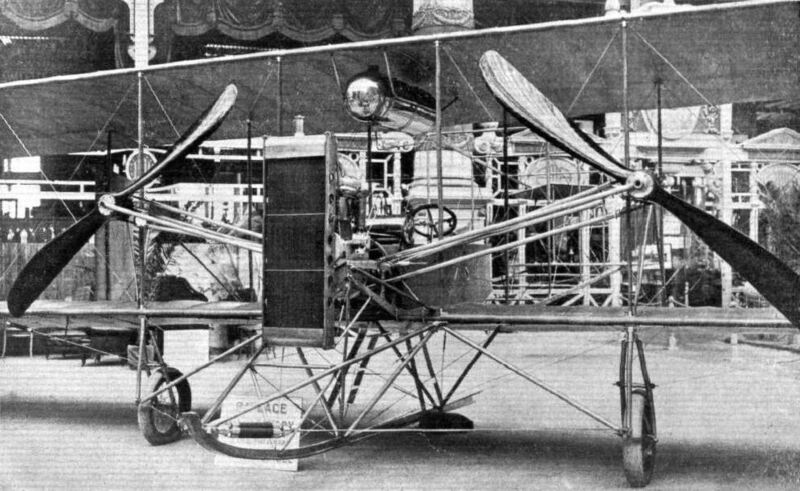 Breguet biplane, showing the engine mounting, the reduction-gear to the 4-bladed propeller, and the landing chassis. THE MILITARY COMPETITION MACHINES. Detailed view of cruciform tail. M. Moineau, the clever pilot who is flying the new Breguet warplane. 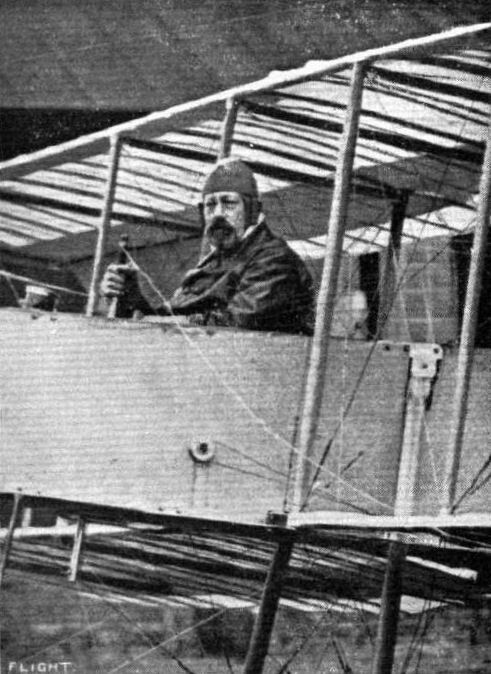 M. Richet, the pilot who was flying the new Breguet at Hendon Aerodrome. 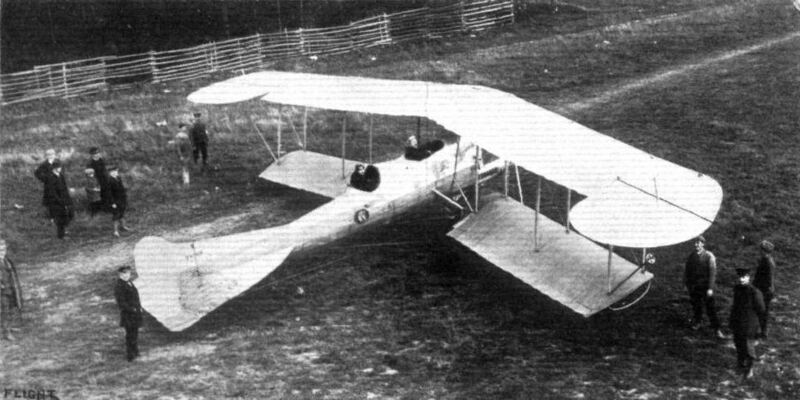 The 110-h.p. British Breguet biplane. 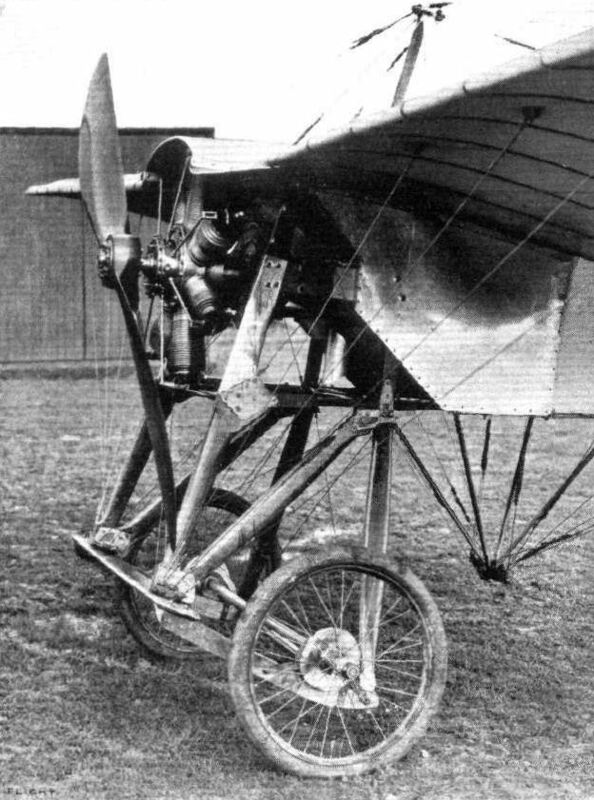 The new form of chassis fitted to the British Breguet biplane. The new form of landing gear that the French Breguet firm are adopting. 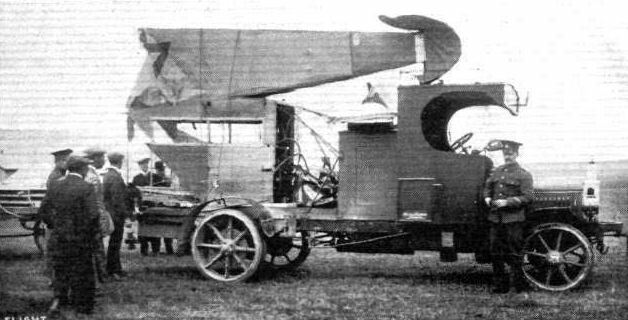 THE AERO TORPEDO OF PAULHAN AND TATIN. - With this monoplane speeds up to 140 klloms. per hour have been obtained. 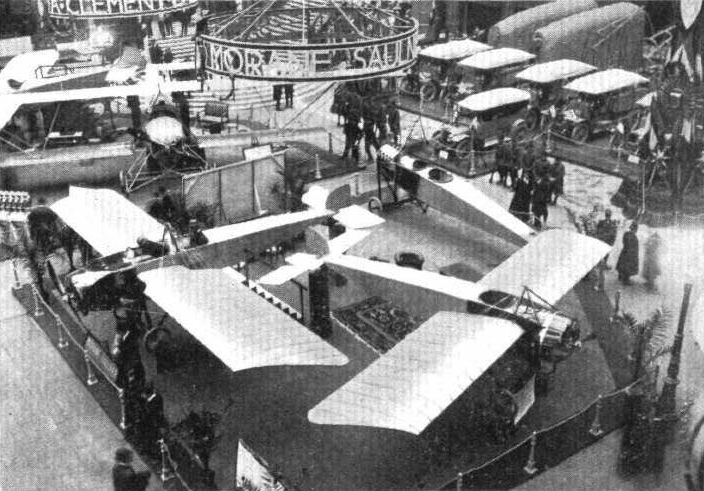 The Paulhan-Tatin monoplane at the Paris Aero Show. 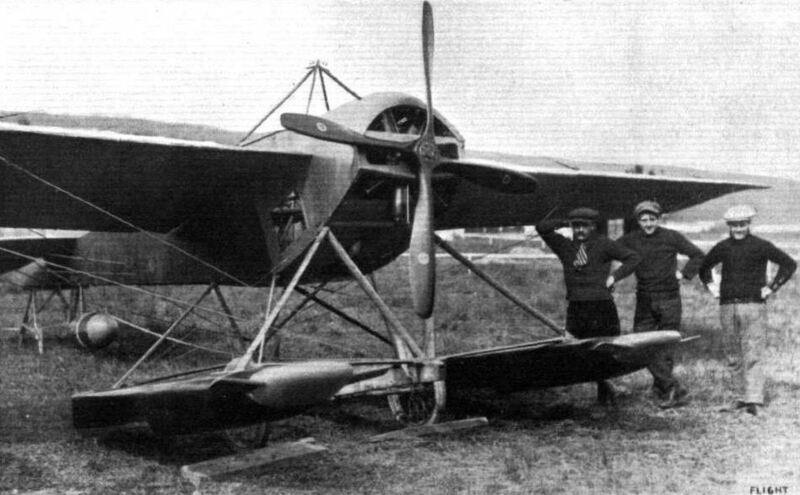 The aero torpedo, the result of the collaboration of Messrs. Victor Tatin and Louis Paulhan. 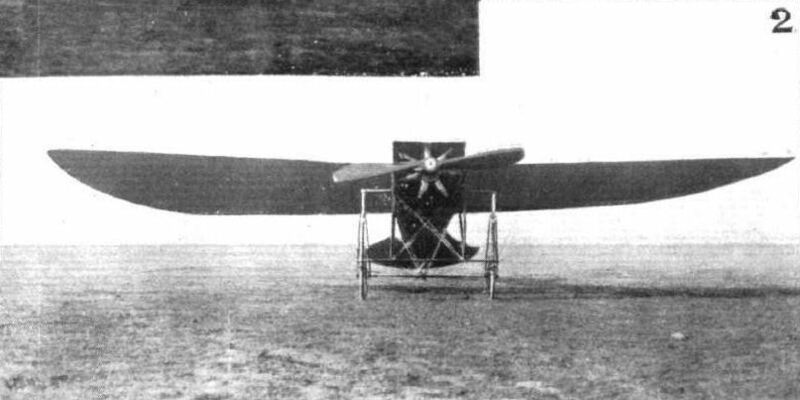 Tail-unit and propeller - Paulhan-Tatin monoplane. 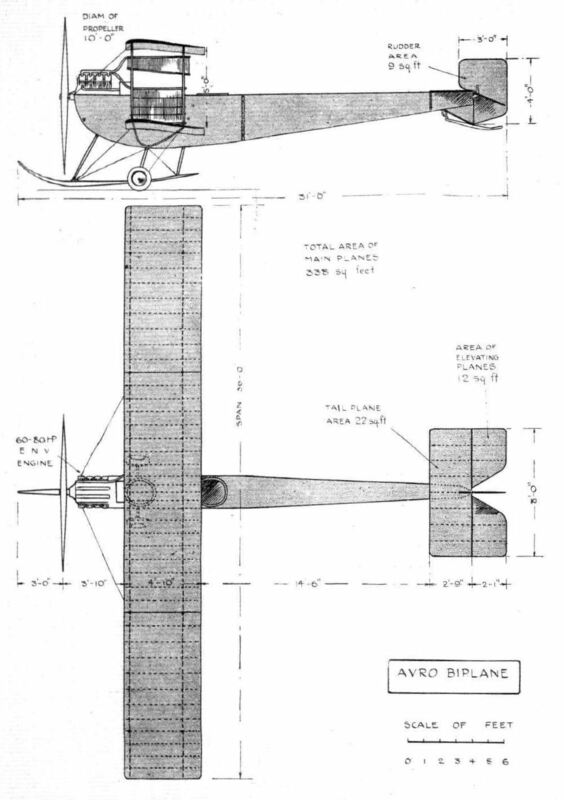 DETAILS OF THE AERO-TORPEDO. 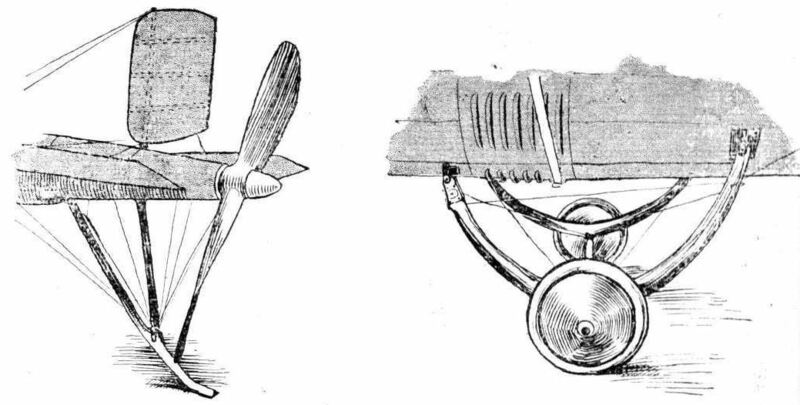 - The sketch on the left shows the arrangement of the tail unit and propeller. 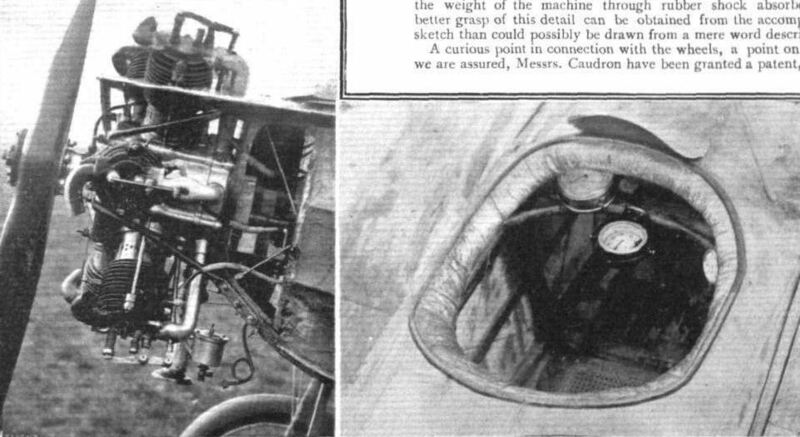 On the right is the landing carriage, showing the disc wheels and the louvred metal shield surrounding the motor. THE PAULHAN-TATIN MONOPLANE. - Plan and elevation to scale. 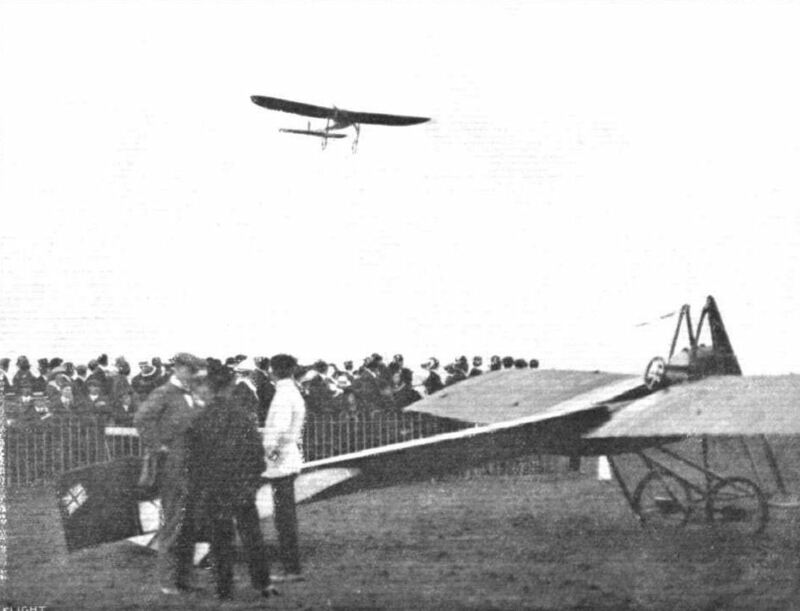 The Bleriot monoplane of M. Garros upon which he won the Anjou Circuit. Competitors ready for the second heat of the Speed Contest at Hendon last Saturday. - Reading from front to back: Messrs. Grahame-Whlte and R. Gates (H. Farman), Sydney Pickles (Caudron), Marcel Desoutter (Bleriot), and Sabelli (Hanriot). Mr. B. C. Hucks getting away for an exhibition flight on Saturday last at Hendon. Gustav Hamel just off on his 50-h.p. Bleriot for his great altitude flight. 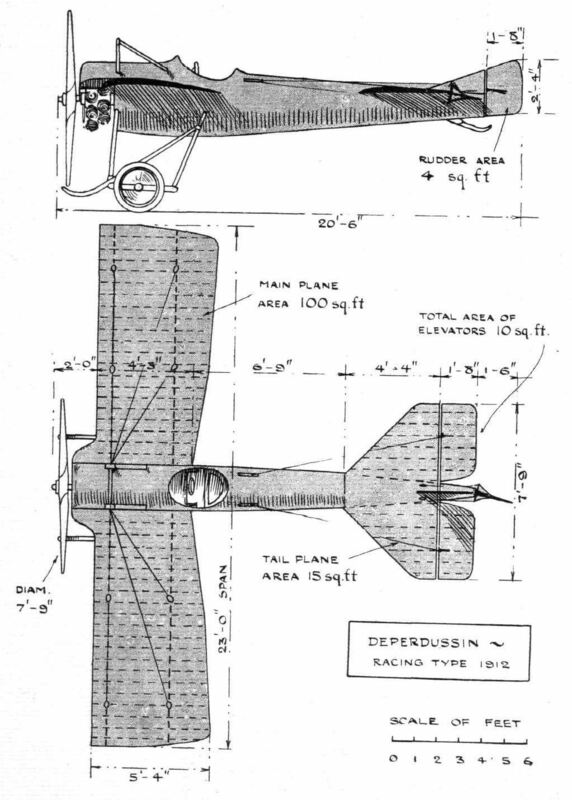 THE DUBLIN-BELFAST AEROPLANE CONTEST. - Mr. H. J. D. Astley getting away on his 70-h.p. 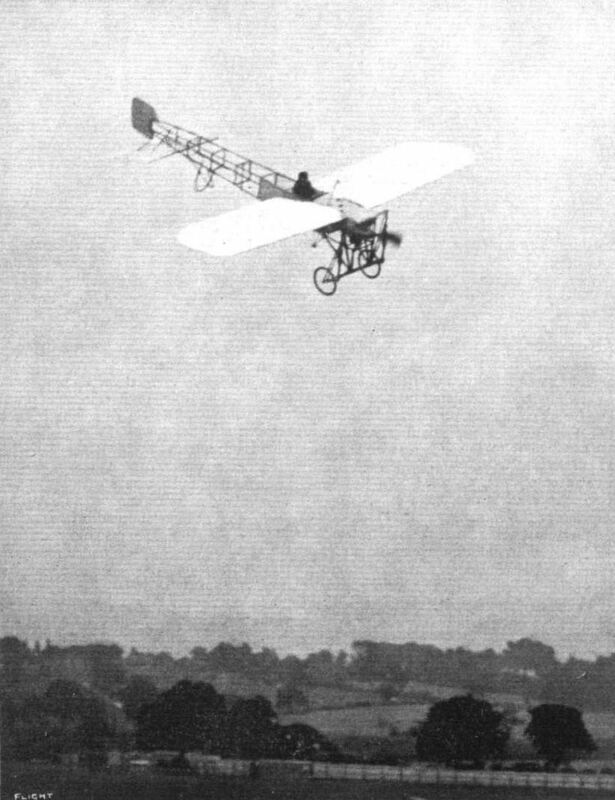 Bleriot from Leopardstown, Dublin. Mr. B. C. Hucks getting off on the Gnome-BIeriot at Hendon on Saturday. Mr. B. C. Hucks in his Bleriot passing the Judges' box on the first circuit in the Hendon cross-country handicap last Saturday week. Mr. B. C. Hucks, on a Gnome-Blerlot, passing before the Judges' box at Hendon on Saturday last. 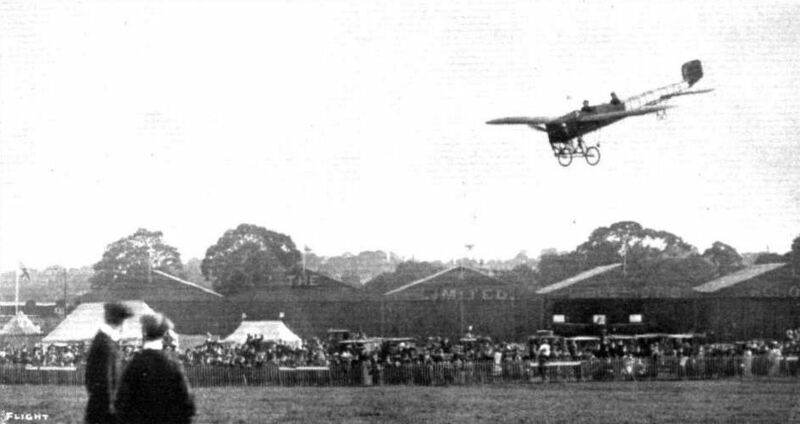 Mrs. Stocks flying on the Bleriot monoplane at Hendon on Ladies' Day, and winning the Daily Mirror prize. 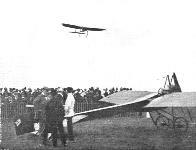 Marcel Desoutter flying at the London Aerodrome, Hendon. In the above picture the single-seater Bleriot appears to be standing on the ground. 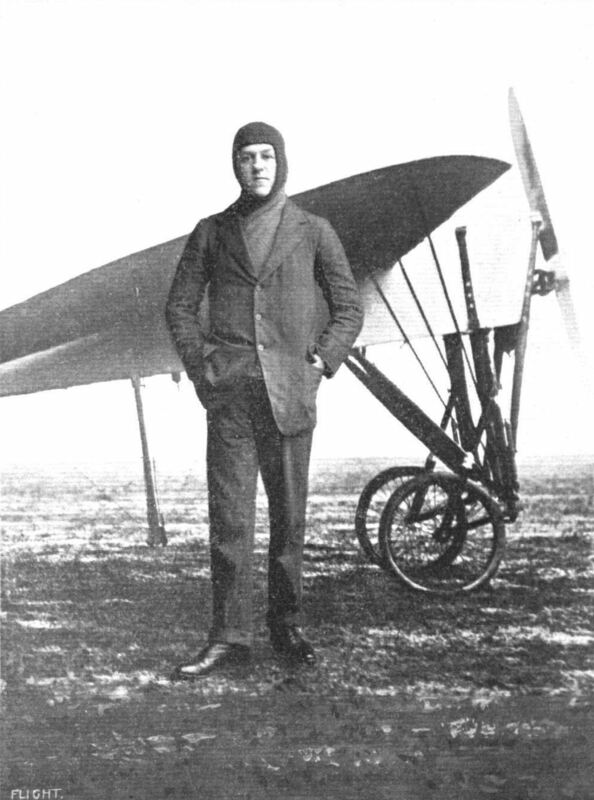 As a fact, it is Mr. Gustav Hamel on his new single-seater flying quite low at a speed of between 50 and 60 miles an hour past No. 1 pylone. Gustav Hamel rounding pylone No. 1 during a race at Hendon Spring Meeting. 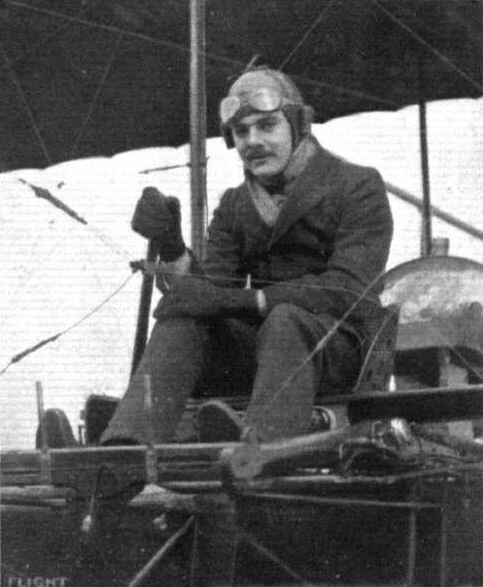 Mr. Gustav Hamel on his Bleriot in the cross-country contest at Hendon last Saturday. 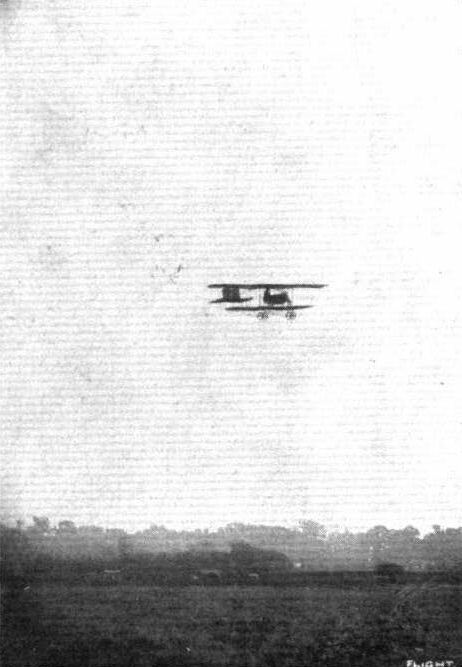 Hamel, on his Bleriot, leaving Epping behind in his flight in the First Aerial Derby, as photographed from the top of Epping Tower. 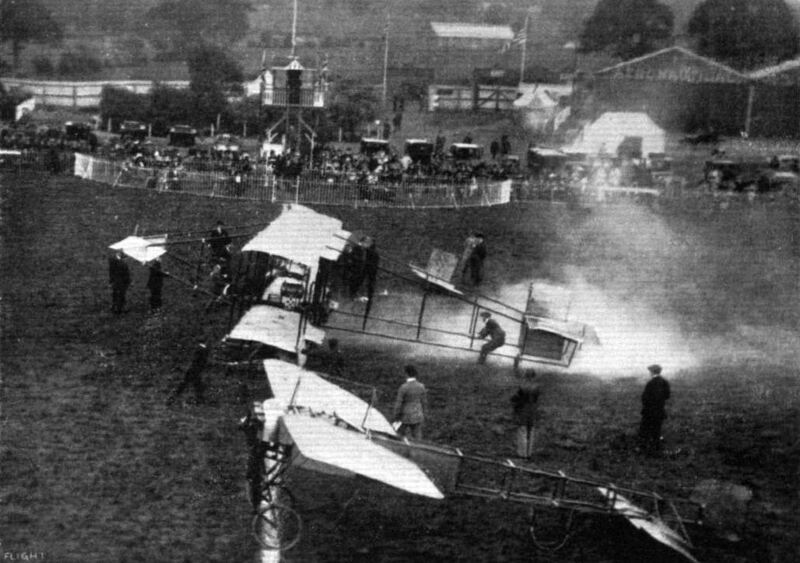 THE FIRST AERIAL DERBY. - At Kempton Park turning point, showing Sopwith's Bleriot passing round the big shaft at Kempton Park which marked the limit of the course. 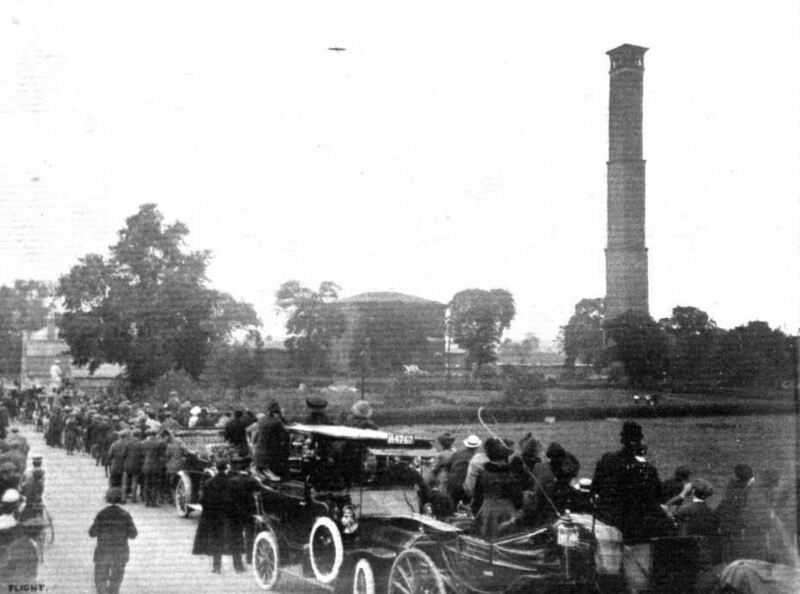 The congestion of traffic with sightseers watching the flyers, as seen in the photograph, was practically the same completely around the entire course. Mr. B. C. Hucks, on his 70-h.p. 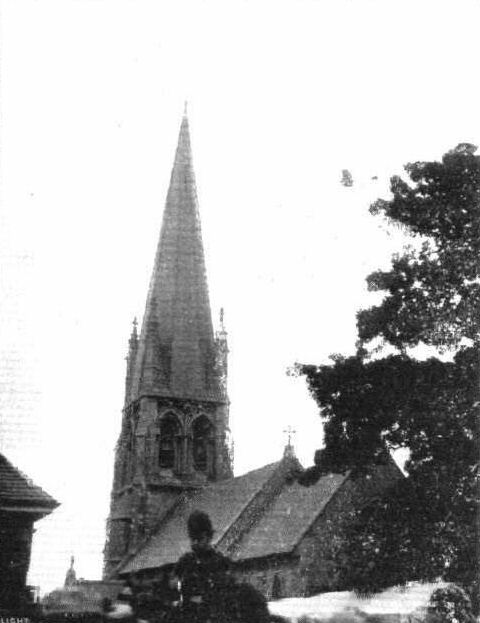 Bleriot, circling round the steeple of Widford Church on Thursday last week, and dropping confetti as Mr. Claude Grahame-White and his bride were leaving the church after the ceremony. 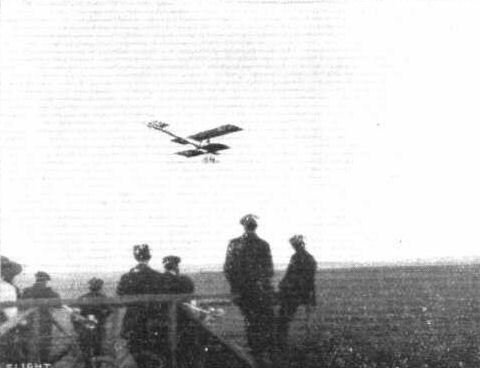 Brighton youths determined to get a good view of Salmet during his flights in his Bleriot monoplane at Brighton recently. During all the visits of the aviators to various places, no point of vantage has ever been left vacant by the watchers of the entertainment. A SUNSET FLYING EPISODE AT HENDON. 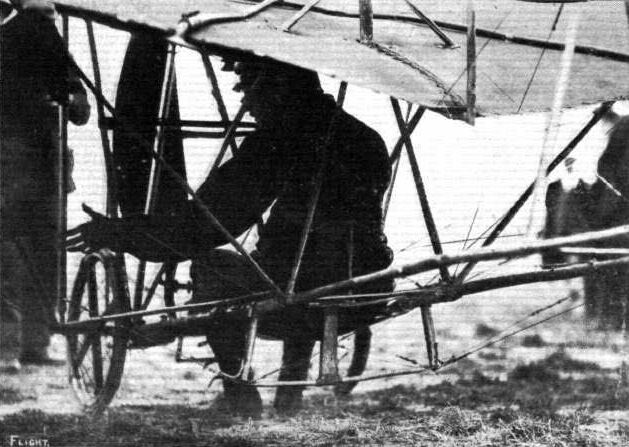 - Hamel on his Bleriot. 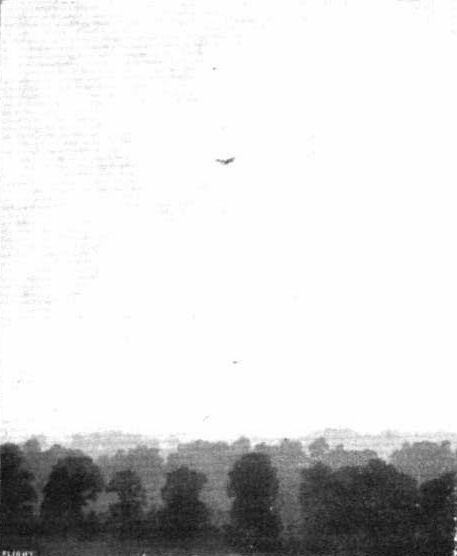 The incident of Mr. Gustav Hamel flying at Hendon Aerodrome round one of the balloons which had just before started from Hurlingham in connection with the Royal Aero Club balloon race for the Hedges Butler cup. This photograph was secured at about two miles distance, and by way of comparison, inset is a contact print from the original negative, the enlargement being untouched. 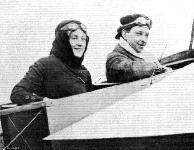 The return en vol plane to the Hendon aerodrome by Mr. Hamel and Miss Trehawke Davies, after winning the Altitude Competition at the Whitsun Meeting. 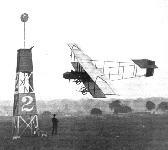 Mr. Gustav Hamel executing one of his very impressive vol planes at Hendon. MR GUSTAV HAMEL BACK AGAIN AT HENDON. 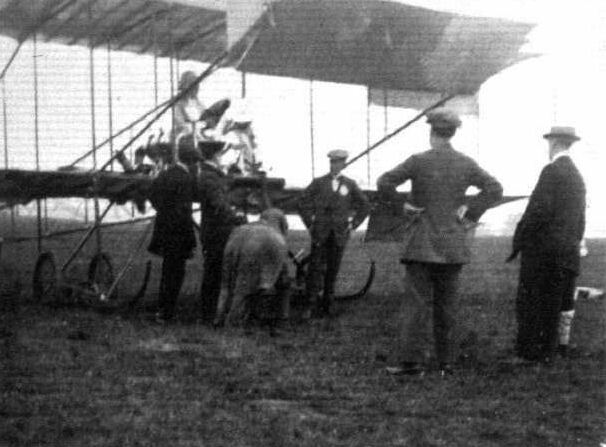 - In our picture he is seen on his Bleriot executing one of his halr-raising corkscrew vol planes at last Saturday's meeting at the London Aetodrome. Mr. H. J. D. Astley finishing a straight vol plane from a height of about 2,000 ft. at Hendon on Saturday last. 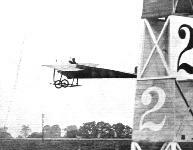 Mr. B. C. Hucks, on his Blerlot, landing after making an altitude record for this year of 6,850 ft. at Hendon Aerodrome. THE KING AND AVIATION. - Mr. Gustav Hamel and Capt. Mark Kerr, R.N., immediately after their arrival at Ranelagh last week, when Mr. Hamel flew before the King and Queen. 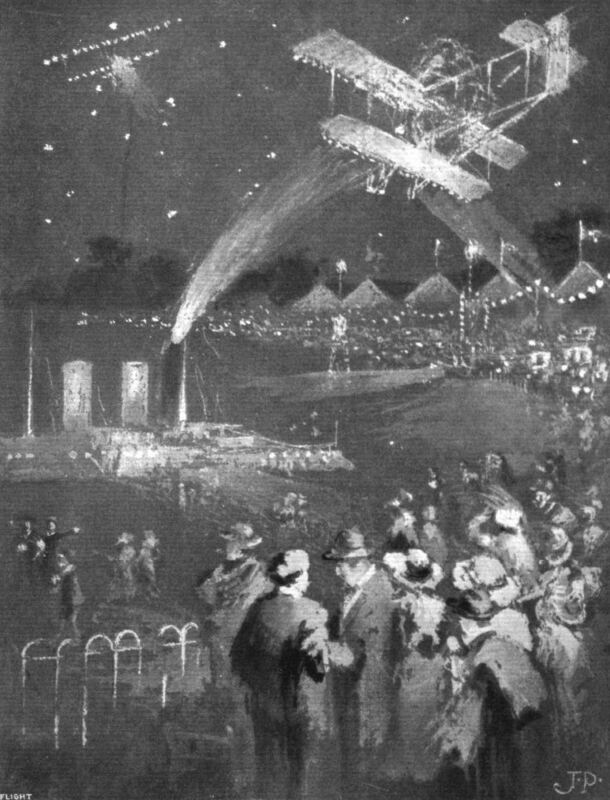 Mr. Hamel and his passenger are seen, before actually alighting from the machine - a Bleriot - in which they flew over from Hendon, using it as a "dressing room" by shedding their flying rig in favour of more suitable attire for the occasion. 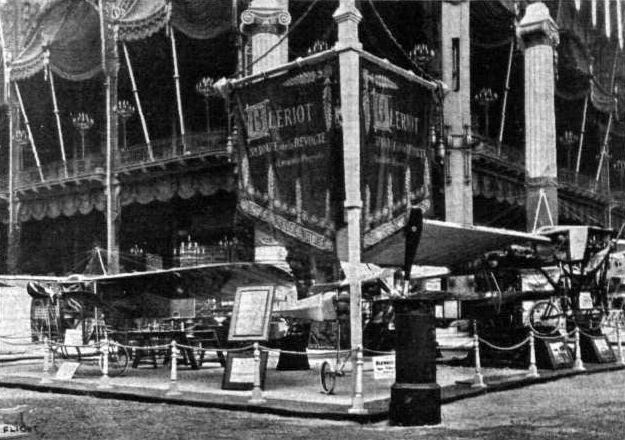 Representative stand at the Salon - the Bleriot. 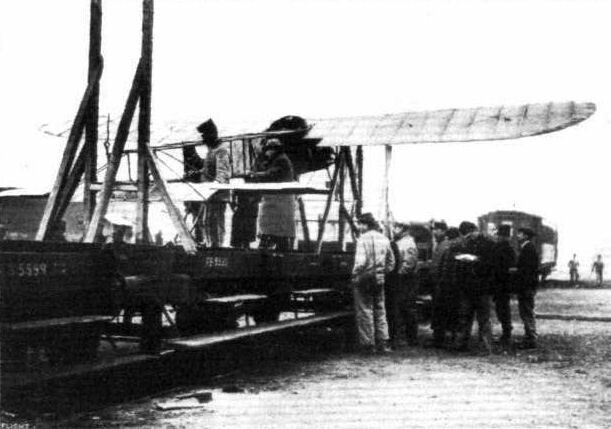 A military aeroplane dismantled ready for transportation in tne special aviation wagon which has been constructed for military manoeuvres in France. This wagon, immediately the aeroplane is safely housed, is in a few minutes attached to a fore-carriage, and is then ready to be hauled anywhere by the horses. THE RECORD NON-STOP HENDON TO PARIS FLIGHT OF MR. SALMET. 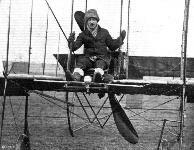 - Mr. Salmet, on his Bleriot monoplane, at the moment of being released at Issy grounds, for the return journey to London, after his remarkable flight from Hendon in a little over three hours. SALMET'S PARIS FLIGHT. - On the left his Bleriot monoplane pegged down for the night at Berck Plage, near Dieppe. 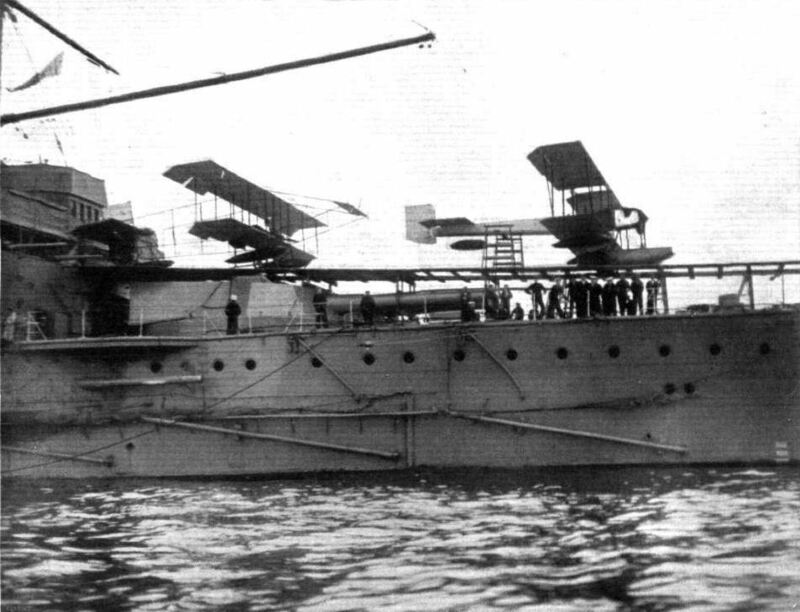 Note the cut-away wings, the covered-in fuselage forming a float, and the Entente Cordiale emblem on the rudder. On the right is seen the moment of his start from Berck Plage the following morning. 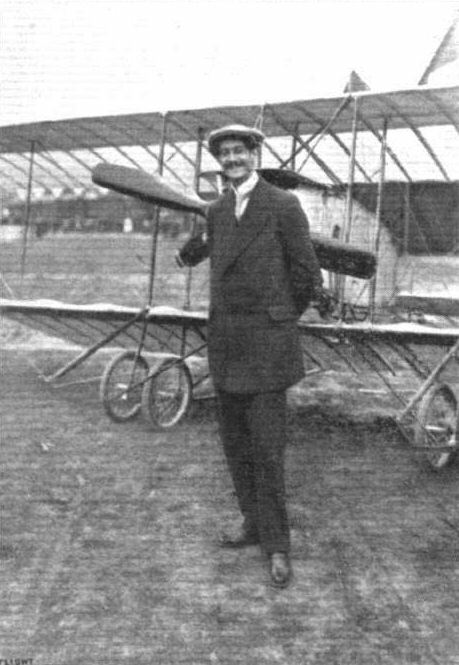 MR. HENRI SALMET, The chief instructor of the Bleriot School at Hendon, who made the record nonstop flight from Hendon to Paris on March 7th on a 50-h.p. Gnome-engined Bleriot monoplane, his time being 3 hrs. 16 mins. Mr. H . J. D. Astley, one of our finest English aviators, who has recently been again flying so splendidly. Mr. Robert Slack, the I.C.S. 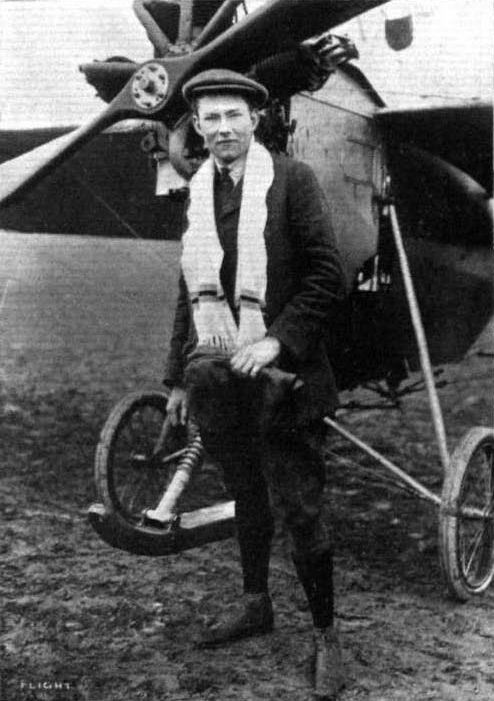 pilot, in front of his Bleriot machine, upon which he on Sunday completed at Hendon his 1,000 miles tour through the Midlands. 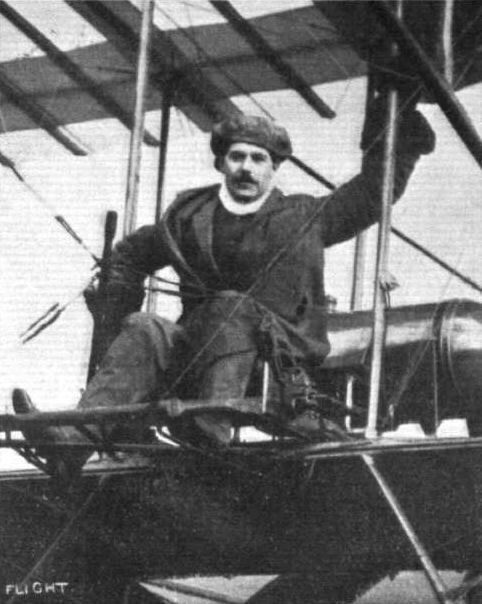 M. Marcel Desoutter, one of the crack flyers at the London Aerodrome, Hendon. Mr. J. L. Hall, who is putting in such good work on his Bleriot at Hendon, and who has just obtained his pilot certificate at the Bleriot School. THE MILITARY COMPETITION MACHINES. - One of the actual Bleriots that will take part int he trials. THE MILITARY COMPETITION MACHINES. - Three-quarter rear view of Hamel's 70-h.p. 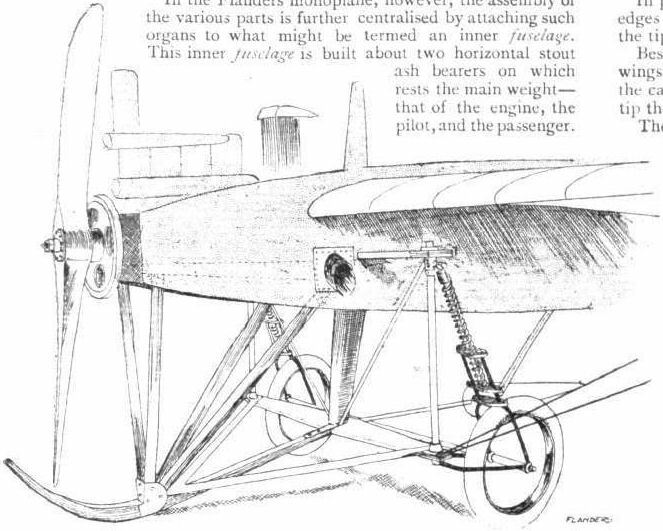 2-seater Bleriot, an almost identical machine. THE MILITARY COMPETITION MACHINES. - The machine as seen from in front. THE MILITARY COMPETITION MACHINES. - Detailed view of the chassis and front section of the machine. THE MILITARY COMPETITION MACHINES. - The tail. 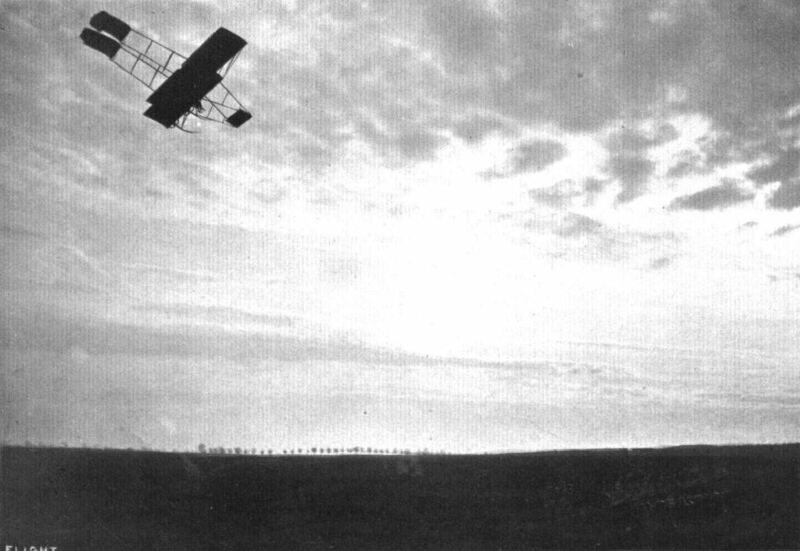 The Bleriot under test, seen from in front. 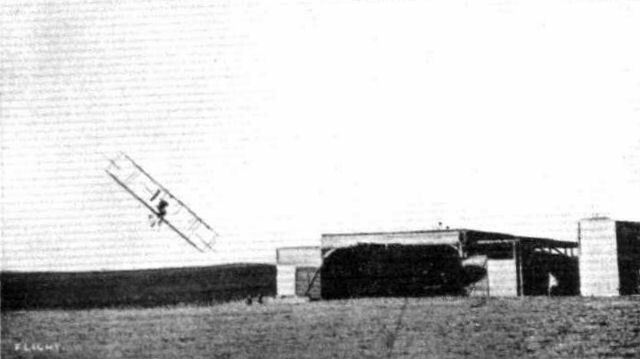 The Bleriot under test, on the railway. THE MILITARY AVIATION TESTS. - Assembling machines under observation. 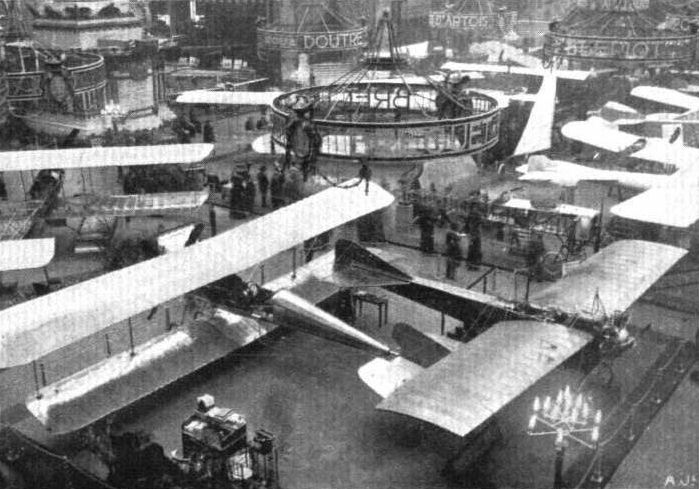 One of the Bleriot monoplanes being put together. WEIGHTING THE MACHINES IN THE ARMY TESTS. - The aeroplane undergoing the operation is No. 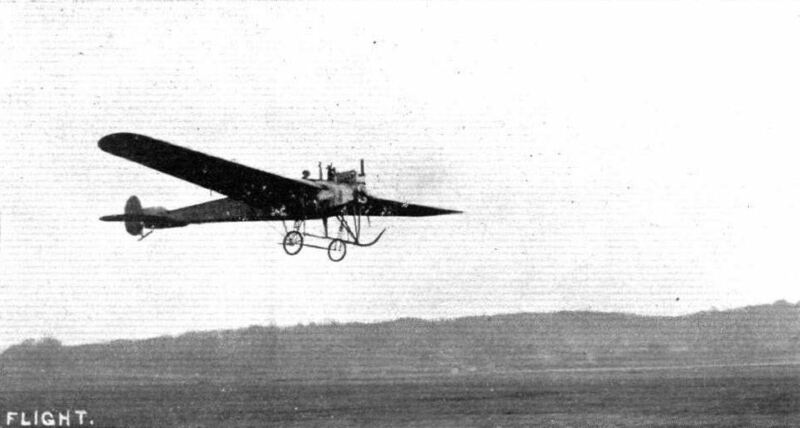 4, a Bleriot. View of the controls on Ovington's Bleriot monoplane. 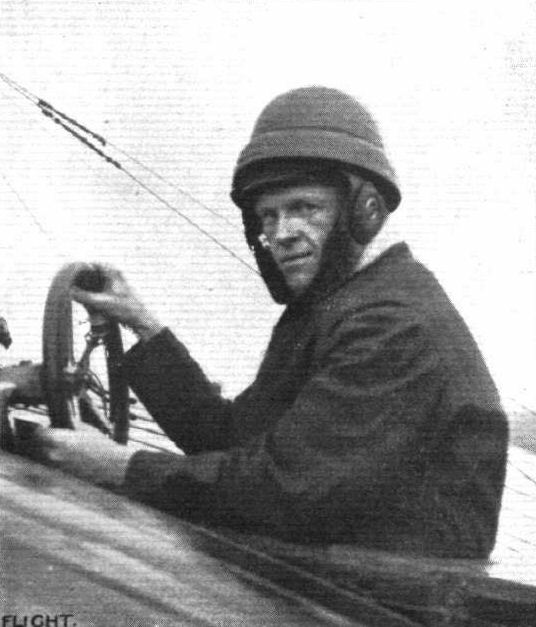 Mr. Gustav Hamel at the wheel of his 70-h.p. 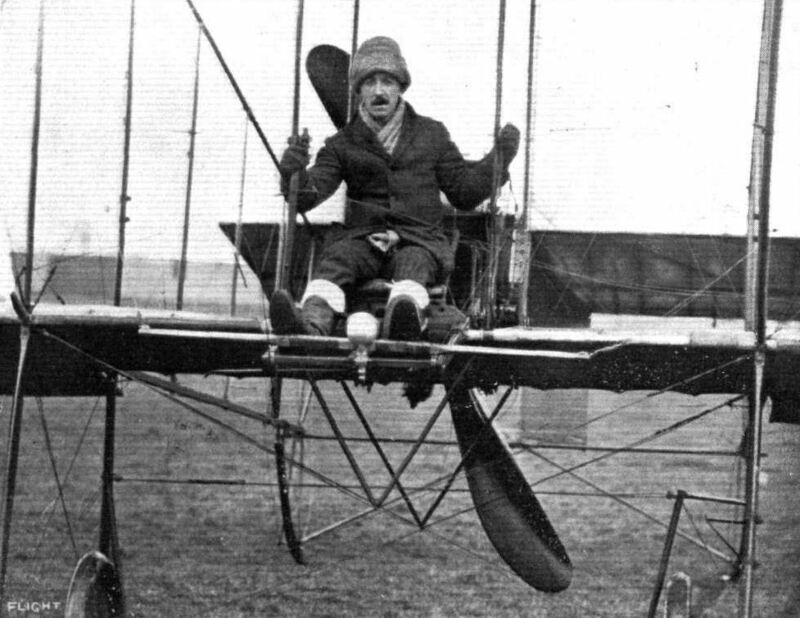 Bleriot with which he made his splendid altitude flight at Hendon. Inset Mr. Hamel is seen during one of his fine bankings. Mr. Hamel preparing for his altitude flight on the Blerlot at the Hendon Whitsun Meeting by donning his new leather overalls and replenishing his tank. 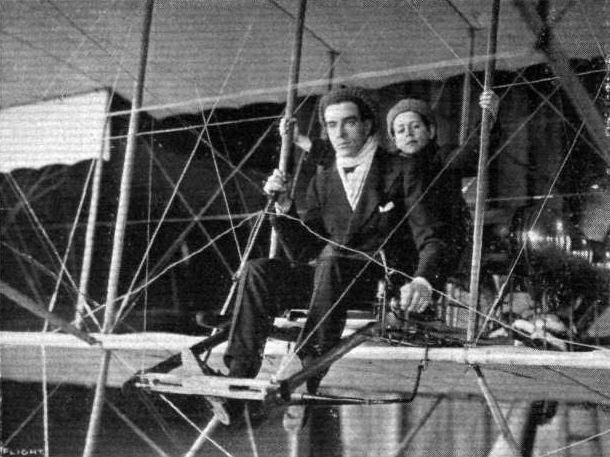 Mr. Hamel and Miss Trehawke Davies in the two-seater Bleriot at the Hendon Meeting, ready for the Altitude Competition. Standing on the left is Mr. N. Chereau, the British chief of Bleriots. 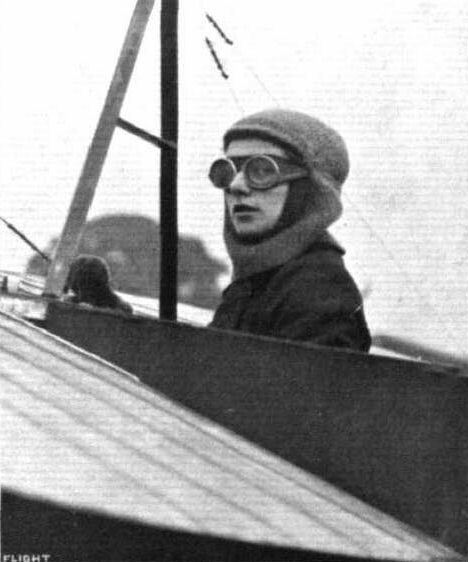 Miss Trehawke Davies, who has done so much crosscountry flying with Mr. Hamel, crossing the flying ground at Hendon at the Whitsun Meeting for Mr. Hamel's flight in the Altitude Competition. 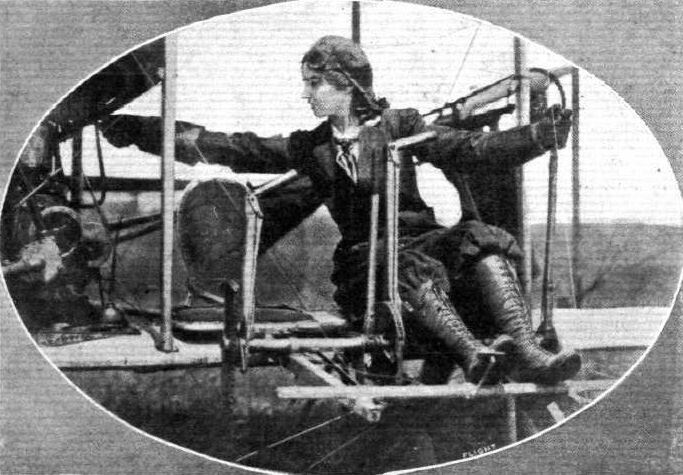 On the right, Miss Davies is in the passenger's seat of the Bleriot. SOME OF THE HENDON PILOTS. - At the top Mr. T. O. M. Sopwith and Mr. Sasscon on Mr. Sopwith's 70-h.p. 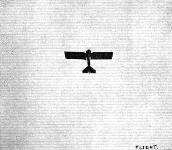 Bleriot. 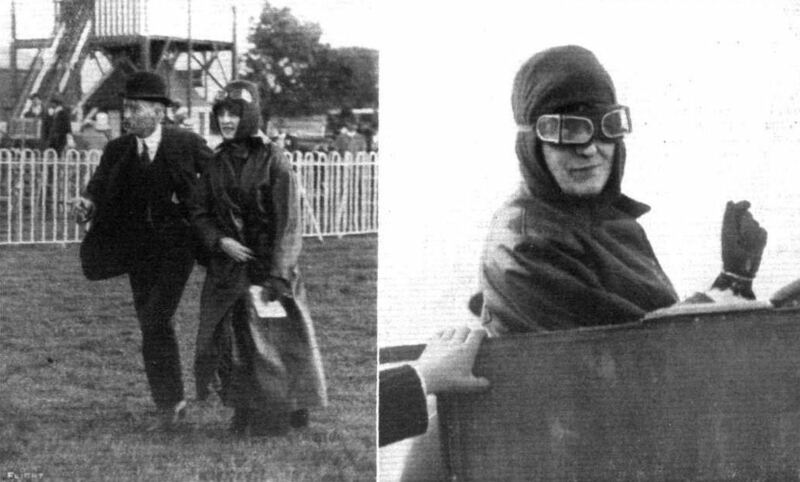 Mr. T. O. M. Sopwith, the winner of the flying handicap on Sunday from Brookiands to Chertsey Bridge and back, with his lady passenger who accompanied him. Mr. Vivian Hewitt and his Bleriot monoplane on the shore at Foryd, North Wales, where he has been making his fine flights for the past few months. 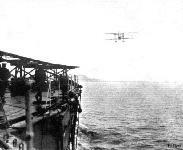 Mr. Hewitt, at the time of writing, is waiting in the hope of flying the lrish Channel. 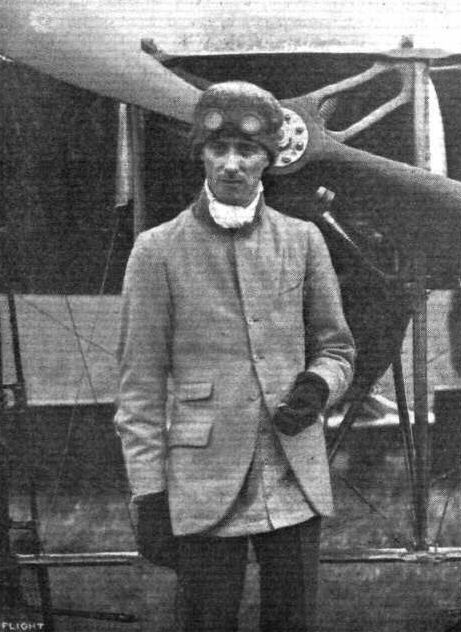 Mr. D. L. Allen, the aviator who has been missing since last week, when he started upon his attempt to fly the Irish Channel. Mr Allen, on his Bleriot, tuning up at Hendon last week before hts start for the Irish Channel flight, which has ended so mysteriously. 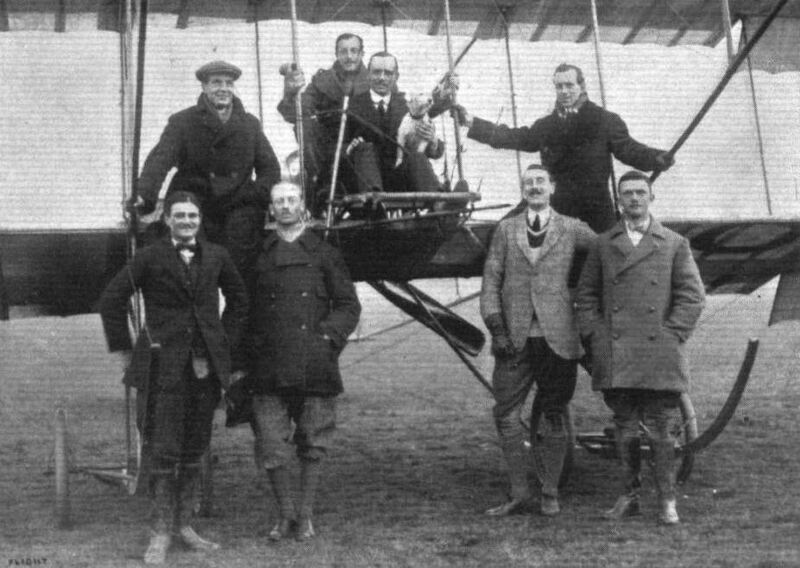 A snapshot of Hucks and his passenger, Mr. Harold Barlow, seated to the right, taken on Monday morning of last week just before they set out from Issy to fly to London on their new two-seater Bleriot. Mr. B. C. Hucks and Mrs. Craig off for a flight at Hendon on the former's fast Bleriot. Miss Bernetta Miller, an American aviatress, who has been flying a monoplane in America recently. 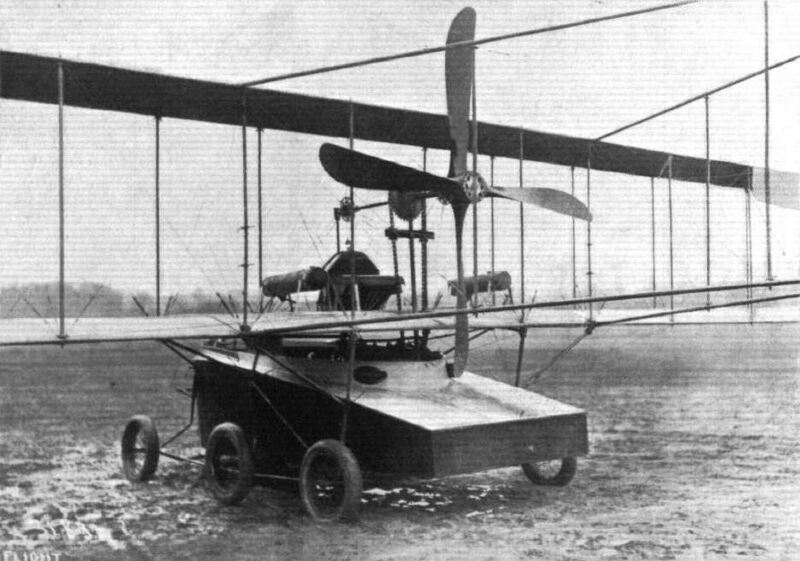 Landing chassis and tall skid of Mr. Hucks' Bleriot, with which he has been making the Daily Mail flights so successfully. The New Bleriot Chassis. - The fitting to which the front wing spars are stayed. 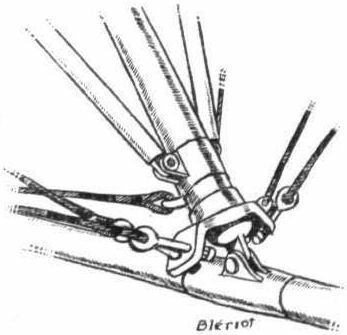 A detail of the Bleriot military monoplane, showing the means whereby, using a special lever, the shock-absorbers can be disconnected, allowing the machine to be lowered on to its knees, as it were. A couple of new pilots on the Dunne biplane at the Royal Aero Club's Eastchurch flying grounds. On the left M. Montmain, and on the right Mr. Perceval. Capt. 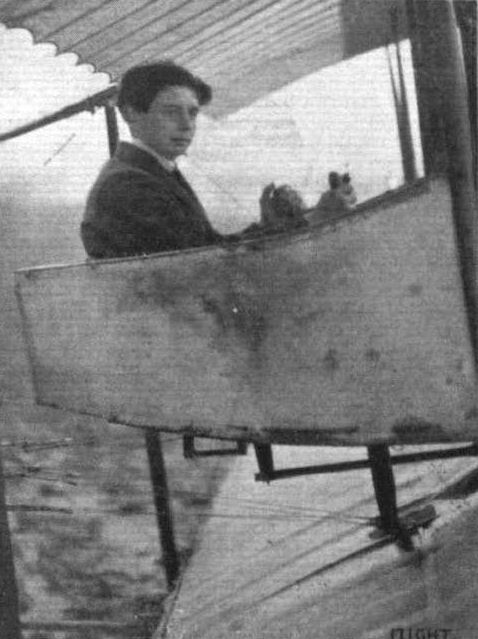 Carden practising for his brevet on the Dunne biplane. C. Compton-Paterson's humorous "re-construction" of his mishap at Green Point track. MR. GRAHAM GILMOUR'S FATAL ACCIDENT. 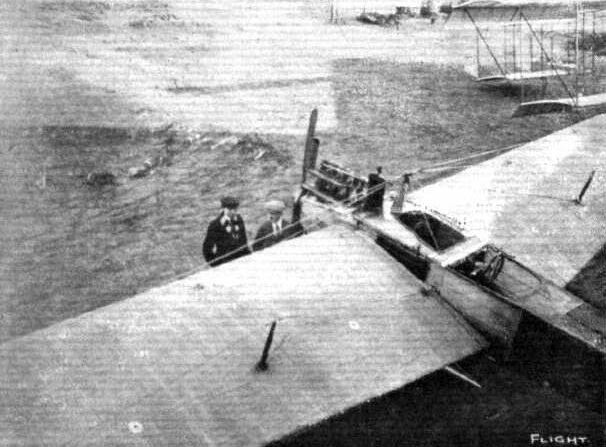 - General view of the monoplane after the disaster. 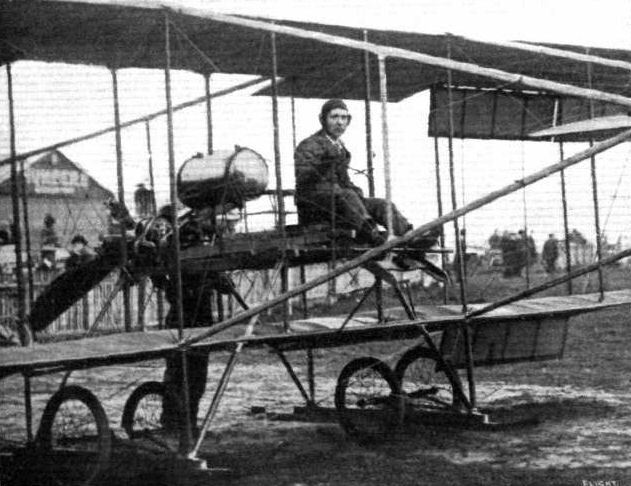 The Albatross engine-in-front type biplane. 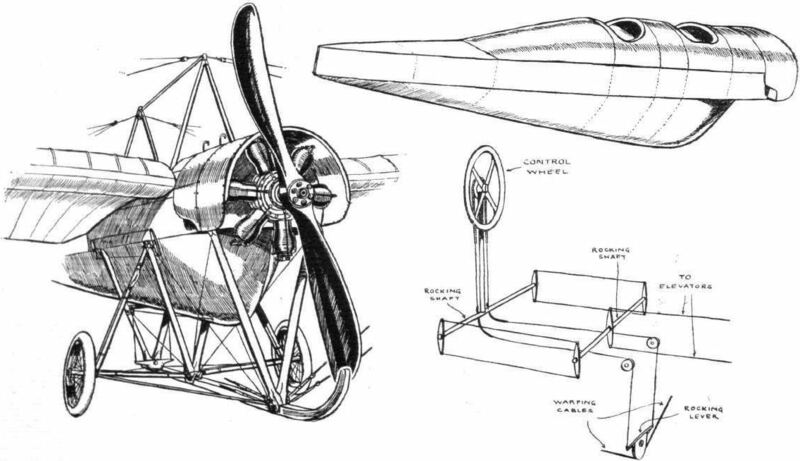 Three sketches showing the latest developments of the Albatross "Arrowplane," one of the foremost German biplanes. 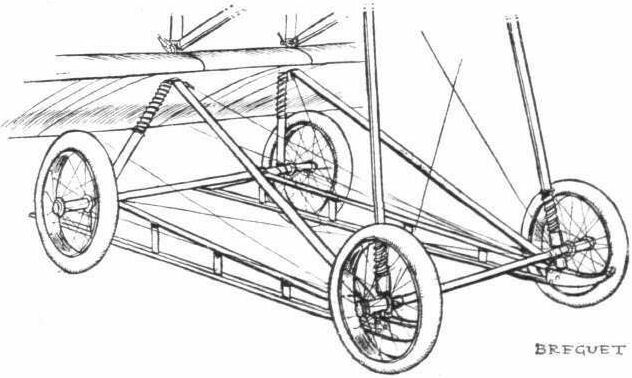 The chassis and triangular system of struts remains the same as on the machine exhibited at the Paris Salon in 1911, but the planes now have a flattened V form, with ailerons, instead of being of the Etrich type. 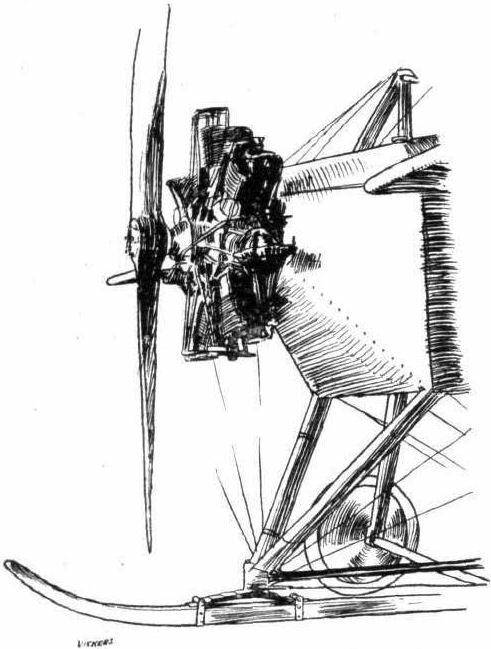 Sketch showing flexible attachment of skids by means of laminated steel springs, and landing-brake on the Albatross biplane. THE MILITARY COMPETITION MACHINES. 1 and 2. 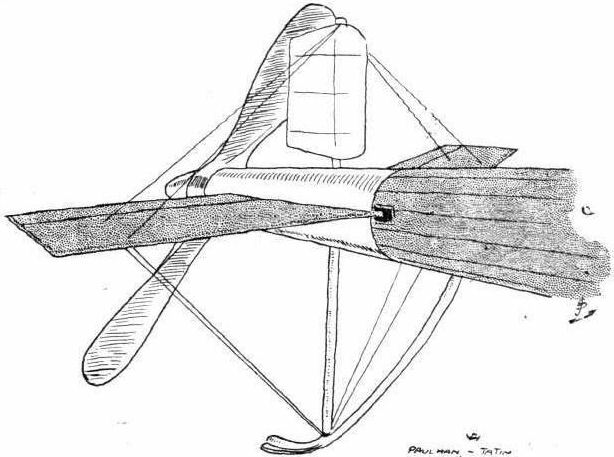 How the military Bleriot two-seater monoplane (Type XXI) appears from the side and from the front. THE MILITARY COMPETITION MACHINES. 3. Details of the landing gear. THE MILITARY COMPETITION MACHINES. 4. 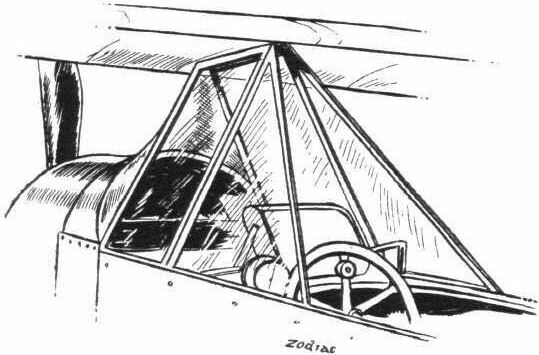 The interior of the cockpit showing the typical cloche which is used for controlling. Fig. 3. 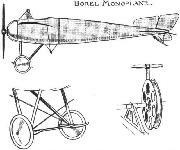 - Bleriot Monoplane. 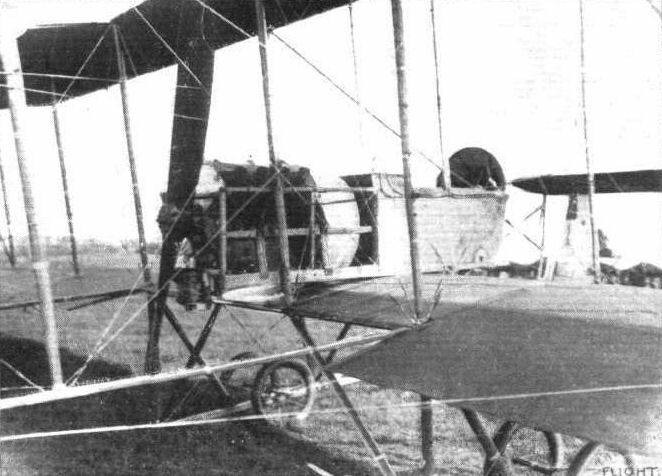 Side view of the Caudron biplane. 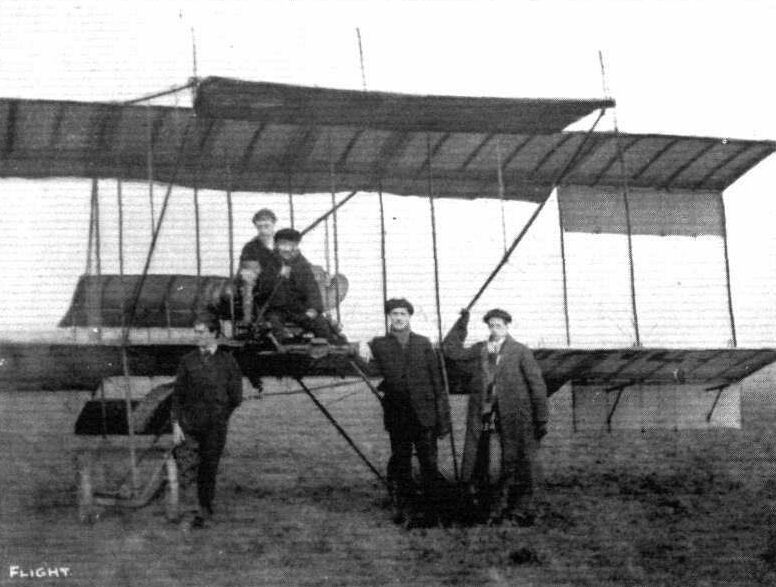 Front view of the Caudron biplane. 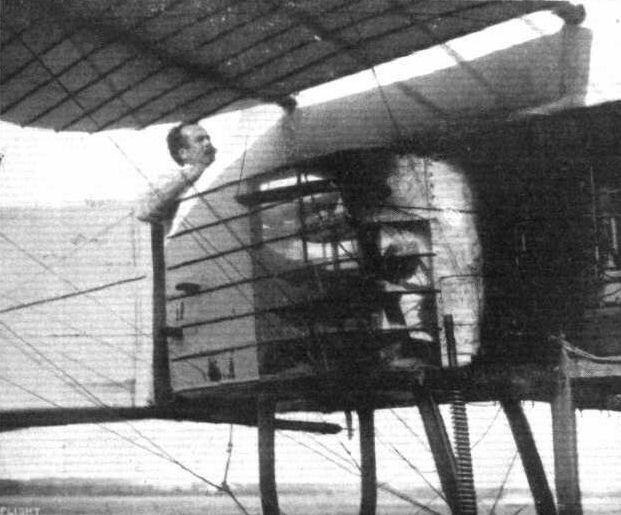 Rear view of the Caudron biplane. 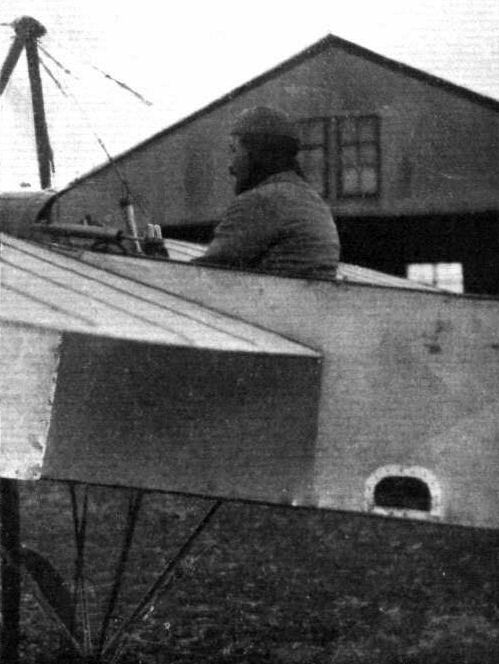 General view from in front of the Caudron biplane. 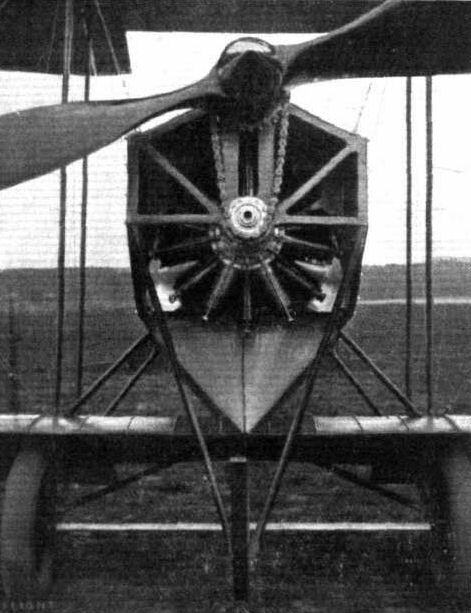 The body and undercarriage of the Caudron biplane. 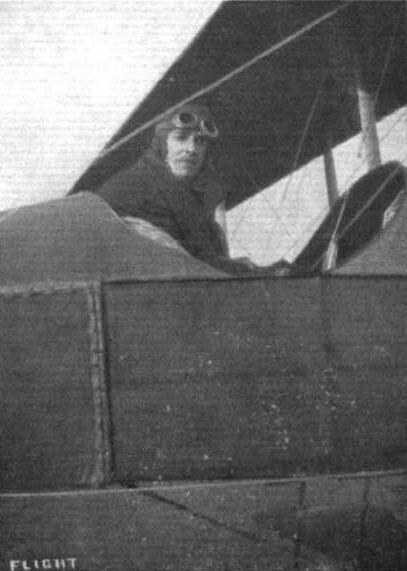 W. H. Ewen, "the Flying Scot," who is flying in the North in connection with the educative tour of the Daily Mail, in the pilot's seat of his new Caudron biplane. It was this same machine on which Gulilaux flew over from Paris on Saturday, with Mr. A. M. Ramsay as passenger. 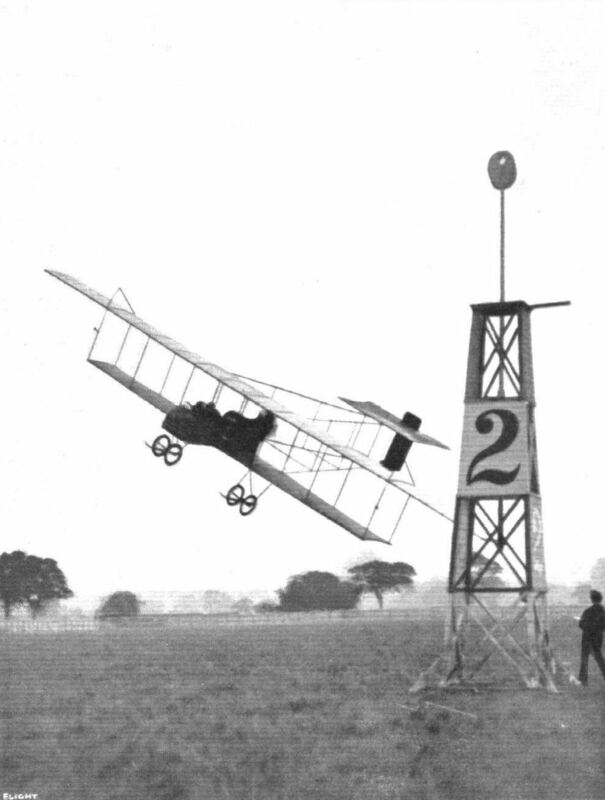 A fine banked turn by Mr. Sydney Pickles on the Caudron biplane at the Hendon aerodrome. W. H. Ewen on the little Caudron at the Hendon Meeting. 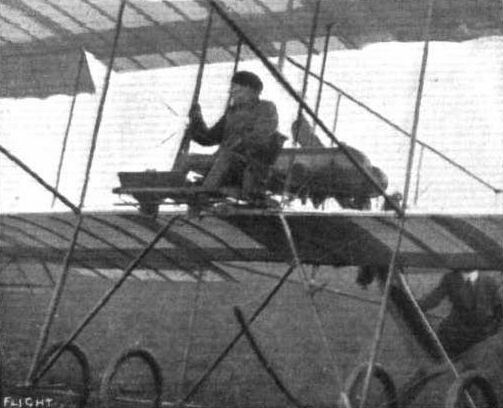 Not a new form of weathercock, but Ewen, on his Caudron, passing behind pylone No. 2 at the First Spring Meeting at the London Aerodrome on Saturday last. 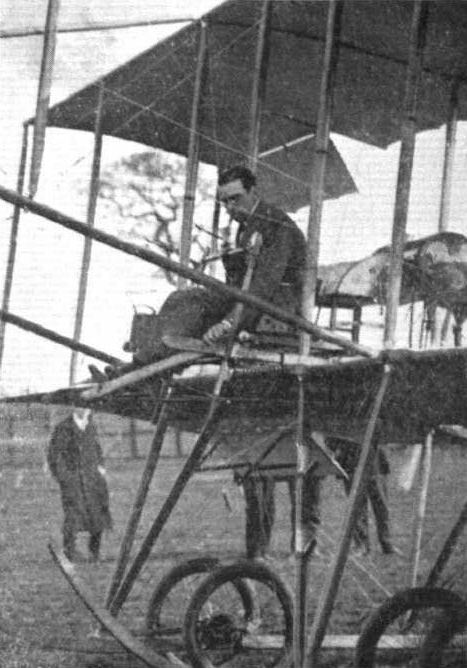 Dr. D. Edmund Stodart flying the 35-h.p. 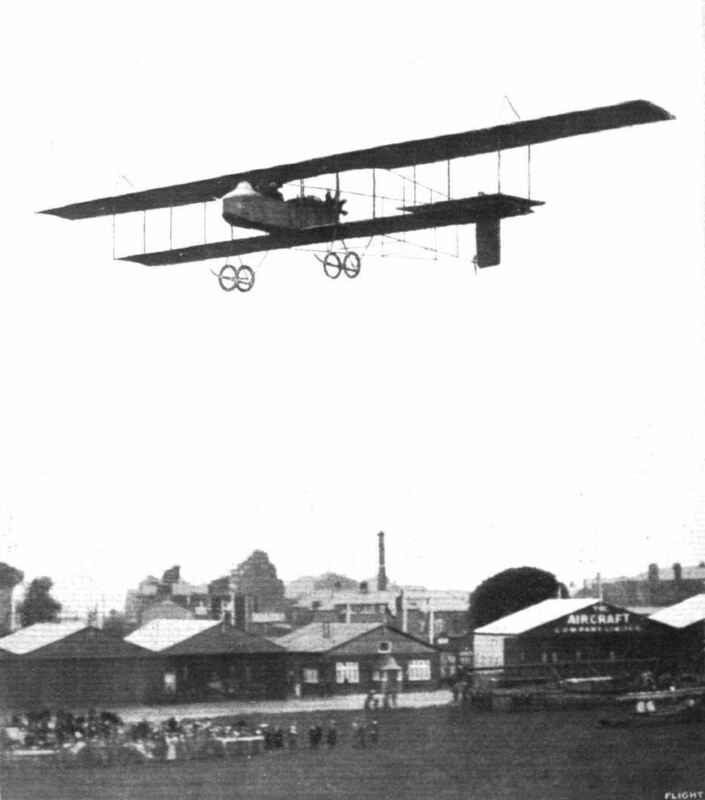 Caudron biplane at Hendon, the machine on which he passed his brevet tests at the W. H. Ewen School of Flying, Hendon. FLYING AT DUSK AT HENDON. - Mr. Sydney Pickles taking a late turn on the Caudron biplane. 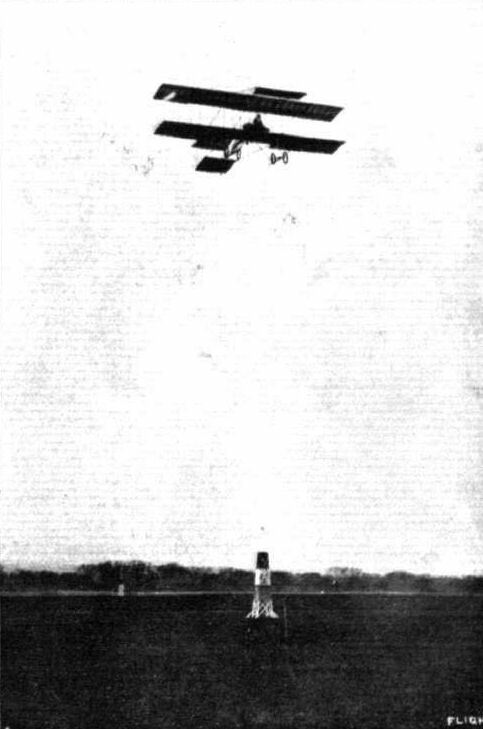 Rene Caudron flying his biplane "hands off." A new method of testing the abilities of a machine, and incidentally of carrying a passenger. The latter is seated, as can be seen from the photograph, inside the cellule on the right-hand side of the body. On the left-hand wing tip may be distinguished a bag, into which a few heavy tools were thrown, which was attached to equalise the weight. This test was made on Friday of last week at Hendon by M. Rene Caudron. 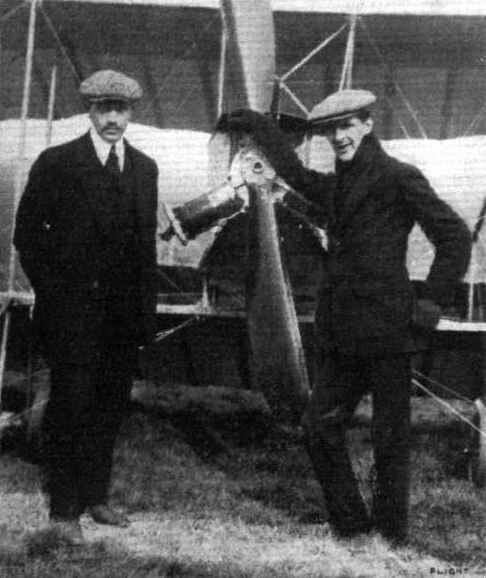 M. Rene Caudron, one of the two brothers to whom the designs of Caudron aeroplanes are due, and Mr. W. H. Ewen who has taken over the British agency. 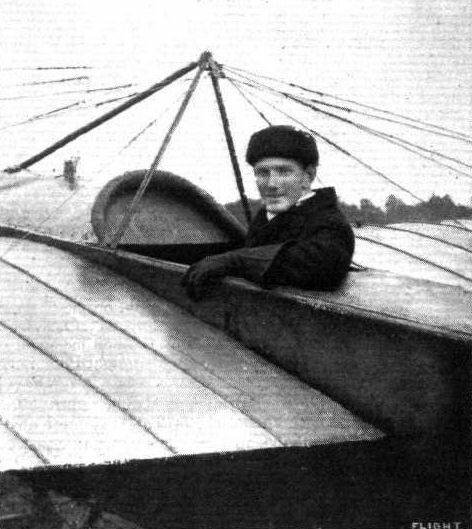 The tallest aviator in the world, Eugene Galy, the new pilot of the little Caudron at Hendon. 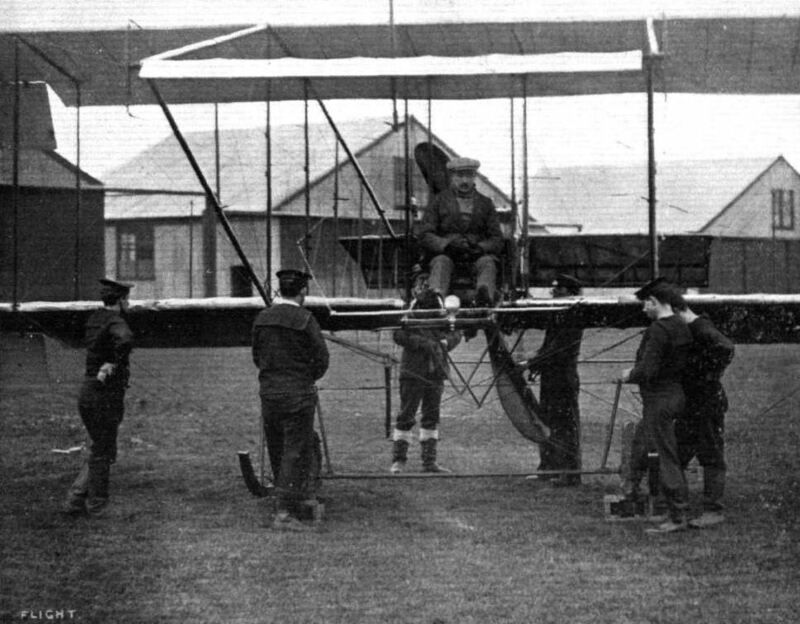 A group at the Ewen School, Hendon, standing in front of the Caudron with 35-h.p. Anzani. - From right to left: Capt. Chamier, M. Baumann (the assistant instructor), Lieut. Eric Conran, Mr. Sydney Pickles (the instructor), Mr. H. H. James, and Mr. A, C. Hunter, the manager of the school. The three pupils qualified for brevets about a fortnight ago. Mr. J. H. James, the 18-year old I.C.S. student who last week got his R.Ae.C. certificate at the Ewen School at Hendon. Incidentally, he collects the cash prize of L100 offered by the International Correspondence Schools for their first pupil to gain his brevet. Mr. James was with his brother, who is also a pupil at the Ewen School, connected with Webb, Peet and Co., of Gloucester, where they both had valuable experience with the Webb-Peet rotary engine. Curiously enough, the ticket was taken quite in "International" style, as the conditions include a Scotchman's school in England and a Welsh pupil on a French biplane. 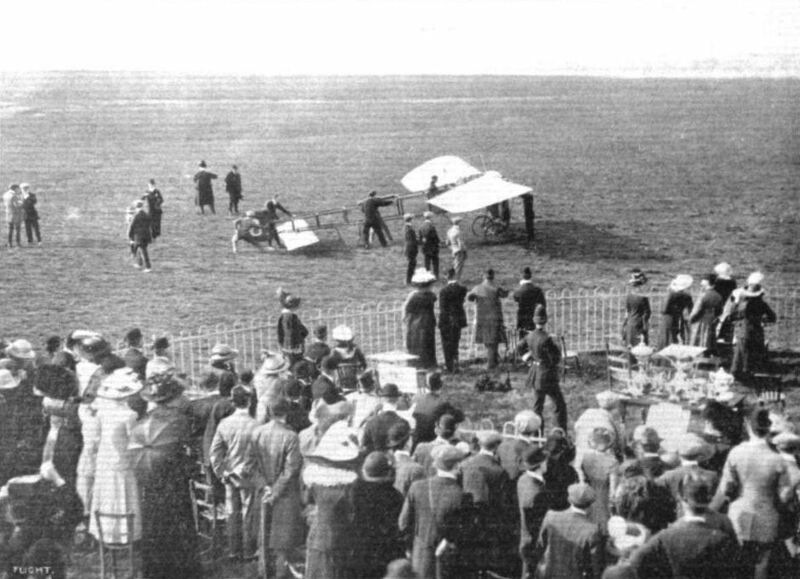 Mr. Ewen's Caudron after the mishap at Hendon in the tricky wind which turned his machine completely over, with, fortunately, no serious consequences to himself. 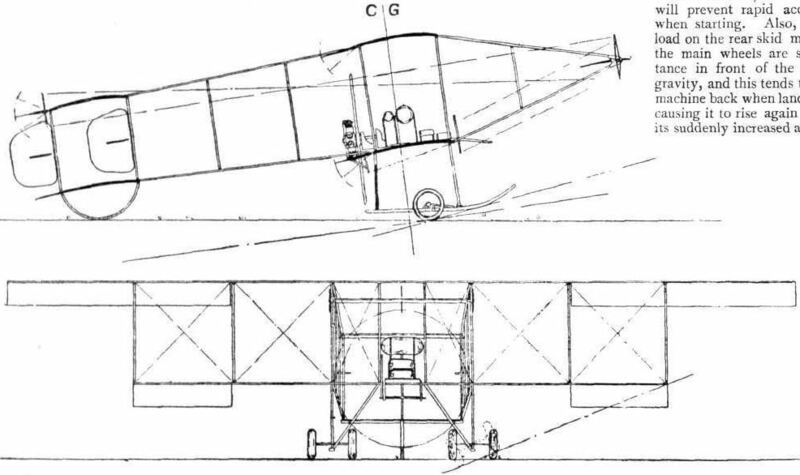 Sketch illustrating details in the warping arrangements of the Caudron biplane. 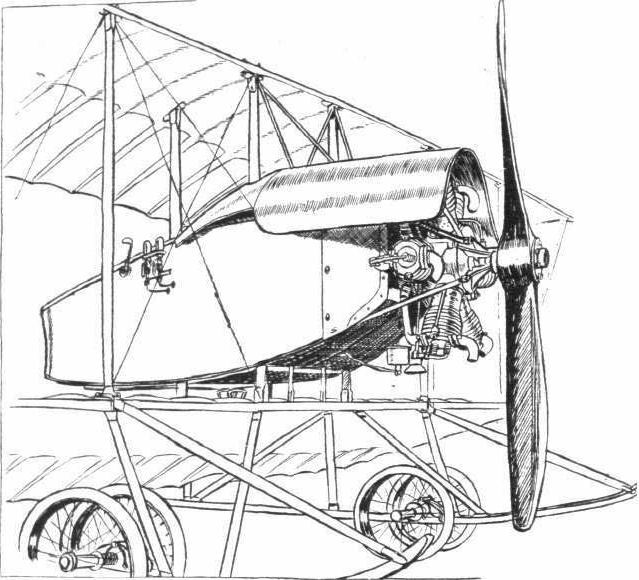 Sketch illustrating the body and undercarriage of the Caudron biplane. 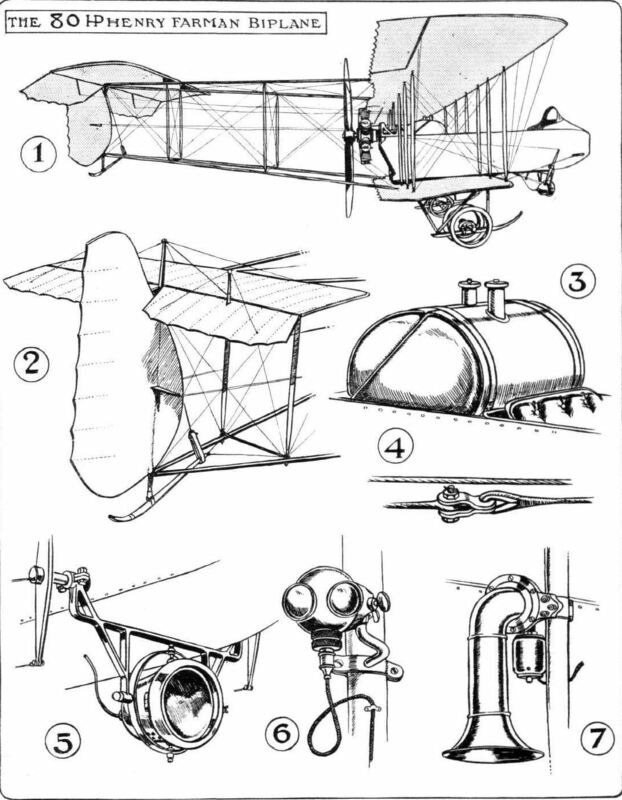 SKETCHES ILLUSTRATING DETAIL CONSTRUCTION IN THE CAUDRON BIPLANE. - 1. The cockpit, containing the pilot's seat, control gear, and petrol tank. 2. 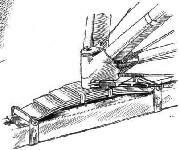 Method of fastening the tall outrigger booms by detachable joints that facilitate dismantling for transport. 3. 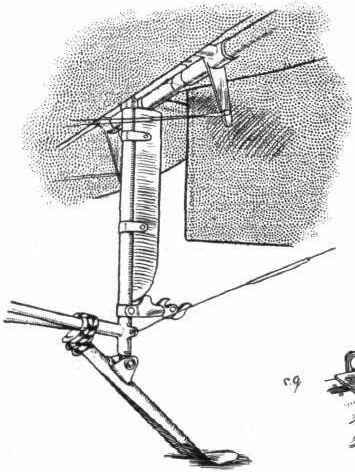 Method of attaching the control wires to the masts over the tail by means of flexible guide tubes. 4. 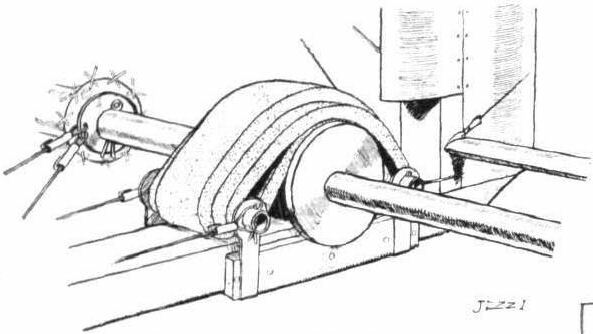 Method of attaching the warping wires to the control shaft. 5. 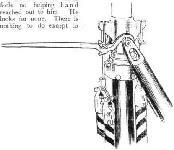 The control lever and its attachments. 6. Wind shield to protect the carburettor from the propeller draught, which otherwise tends to promote freezing. 7. Method of adjusting the angle of incidence of the tail plane. 8. Method of timing the ignition by sliding a gear-wheel on a spiral key. 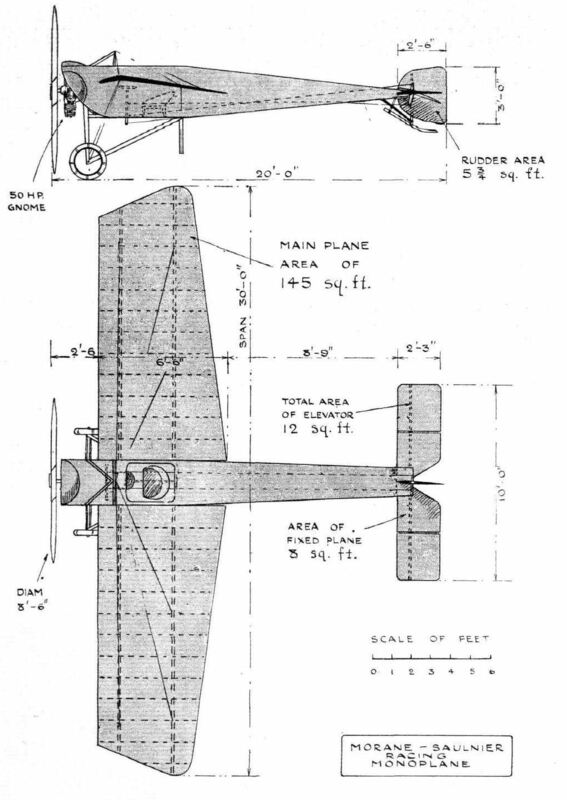 Elevation and plan to scale of the Caudron biplane. THE SOMMER ALL-STEEL BIPLANE. 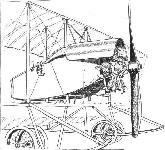 - Detailed view showing landing carriage, method of bracing the main planes, and steel engine bed. THE NEW ALL-STEEL SOMMER BIPLANE. - Plan and elevation to scale. The new 100-h.p. Gnome-engined Morane-Saulnier two-seated (tandem) military monoplane. - It is constructed throughout of steel. 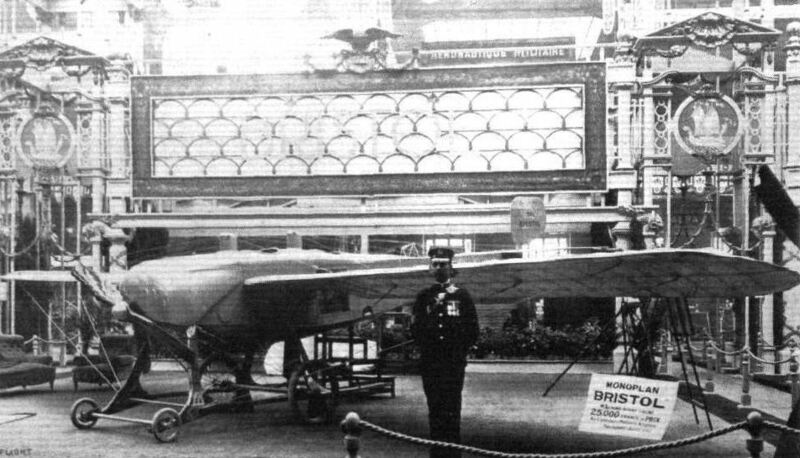 The all-steel fuselage of this machine, it will be remembered, was one of the clous of the last Paris Aero Salon. 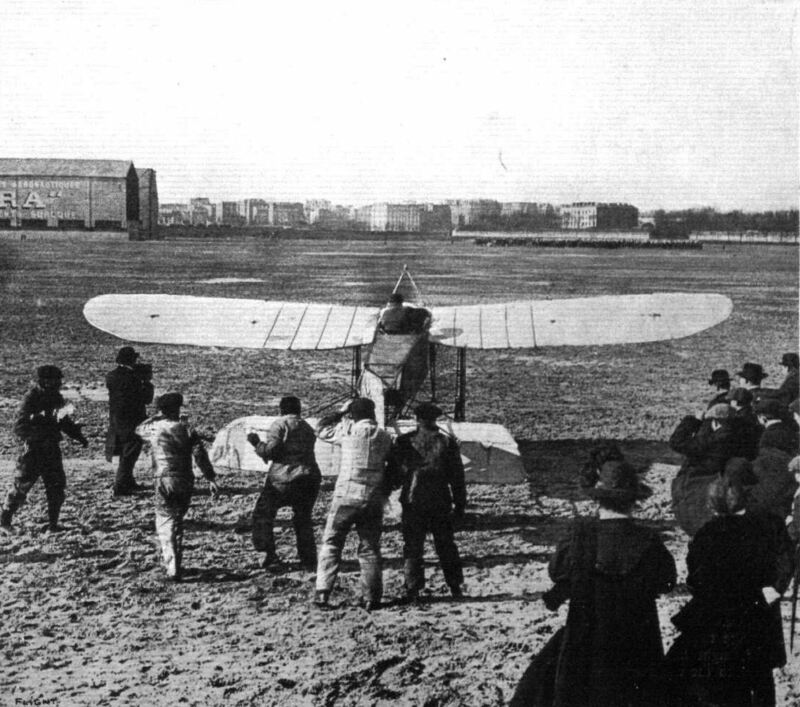 The de Marcay-Moonen monoplane returning to its hangar at Issy-les-Moulineaux after the finish of the Paris Aero Salon. 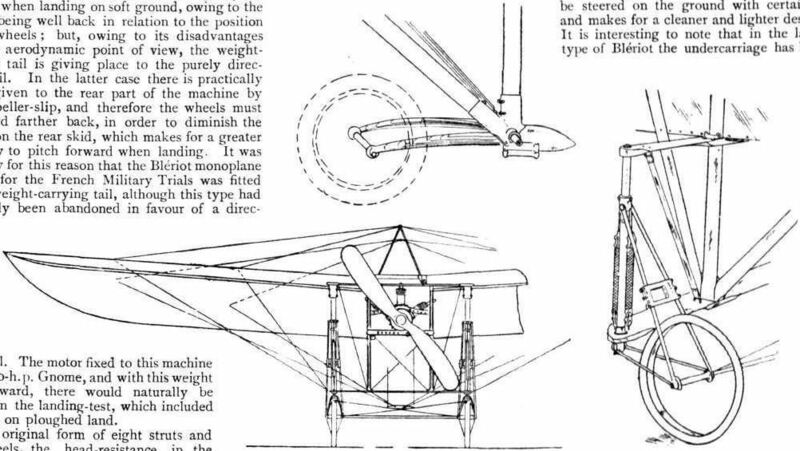 By virtue of its original system of wing mounting its dismantling in all probability occupied less time than any other machine at the Salon, it consisting merely of about a dozen rotations of a wheel mounted at the right-hand side of the pilot. The pair of wheels under the tail are rotatable in order to facilitate driving it along the ground. 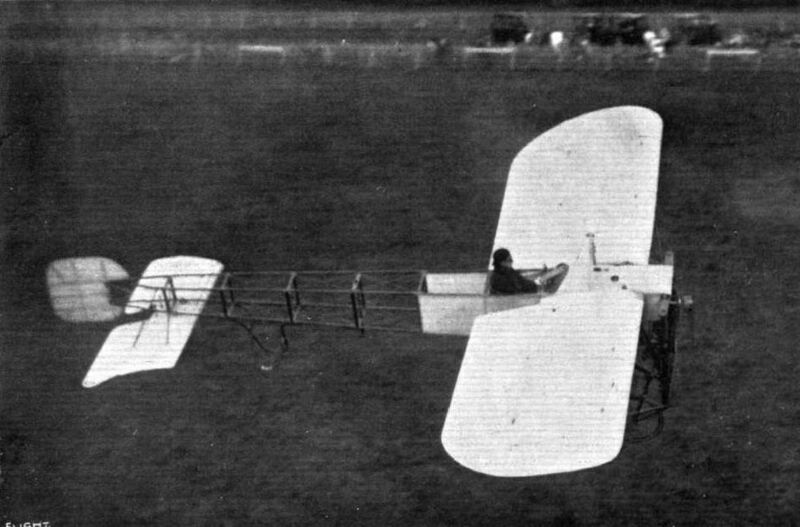 The Marcay-Moonen monoplane, with pivoting wings. 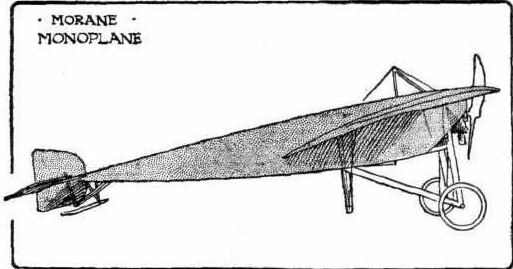 The Morane-Saulnier racing monoplane, as seen from one side, showing the approximate stream-line shape of the body. 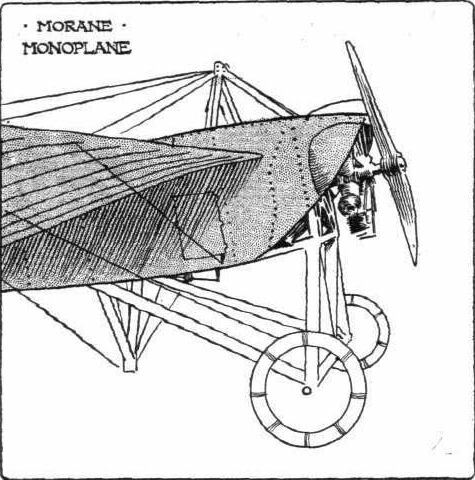 The Morane-Saulnier racing monoplane, as it appears from front. 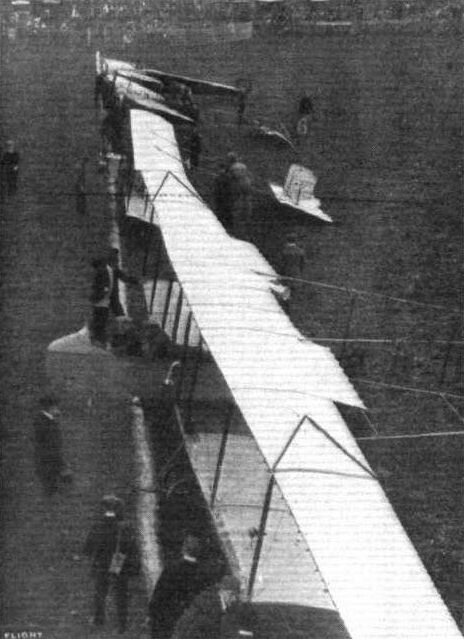 The Morane-Saulnier racing monoplane, as it appears from rear. 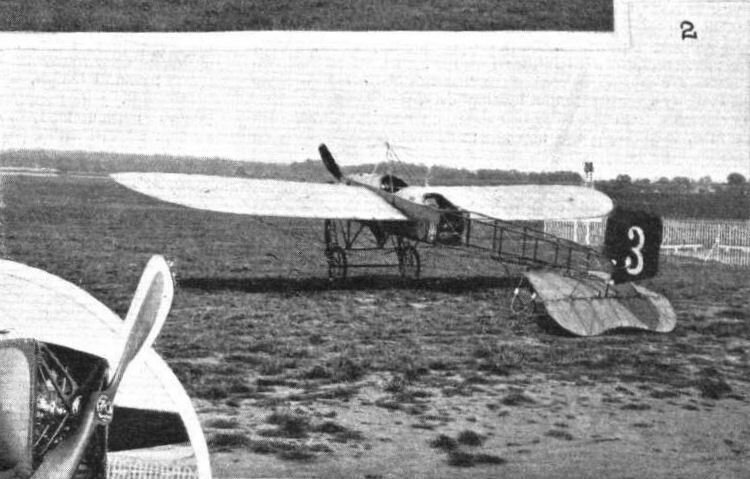 THE NEW MORANE-SAULNIER TWO-SEATER. 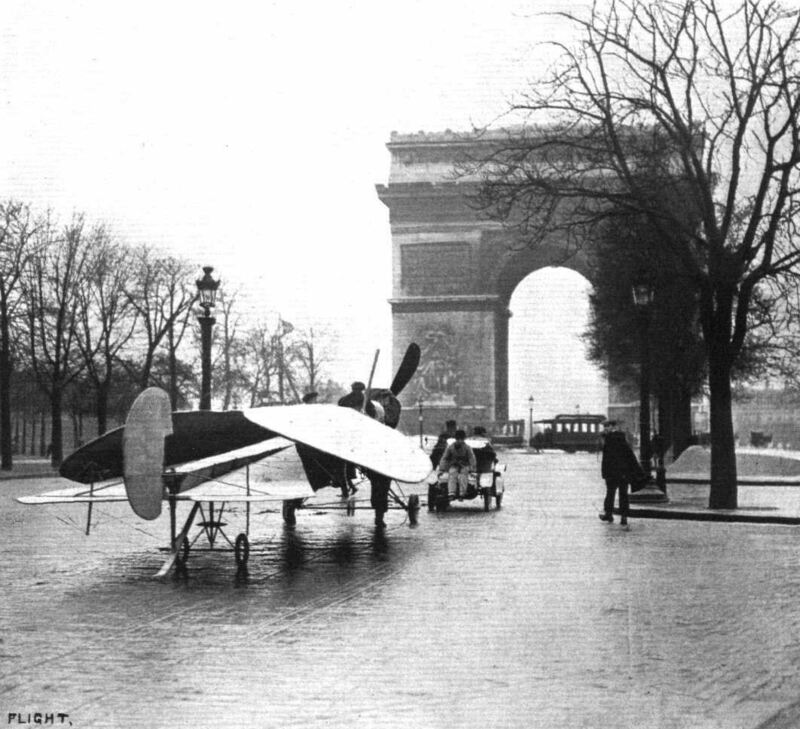 - In our article the week before last on the Morane racing monoplane, we made mention of the difficulties likely to be met with in connection with its rigid landing chassis. 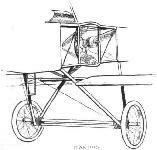 However, improvements have been made, and in the chassis of the machine depicted above, which bears a very close resemblance to the racer, the designers have arrived at a very neat and efficient method of ensuring a good factor of resilience without increasing the head resistance of that organ. 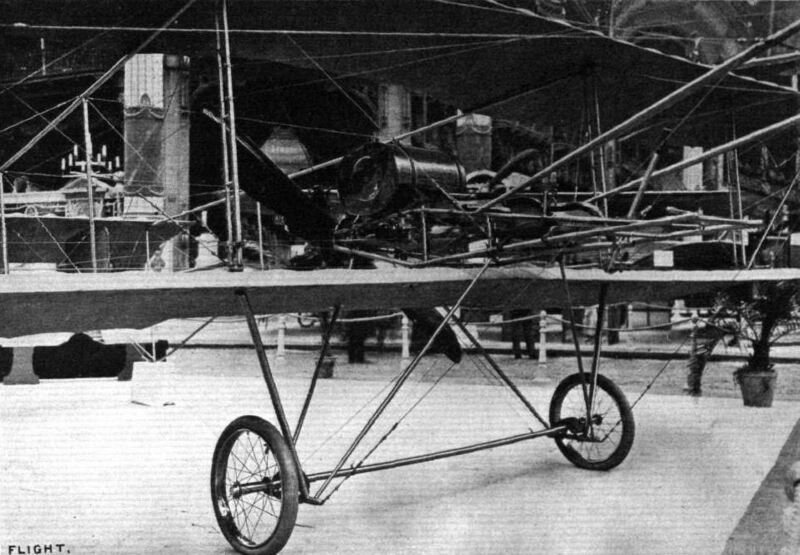 The all-steel rigid landing chassis of the Morane-Saulnier racer. Notice the staying of the wings from the apex of the central inverted triangle - a good point. 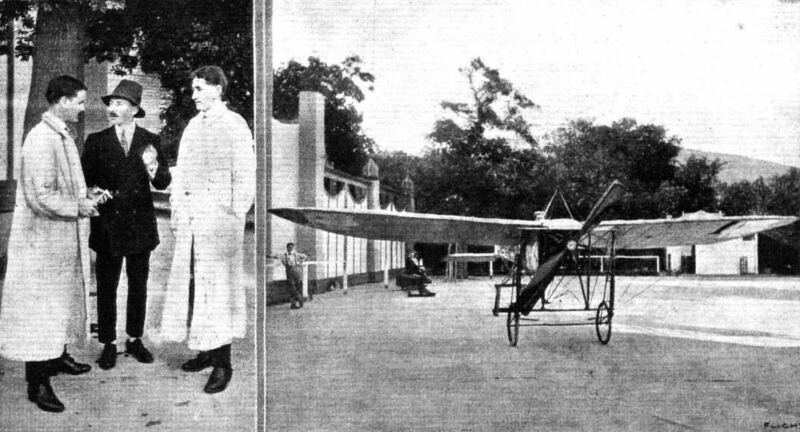 Representative stand at the Salon - the Morane-Saulnier. 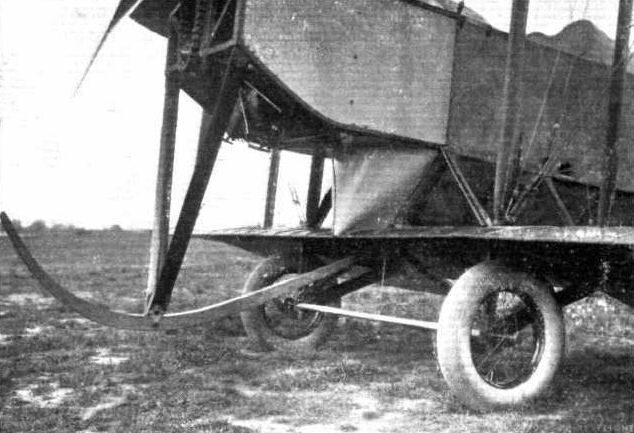 The all-steel tubular landing chassis of the Morane-Saulnier monoplane, in which no flexible suspension is provided. Diagrammatic sketch of the Morane-Saulnier landing gear. 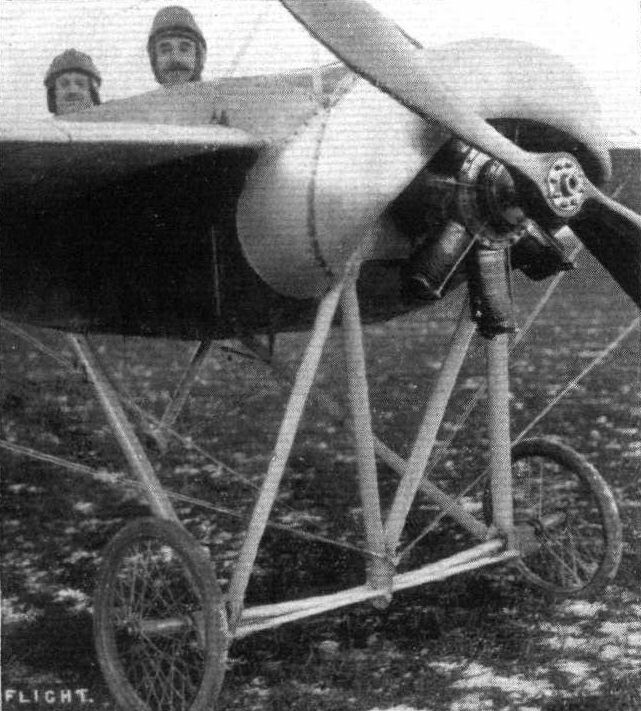 Front of the Morane-Saulnier two-seater monoplane, showing arrangement of landing gear and of the oil-shield over the motor. SOME LANDING CHASSIS. 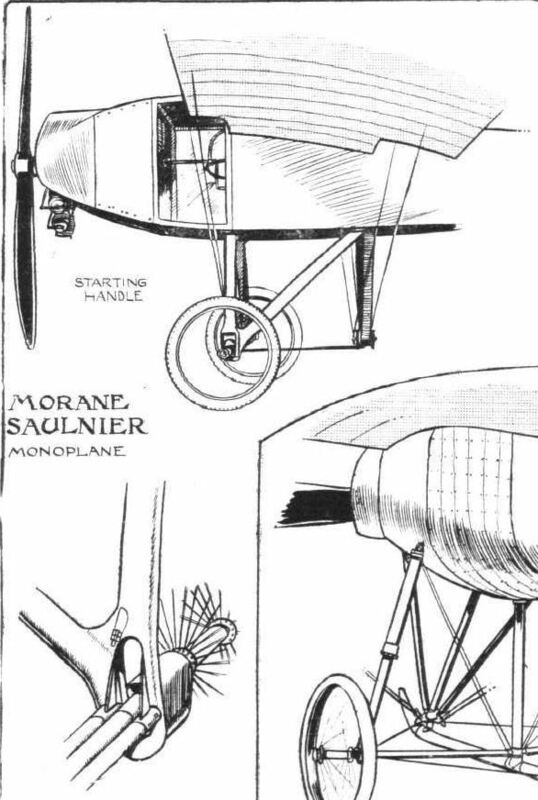 - Chassis of the Morane-Saulnier, with detailed pictures showing how the suspension is effected. 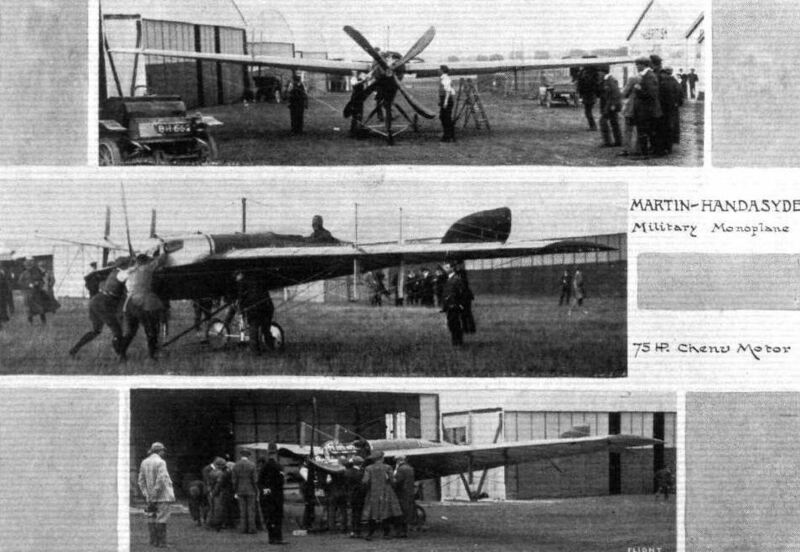 MORANE-SAULNIER MONOPLANE. - Plan and Elevation to Scale. 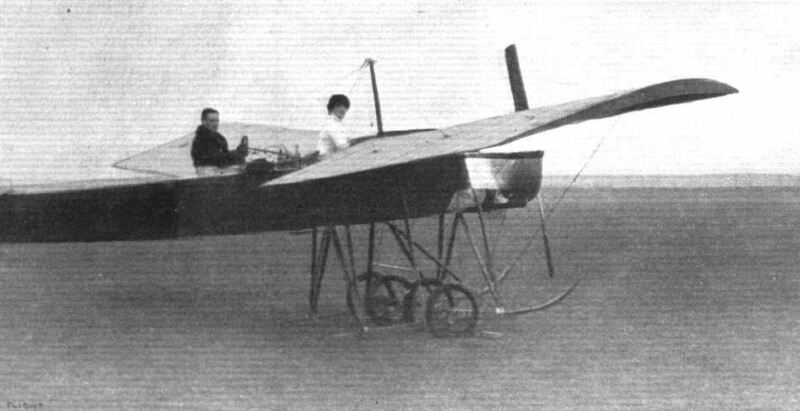 The "Tubavion" monoplane, the unique all-metal machine shown by Messrs. Ponche and Primard at the Paris Aero Salon, undergoing tests with M. Marie in the pilot's seat. 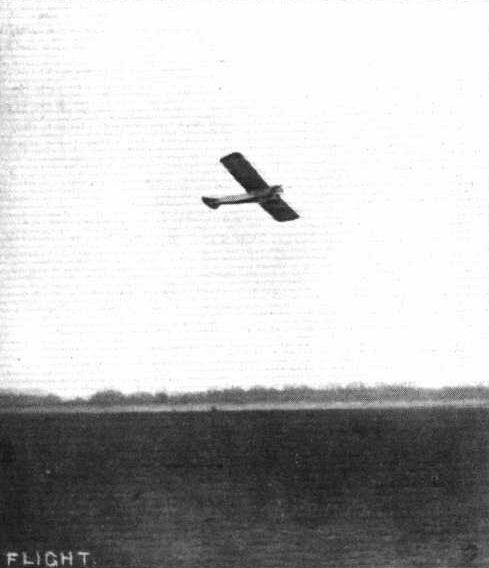 The Tubavion monoplane in flight. 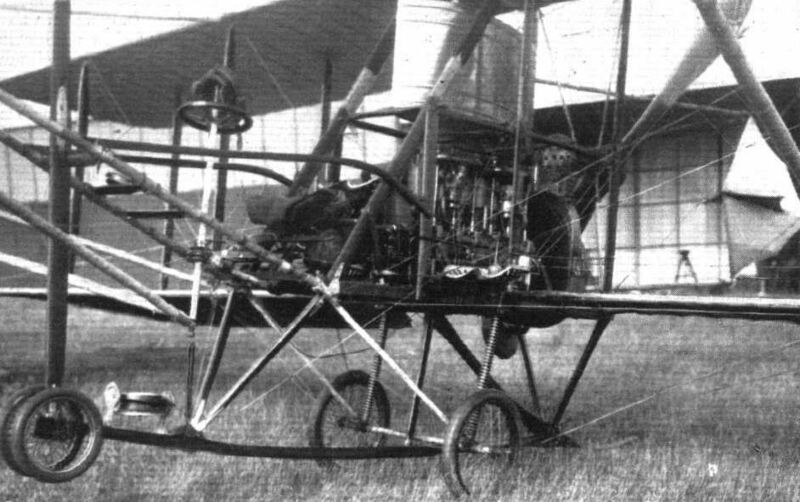 The Tubavion monoplane constructed by Messrs. Ponche and Primard. The chief characteristic of the machine is that it is constructed entirely of metal, with the exception of the landing skids. 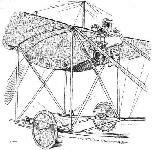 The new Caudron monoplane which is characterised by its extreme simplicity of construction and the attention that has been paid to the reduction of head resistance. Equipped with one of the new 35-h.p. Y-type Anzani motors, it has attained a speed of over 65 miles per hour, a good performance for both motor and machine. 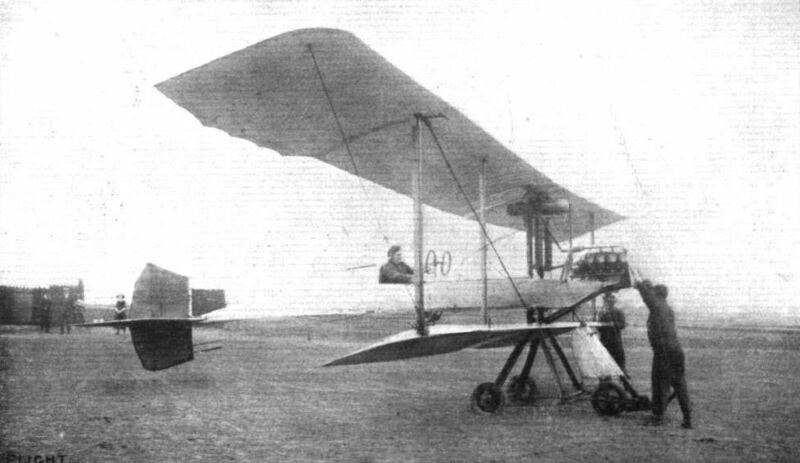 The Caudron monoplane, front view. 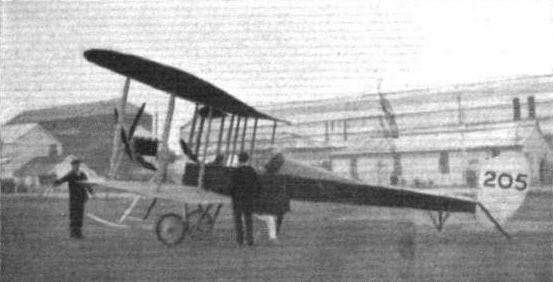 The Caudron monoplane, side view. 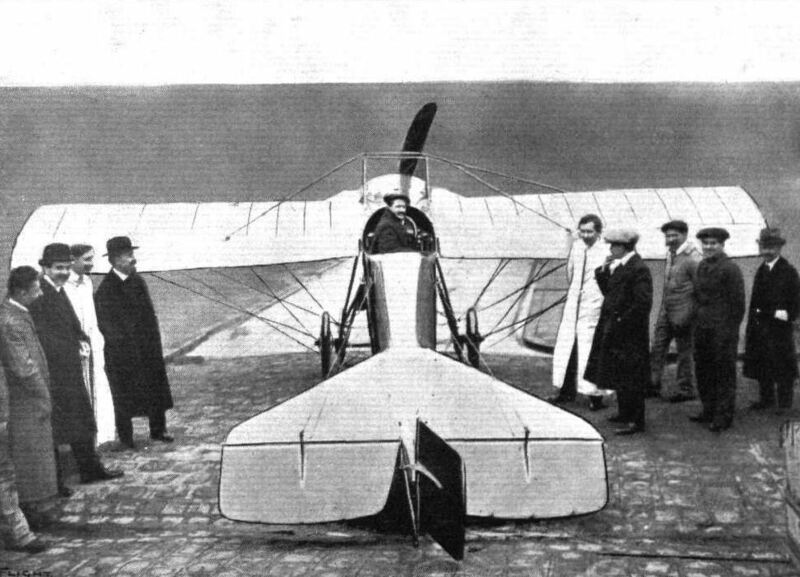 The Caudron monoplane, view from behind. 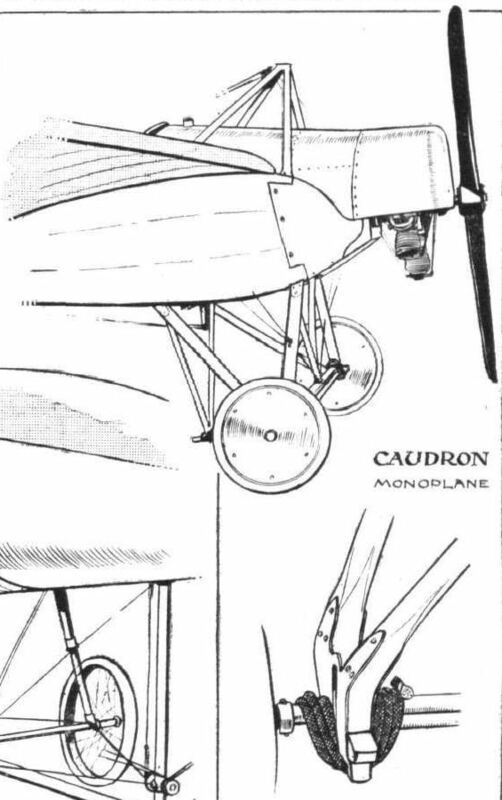 DETAILS OF THE CAUDRON MONOPLANE. - On the left the mounting of the 45 h. p. Anzani motor, showing the magneto and oil-pump to the rear of the mounting plate. On the right the interior of the cockpit. 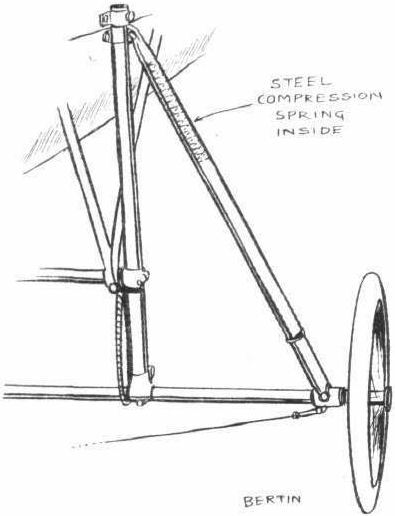 Details of the warping mechanism of the Caudron monoplane. 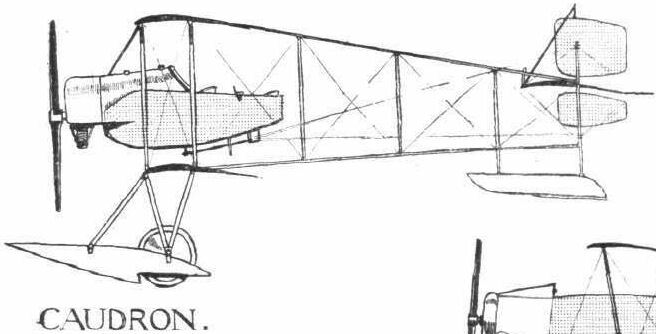 THE CAUDRON MONOPLANE. - Details of the landing chassis and engine mounting. SOME LANDING CHASSIS. 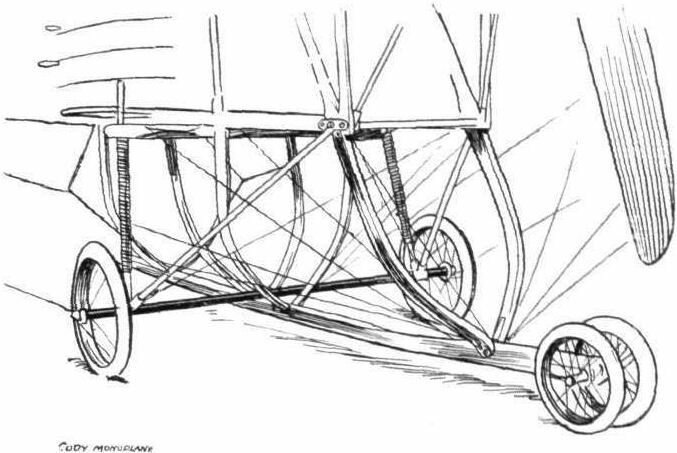 - Chassis of the Caudron, with detailed pictures showing how the suspension is effected. 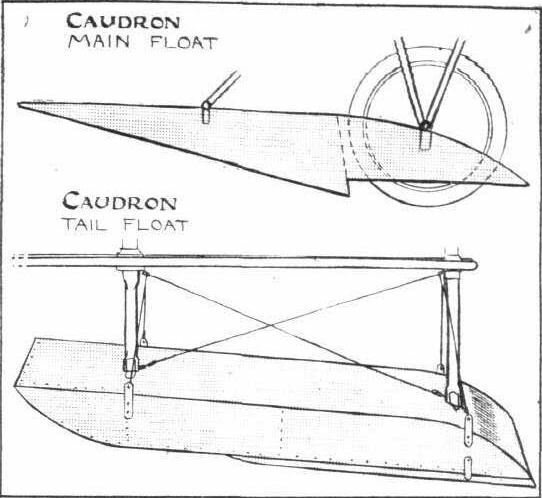 Details of the Caudron shock-absorbing arrangement. - The wheel is omitted for the sake of clearness. 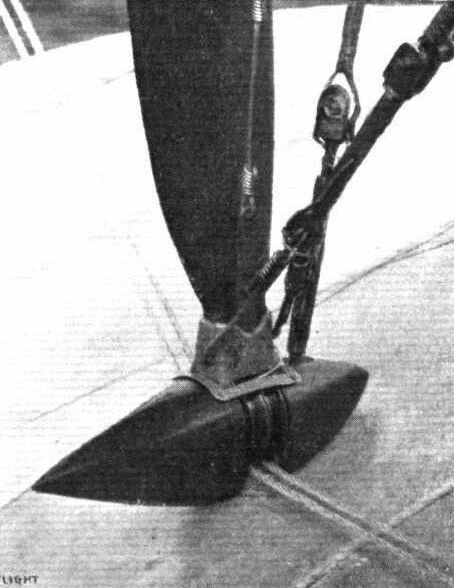 The tall of the Caudron monoplane, and on the left details of the tail skid. 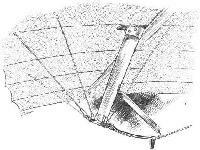 The method adopted on the Caudron monoplane of guiding control wires. 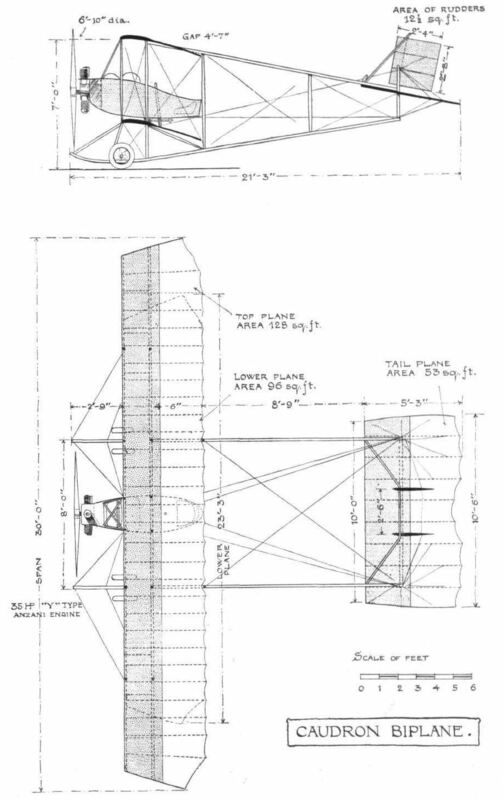 THE CAUDRON RACING MONOPLANE.-Plan and elevation to scale. The new product of the Army Aircraft Factory at Farnborough, a decided advance on the previous machine as constructed by that body. 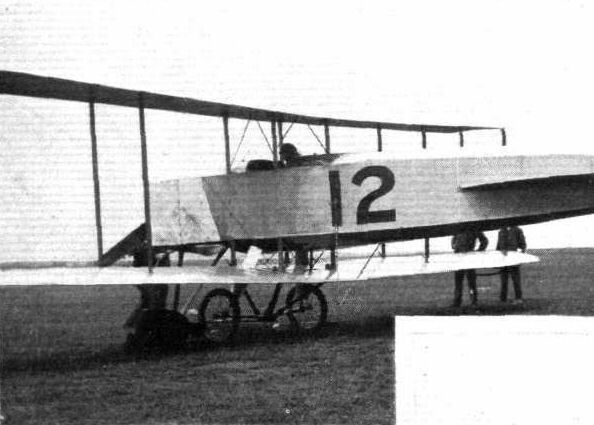 RAF BE.1 December 1911 saw the first flight of this Geoffrey de Havilland design of which many variants were built for the RFC and RNAS. Geoffrey de Havilland crouches to examine the B.E.l's undercarriage. 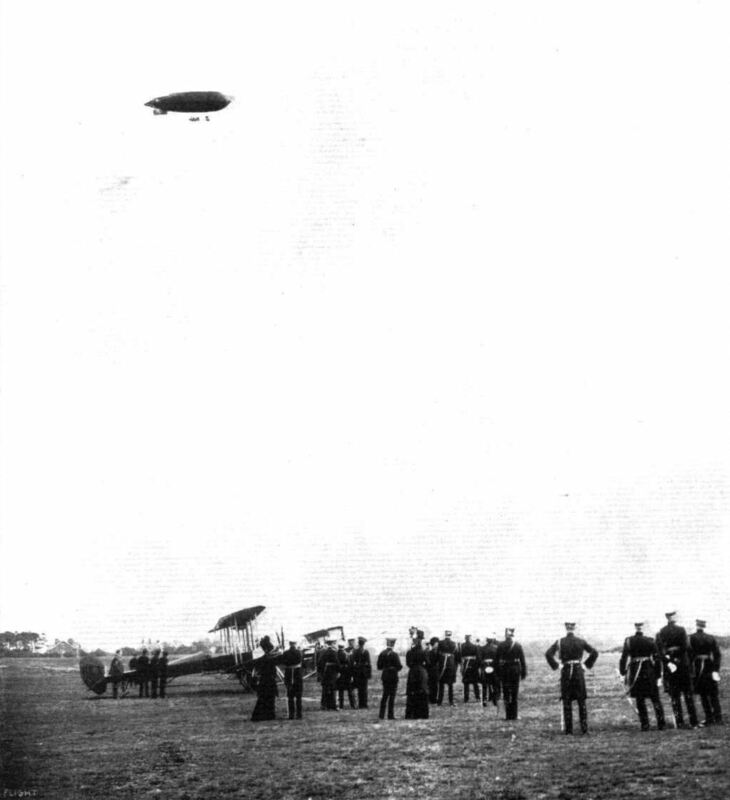 The King and Queen at the aviation grounds at Aldershot, watching the Army airship in flight. On the ground can be seen clearly B.E.I, one of the new four-bladed-propeller Army biplanes built at the Royal Aircraft Factory. HYDRO-AEROPLANES AND LAKE WINDERMERE. 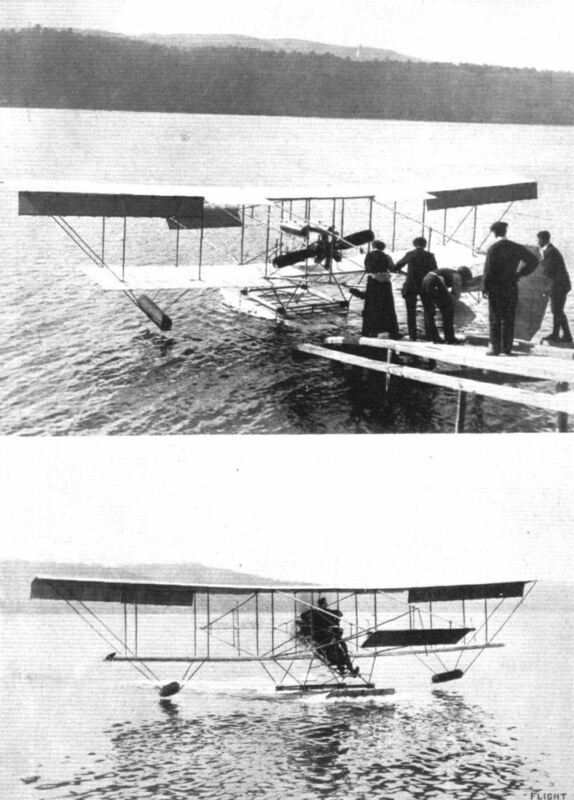 - Mr. E. W. Wakefield's Avro machine just rising from the waters of Lake Windermere. HYDROAEROPLANES AND LAKE WINDERMERE. 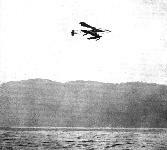 - Mr. E. W. Wakefield's Avro biplane at the moment of alighting on the water of Lake Windermere after a long flight. HYDRO-AEROPLANES AND LAKE WINDERMERE. 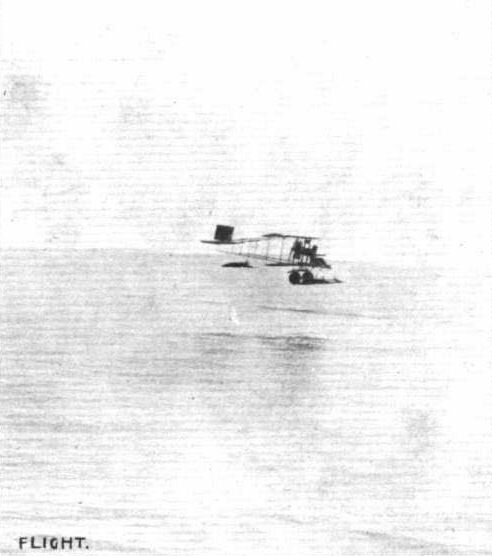 - Above is a photopraph of Mr. E. W. Wakefield's hydroaeroplane in flight across this great lake, the floats being well seen from underneath. The aeroplane is the construction of Messrs. A. V. Roe and Co., and the float and balancers of Messrs. Borwick and Son of Bowness. THE "WATER HEN" ON LAKE WINDERMERE. - Above, the machine being launched from the slipway that leads down to the water from the hangar. Below may be seen the machine, with a passenger up, just about to leave the water. Mr. Stanley Adams bringing a passenger home in the "Waterhen," under her own power, on Lake Windermere. This hydro-biplane, with the exception of the propeller, which is an Avro, and the 50-h.p. 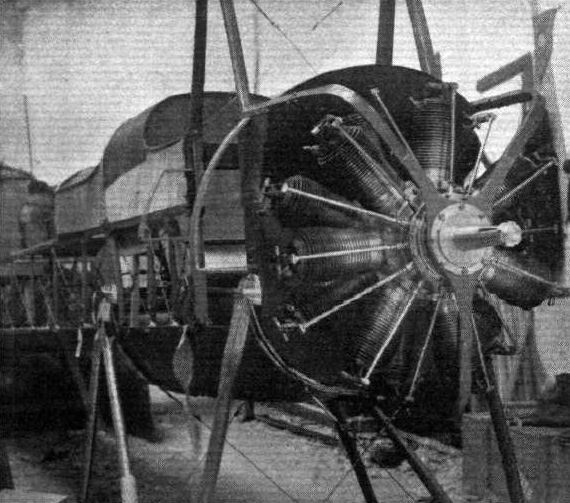 Gnome engine, has been entirely designed and constructed at Lake Windermere by the Lakes Flying Co., of which Mr. E. W. Wakefield is the moving spirit. THE "WATER HEN" WELL UP OVER LAKE WINDERMERE. - Inset, the machine just after leaving the water. The "Waterhen" flying with passenger over Windermere. 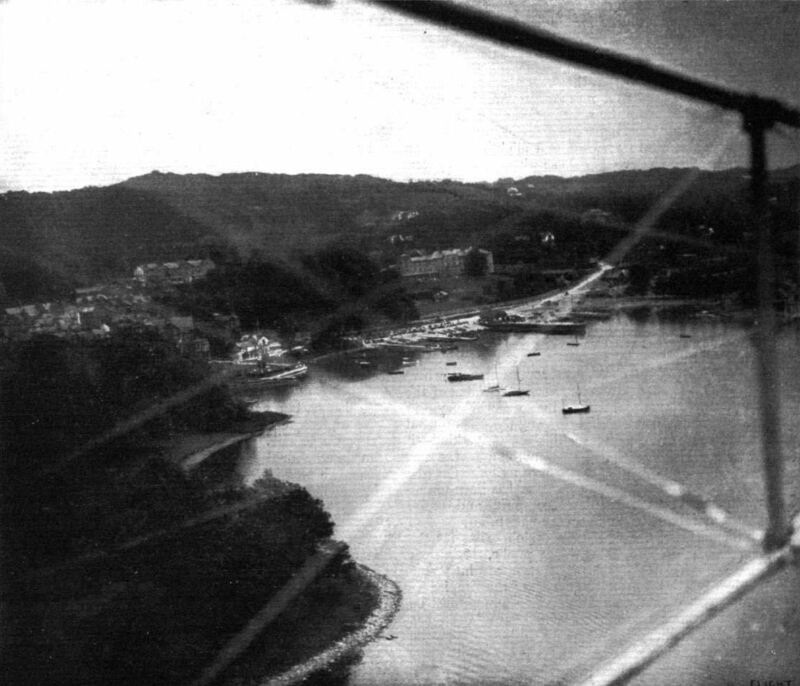 A snap of the Hill of Oaks aviation sheds at Lake Windermere, taken from Mr. E. E, Wakefield's hydro-aeroplane "Waterhen" when in flight. Bowness and the Belsfield Hotel, Lake Windermere, taken from the Lakes Flying Co.'s 50-h.p. Gnome-engined " Waterhen." 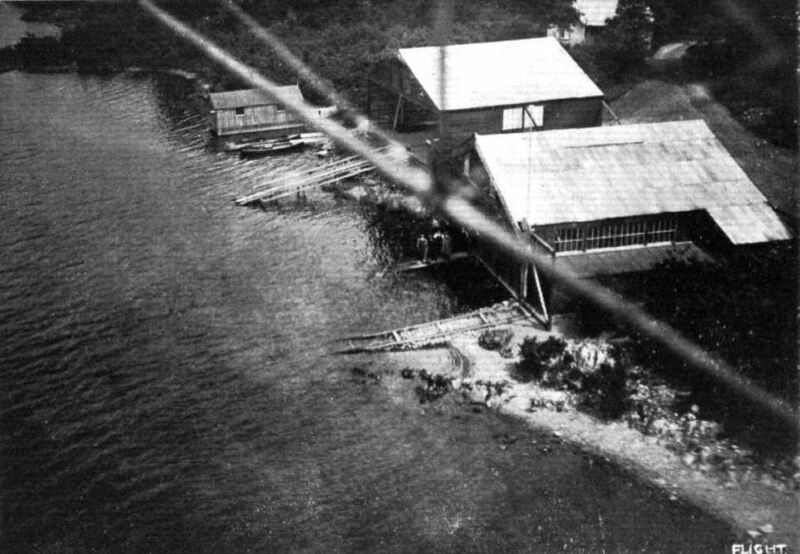 The gale which swept the country on Friday and Saturday accounted for the demolition of the hangar sheltering Captain E. W. Wakefield's two hydro-aeroplanes on Lake Windermere. In its collapse both machines were damaged, part of one of the planes being seen in our photograph of the wreckage protruding from the side. This incident, we presume, will be regarded as a score in their favour by the anti-aeroplanists of Windermere. DETAILS OF THE "WATER HEN". 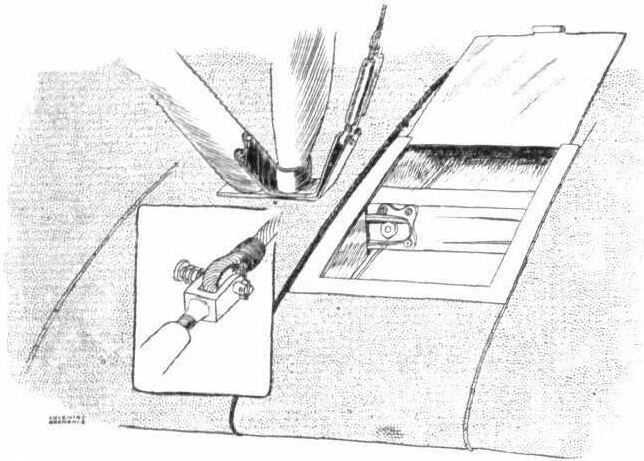 - (1) The front section of the machine, showing the float ant its flexible connection to the cellule. (2) One of the outrigger fittings. (3) A balancer, an air sack mounted on a spring board. (4) Mounting of the oil tank. 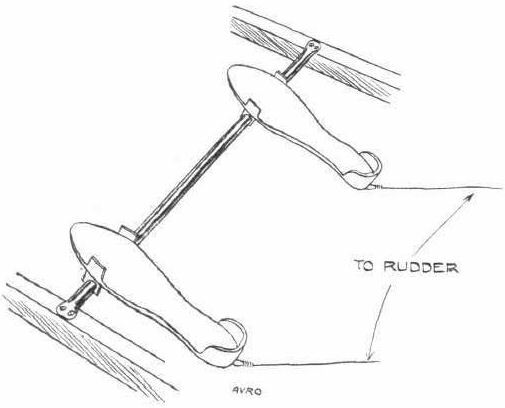 (5) Water rudder, working in con junction with the air rudder so that the biplane may be readily steered at slow speeds on water. 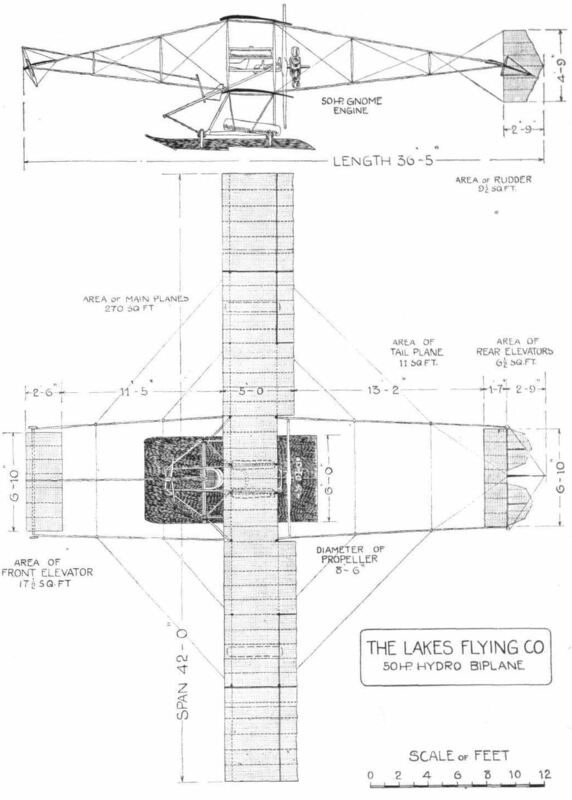 THE LAKES FLYING CO.'S HYDRO-BIPLANE "WATER HEN." - Plan and elevation to scale. Chanter monoplane built at Hendon but soon destroyed in a hangar fire at Shoreham in February 1912. 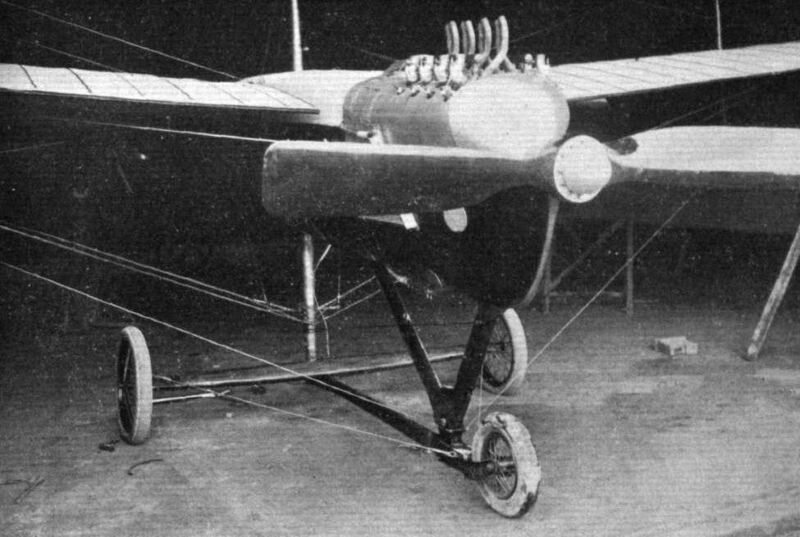 The Chanter-Nieuport-type monoplane, equipped with 35-h.p. Anzani motor. On the right Mr. M. Chanter at the lever of this 35-h.p. monoplane. 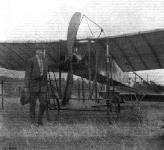 The Short tractor biplane, constructed by Messrs. Short Bros, for Mr. Frank K. McCiean, which has been doing successful work at Eastchurch recently. Mr. Frank McClean in the pilot's seat of his 70-h.p. 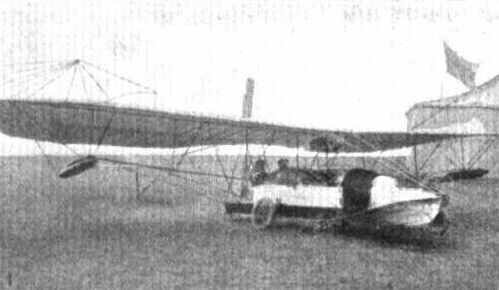 Short tractor machine, with Miss McClean as passenger, prior to a flight at eastchurch. A near view of Mr. McClean's 70-h.p. Short tractor machine ready for a flight. With Mr. McClean is Miss Lucas as passenger. Lieut. Spencer Grey, R.N., with Assistant Paymaster Frewin, R.N., on the new naval 70-h.p. Short tractor biplane at the Royal Aero Club's Eastchurch flying ground. 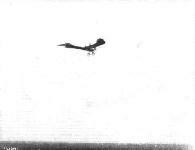 Mr. Frank McClean in flight at the Royal Aero Club's Eastchurch flying grounds on his Short tractor biplane. Mr. Frank McClean making a vol plane on his 70-h.p. Short tractor at the Royal Aero Club's Eastchurch flying grounds. M. B. Passat and his monoplane "Sea-gull," which was tried at Brooklands last summer, and since then, owing to engine trouble, experiments have been delayed. He expects to take the machine to Brooklands again soon to resume his attempts at flight. The wings can be closed in five minutes ready for transit. M. Passat's ambition Is to bring out a machine which will hover for long distances with the engine stopped. AVIATION AT DAVOS PLATZ. 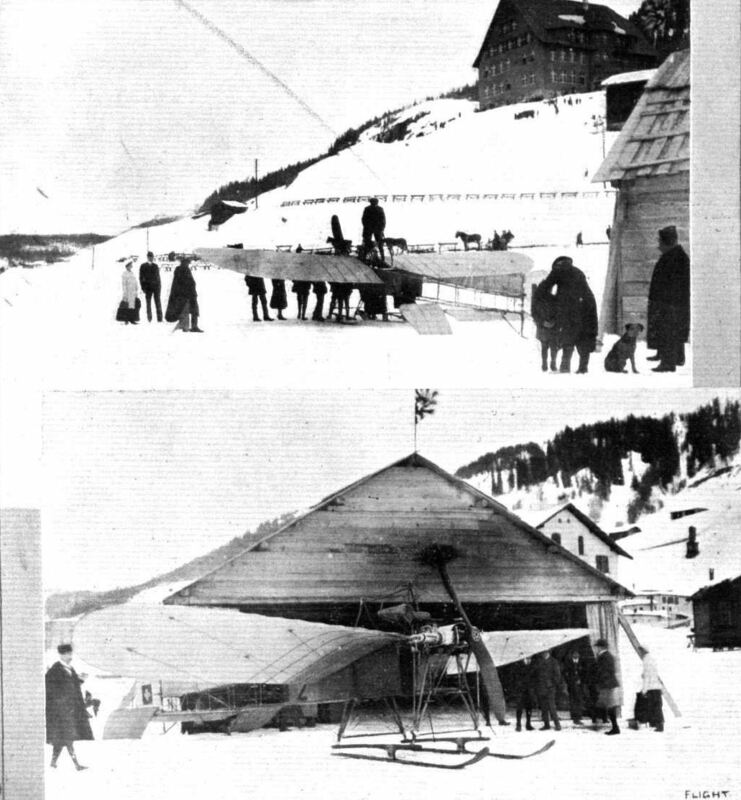 - The first aviator to fly a monoplane at Davos Platz is M. Grandjean, our photograph showing the machine and its shed at this famous resort. Moreover, M. Grandjean has entirely put the machine together on the spot by himself. Note the special skis attached for landing purposes. 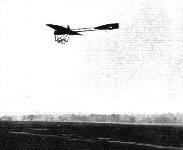 Eggleton No.l glider built at Eastchurch. - On the right the "sporty" start for the first towed flight. Mr. R. Eggleton in the seat of his No. 2 glider, Mr. J. Moran standing by. Lieut. 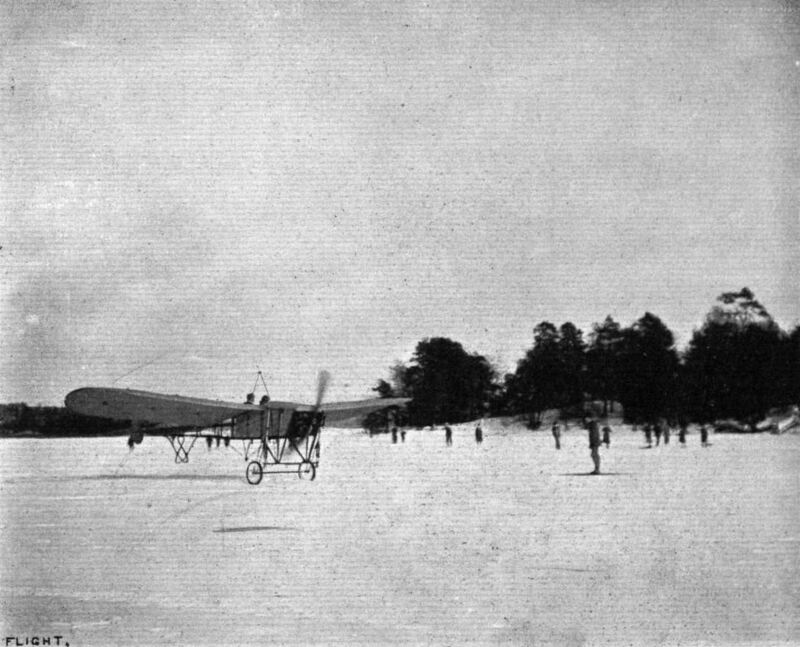 Dahlbeck, of the Royal Swedish Navy, on his monoplane on the ice at Stockholm. - Lieut. Dahlbeck has been doing some good work in starting and landing on the ice with and without passengers. Lieut Dahlbeck, it will be remembered, graduated in flying at the Grahame-White School at Hendon. Lieut. 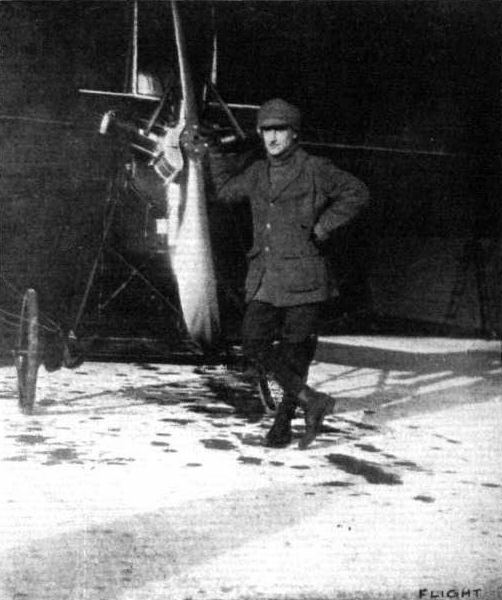 Dahlbeck, of the Royal Swedish Navy, who is practising flying at Stockholm on the ice, both with a Swedish-built Blerlot-type monoplane and his Bristol biplane, the latter machine, he holding, being one of the best he knows. In their new military monoplane, "La Triplette," the Antoinette firm have made use of an altogether new form of landing chassis. The motor, an 8-cyl. 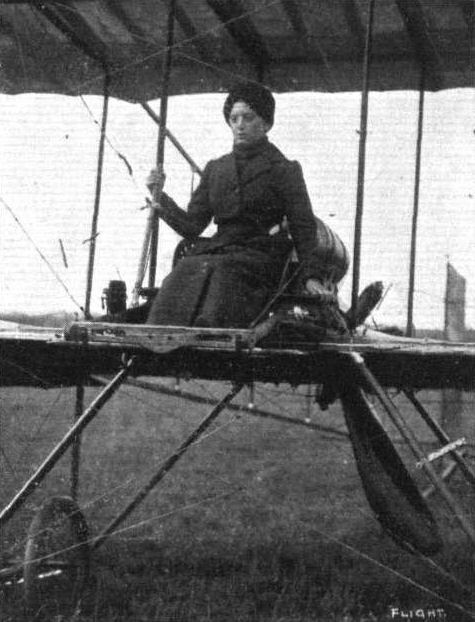 Antoinette of 60-h.p., is covered by a shield, as on the Martin-Handasyde monoplane, to reduce head resistance. 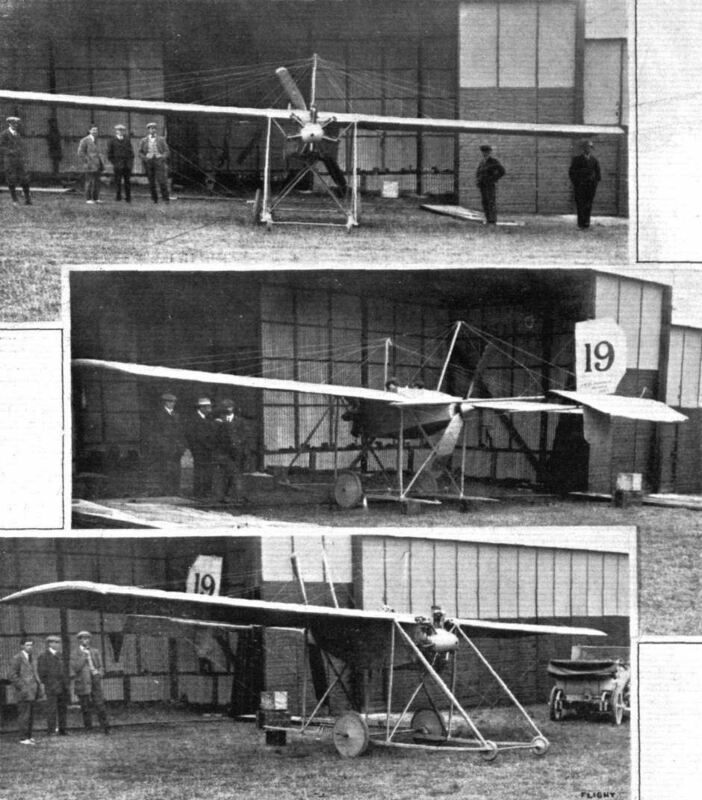 The latest Hanriot monoplane which is now being constructed in England under the guidance of Mr. Maurice Ducrocq. Side view, showing the rakish lines of this fast machine. View, from behind, of the latest Hanriot speed monoplane. The latest 3-seater Hanriot monoplane. 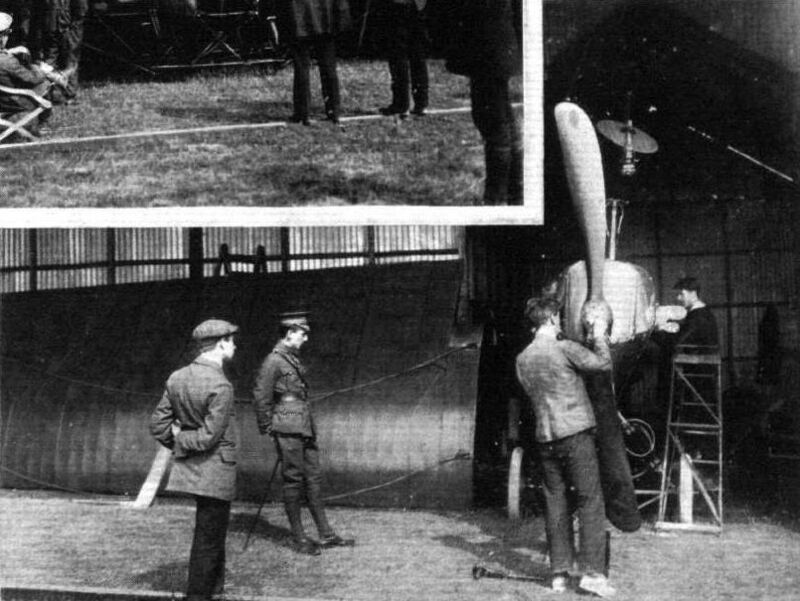 THE MILITARY AVIATION TESTS. 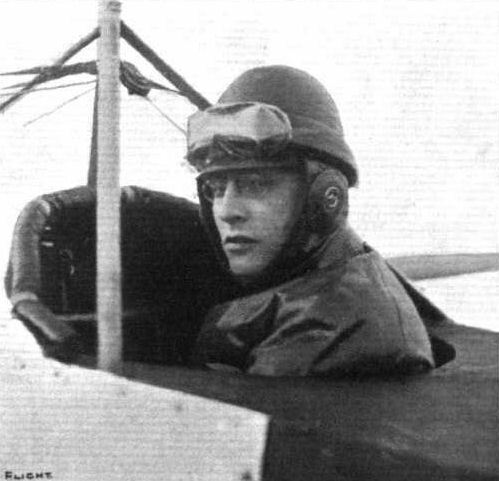 - One of the Hanriot monoplanes flown by Bielovucie starting off with Major Brooke-Popham as passenger. 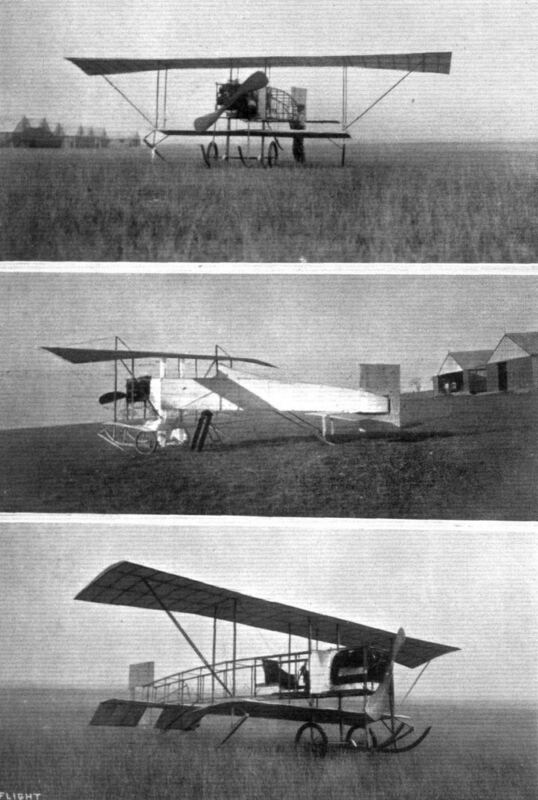 Two views of the 100-h.p. 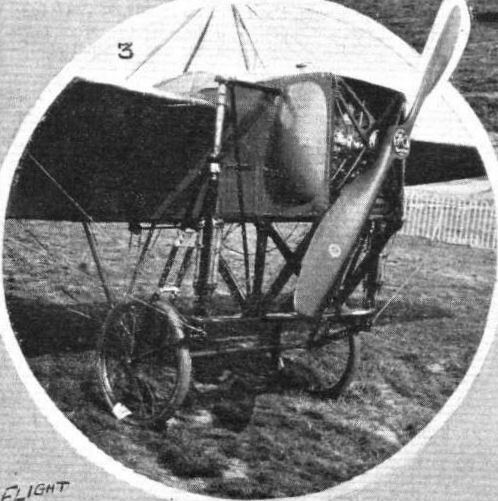 Hanriot monoplane. 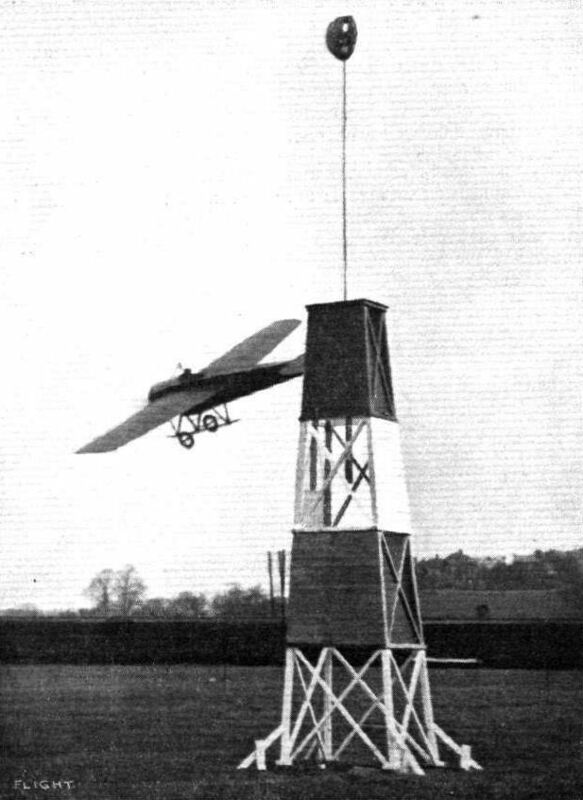 Mr. Sabelli rounding a pylon on the Hanriot at Hendon. 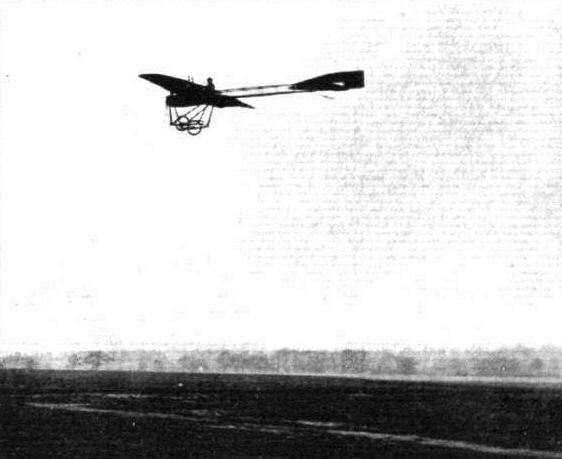 Side view of the Hanriot monoplane in flight. A sunset flight by S. V. Sippe on the Hanriot monoplane on May 17th at Rheims. - Passing over the Hanriot sheds. 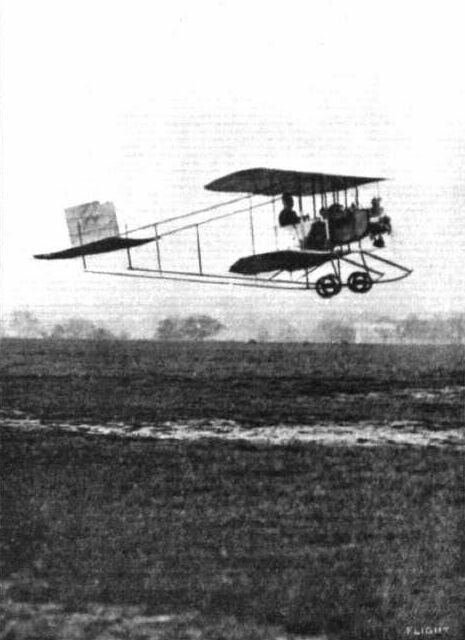 The latest 3-seater Hanriot monoplane in flight. - In this picture the three heads of the occupants are plainly visible. Mr. Sabelli, who has been doing such splendid flying at Hendon and round the country recently. 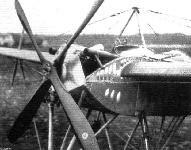 The landing chassis of the Hanriot-Pagny monoplane is modelled on pronounced Nieuport lines. The skids project backwards, Bristol fashion, so that, on depressing the tail, they rub along the ground, and so bring the machine to a standstill after a minimum of run. The beautifully-finished 100-h.p. 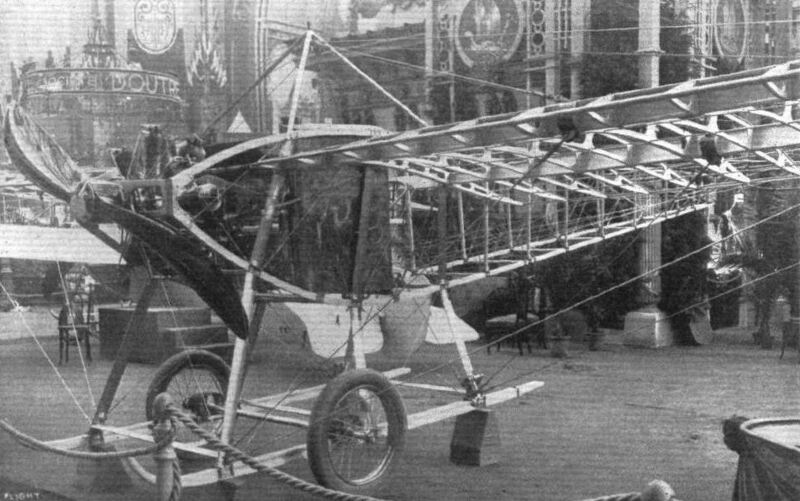 two-seater monoplane shown in skeleton on the Hanrlot stand. VIEWS AT MESSRS, HEWLETT AND BLONDEAU'S WORKS. - On the left, where the metal working, on the right, where the wood working is done. MESSRS HEWLETT AND BLONDEAU'S WORKS AT CLAPHAM JUNCTION. - Above, the main assembly shop; in the centre, to the left, where the wings are made, covered, and doped; to the right, a section of the metal working shop. Below, a section of the works, showing the pittern shop and the store. 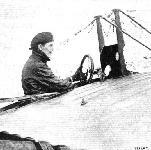 S. V. Sippe in the pilot's seat of the new Hanriot, of Hanriot (England), Ltd., which he will be shortly flying at Brooklands. 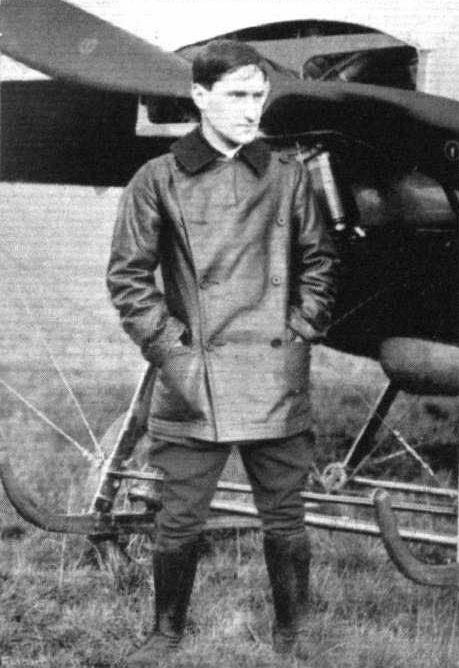 Marcel Hanriot, the youngest fully qualified pilot - not yet being 18 years old - who is now due in England, where he is likely to be flying the Hanriot Monoplane, of which he is a perfect master. His fine work has already been demonstrated in France, Switzerland, Italy, Spain, Turkey, Austria, Belgium, and S. Russia. Lieut. Marlin, who recently flew on a Hanriot from Rheims to Bar-le-duc, covering 100 kiloms. in 45 mins. THE LATEST MILITARY 3-SEATER HANRIOT MONO. - Bielovucie is in the pilot's seat, and in front are Marcel Guillemin and Sydney V. Sippe. 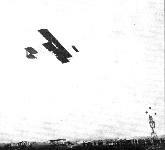 A FREIGHT OF FOUR IN THE MILITARY HANRIOT MONOPLANE. - From left to right: Messrs. Hanriot, jun. Sippe, Frey and Bielovucie. 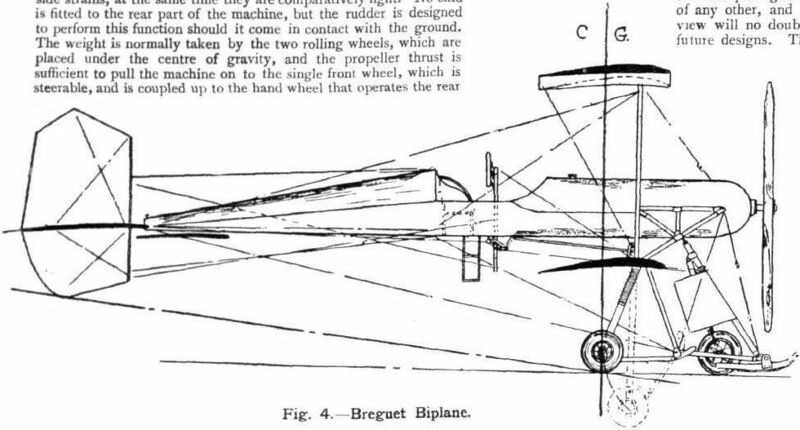 Sketch showing how the warping is geared up by means of a bell crank on the Hanriot monoplane. It also shows the type of socket by which the chassis-struts are assembled to the landing-skids. 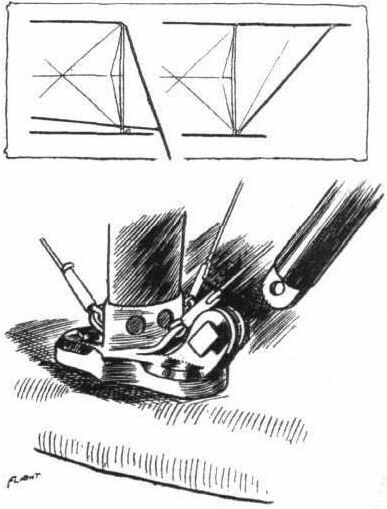 The method of attaching the wing-cables on the Hanriot monoplane. 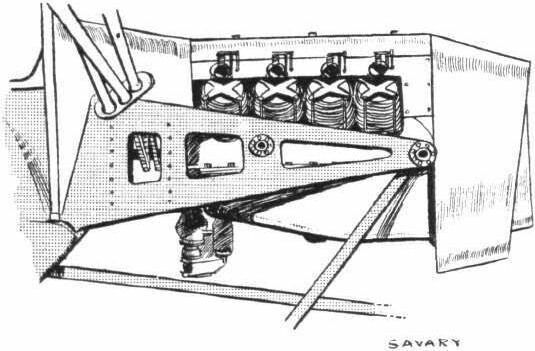 The clever double-crank radius-rods of the Hanriot chassis, showing the neat unit they form with the shock-absorbers. 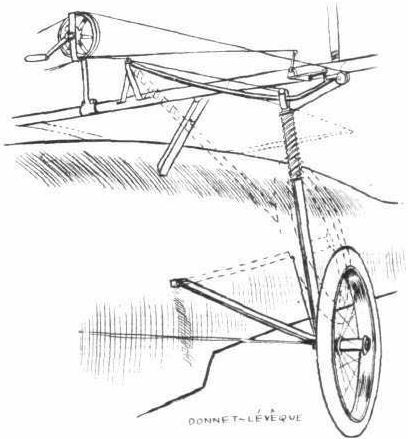 Two interesting details sketched from the Hanriot monoplanes in the course of construction at Messrs Hewlett and Blondeau's works On the left the clever rudder-bar fitting that may be adjusted to suit the length of the pilot's legs. On the right, the rudder post, a good example of acetylene welding. 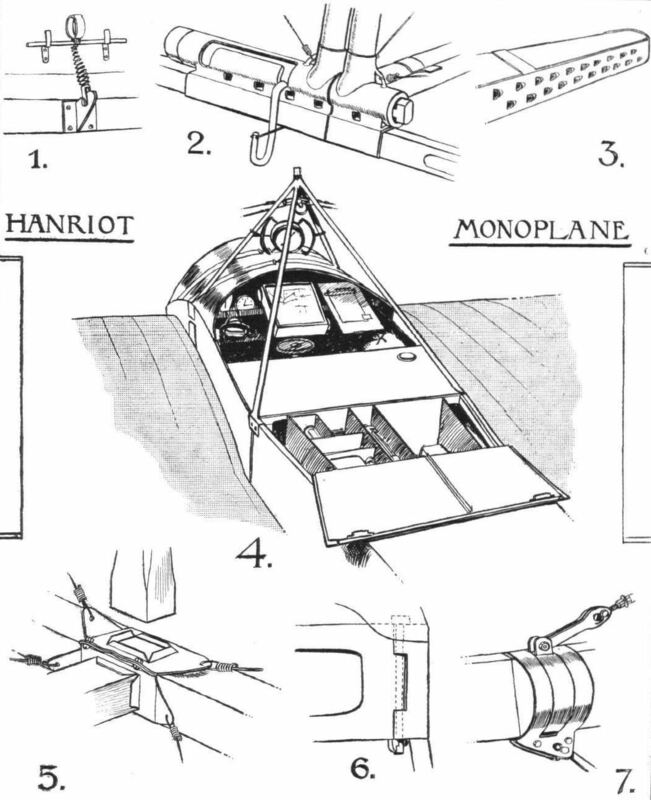 DETAILS OF THE HANRIOT MONOPLANE. - 1. The fitting by which the aluminium side-plates are clipped to the fuselage. 2. 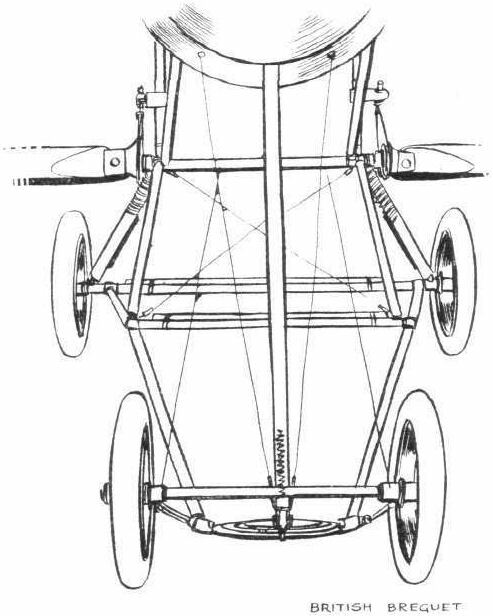 An Interesting fitting by which the fuselage may be divided so that it can fold in two. To dismantle or re-erect the fuselage takes no longer than the time required to operate the bolt of a rifle. 3. Showing how the rear parts of the main skids are shod with steel and punched out to act as a brake. 4. The pilot's cockpit, showing his instruments, the fuel-tank, and his chest of spare parts and fuel. 5. The cross-bracing socket, stamped from sheet steel. 6. One of the four bolts which, being removed, allow the engine, together with its carlingues, to come clear of the machine. 7. The method of attaching the wing wires to the main spars. 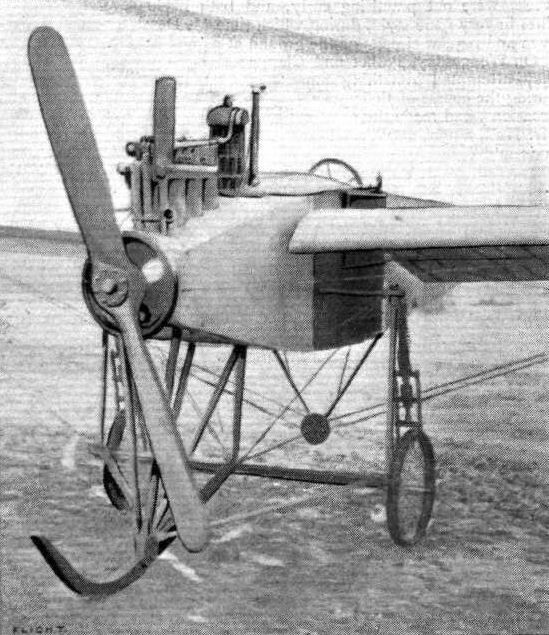 Short S.42 tractor monoplane similar to the Bleriot XI. It became RNAS No.8. 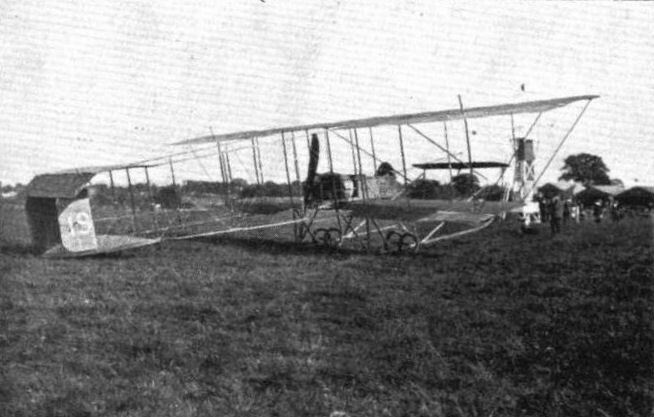 The Short monoplane, front view. 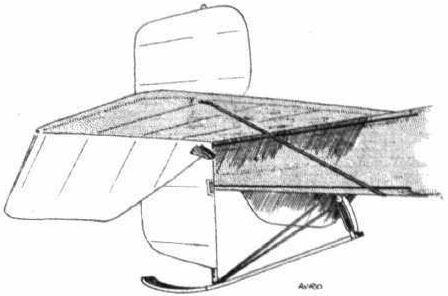 The Short monoplane, back view. 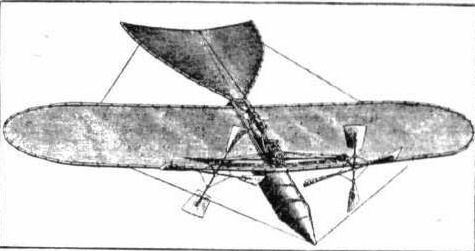 The Short monoplane, three-quarter back view. 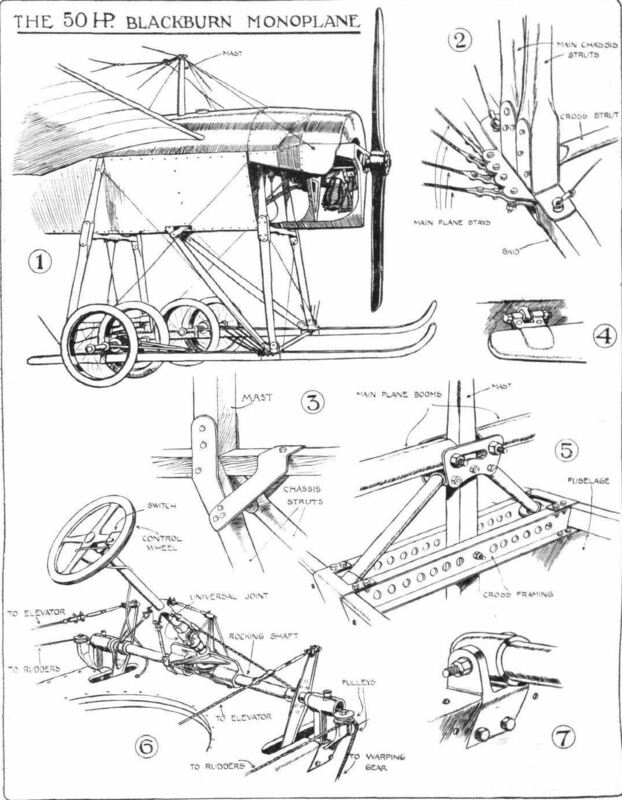 Detailed photograph of the front section of the Short monoplane, showing details of the landing carriage and the mounting of the Gnome engine. 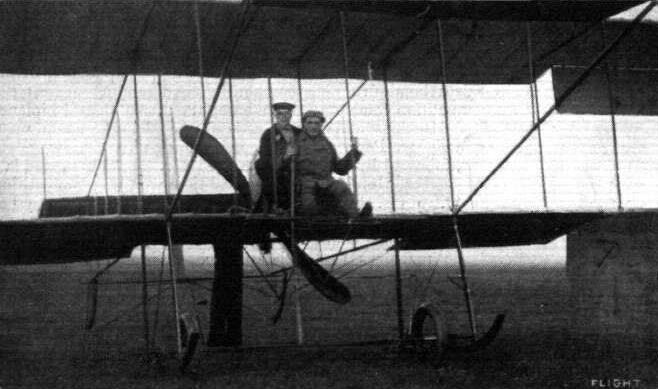 Commander Samson at the lever of the new Short monoplane, on which he carried out successful tests on Saturday morning last. THE SHORT MONOPLA.NE. - Plan and elevation to scale. 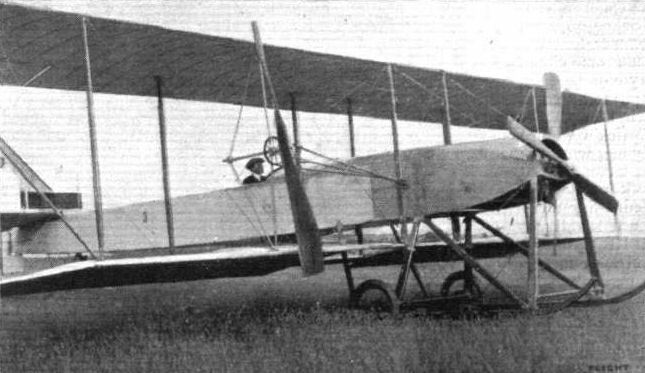 The Avro Type E prototype with 60 h.p. E.N.V. engine after change to radiators. THE NEW AVRO BIPLANE. - View from the front. Leut. Parke flying the new Army Avro biplane over the sheds at Brooklands recently. 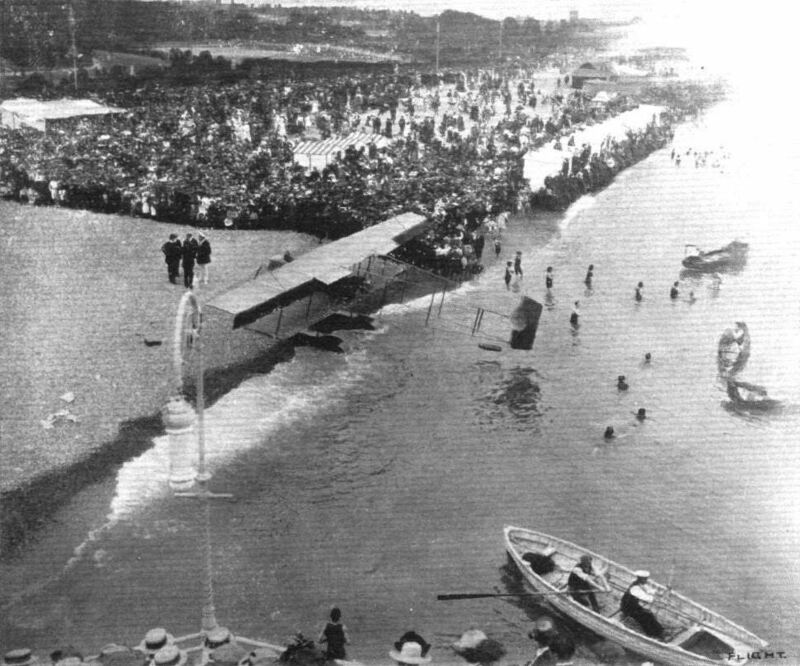 Mr. Copland Perry's mishap on the Tagus, when the engine petered out on the Avro biplane, and he came gently to rest on the water. Making the towing hawser fast; and, on the right, towing in the machine. The front section of the new Avro biplane. 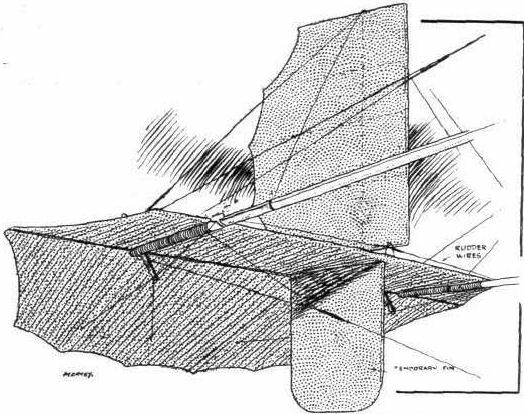 Sketch of the Avro biplane tail. THE NEW AVRO BIPLANE. - Plan and elevation to scale. THE HYDRO-AEROPLANES AT MONACO. 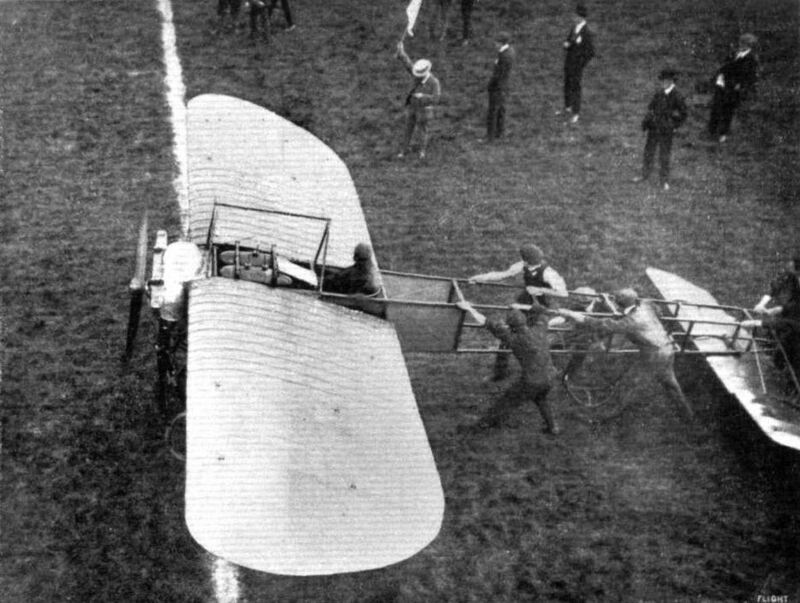 - The Henry Farman biplane, piloted by Fischer, at the starting line. This machine, carrying two on board, secured the leading position in the first day's competition. 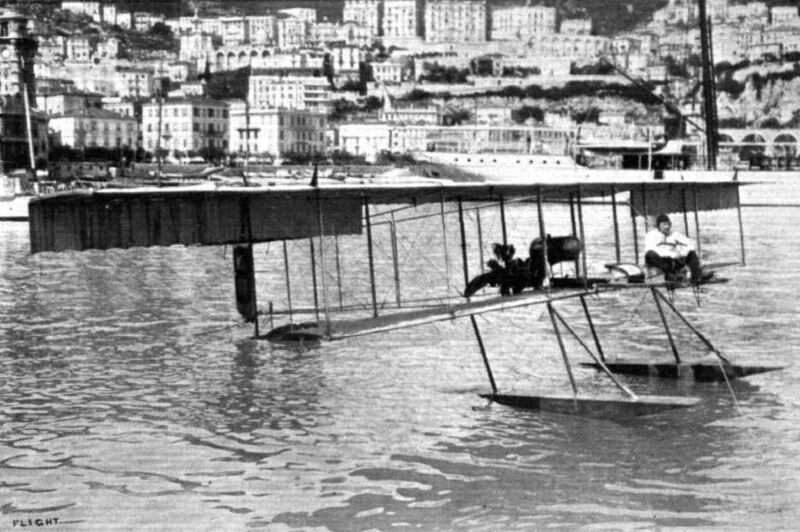 Fischer, with two passengers, on the Henry Farman hydro-aeroplane at Monaco. It is one of these very successful machines which has been acquired on behalf of the British Government. 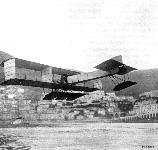 THE WINNING HYDRO-AEROPLANE AT MONACO. 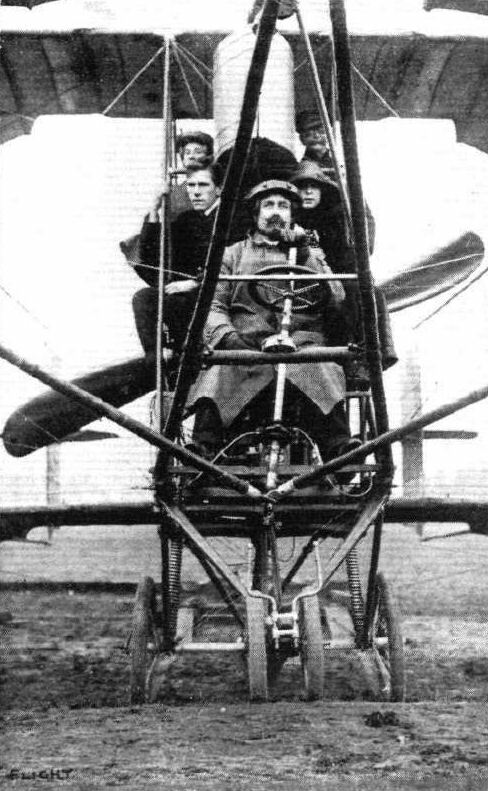 - Fischer on the Farman machine with his three passengers, two of whom travel on the forward floats. NAVAL REVIEW AT SPITHEAD. 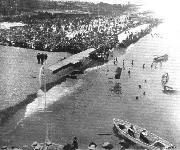 - One of the Farman hydro-aeroplanes after its arrival on the beach at East Southsea. 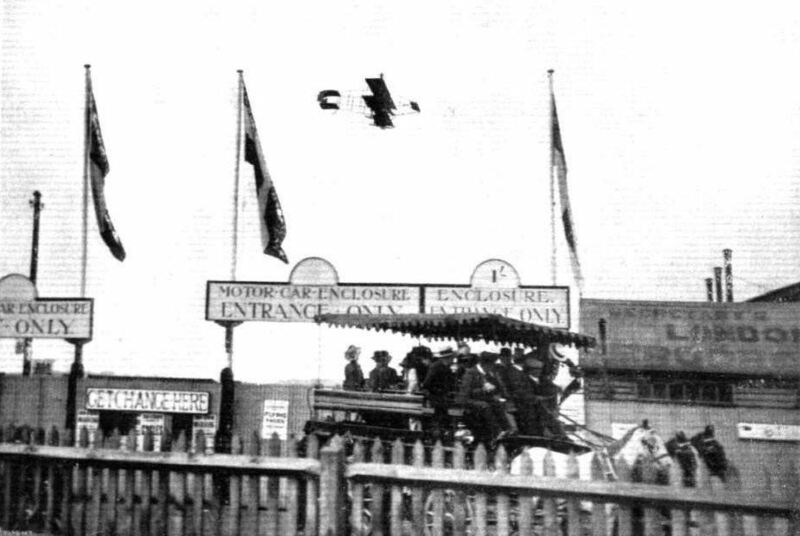 THE HENRY FARMAN HYDRO-AEROPLANE AT SOUTHSEA. - A couple of snaps taken with a vest pocket Kodak by Horace J. Everett. THE HYDRO-AEROPLANES AT MONACO. 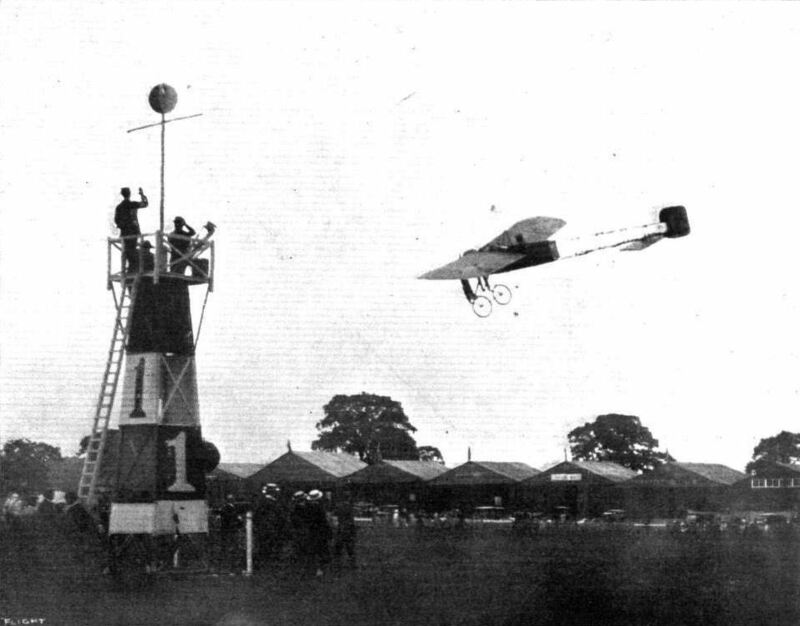 - The Maurice Farman making a trial flight. 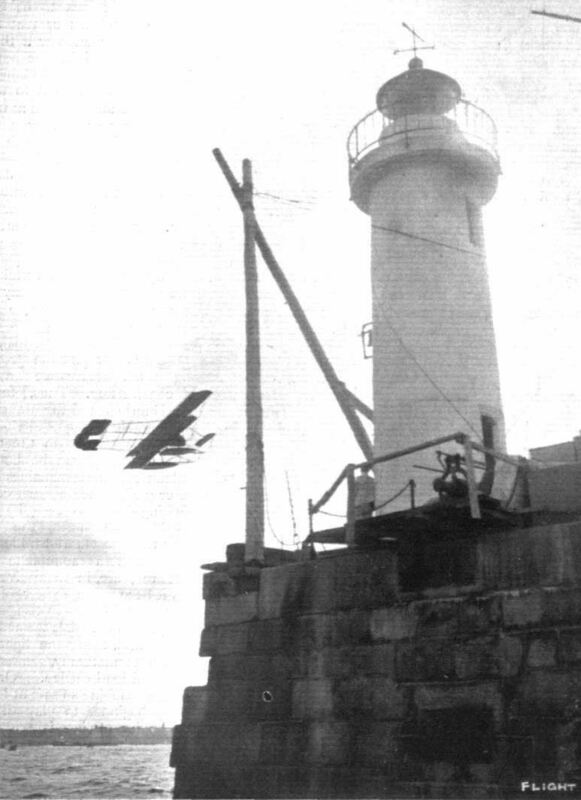 ST. MALO-JERSEY HYDRO-AEROPLANE RACES. 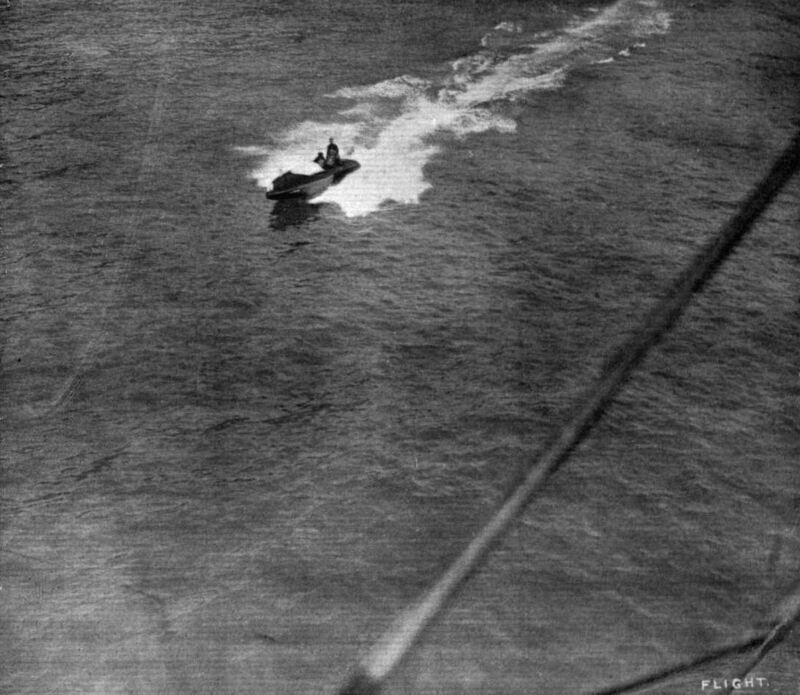 - Renaux, on the Farman biplane, rounding the St. Malo lighthouse. 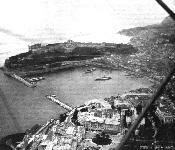 MOTOR BOAT RACING AT MONACO AS SEEN FROM RENAUX'S FARMAN BIPLANE. - A snap of "Sigma III" the racing craft which made such splendid time in the Omnium Race. 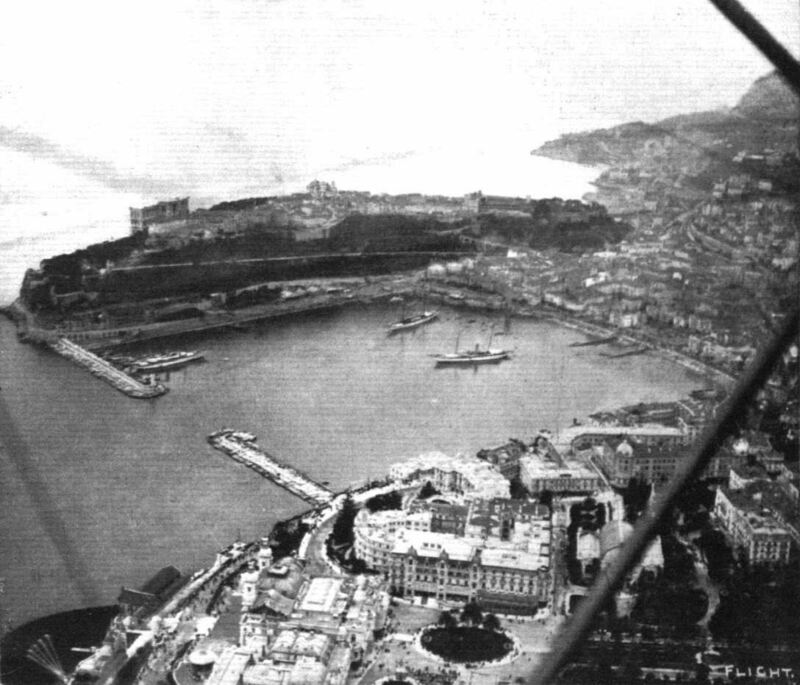 A bird's-eye view of Monaco Harbour and surroundings taken from Renaux's Maurice Farman aquaplane during the recent motor boat and hydro-aeroplane meeting. 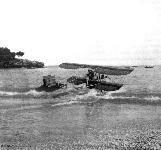 A hydro-aeroplane - the Caudron - taking off from the shore in one of the tests at Monaco. 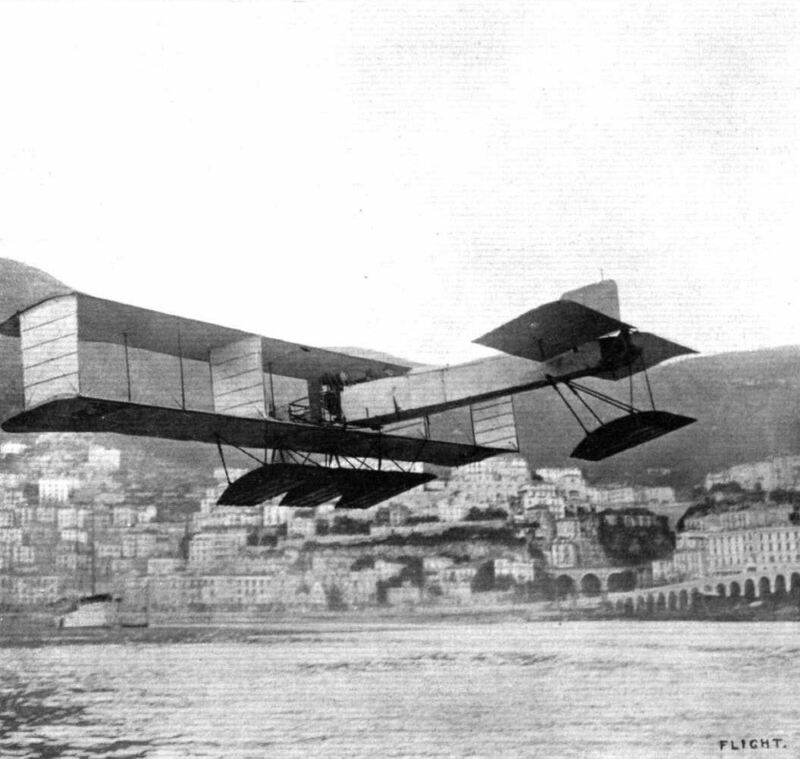 THE CAUDRON HYDRO-BIPLANE AT MONACO. - On the left she is entering the water. 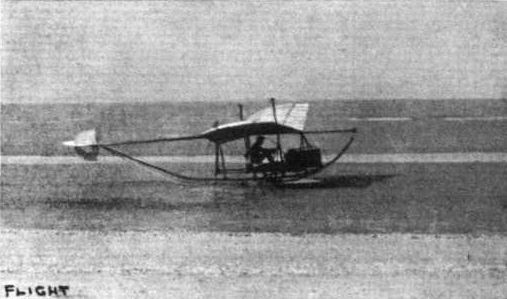 In France it is termed "a true aero-amphibian," for, by virtue of its combined wheel-and-float undercarriage, it can rise from and land on both land and water. 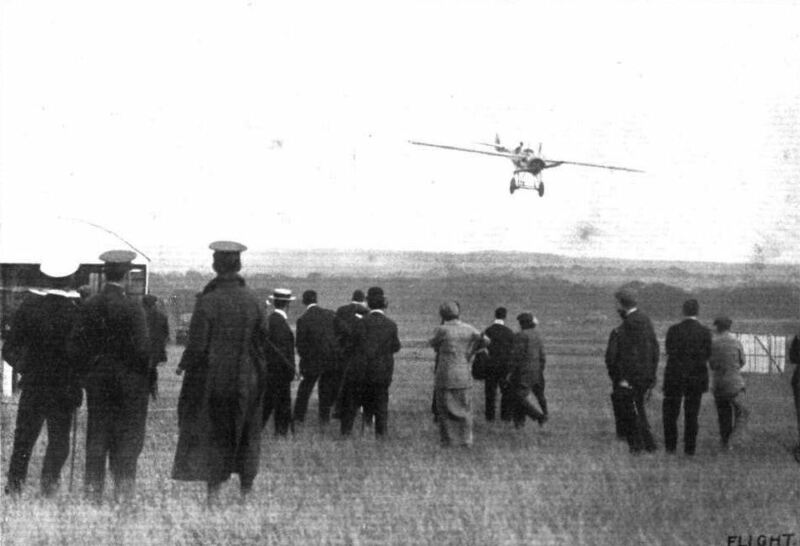 On the right, the Caudron hydro-biplane landing after a flight. It is interesting that this machine requires no help other than that of its own engine to come back to land after running over the sea. The Caudron hydro-biplane in flight. 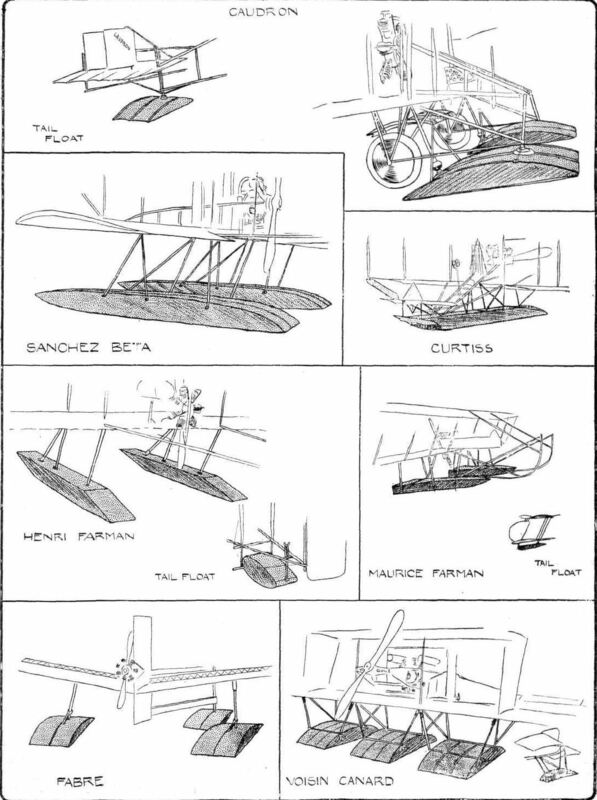 Some of the types of float used on present-day hydro-aeroplanes, as seen at the Paris Aero Salon. AVIATION IN AUSTRALIA. 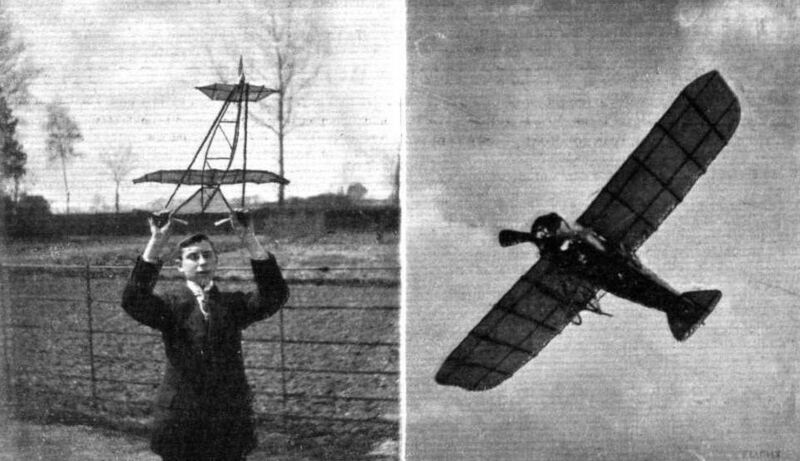 - Mr. J. R. Duigan and his Wright-type glider, built 1909, started in 1908. 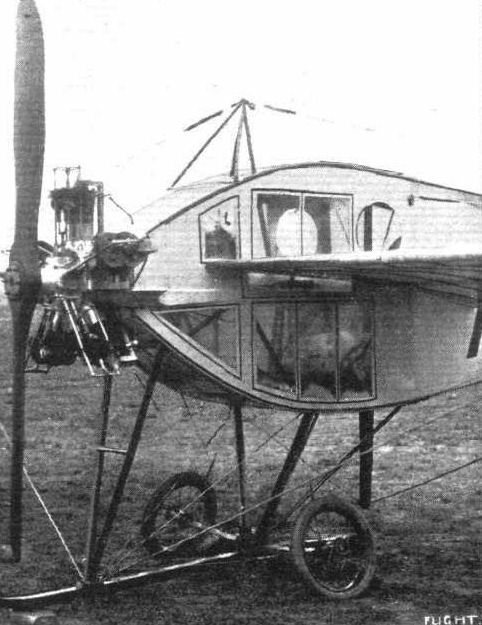 THE TOTALLY ENCLOSED AVRO MONOPLANE. - Slde view. THE AVRO MONOPLANE. 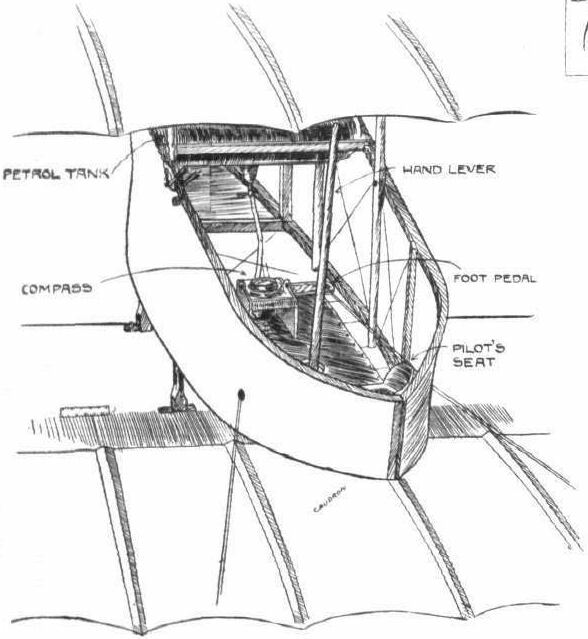 - Detailed view of the landing gear, engine mounting, and the non-inflammable celluloid windows through which the pilot sees what is going on around him. 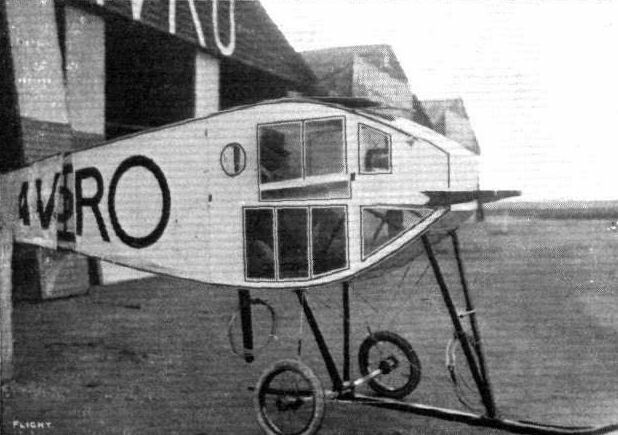 The Avro monoplane, as seen from the front. THE NEW AVRO MILITARY PATTERN ENCLOSED-TYPE MACHINE. - View of the chassis and front part of the fuselage. AN IMPRESSION OF SPEED. 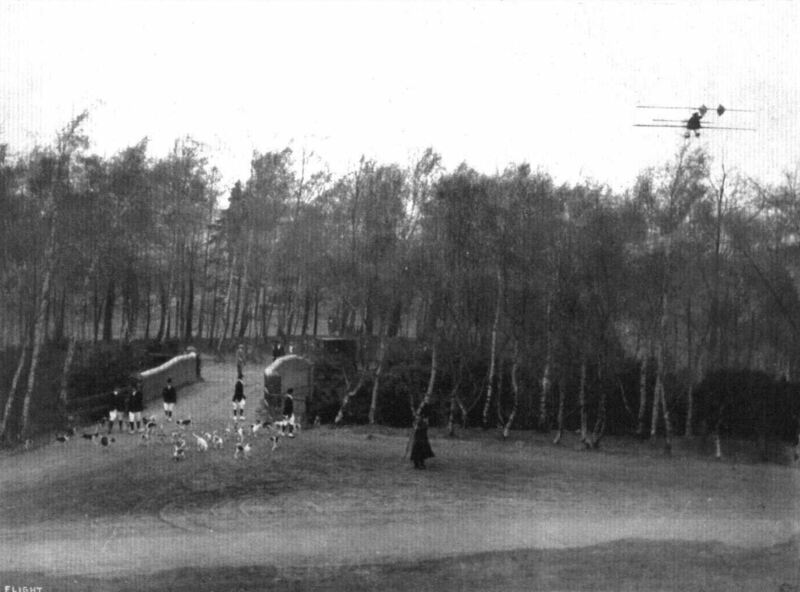 - A genuine photograph of the new enclosed Avro monoplane, which was recently flying at Brooklands, secured by FLIGHT photographer in one-thousandth part of a second. Showing how the fuselage longerons are strengthened by the application of three-ply wood on the Avro monoplane. 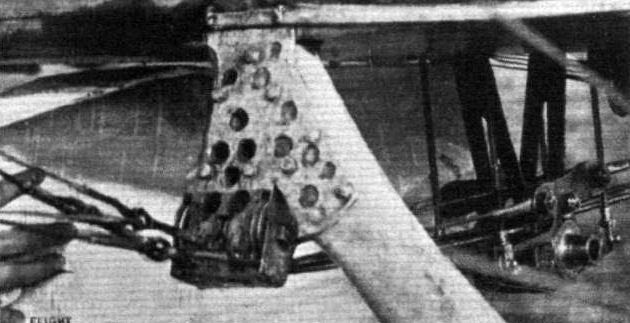 Details of the Avro Skid Attachment. - A rubber insert is arranged between the skid and the tubular steel struts supporting it. 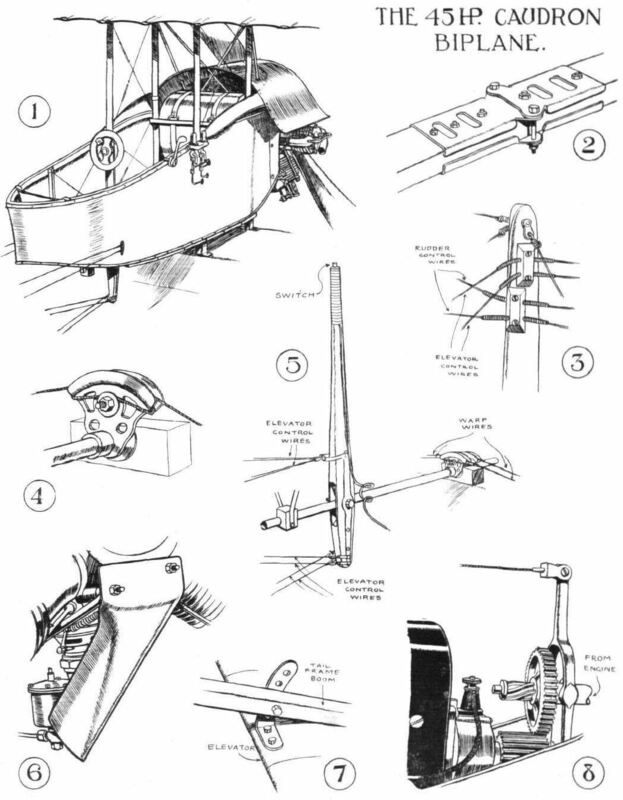 DETAILS OF THE CONTROL OF THE AVRO MONOPLANE. - The whole of the rear wing spars, together with the upper and lower cabane strut, rocks in a single unit. 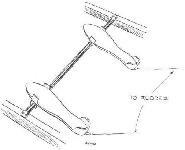 The Avro foot pedals by which the rudders are controlled. THE AVRO MONOPLANE. - Plan and elevation to scale. 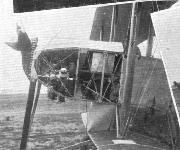 The Canterbury (New Zealand) Aero Club glider in flight, and on the right is seen a group of members repairing the damage after the smash. 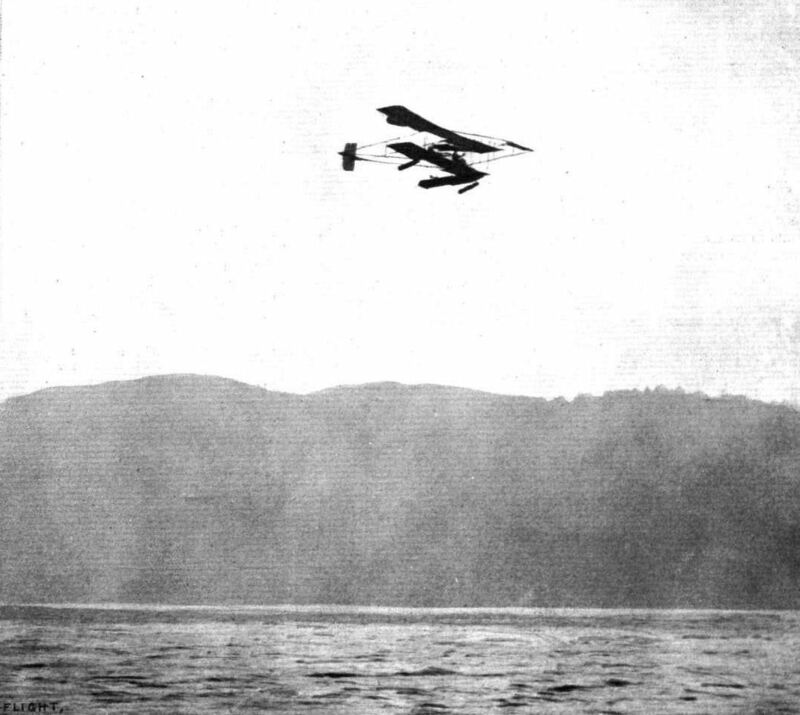 The Gnosspelius hydro-monoplane on Lake Windermere during a 12-mile flight under the pilotage of Mr. Kemp last week. 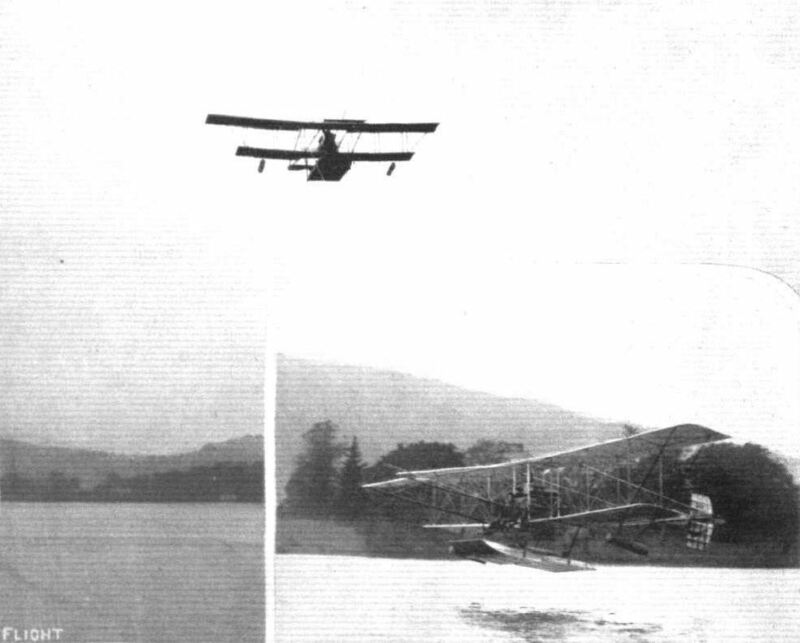 THE GNOSSPELIUS HYDRO-MONOPLANE ON LAKE WINDERMERE. - View from the front after alighting on the water. 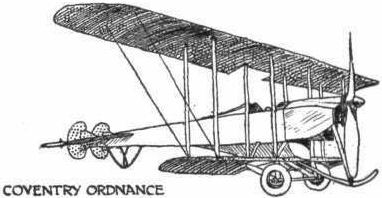 THE COVENTRY ORDNANCE BIPLANE. - Side view. The Coventry Ordnance biplane, as seen from in front. 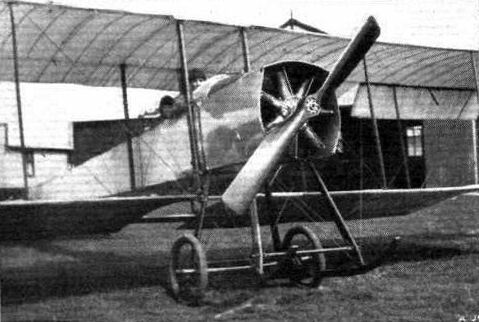 The Coventry Ordnance biplane from the rear. THE MILITARY COMPETITION MACHINES. 5. The arrangement of the tail. 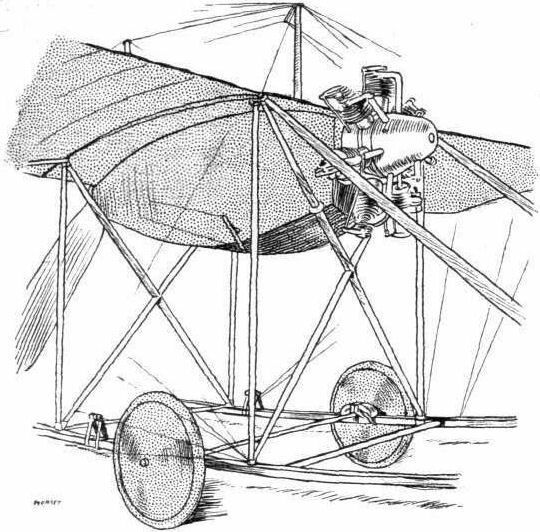 Details of the front section of the machine, showing the engine mounting, the main hickory skid, and the unsprung landing gear. Details of the front part of the machine, showing the housing for the 100-h.p. Gnome and the chain transmission. THE MILITARY COMPETITION MACHINES. 7. The body with side casing removed, showing the 100-h.p. Gnome motor. 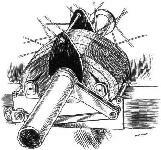 The stream-line encased warping pulley for the Coventry Ordnance biplane. Detail of the Coventry Ordnance landing chassis, showing the small hickory skid intended to protect the chassis should anything happen to the wheels. The wheel is omitted to avoid complication. One of the aluminium inspection doors fitted to the planes of the Coventry Ordnance biplane. The sketch shows the method employed for the joining of the wing sections. Inset is the quick release pin. These are used throughout the machine to minimise the time necessary (or dismantling and erection. 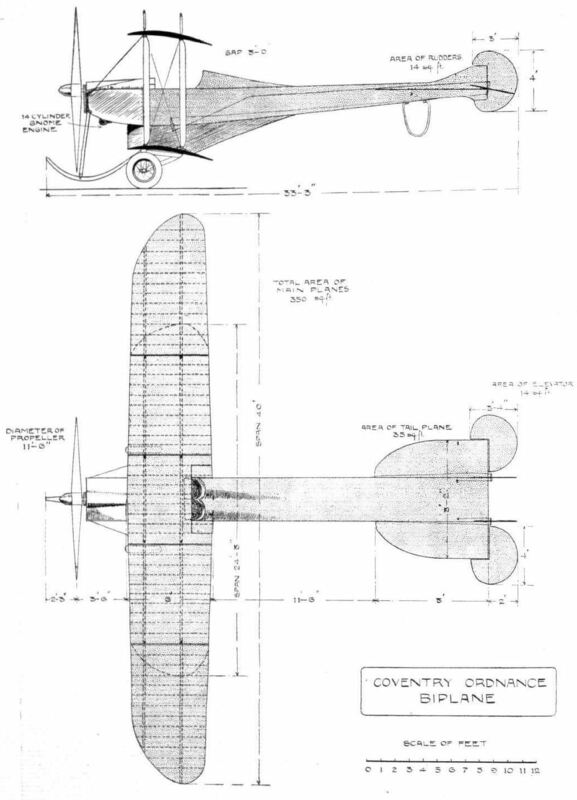 THE COVENTRY ORDNANCE BIPLANE. - Plan and elevation to scale. The land station of the Naval Air Fleet at Portland during the manoeuvres of the Fleet last week. The NAVY HYDRO-AEROPLANES. 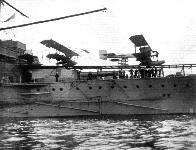 - A side view of the "Hibernia" showing the two hydro-aeroplanes on the launching platform especially constructed for this purpose. 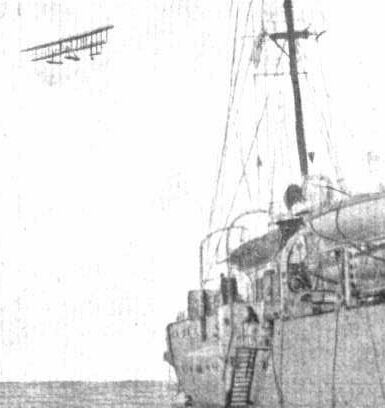 Commander Samson flying on his naval hydro-aeroplane over the King's yacht at Portland last week. The all-steel Blackburn monoplane that has recently arrived at Brooklands aerodrome. 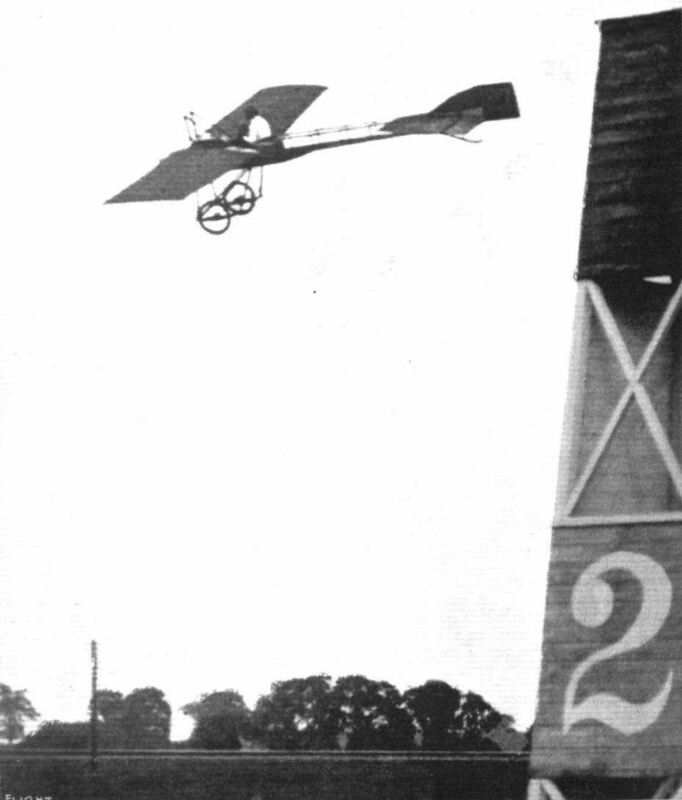 Mr. Will Moorhouse in his monoplane at Brooklands. 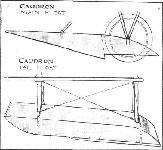 Three views of the Gallaudet racing monoplane, which has a 3-bladed propeller at the rear. 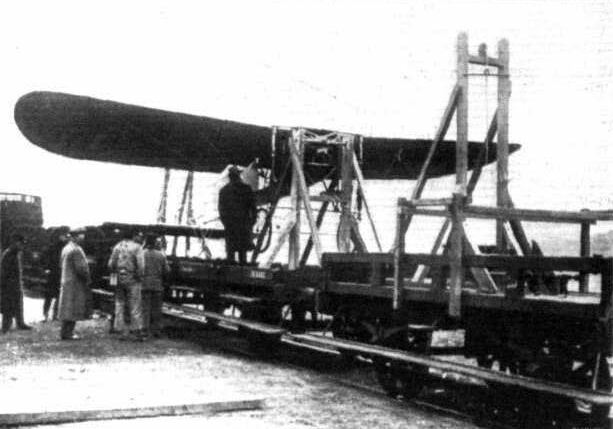 The wings are 32 ft. span, and they have a chord of 8 ft. Wing-warplng is fitted, the mechanism being built into the planes. 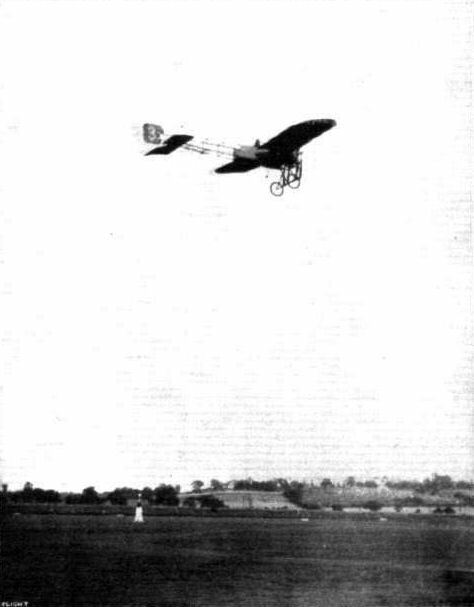 The Vickers monoplane, with Mr. C. MacDonald at the wheel, flying in a cross-country handicap at Brooklands at Whitsun. 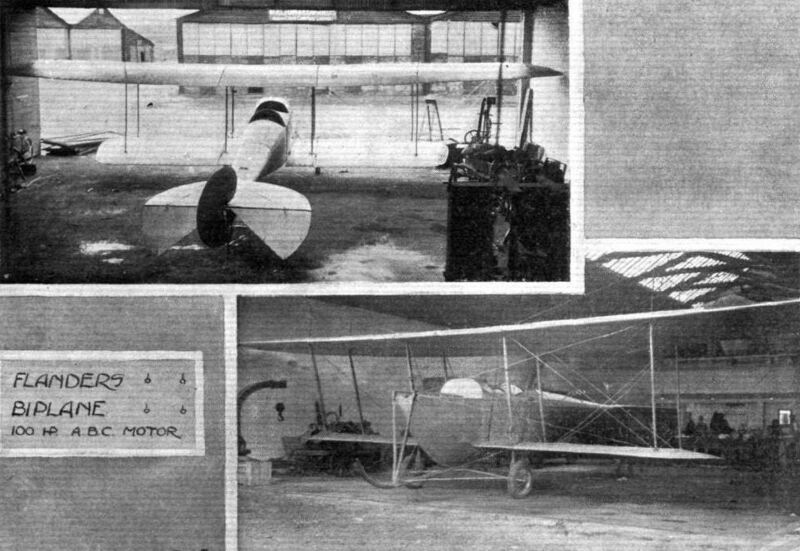 A trio of Vickers monoplanes at the Vickers Brooklands School. 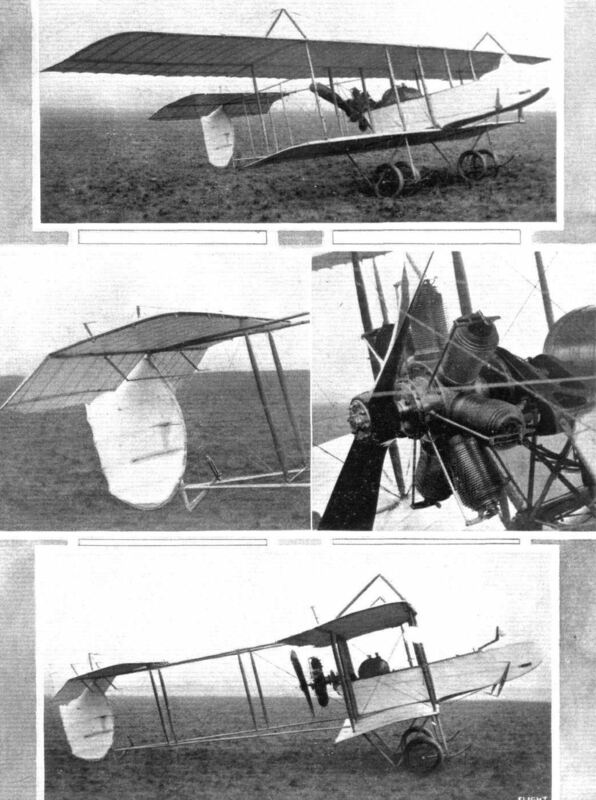 The Etrich 1912 military monoplane, from the side and front. 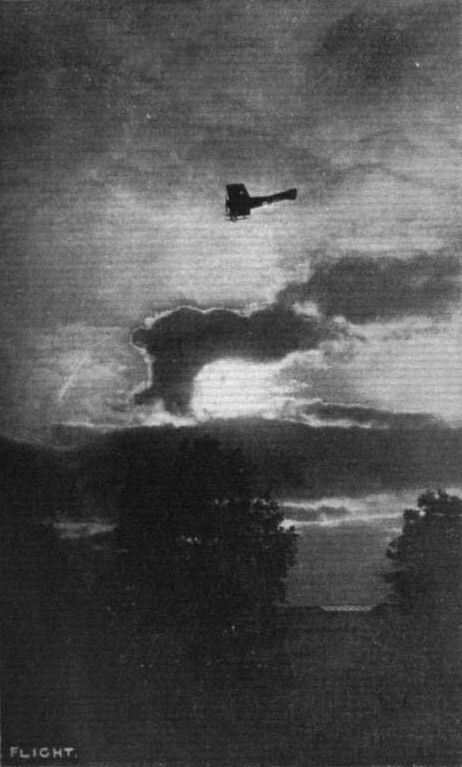 Inset the machine is seen in flight. One of the Etrich machines has just been acquired by the British Government. CODY MONOPLANE. - View from in front. CODY MONOPLANE. - Side view. CODY MONOPLANE. - Three-quarter view from behind. CODY MONOPLANE. - View from behind. 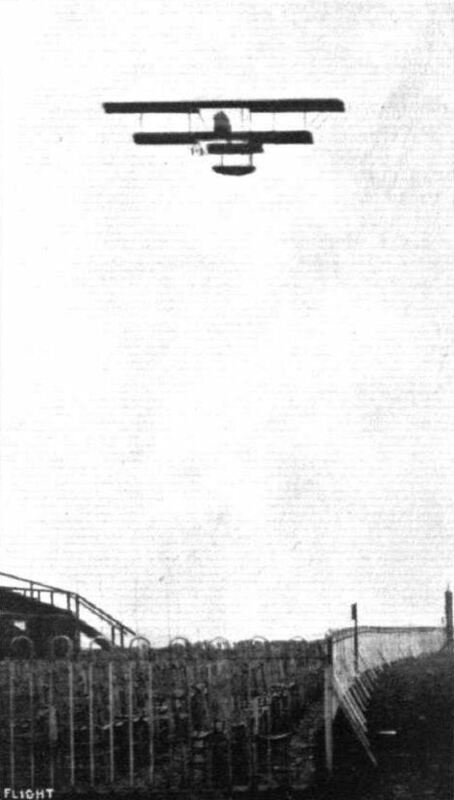 Enlarged view of the tail members of the Cody monoplane. 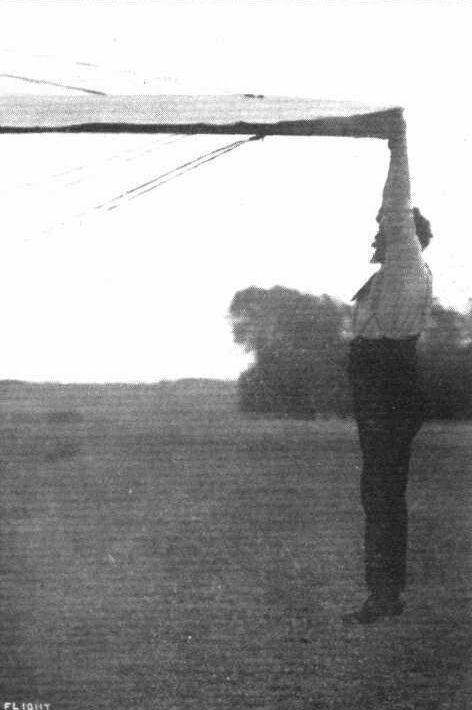 S. F Cody gives a slight test of the strength of the top bracing ot his monoplane by hanging his 200 lbs. weight on to the extreme tip of one of the wings. 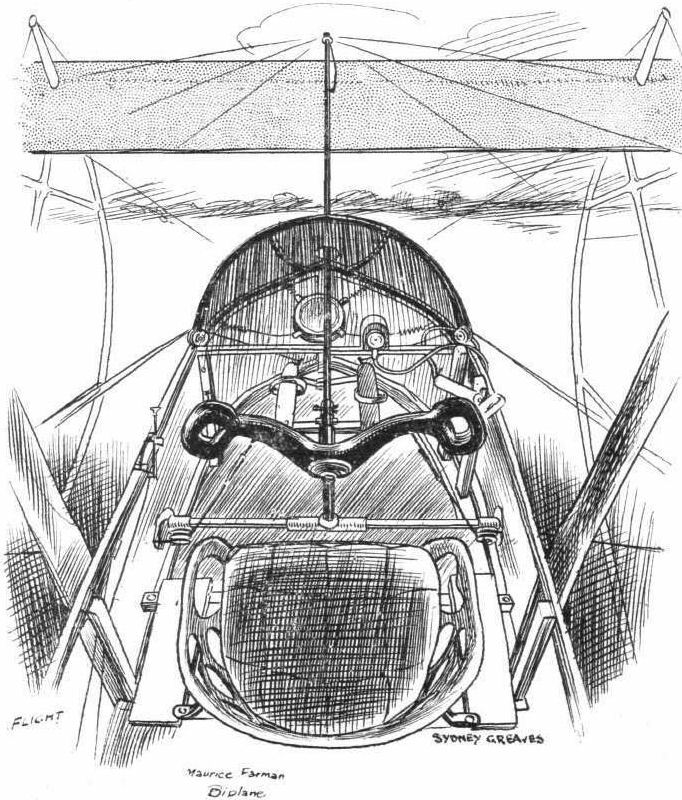 Sketch of the inside of the cockpit of the Cody monoplane, showing the two seats and the centrally-disposed control column. It also gives a good idea of the extent of view that is obtainable from the machine, not only through the transparent covering of the cabin, but over the side of the body. 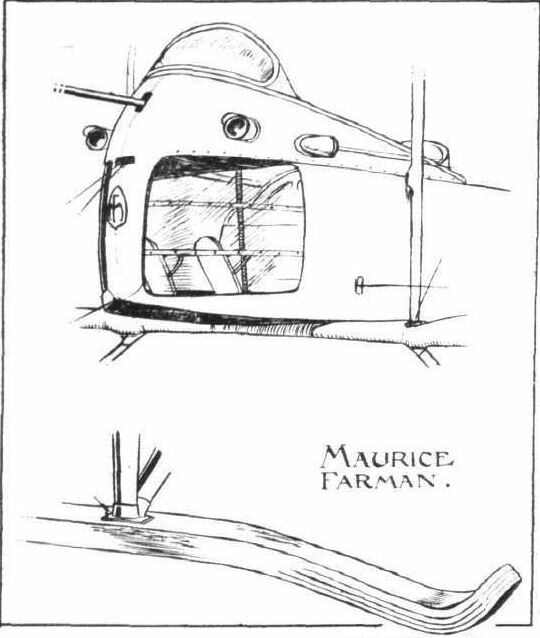 On the right is a sketch from the outside of the cockpit. The covering is suggested as being cut away in order to make clear details of the warping control. S. F. Cody in the cabin of his new monoplane, showing the control-levers through the windows. Showing how the rear elevators are operated by the long bamboo connecting-rods, and how the rear skid is attached. 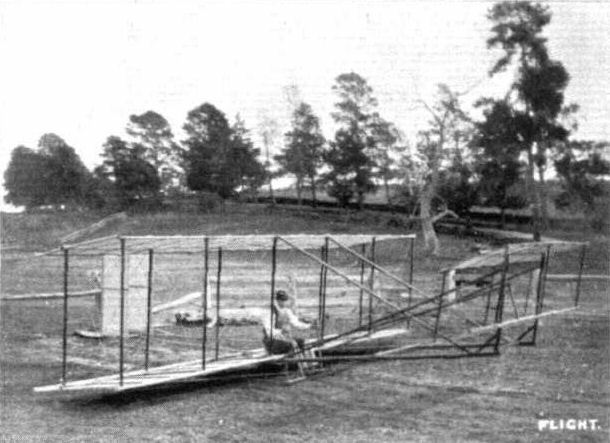 The landing chassis of the Cody monoplane. 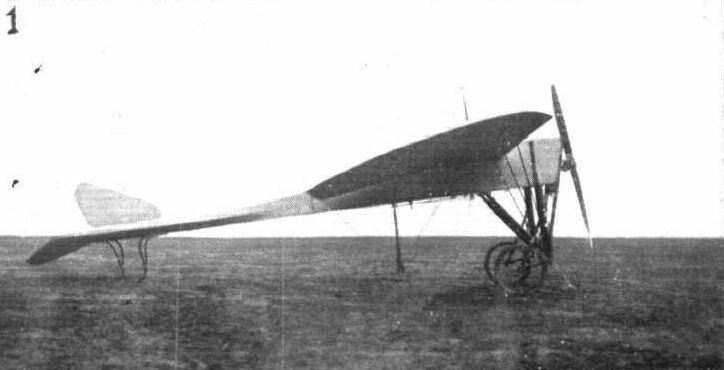 THE CODY MONOPLANE. - Plan and elevation to scale. THE MILITARY COMPETITIONS. 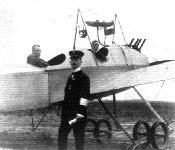 - The Mars monoplane, entered by Mr. C. E. Kny and constructed by the Deutsche Flugzeug Werke at Leipzig. It will carry the No. 23 in the Military Trials. 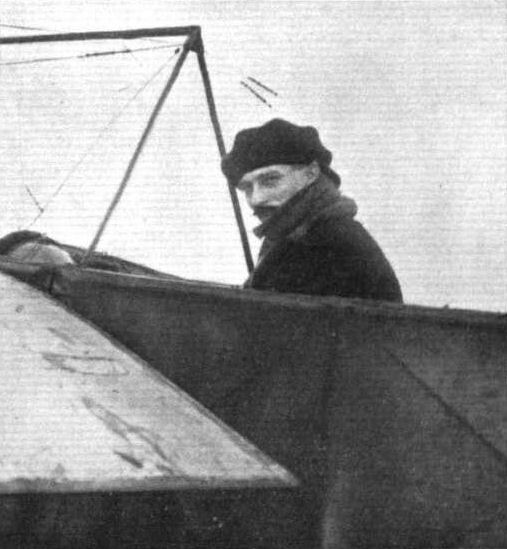 Legagneaux, on his Zens monoplane, just getting away at Compiegne for his passenger-carrying records when he covered 150 kiloms. in 1h. 13m. 4s. NEW FORM OF LANDING CHASSIS. - That of the new Zens monoplane, which has a single skid to which is strapped, by rubber bands, the axle joining the two landing wheels. The body of the machine is surported by a single rank of chassis struts, and is steadied by two shock-absorbers in tension, one on either side. 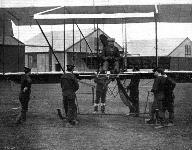 The Piggott Biplane, at Salisbury Plain, entered for the Military Aeroplane Trials. - This is the smallest machine of its class yet built. It has a span of 25 ft. 6 ins., and an area of 100 sq. ft. to support 300 lbs. weight, exclusive of pilot, fuel and oil. It is a beautifully made little machine, but obviously quite a miniature in actual size. There is accommodation for pilot and passenger, both of whom look out over the main planes. 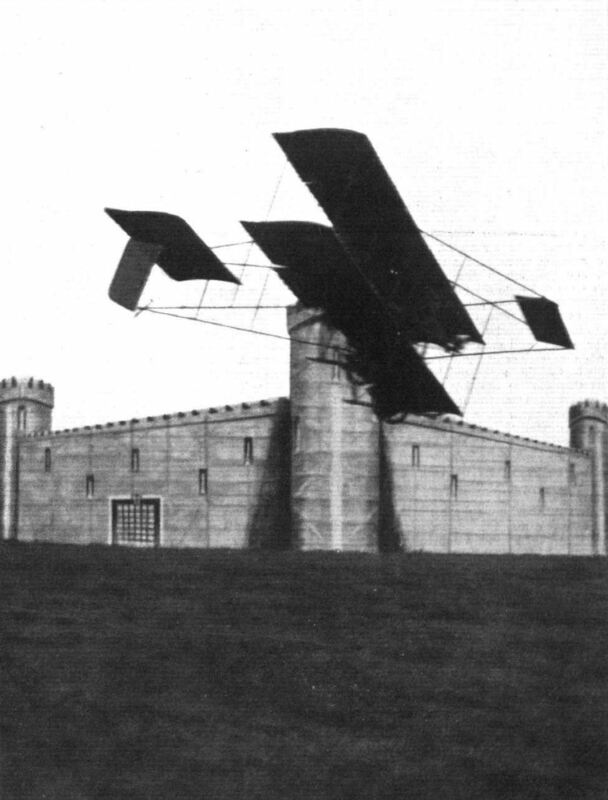 Piggott biplane was an unsuitable machine for military use although entered for the trials of 1912. 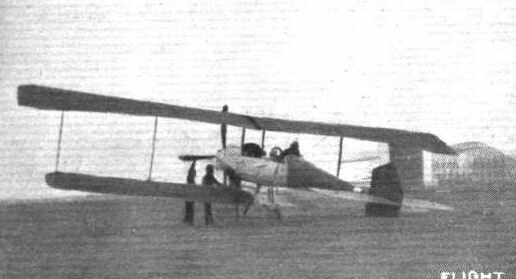 The Mersey monoplane, fitted with a 45-h.p. Isaacson engine, at the Army Competitions. THE MERSEY MONOPLANE. - Sketch of the front central section of the machine. THE MERSEY MONOPLANE. - The tail of the Mersey monoplane. THE MILITARY COMPETITION MACHINES. - The 100-h.p. Flanders biplane, which will be flown by Mr. Raynham. The photographs were taken on Monday last in the A.B.C. engine shops, where the machine was having its motor installed. Bristol Coanda Military Trials Monoplane with fin which secured a third prize of L500 in the Military Trials. THE MILITARY COMPETITION MACHINES. - The Bristol monoplane. Two machines of this type have been entered. One will be flown by Mr. James Valentine, and the other fay Mr. H. Busteed. THE MILITARY AVIATION TESTS. 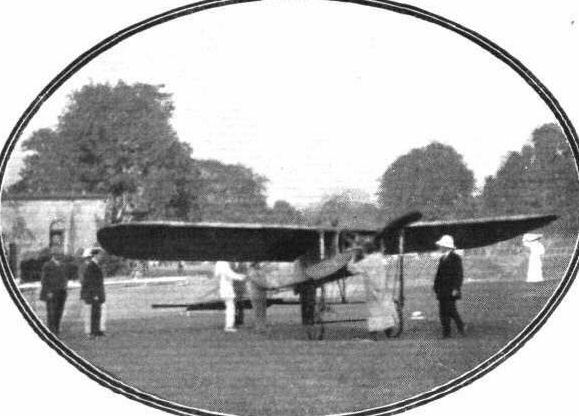 - Busteed preparing to start off for a trial spin on one of the Bristol military monoplanes. BRISTOLS IN ROUMANIA. - A snapshot at the Bucharest Military Aerodrome. Standing in front of the 80-h.p. 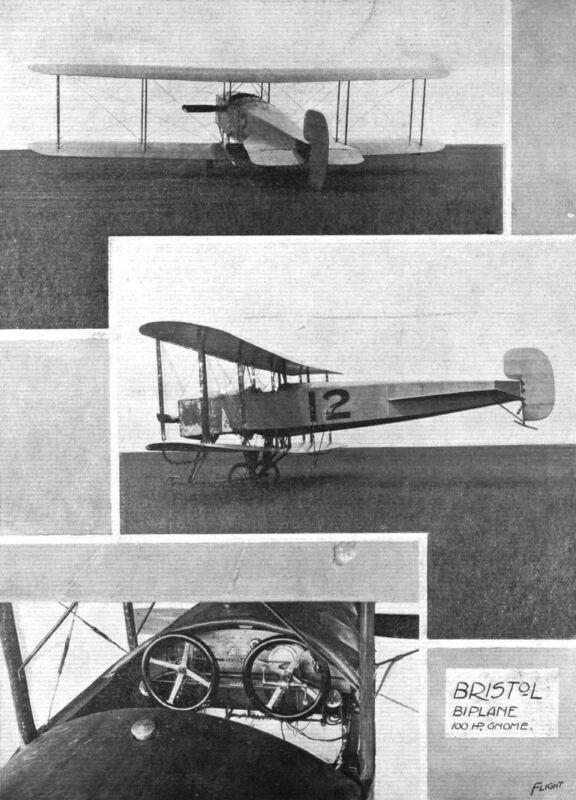 Bristol monoplane, from right to left: Lieut. 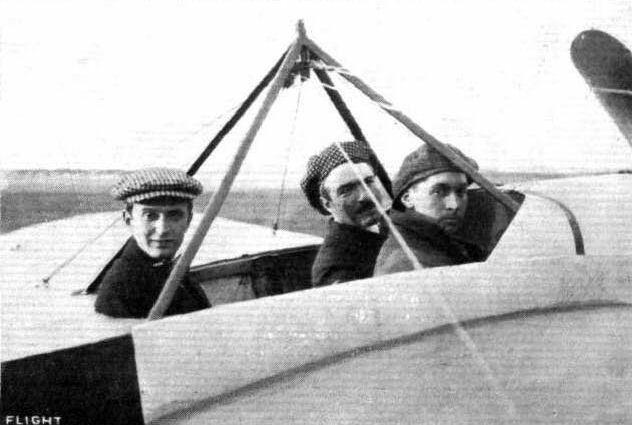 Protopopescu (who on Thursday week, after only three days' tuition, made a flight of an hour, getting up to 2,000 ft.), another Lieutenant (who acted as observer in the official trials), Mr. C. H. Pixton, Major Macree (in command of the Flying Corps), beside whom is a Lieutenant (who is now being taught by Lieut. Protopopescu), and the two mechanics who accompanied Mr. Pixton to Roumania. 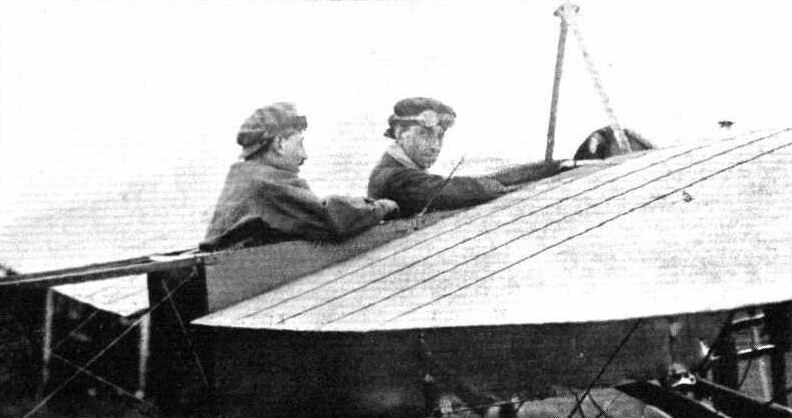 Messrs. Busteed (in the pilot's seat) and Harrison, snapped just before starting away in a 31-15 m.p.h. wind for a flight on the new military Bristol monoplane. 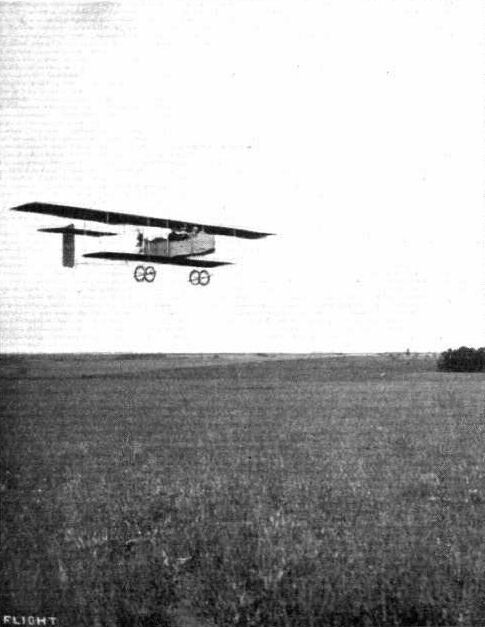 The picture on the left shows the machine in flight. 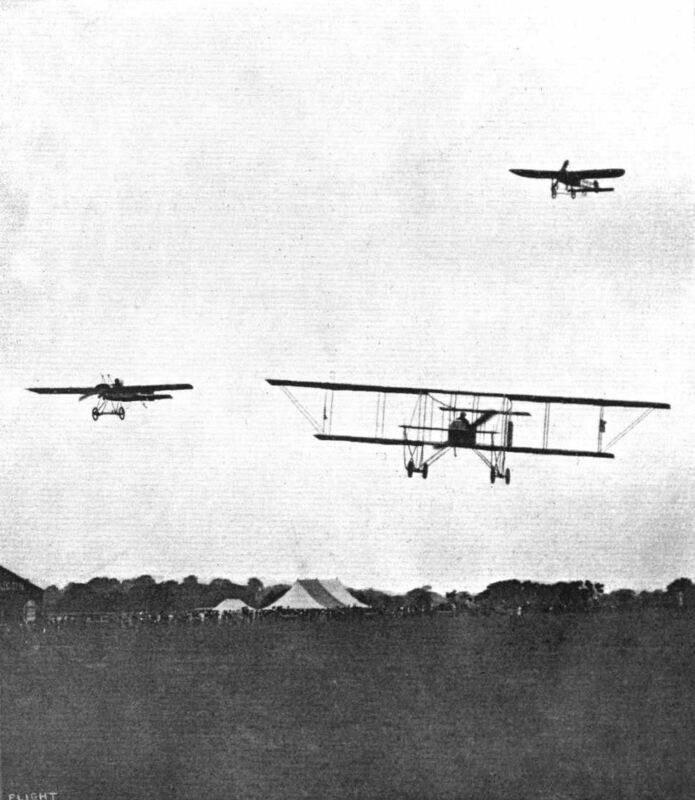 THE BRISTOL MILITARY MACHINES IN FLIGHT. - In the centre the monoplane, and on either side the tractor biplane. THE BRISTOL MONOPLANE. - One of the two British representatives at the Salon. Representative stand at the Salon - the Bristol. 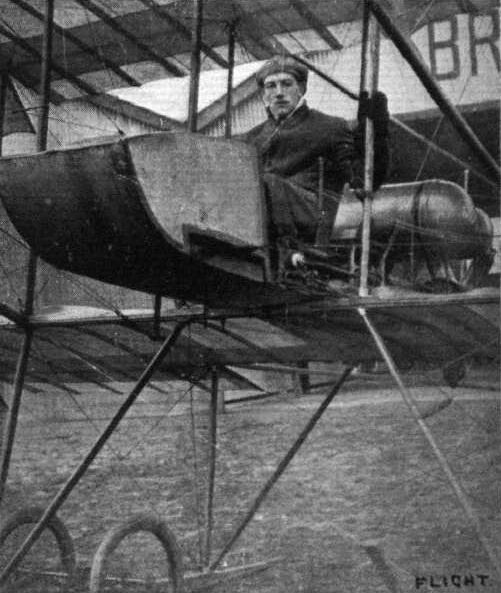 M. Coanda, the designer of the Bristol monoplane, which did so well in the various tests in the British Military Aeroplane Trials. 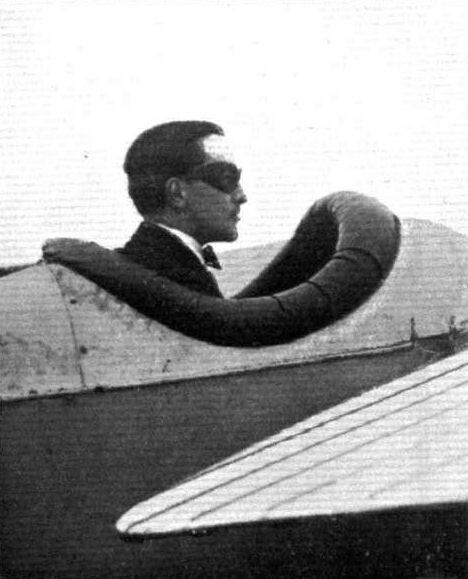 Mr. Busteed, the pilot of the Bristol monoplane No. 14, which obtained one of the L600 third prizes for British aeroplanes in the Military Trials. Details of one of the front wheels of the Bristol. THE MILITARY COMPETITION MACHINES. - The Bristol tractor biplane. The machine seen in the photographs has a 100-h.p. 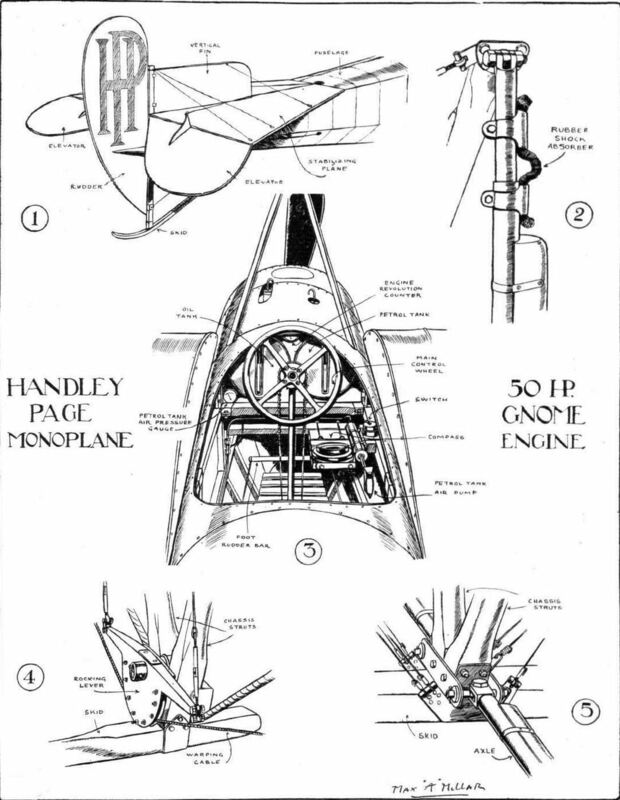 Gnome engine, and will be flown by Mr. H. Pixton. The other is equipped with a 70-h.p. Mercedes engine, and will be piloted by Mr. E. C. Gordon England, its designer. Inset are shown the details of the dual control. THE MILITARY AEROPLANE COMPETITION. - Gordon England setting out for a flight on his Bristol biplane. THE MILITARY AEROPLANE COMPETITION. - Pixton's Bristol being run out of its crate. 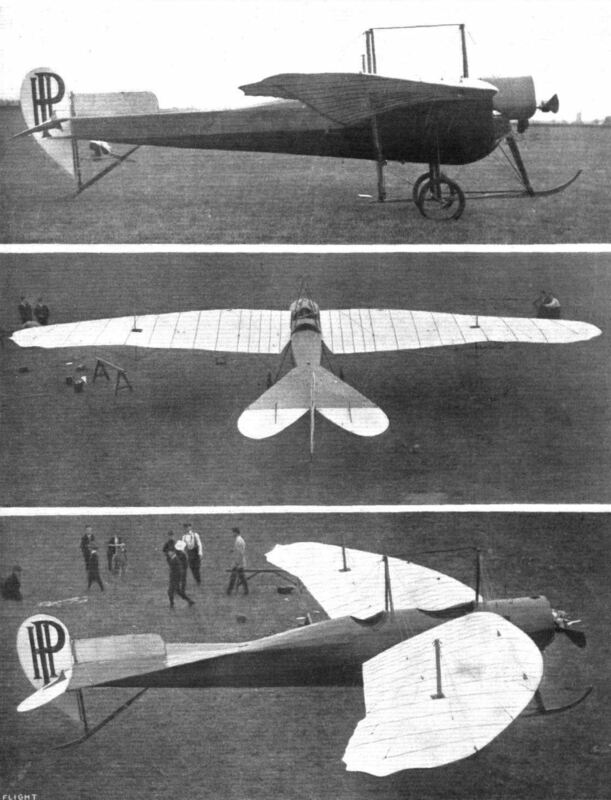 Three views of the 75-h.p. Chenu-motored Martin-Handasyde mono, in the Army Competitions. THE MILITARY AVIATION TESTS. - Assembling machines under observation. The Martin Handasyde being assembled. 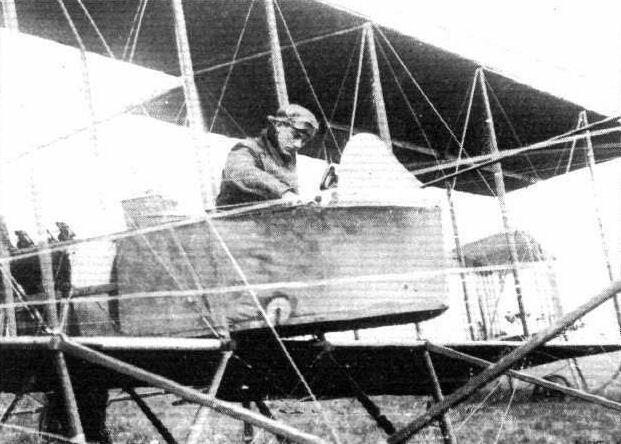 Gordon Bell piloting the Martin-Handasyde mono, at Lark Hill, Salisbury Plain. The Vickers (Martin-Handasyde!!!) monoplane making a demonstration flight at Brooklands Aerodrome during the British Motor Cycle Racing Club's Meeting on Saturday last. 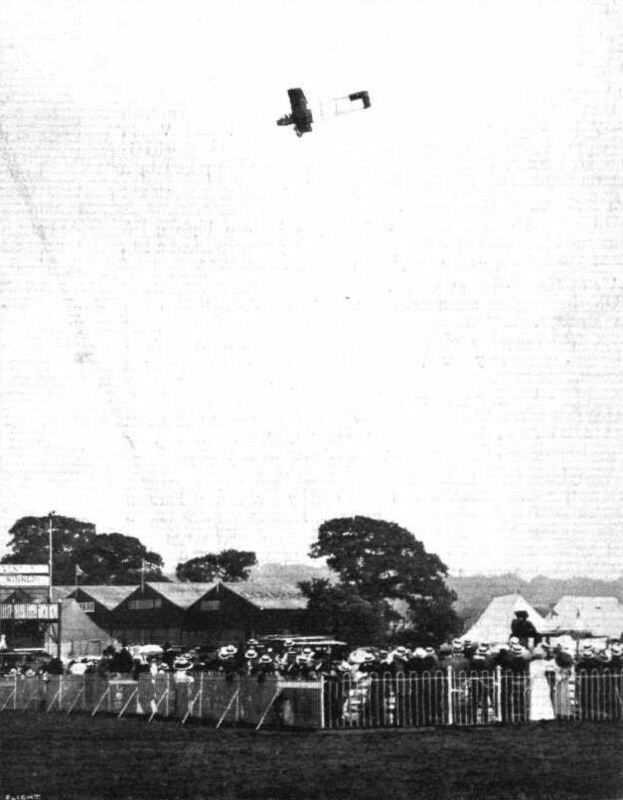 The Martin-Handasyde monoplane, with Petre in charge, over Brooklands. In the distance is Sopwlth's biplane, with Hawker up, having a try for the Michelin Cup. The shock-absorbing device (on the left) on the Martin-Handasyde monoplane, showing the base of the central rigid mast to which the warp-wires are attached. The construction of the under-carriage is such that this mast is protected from landing shocks, which do not, therefore, derange any of the vital cable connections. 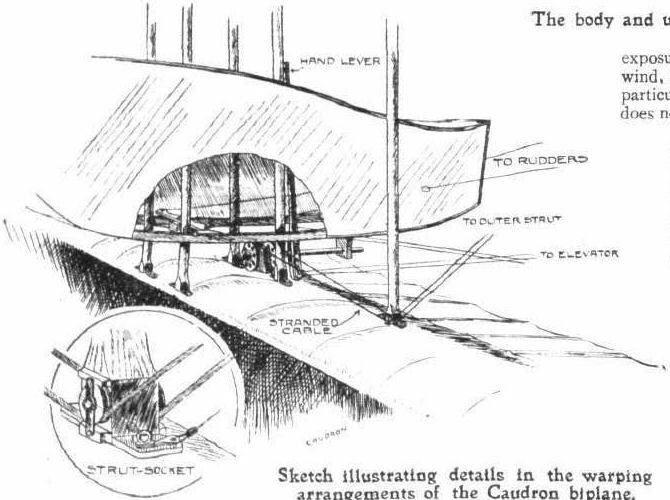 On the right is a sketch illustrating the attachment of the supporting-struts to the front end of the skid, an example of simple yet sound construction. Capt. 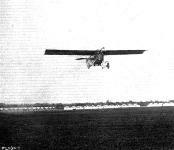 Conneau (Beaumont) on his "Donnet-Leveque" in full flight over the Seine in connection with his Paris to London river and sea flight. 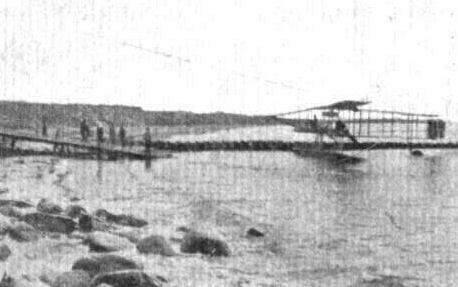 The disappearing landing-chassis of the Donnet-Leveque hydro-biplane. 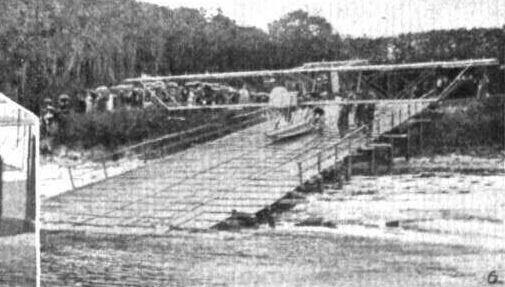 The water-skid at the tail of the Donnet-Leveque hydro-biplane. 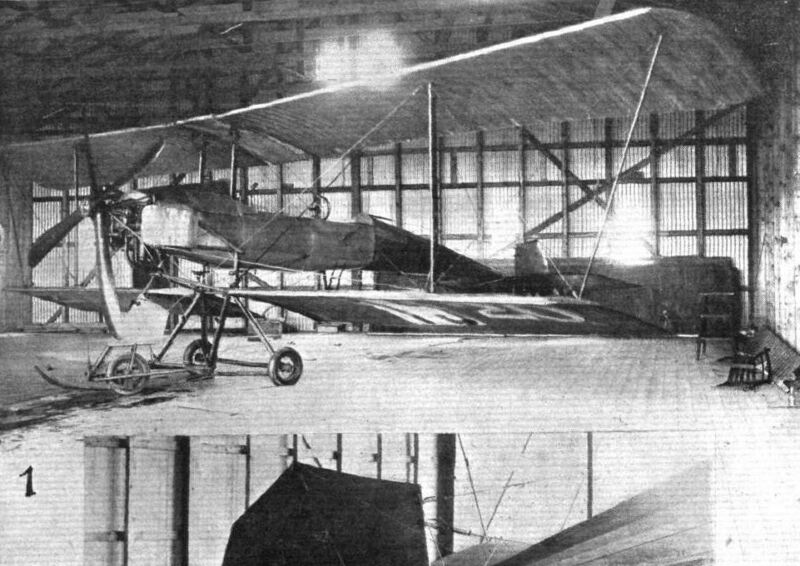 The Avro biplane in its shed after a flight in the Military Aeroplane Trials, showing the cabin door open through which access to the pilot's seat is obtained. THE MILITARY AEROPLANE COMPETITION. - The Avro biplane being assembled. This machine won the Assembling Test by being prepared for flight in 14 mins. 30 secs. Inset are the designer and pilot. 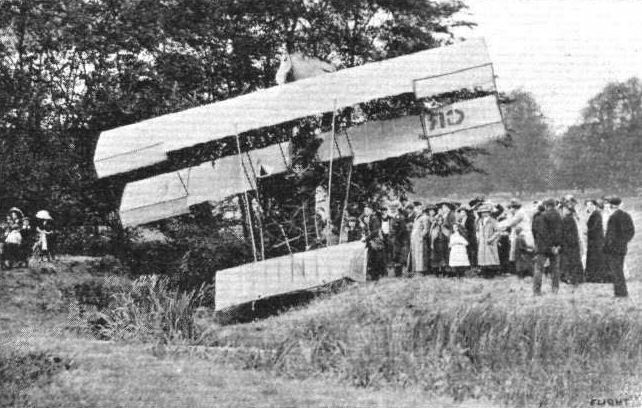 Taking home the wreckage of the Avro biplane to Manchester, where Messrs. A. V. Roe and Co. tackled the "problem," and had it on its way back to Larkhill by Wednesday evening. The Avro firm need not be Included in the "Wake up England" admonition! Key map illustrating the flight of the Avro biplane which terminated in the spiral dive. Inset on a larger scale is a lettered diagram of the dive to which reference is made in the text. 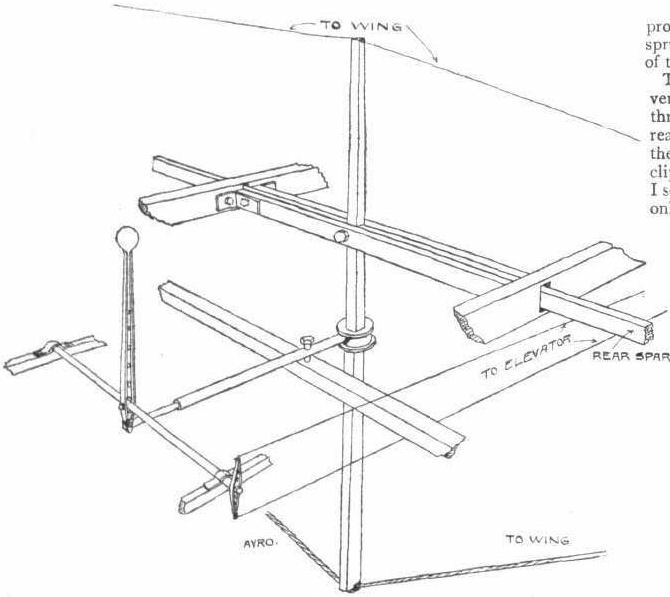 The above sketch was drawn from a paper model of a monoplane, as it is exceedingly difficult to convey an impression of a spiral path and banking in one view, and at the same time to show the position of the controls. 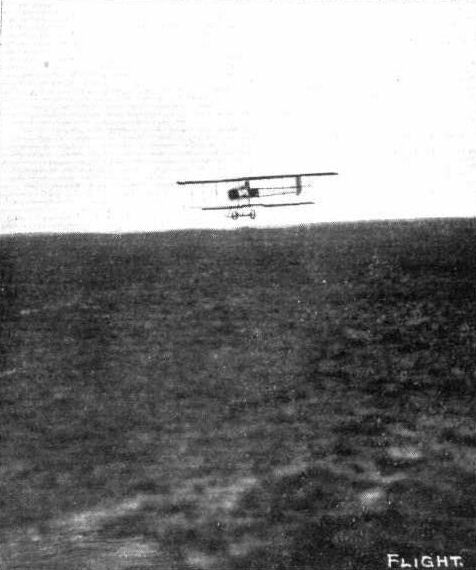 In Parke's dive, the machine was an Avro tractor biplane. The elevator was hard up, and the rudder hard over to the pilot's left at first and eased off half way later. 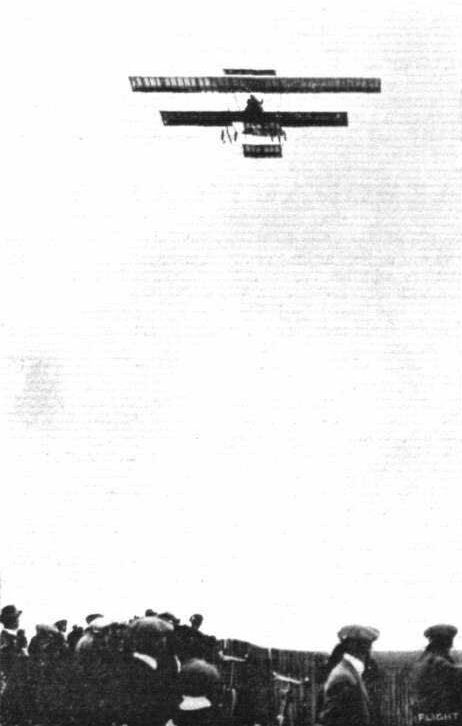 As a last resource, within 50 ft. of the ground the pilot ruddered hard over in the opposite direction, i.e., outwards, which instantly brought the machine on to a level keel and in lateral trim. The engine was working on open throttle all the time and the warp was normal. 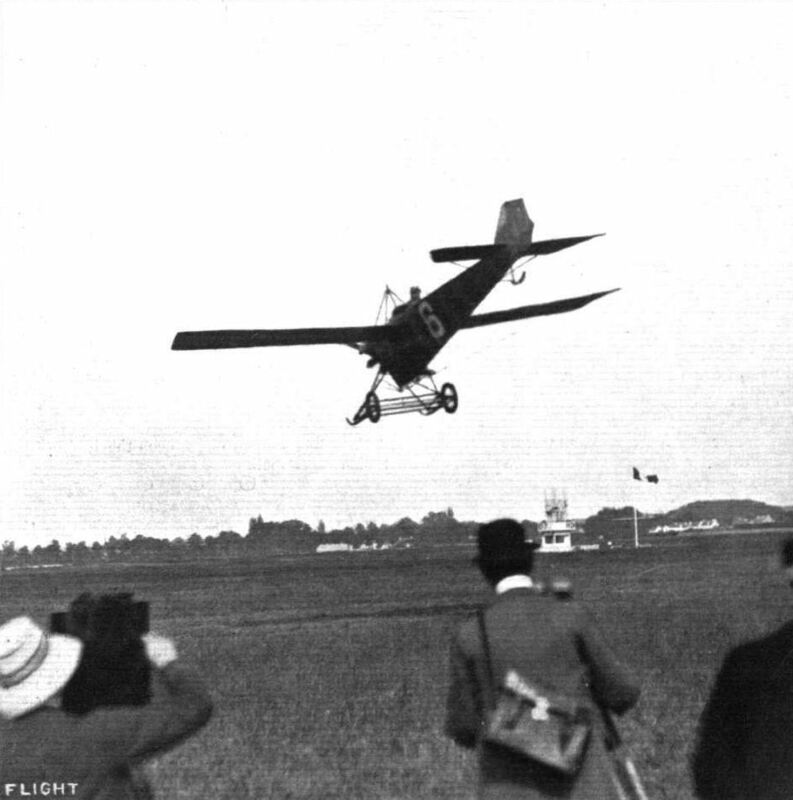 The pilot had one hand only on the control (the other being placed on the body strut to steady himself), which was drawn right back against his chest to elevate, and although he could have warped by turning the wheel with one hand, he did not consciously do so. 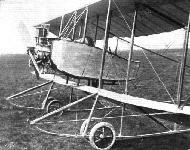 THE AVRO MILITARY BIPLANE. - Plan and Elevation to Scale. The new Short twin-engined triple-tractor biplane. General view distinctly showing the position of the three tractor screws. Lieut. Fox, on Army biplane No. 203, just about to start for a flight at the London Aerodrome, Hendon, last week-end. Inset the same machine is seen in flight. Lieut. 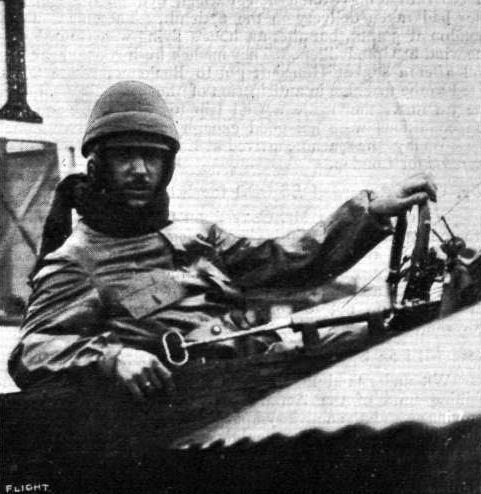 Gordon Bell, on Army biplane No. 204, with Capt. Dawes as passenger, just at the moment before leaving the London Aerodrome, Hendon, on Saturday last en route for Farnborough. 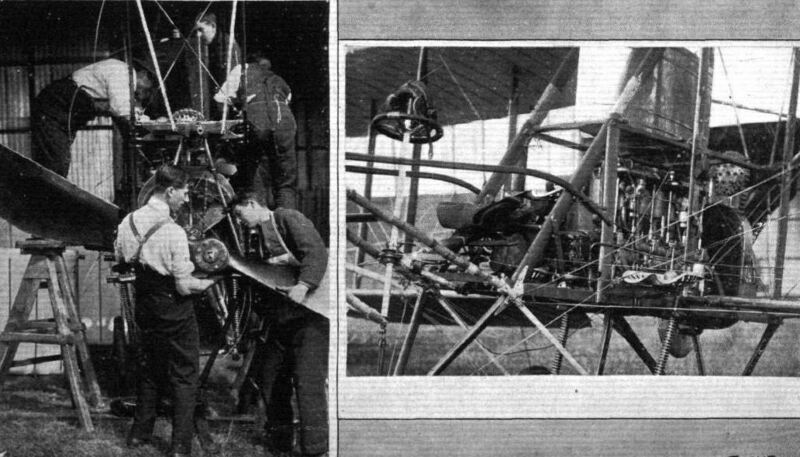 Note the mechanic in front, who has just swung the propeller. 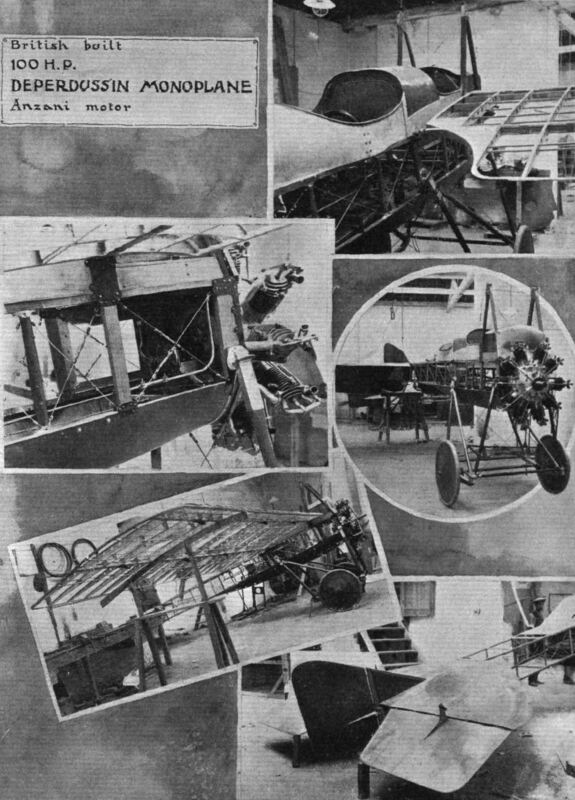 A couple of snapshots of Mr. de Havilland and one of the Army biplanes, BE 4, showing the machine from the side and from behind. The Vickers monoplane, fitted with 70-h.p. Viale engine, piloted by Macdonald in the Army Aeroplane Competition on Salisbury Plain. 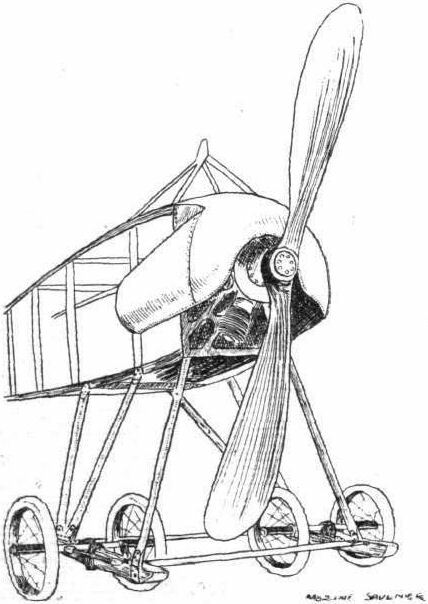 THE VICKERS MONOPLANE.-Sketch showing the engine-mounting and landing-skid. 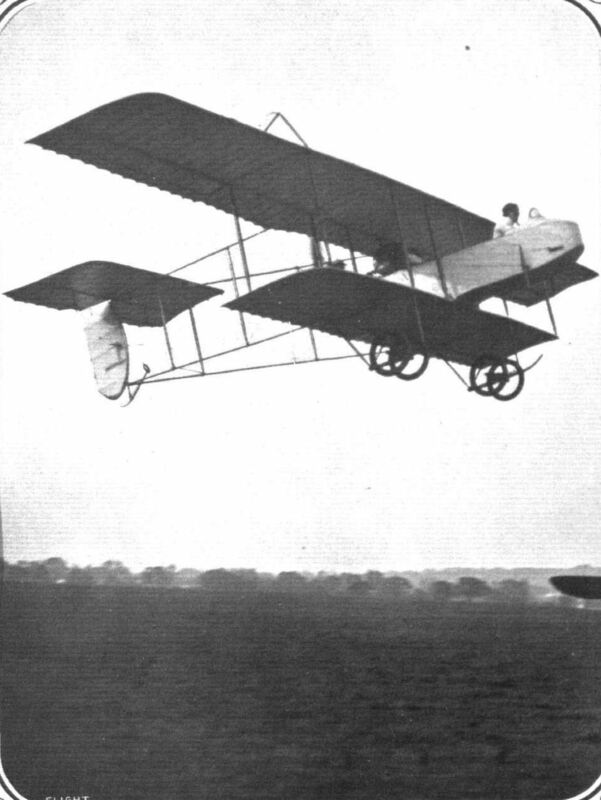 THE VICKERS MONOPLANE. - The landing-chassis. THE VICKERS MONOPLANE. - Showing how the front chassis-struts are connected to the central landing-skid, and insulated therefrom by a laminated steel spring. 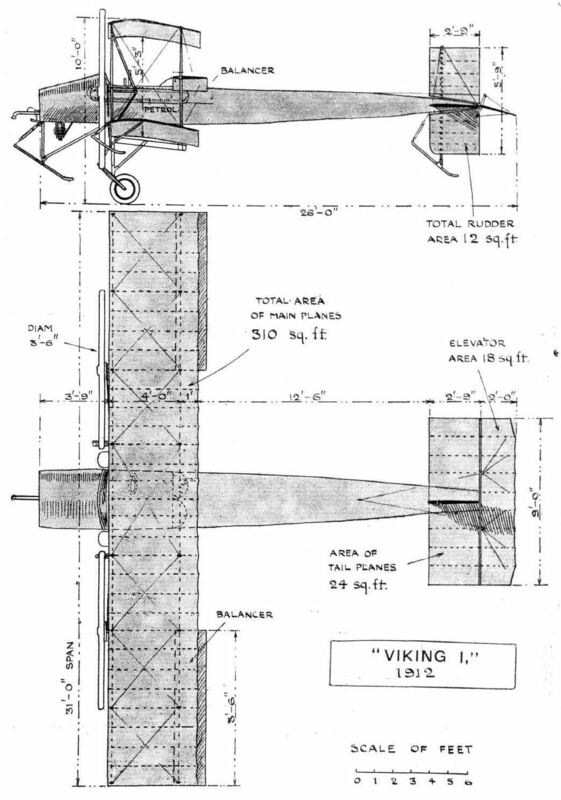 THE VICKERS MONOPLANE. - The mechanism that operates the wing-warping. Note the laminated steel spring that insulates the chassis-strut from the skid. 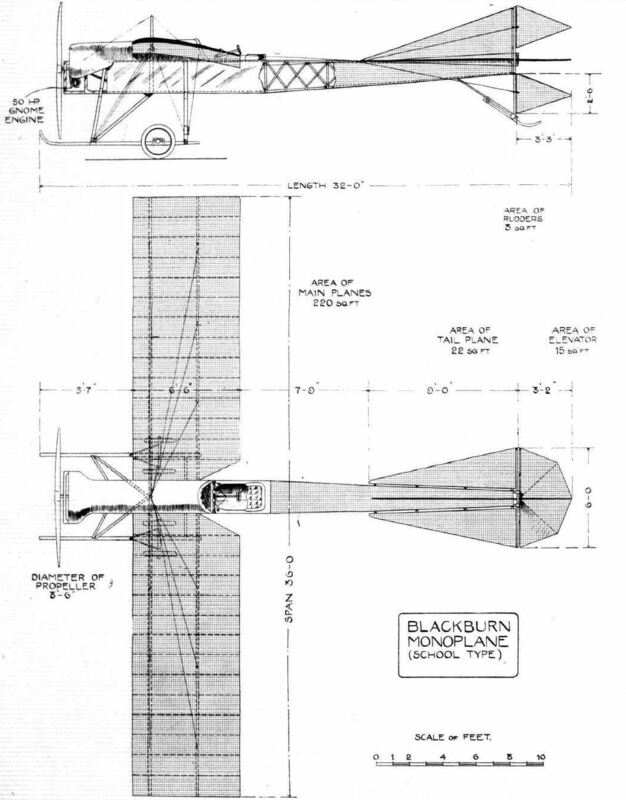 THE VICKERS MONOPLANE. - Details of the tail, showing the tailskid and release-catch. 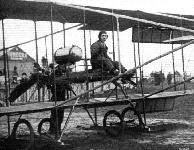 THE LATEST HENRY FARMAN BIPLANE. - This view, taken from the rear, shows very clearly the general arrangement of the new machine. 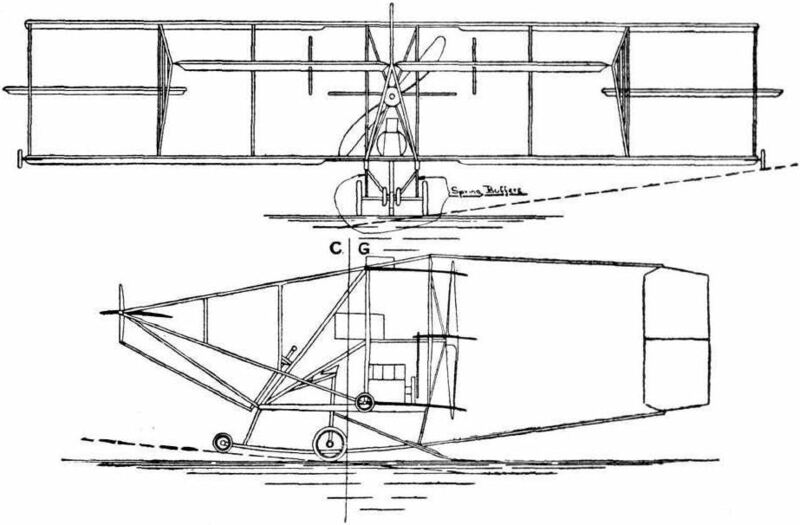 Note the short lower plane, the large ailerons and the arrangement of the central portion of the machine. The outer sections of the main plane can easily be taken off so that the machine can then be towed along the road. The pilot and passenger are seated in the body which projects from the front of the machine and is easily detachable. The photograph also shows the new system of undercarriage to which reference has already been made in FLIGHT. 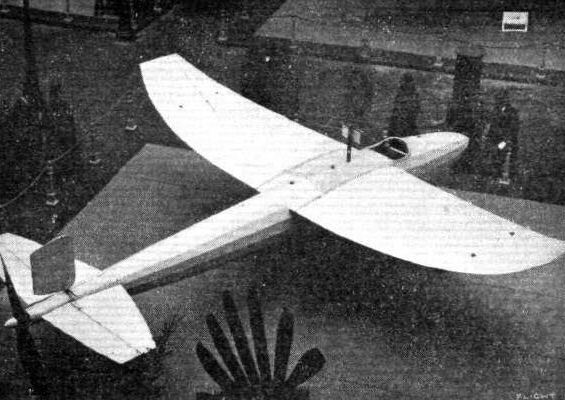 The Borel hydroaeroplane, which took part in the St. Malo competition. HYDRO-AEROPLANES AT THE HEILIGENDAMM MEETING. 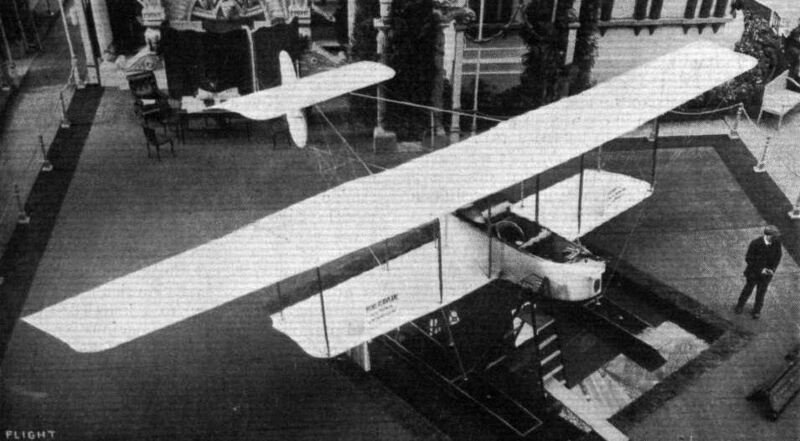 - The Goedecker monoplane with its boat-shaped body. HYDRO-AEROPLANES AT THE HEILIGENDAMM MEETING. - Von Gorissen on then Ago biplane. Lieut. Michele Mittieff, of the Bulgarian cavalry, together with Lieut. 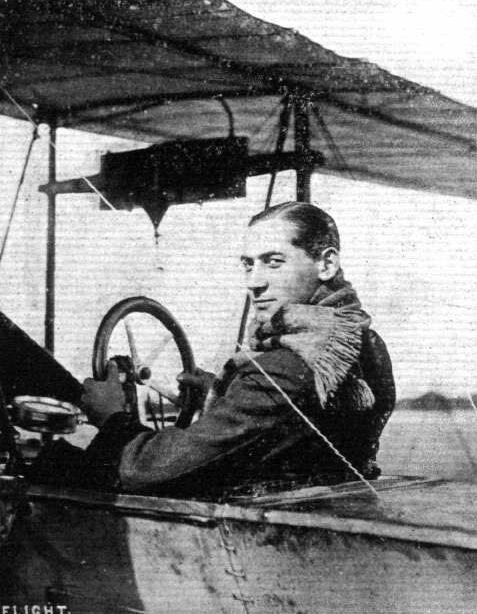 Stoyanoff, of the Bulgarian infantry, in the seat of their specially-built and armoured Sommer biplane, with which they last week left Mourmelon for the purpose of getting to the front and taking part in the present war. 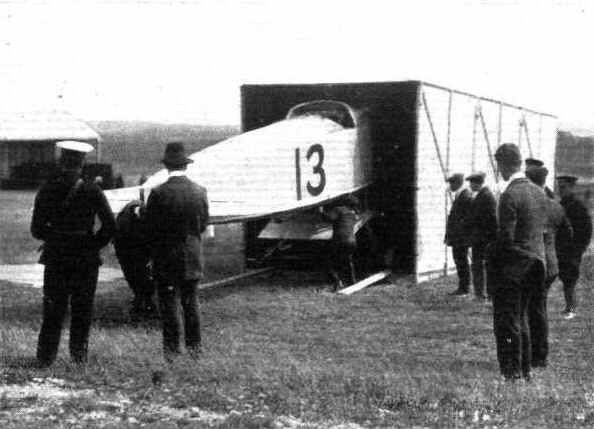 THE NEW BLERIOT CANARD, SEEN FROM IN FRONT. 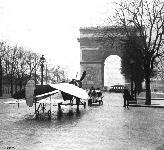 - In the backhand is the new BIeriot monoplane which was at the Paris Salon. SOME LANDING CHASSIS. - The all-steel chassis of the new 80-h.p. 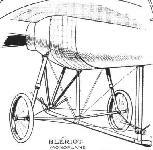 Bleriot monoplane. BOREL DETAILS. 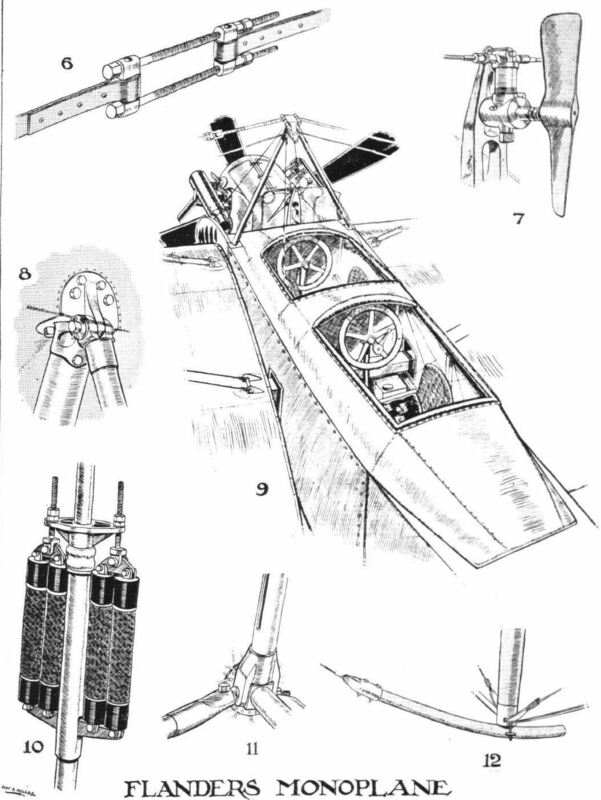 - Above, diagrammatical sketch of the 80-h.p. Borel "monocoque." 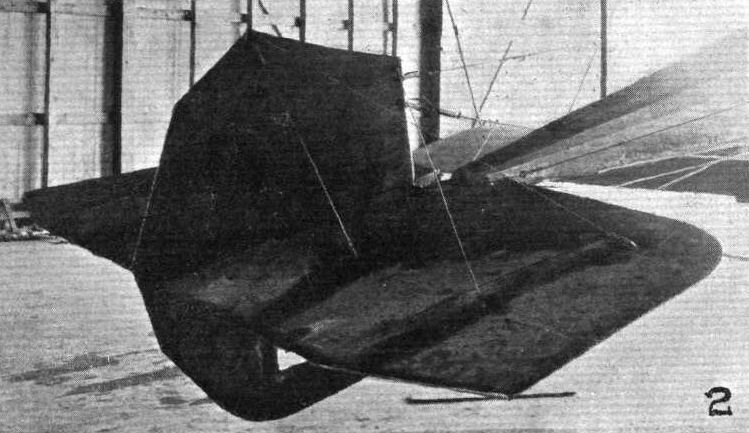 Below, on the left, shows how the wings are braced from the chassis. The detail on the right is the starting device employed on the Borel hydro. A novel way of exhibiting a hydro-aeroplane. 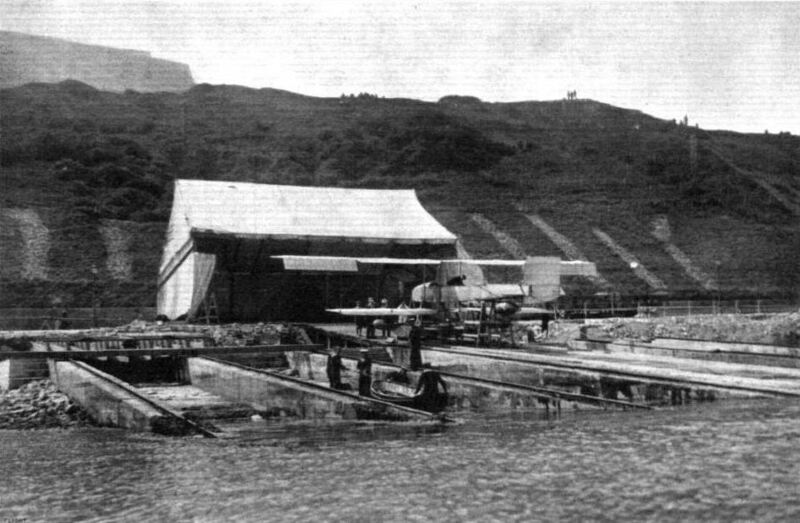 Henry Farman's machine resting in its turf-edged water tank. 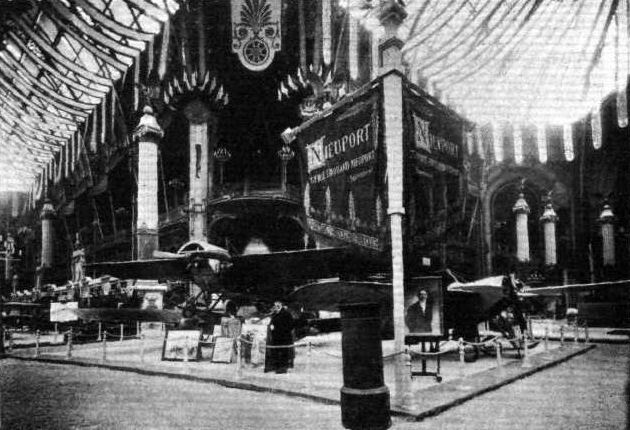 PARIS AERO SALON. - The d'Artois exhibit. 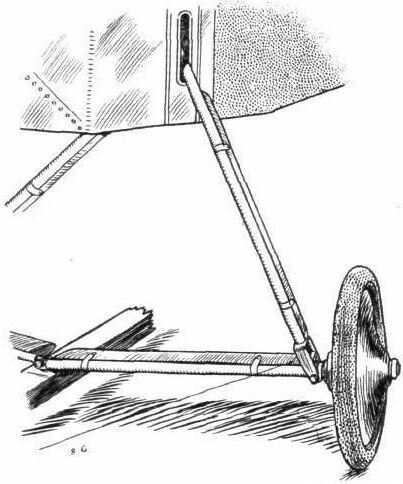 Example of the type of landing carriage that is being adopted by many aeroplane constructors in France. 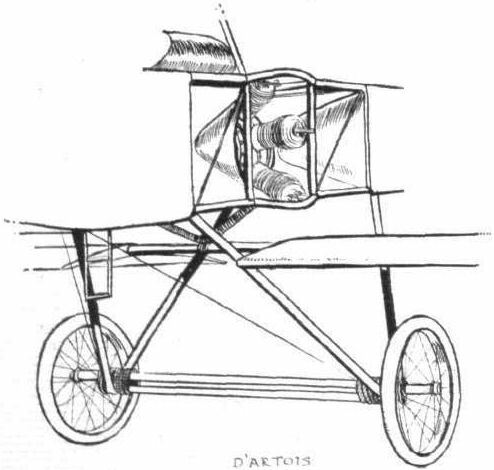 Shown is the running gear of the d'Artois torpille biplane. 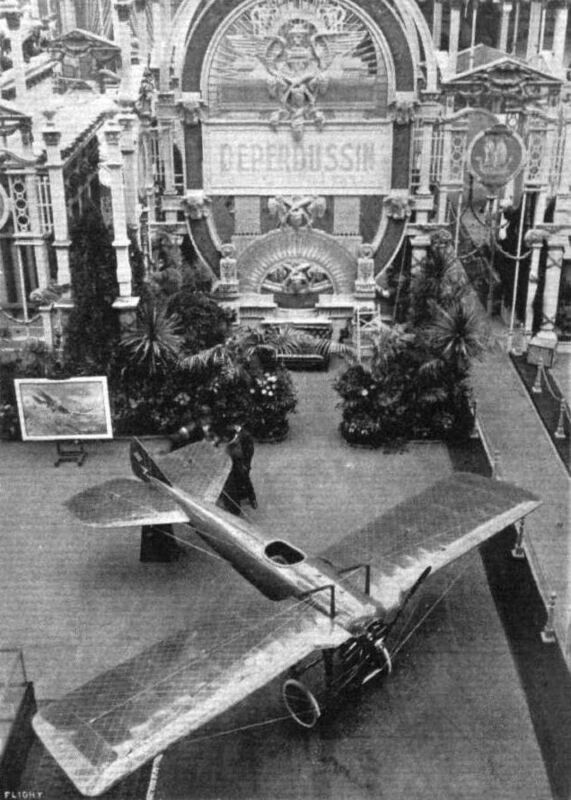 PARIS AERO SALON. - The Clement Bayard stand. The 100-h.p. 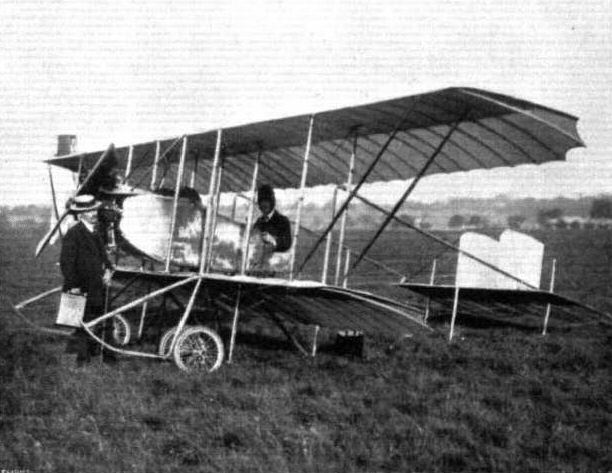 three-seater Clement-Bayard biplane. How the planes of the Clement-Bayard biplane are braced. The 80-h.p. R.E.P. 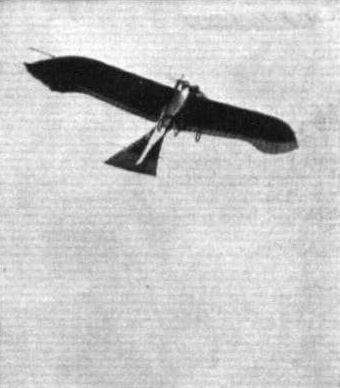 hydro-monoplane, with its single main float. To the left is a R.E.P. Avion packed ready for road transport. 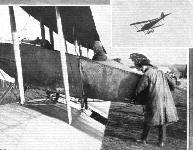 The latest Nieuport hydro-aeroplane, whtch is being put through experiments at Meuian under the direction of Lieut. Delage. 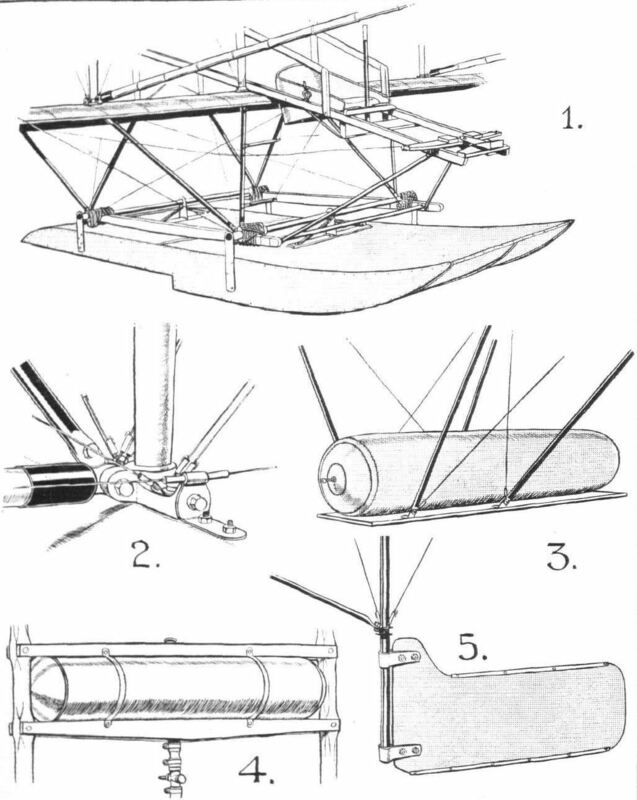 Note the special construction of the front floats and the tall-sustaining float. 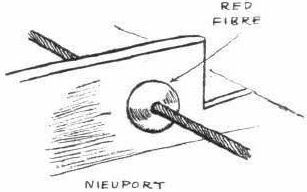 The neat control wire guide on the Nieuport monoplanes. 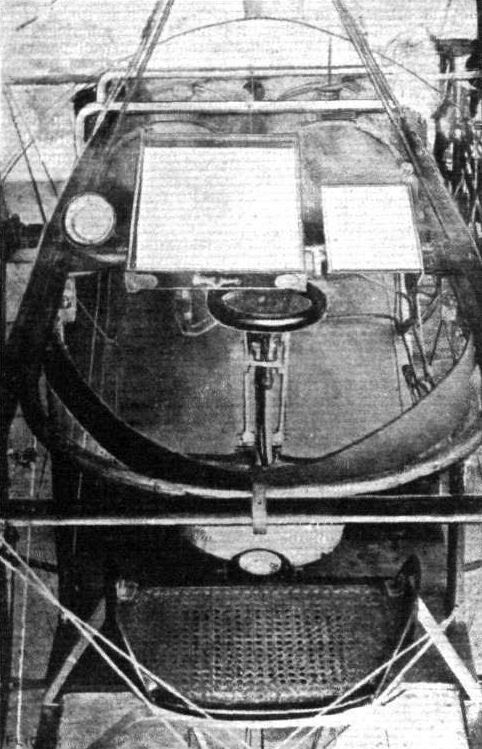 The chassis of the 50-h.p. 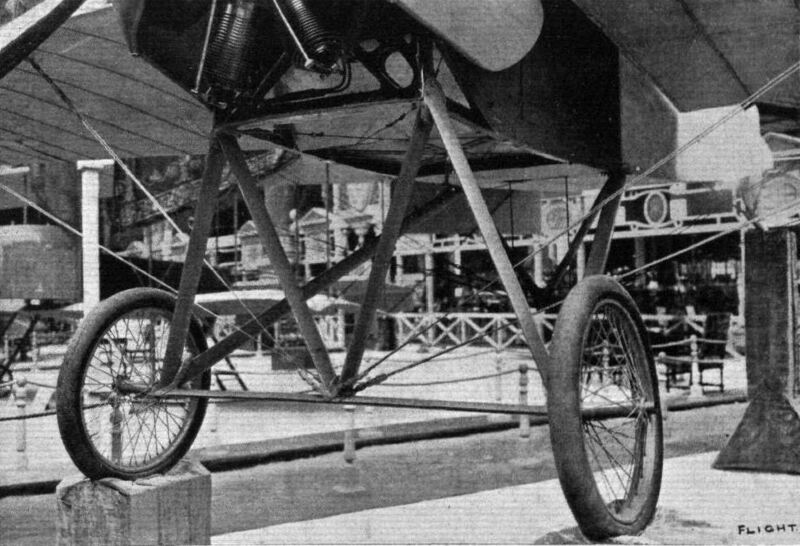 Nieuport racer. 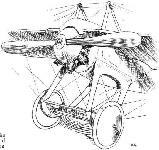 M. Moreau's automatic stability monoplane. 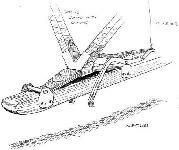 Diagrammatic sketch of the new form of control fitted to the Sommer monoplane. 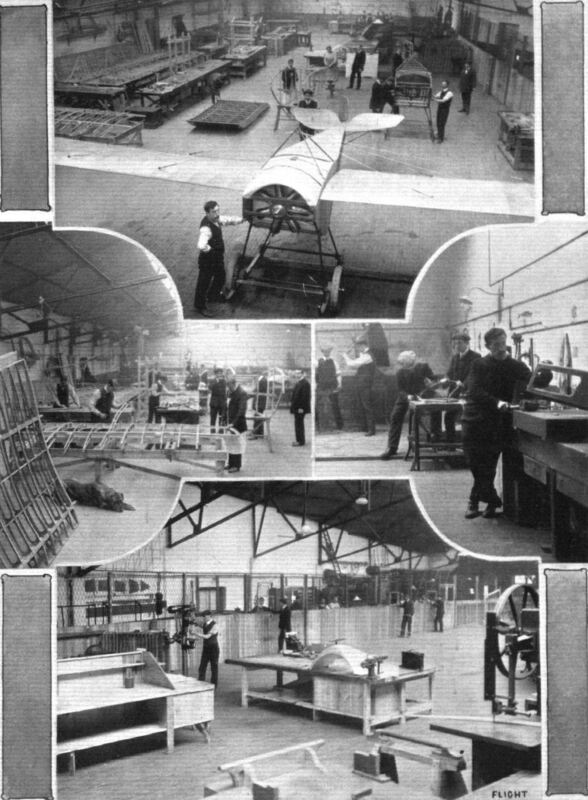 Views showing the British-built A B C engine and the tail of the Sopwith-Wright biplane. - The twin rudder is mounted on a single pivot at each end, the horizontal tail plane is fixed, and has a flexible trailing edge for use as an elevator. 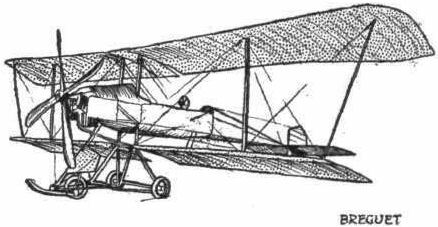 THE SOPWITH-WRIGHT BIPLANE. - Sketches illustrating various constructional details: 1. The nacelle, which protects the pilot from the wind. 2. 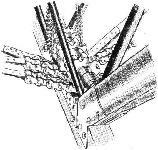 Portion of the short length of chain which is used as a link in the warp wires where they pass over the pulleys. 3. 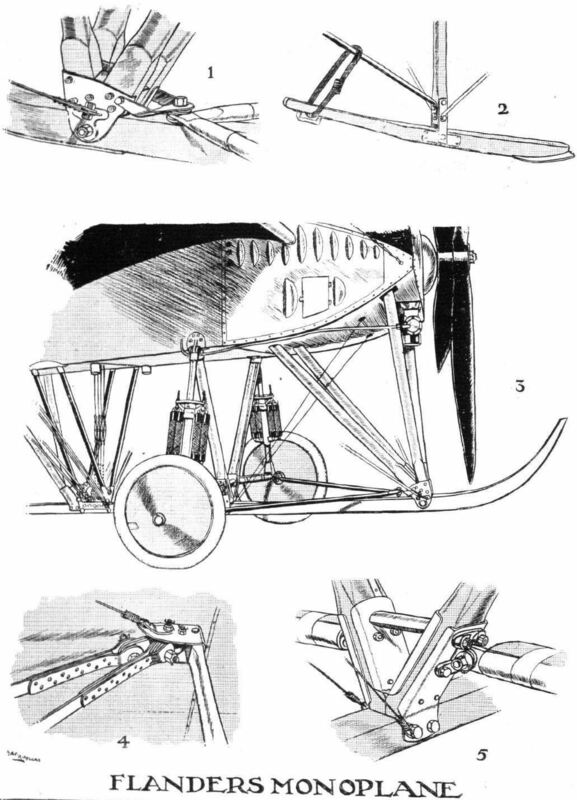 Method of mounting the engine on the lower plane. 4. 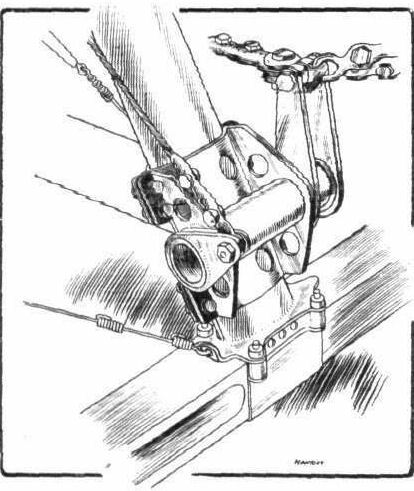 Pivoted lever for gearing up the elevator to the control lever. 5. The toe portion of one of the skids. 6. 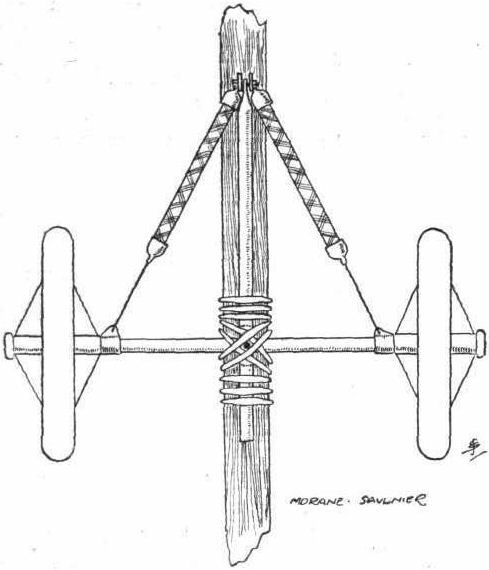 Another sketch showing how the warp wires are carried round their pulleys. 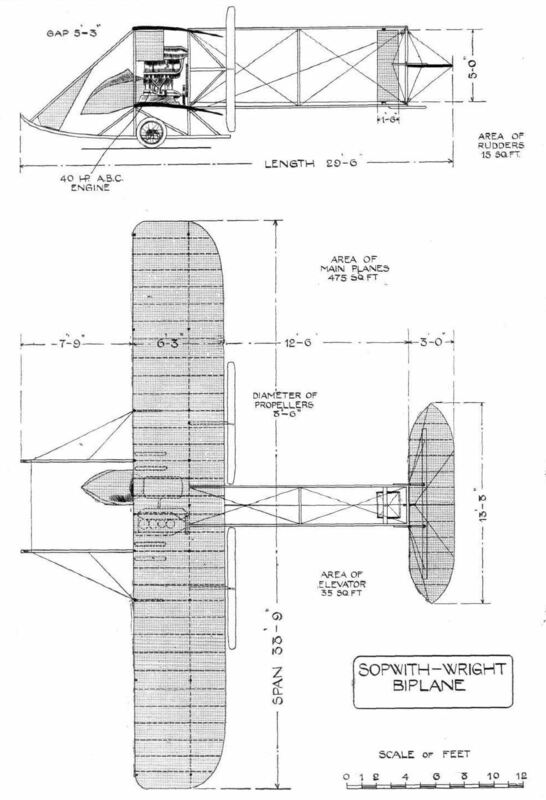 Elevation and plan of the Sopwith-Wright biplane. 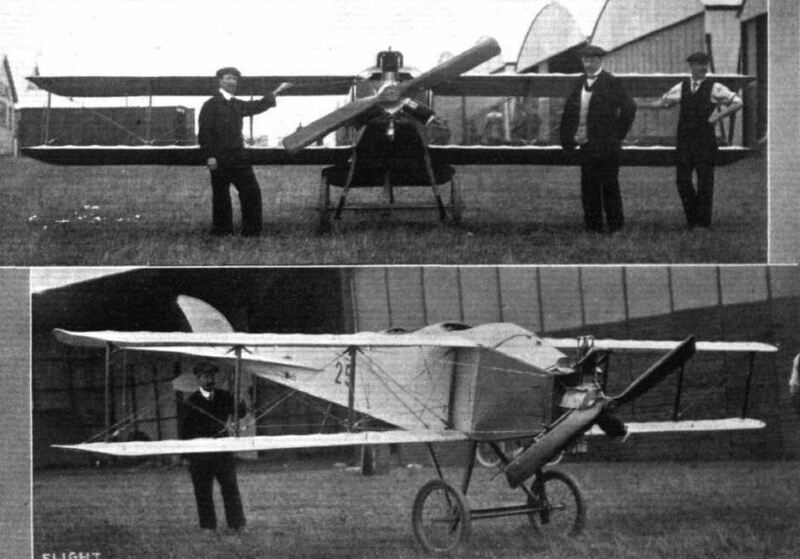 Two views of the latest Bristol biplane designed by Gordon England. 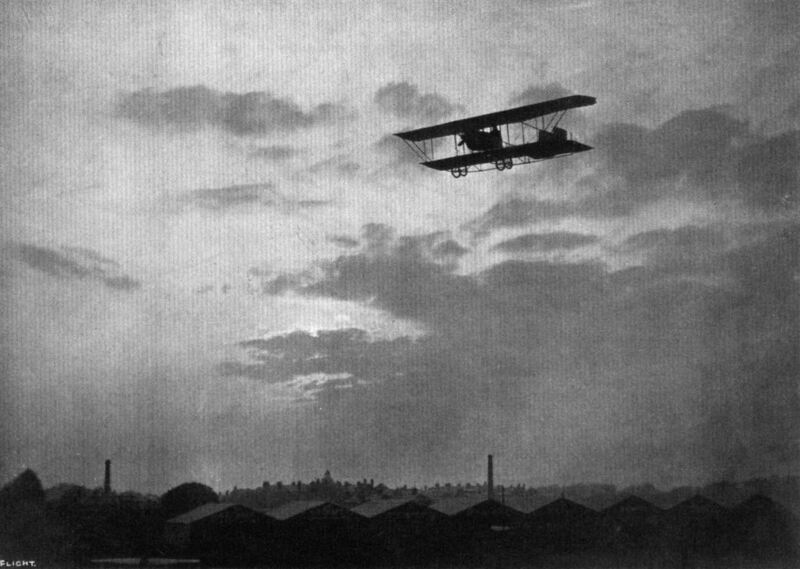 Two similar machines of this class, built by the British and Colonial Aeroplane Co, are now under test. The 200-h.p. "Hydro-aerobus" that has lately been turned out of the Voisin works to the order of M. Henri Deutsch de la Meurthe. Its Clerget motor drives a 4-bladed propeller at 600 revs. per min. It has a wing spread of no less than 74 ft., and has been designed to carry 6 people! The coque of the Voisin hydro-aerobus, as seen from behind. Incidentally it may be noticed that the landing gear does not seem any too happy. A series of German aeroplanes at Johannisthal from photographs kindly sent to us by the Hon. Lady Shelley. - Jeannins monoplane. A series of German aeroplanes at Johannisthal from photographs kindly sent to us by the Hon. Lady Shelley. - Albatross biplane. 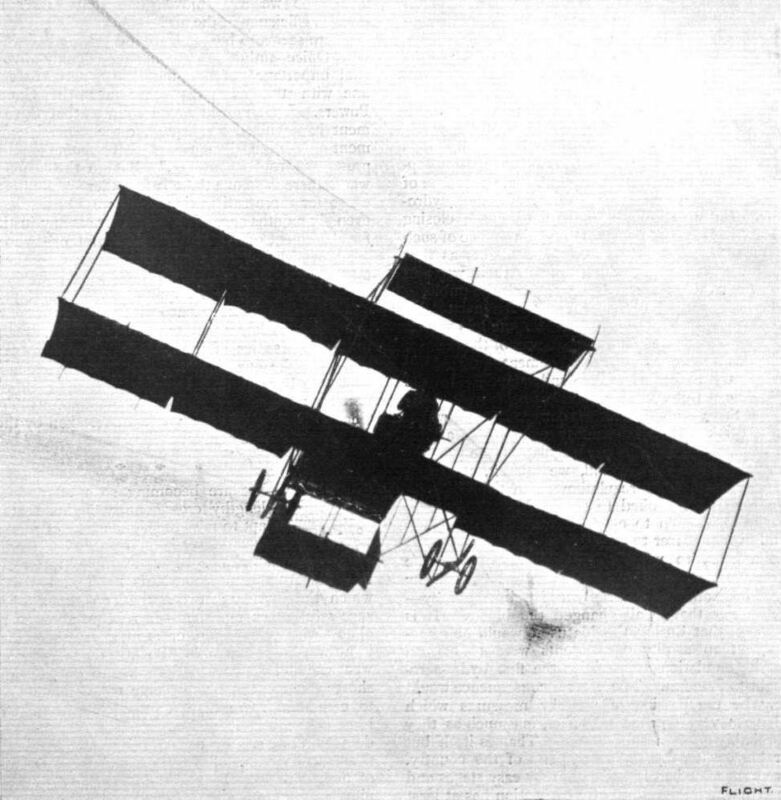 THE JEZZI BIPLANE. - The top and bottom photographs of the above set of three were taken in the early part of this present year. 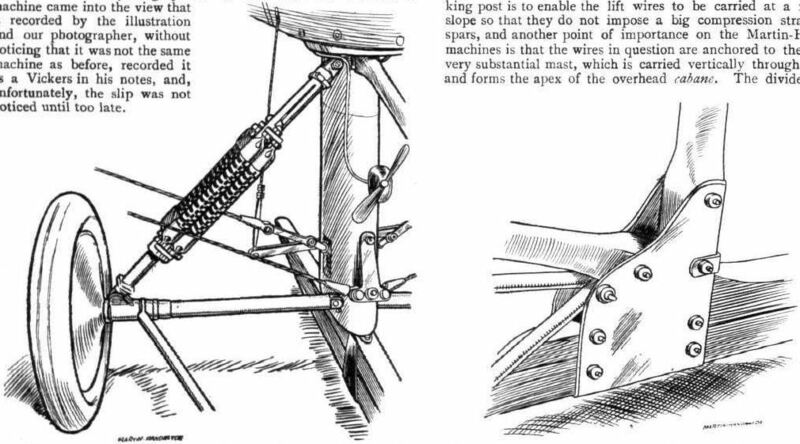 The central photograph was obtained a month or two later when the body had been covered in with fabric, and king posts and wire bracing arranged to support the top plane extensions in place of the compression struts that were originally used. Within the last fortnight extensions have been fitted to the lower plane as well, bringing it to tbe same span as the top one. 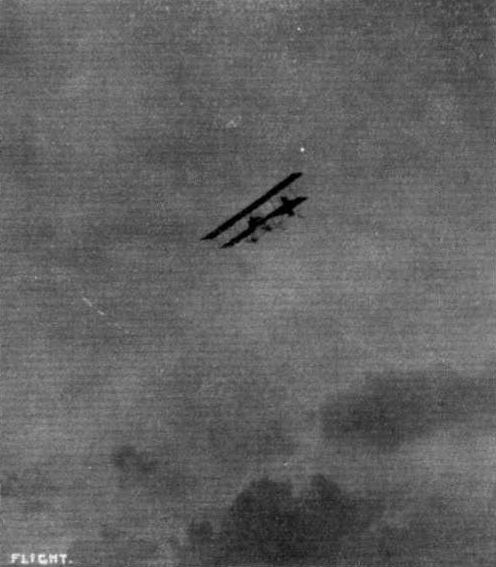 The attractive Jezzi biplane in flight - a photograph secured some two months since, before the extensions were added to the lower planes. The machine and its constructor, Mr. Leo Jezzi. Details of the Jezzi landing gear. 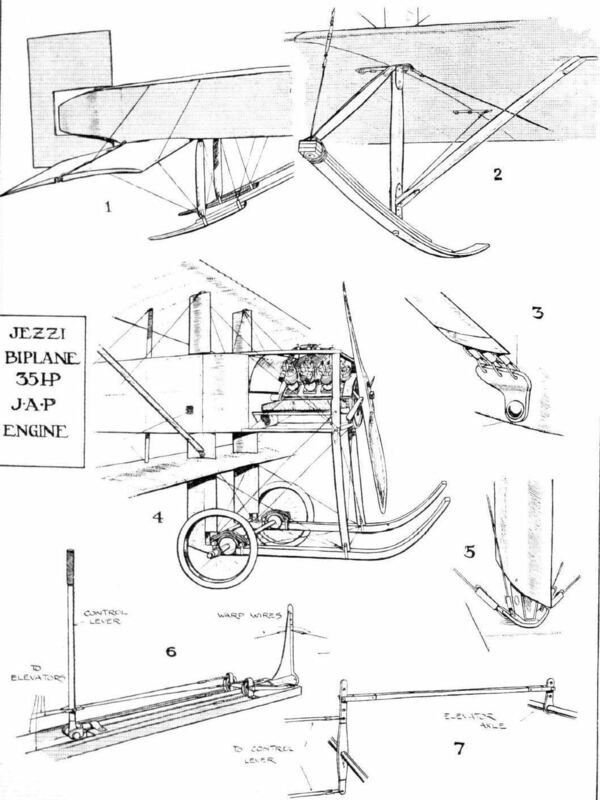 THE DETAILS OF THE JEZZI BIPLANE. - 1. The tail; it is so constructed that the levers operating the rudder and the elevators may be arranged inside, so saving wind resistance. 2. The laminated wing skid. 3. The attachment to the fuselage of the wires that take the main lift; they are of ten-gauge material, and it will be noticed that they are carefully enclosed in a stream-line casing of aluminium. 4. 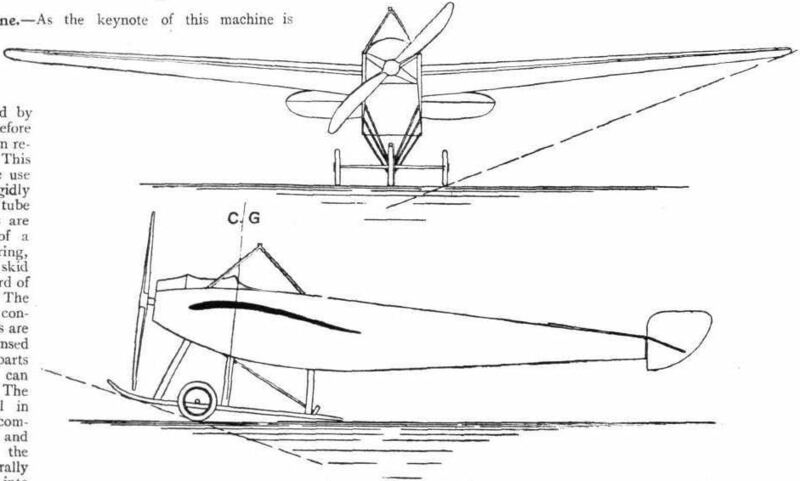 General sketch of the front of the machine. 5. One of the strut attachments. 6. Sketch showing the arrangement of the elevator and warping control. 7. 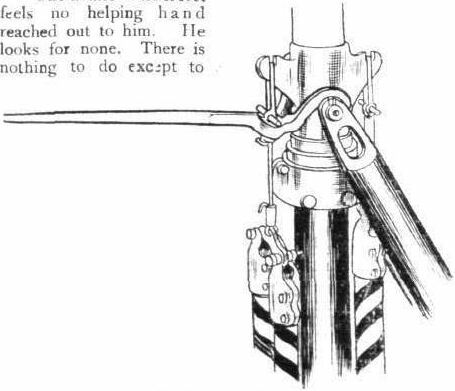 Detail of the control, showing how adjustments of the elevator is effected. 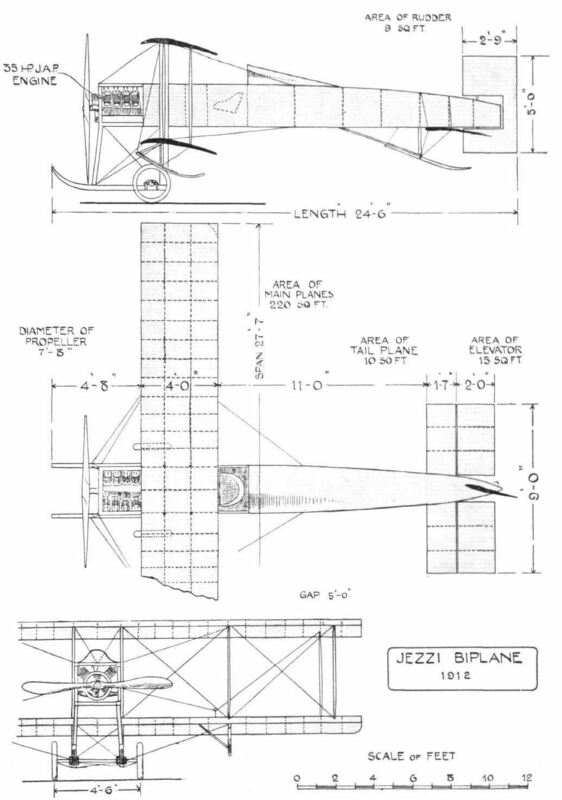 THE JEZZl BIPLANE. - Plan, side, and front elevations to scale. 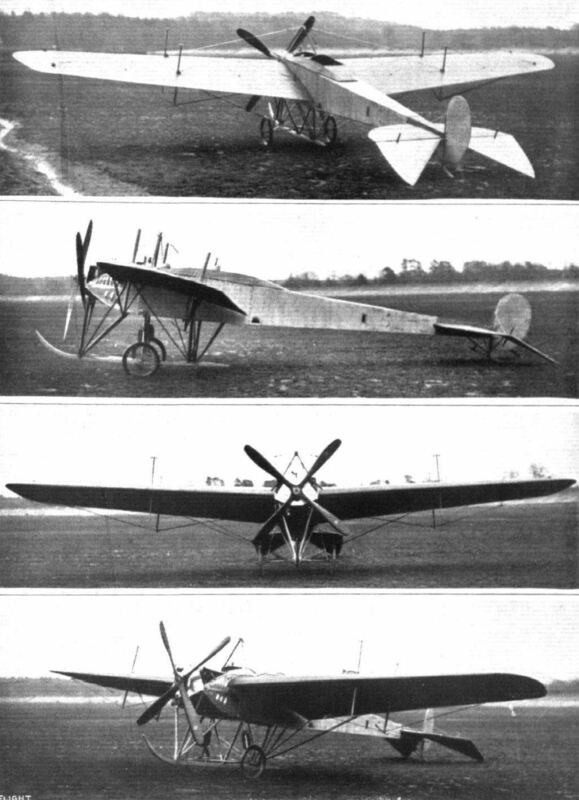 The Flanders monoplane from different points of view. 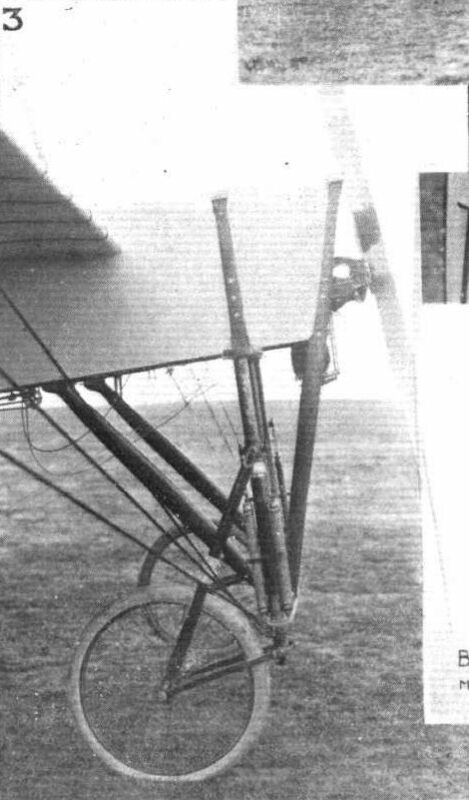 The front section of the Flanders monoplane, showing the mounting and shielding of the 70-h.p. Renault motor. 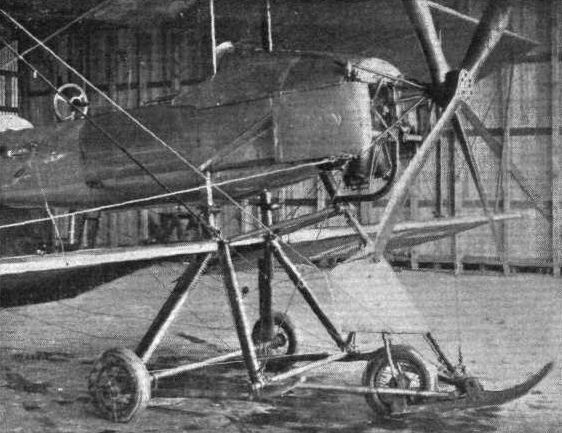 WARPING GEAR ON THE FLANDERS MONOPLANE. - The sprockets taking the stout warping chains are machined from Duralumin. 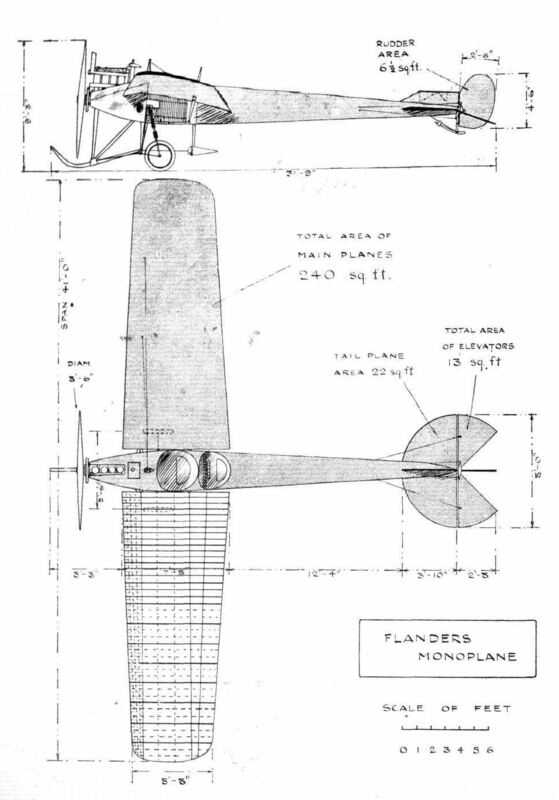 DETAILS OF THE FLANDERS MONOPLANE. - 1. The steel fitting for the assembly of the front two pairs of chassis struts to the skid, and the attachment of the radlus-rods. 2. 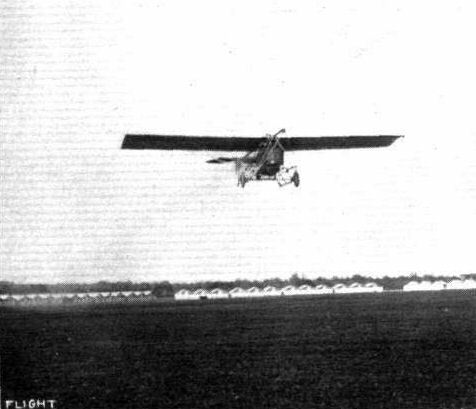 The light tail skid. 3. 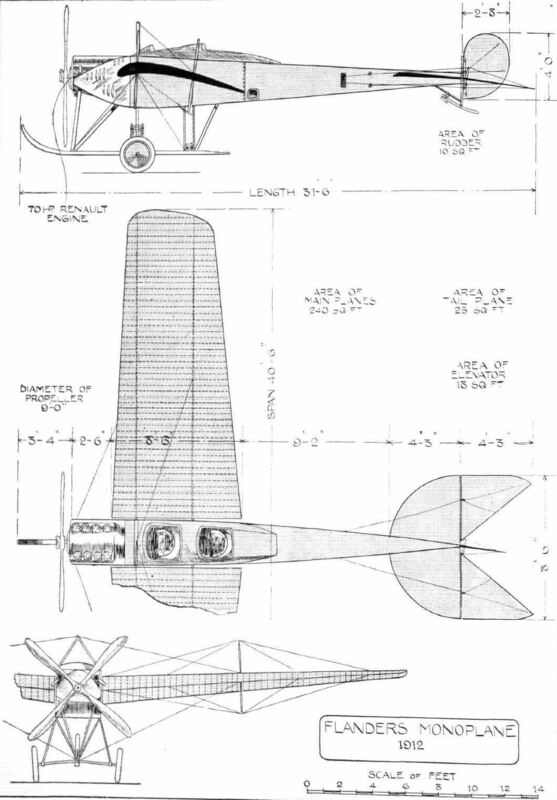 General sketch of the front of the Flanders monoplane, showing the disposition of the chassis. 4. The king-post attachment. 5. The fitting to which the axles are hinged. 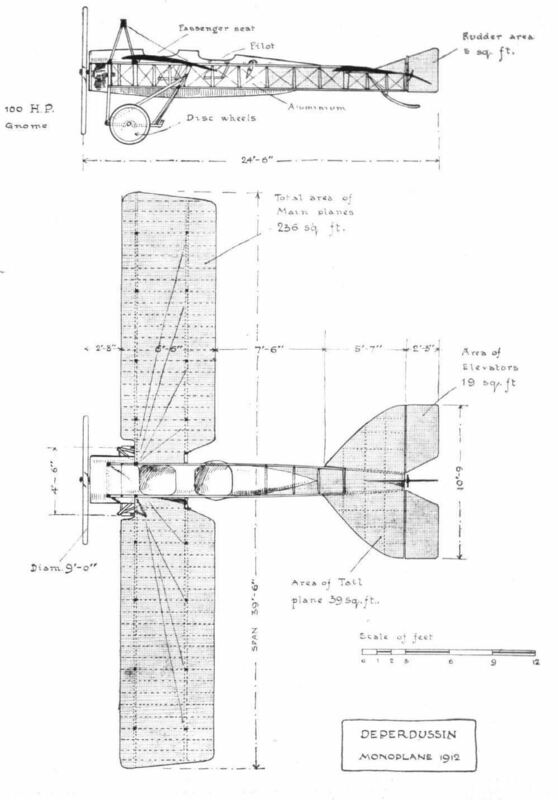 DETAILS OF THE FLANDERS MONOPLANE. - 6. The Flanders steel ribbon strainer. 7. The automatic pump arranged in the slip stream of the propeller, which supplies compressed air for feeding the petrol from the main tank, low down in the fuselage, to the carburettor. 8. 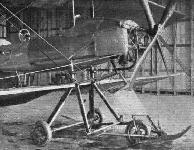 The fitting by which the chassis compression springs are attached to the fuselage. 9. 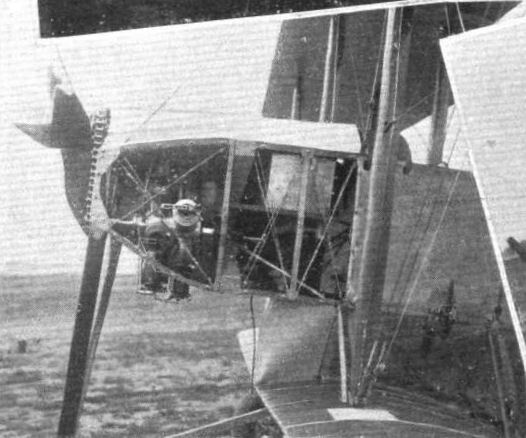 General view from above, showing pilot and passenger's seats and double control. 10. The clever compression strut. 11. 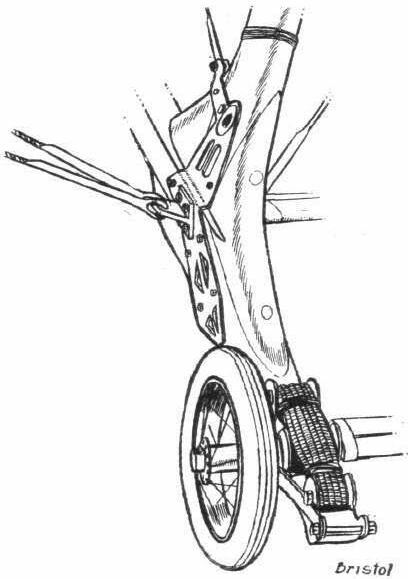 The attachment of the compression strut to the axle. 12. The neat skid that protects each rear king-post from contact with the ground. 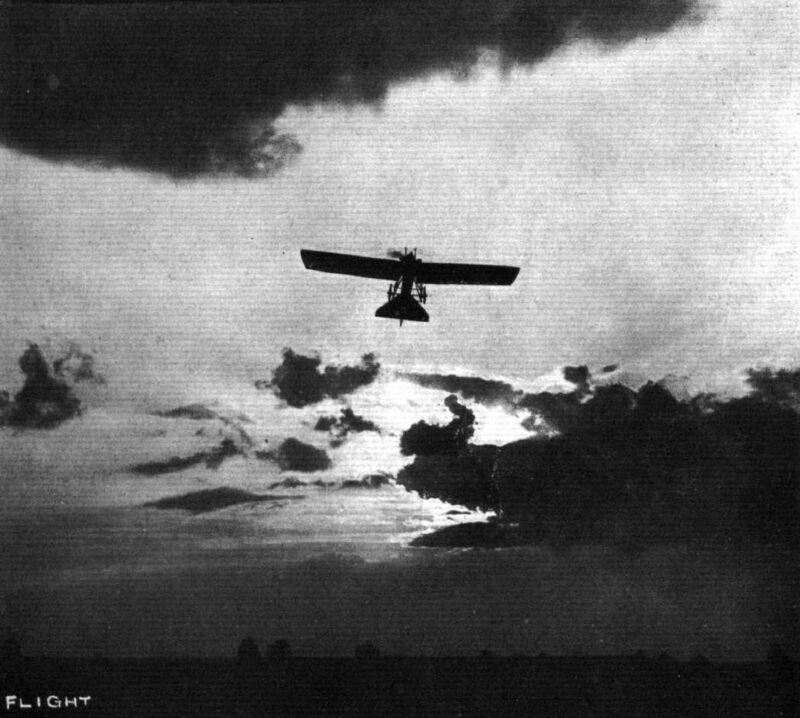 THE FLANDERS MONOPLANE. - Plan, front, and side elevations to scale. 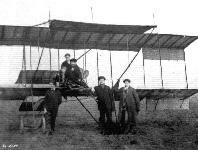 Mr. W. B. Megone's interesting biplane photographed outside its hangar at Hawkinge, Folkestone. THE NEW 70-H.P. 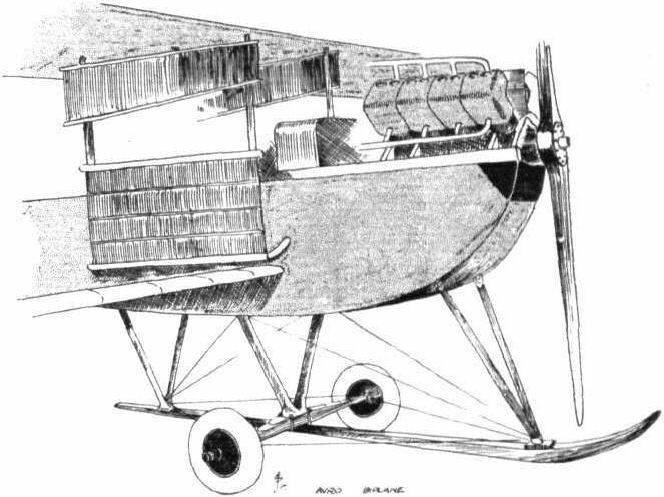 GNOME-BLERIOT "CANARD." - Side view. The "Blue Canard" Type XXXIII, second version. 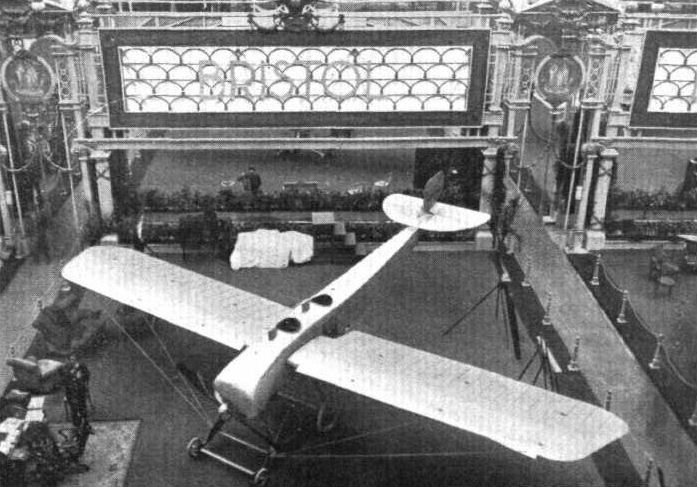 - In the backhand is the new BIeriot monoplane which was at the Paris Salon. 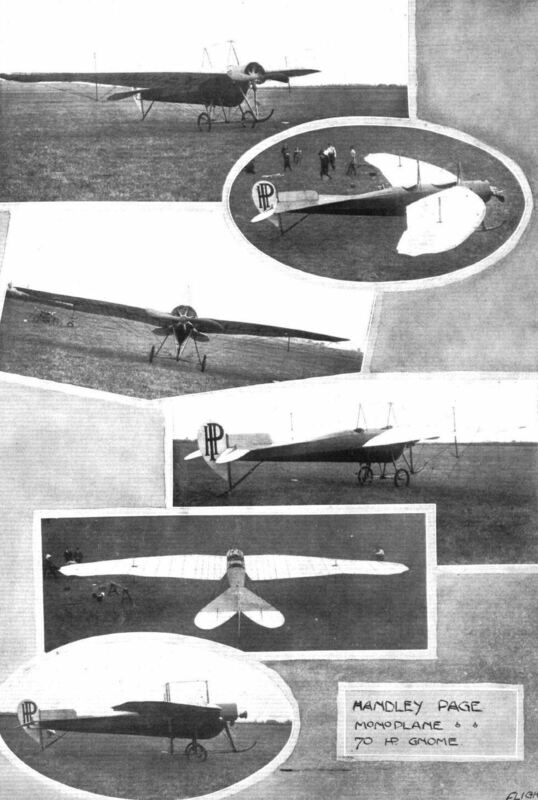 The experimental "canard" monoplane of Prof. Reissner, with four rudders under the main plane. This was flying recently at Johannisthal. 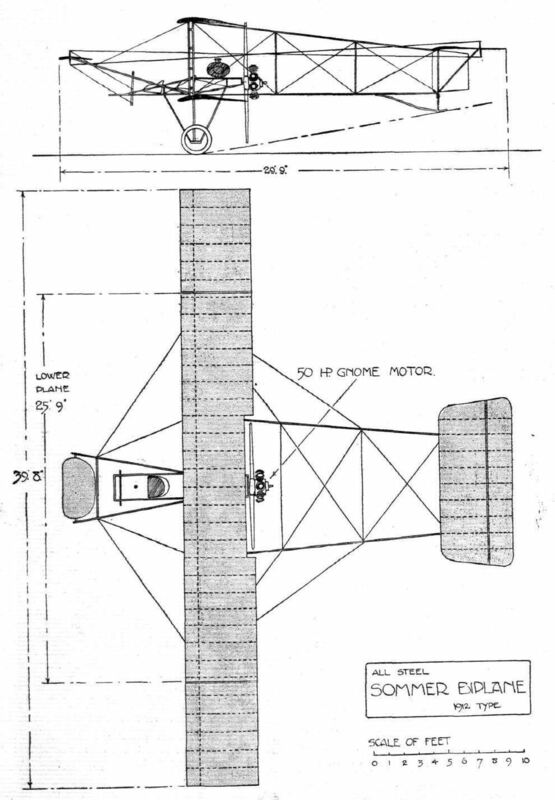 The Mars biplane, the fuselage and landing chassis of which are exactly similar to that of the Mars monoplane. 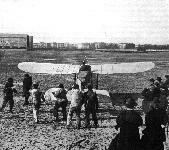 The Jeannin monoplane in its latest form, as seen at the Johanntsthal flying ground near Berlin. 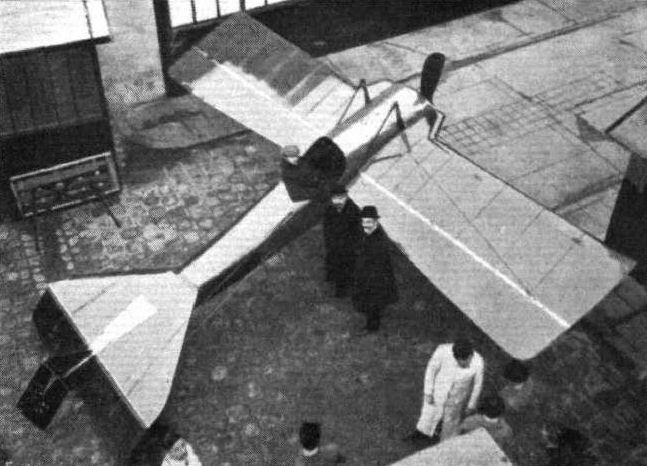 A Schulze monoplane, specially built for school work. One of the latest military-type Harlan monoplanes recently delivered to the Turkish Army. Lieut. Krieget and Lieut. Friedensburg on their Harlan military-type monoplane, which was awarded first prize in the recent contest for flying round Berlin. 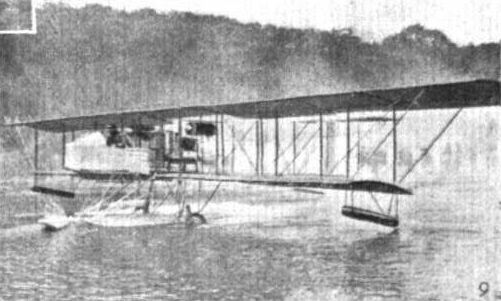 One of the Admiralty Deperdussin monoplanes which was flown to Lake Windermere, where it has been converted for hydro-aeroplane work. - In the photo it is seen just launched from its hangar after fitting the floats. A series of German aeroplanes at Johannisthal from photographs kindly sent to us by the Hon. Lady Shelley. - Rumpler-Taube in flight. Capt. James V. Martin, one time associated with the Grahame-White School, in his latest Martin type tractor biplane, over Seattle Harbour, U.S A., July 2nd last. The above photograph has reached us from Mr. Martin with kind regards from himself and Mrs. Martin. 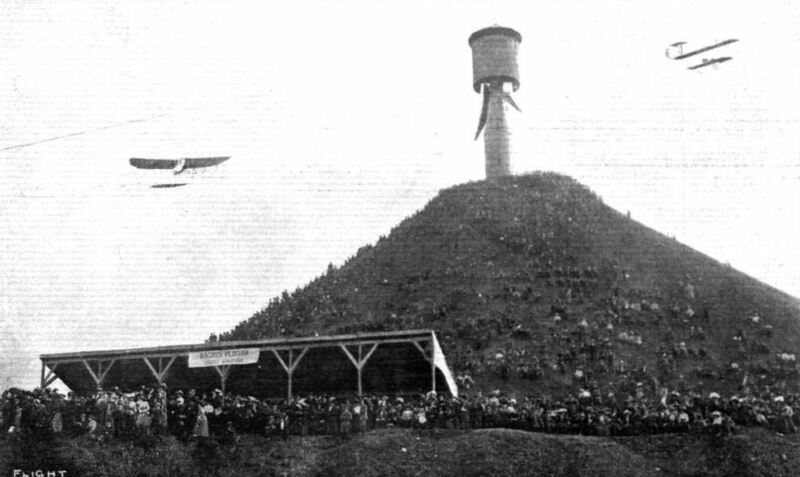 A fine vol plane by Bobba over the Grand Stand in the Paris-Amiens flying race. 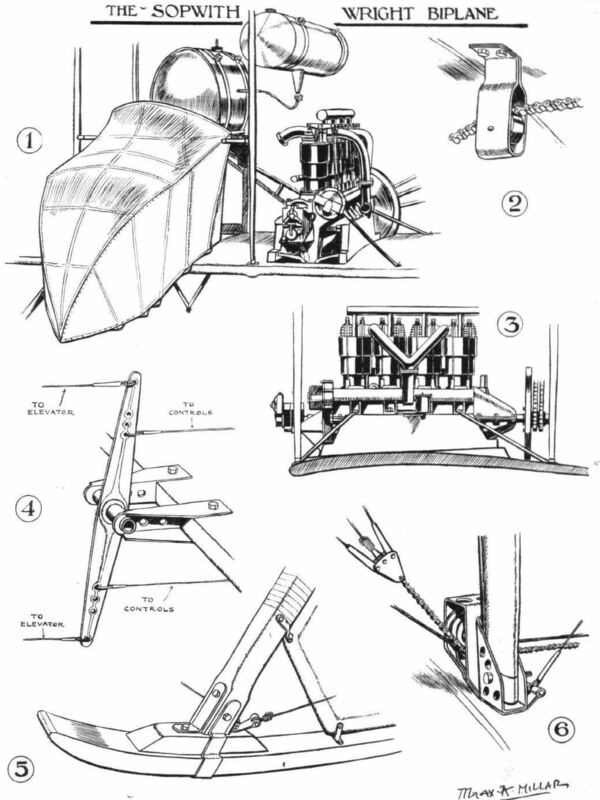 Example of the type of landing carriage that is being adopted by many aeroplane constructors in France. 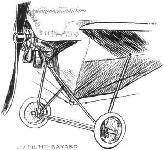 Shown is the running gear of the Clement-Bayard monoplane. Two details of the Clement-Bayard. On the left the rear skid, on the right the system of shock absorbers employed in the chassis. THE FORERUNNER OF THE "AERO-TORPEDO." 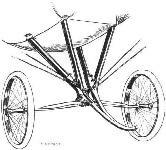 - The model, driven by compressed air, with which Tatin experimented at Chalais-Meudon in 1870. Thirty-eight years of endeavour span Victor Tatin’s major productions of aircraft design. 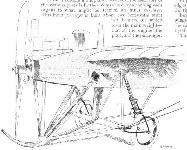 His practical 6ft wing-span twin-screw model monoplane of 1879 was powered by compressed air contained in the barrel forming the fuselage. Having flown for 15m, it probably represents Tatin’s most undisputed achievement in his long aeronautical career. 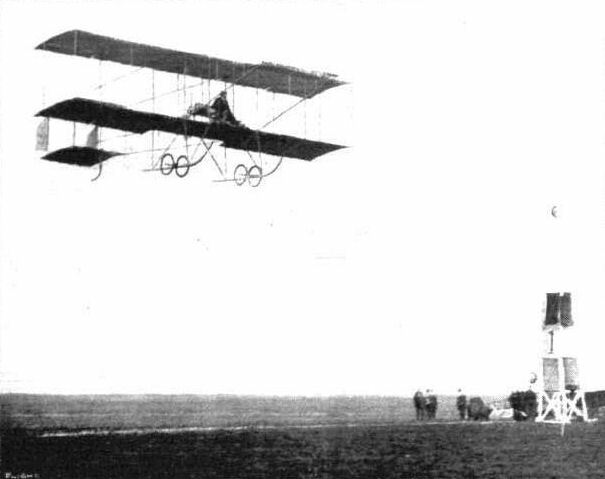 The Cody biplane about to start on the official test in the Military Aeroplane Trials. Last week Mr. S. F Cody made a sporting flight in connection with the Aldershot Beagles at Eelmcor Bridge Laffans Plain, when he accompanied the meet for a short period after the start. In our picture Mr. Cody is being greeted by the Master, Capt. Sankey, before the start. 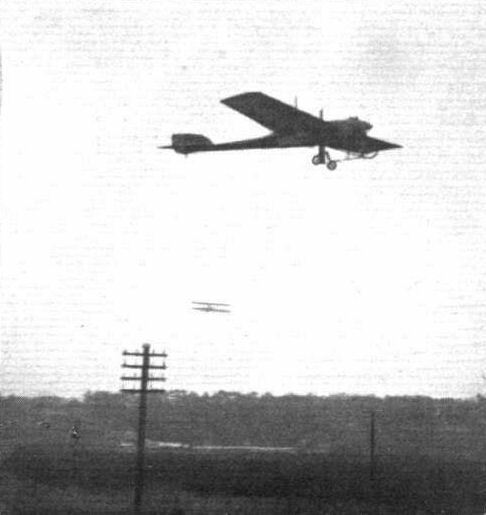 Col. S. F. Cody, on the Cody biplane, flying at the meet of the Aldershot Beagles at Eelmoor Bridge, Laffan's Plain. 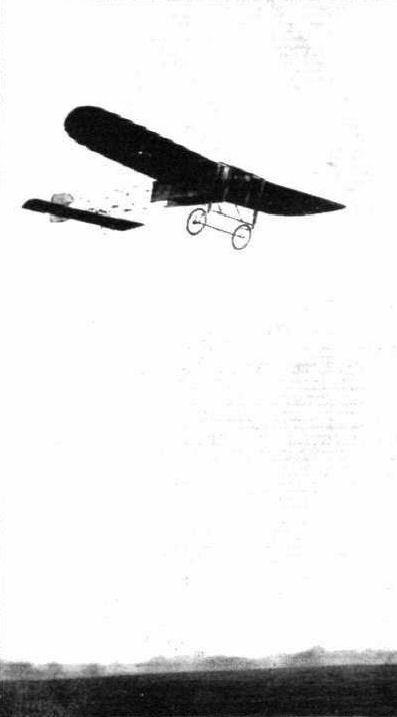 The centre portion of the Cody biplane which won the L5,000 in prizes in the Military Trials. THE MILITARY AEROPLANE COMPETITION. - Assembling the Cody biplane before the judges. Mr. S. F. Cody, ever active, assists in the operations. The photograph on the right shows the central part of the machine. The passenger seat, projecting from the side of the engine-bed, is worthy of note. 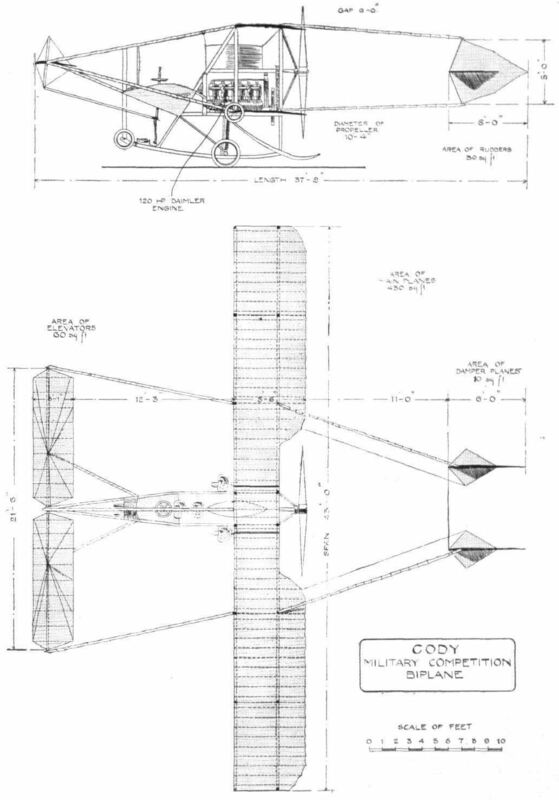 PLAN AND ELEVATION OF THE CODY BIPLANE, which won the first prize open to the world, and also the first prize open to British machines only, in the Military Aeroplane Trials. The above drawing represents the machine exactly as it finished the trials. The graceful Handley Page monoplane in flight at the London Aerodrome last week-end. 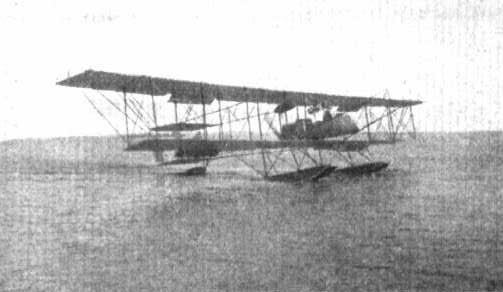 THE NAVY HYDRO-AEROPLANES. 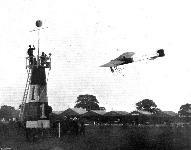 - Landing the Short monoplane and the Deperdussin machine in a lighter from the "Hibernia" at Lodmore. On the left Commander Samson after a flight on "S 38" on Lodmore ground. 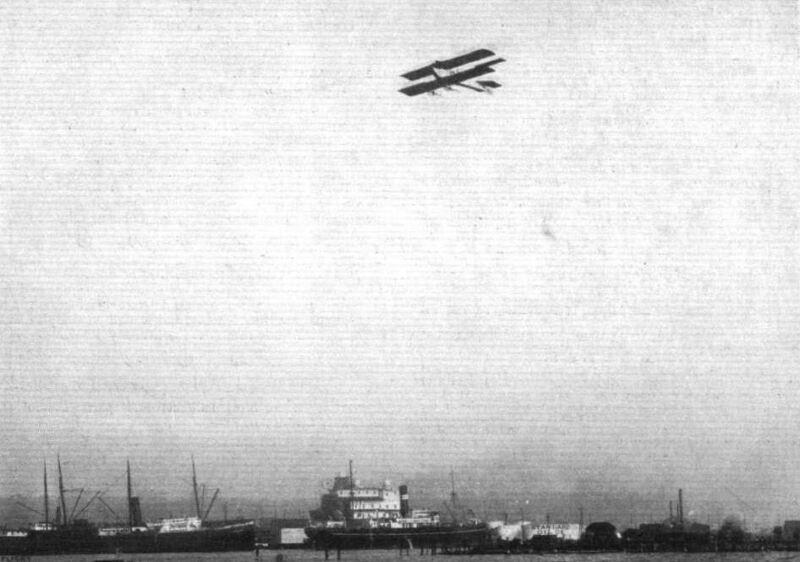 THE NAVAL HYDRO-AEROPLANES AS SEEN FROM THE "HIBERNIA." - Hoisting "S.38" on to the "Hibernia," and on the left the machine in place on the special platform. 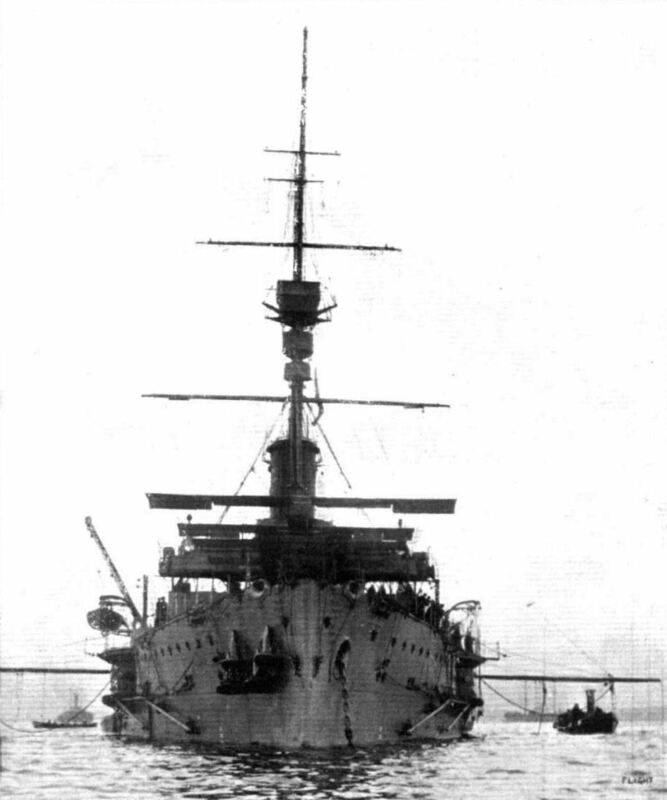 A front view of the hydro-aeroplane mother vessel, "Hibernia," with the Fleet at Weymouth, showing the Navy aeroplanes in place on the special launching platform. 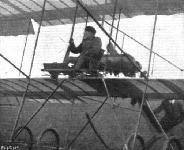 Commander Samson, on "S 38," in flight for Lodmore after launching from the deck of the "Hibernia," when travelling at 15 knots an hour. Weymouth is seen in the distance. WITHIN SIGHT OF ST. PAUL'S. - Mr. Frank K. McClean on his Short hydro-aeroplane on Sunday last. 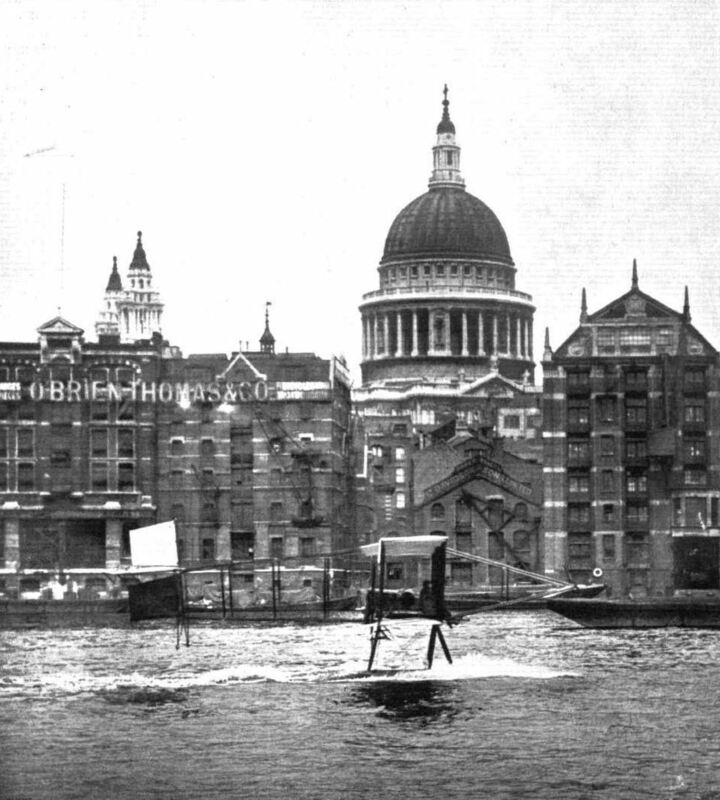 Mr. McClean, on his machine, is seen passing the point on the Thames at St. Paul's Cathedral, he keeping to the surface of the water owing to the restrictions of the police authorities, to which special regulations must, in a measure, be attributed the mishap which Mr. McClean suffered when, lower down the Thames, he endeavoured to take to the air at the point indicated by the police authorities. 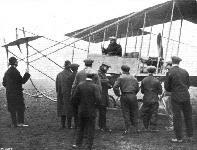 THE NEW HENRY FARMAN BIPLANE. - Extensive changes have been made in the construction of this new machine, the top and bottom pairs of tail outriggers being arranged in triangular form, and the tail surface itself being purely a monoplane type of organ with single vertical rudder. The position of the engine has also been changed and by virtue of its present position midway between the planes the constructors have been enabled to reduce the height of the landing chassis, thus contributing to its robust construction. 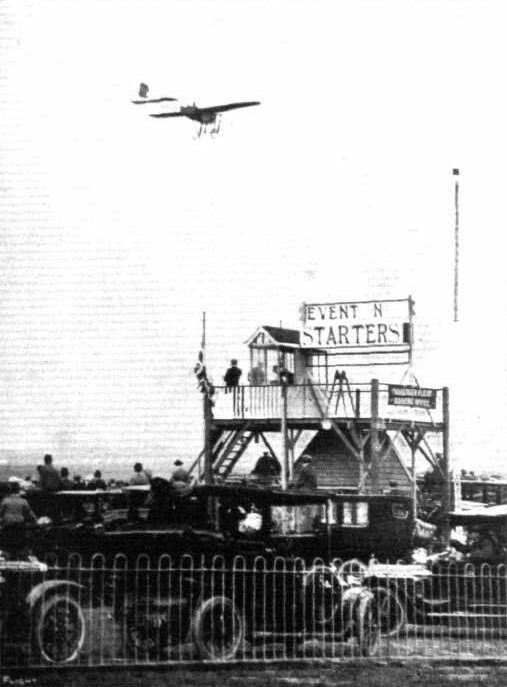 Mr. Grahame-White, on his new Henry Farman biplane, about to start from the beach at Folkestone for his flight to Hendon. Mrs. Grahame-White is standing on the extreme left of the picture. Note the shingly beach for getting off from. 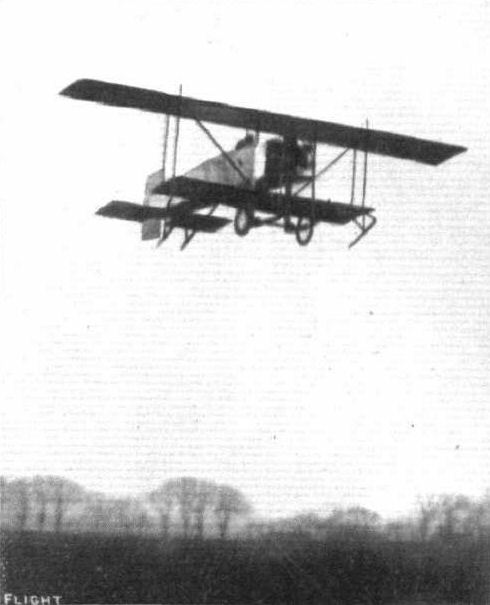 Two Henry Farman military type aeroplanes last week very successfully passed every test required by the British War Office bsfore taking over the machines, the tests finishing up with a vol plane with the motor stopped from 4,500 ft. Our photograph shows one of the machines on the ground. 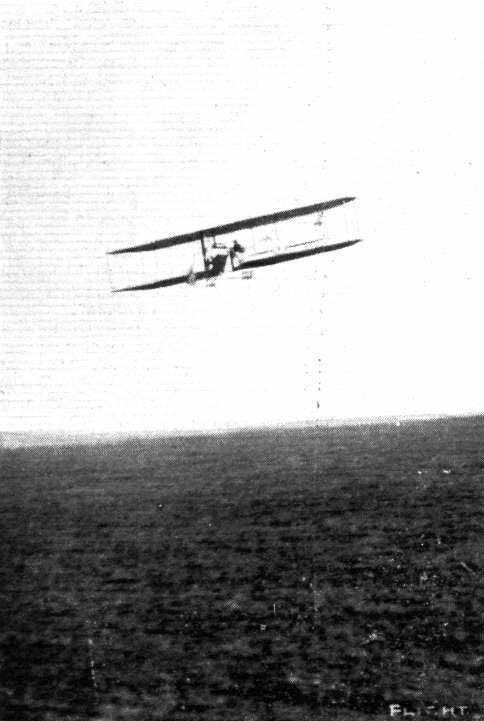 One of the Henry Farman military biplanes, just taken over by the British War Office, in flight. Mr. Claude Grahame-White, with Mr. Richard Gates as passenger, rounding pylon No. 2 "all out" during Saturday's Speed Contest at Hendon Aerodrome. A fine bit of banking by Mr. Claude Grahame-White on the Henry Farman, with Mr. R. T. Gates as passenger, round No. 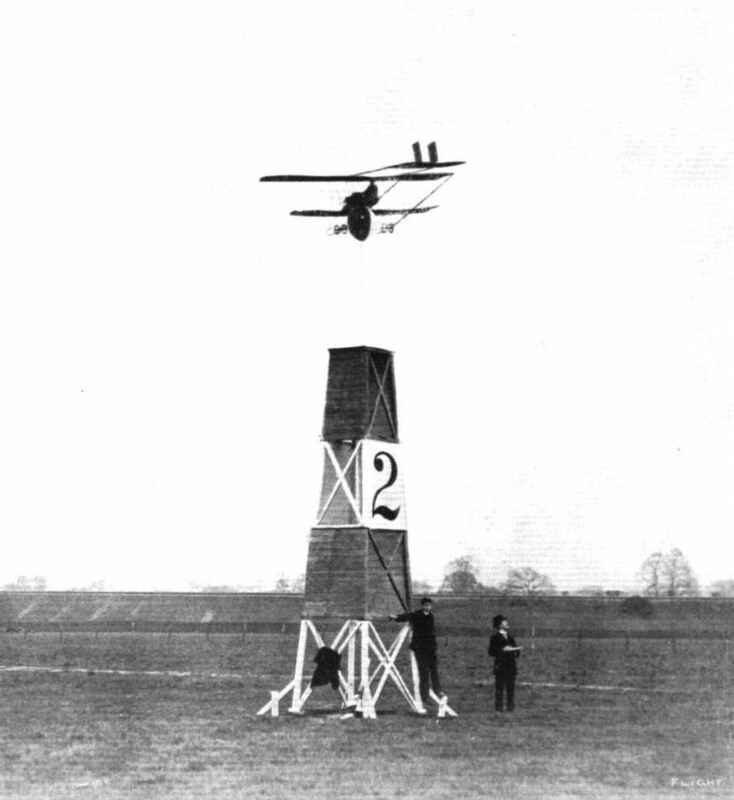 2 pylon at the Hendon Aerodrome during a speed contest. 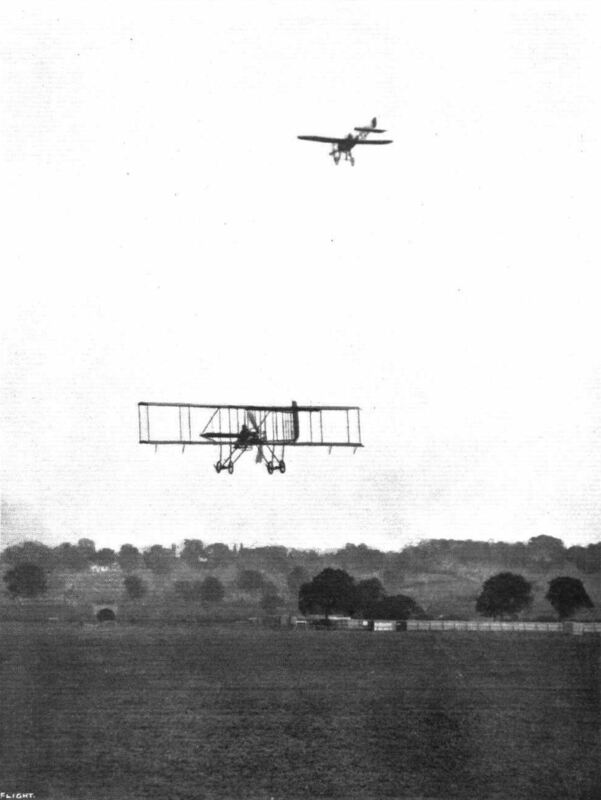 Mr. Claude Grahame-White flying his Henry Farman at Hendon, with Mr. Richard Gates as passenger. Note the distinctness of the two passengers seen in the photograph. Mr. Grahame-White's "Wake Up England!" 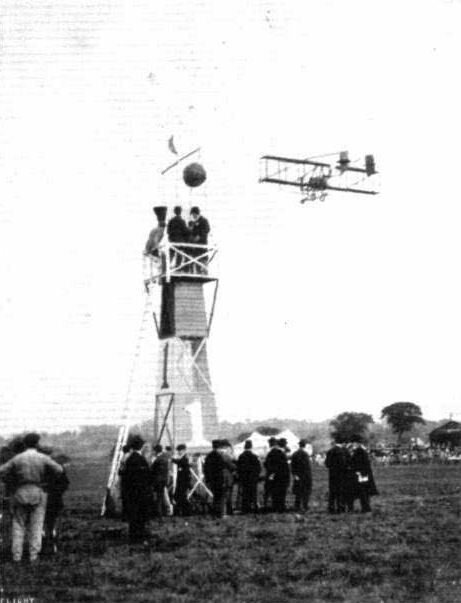 Henry Farman machine back at Hendon Aerodrome. 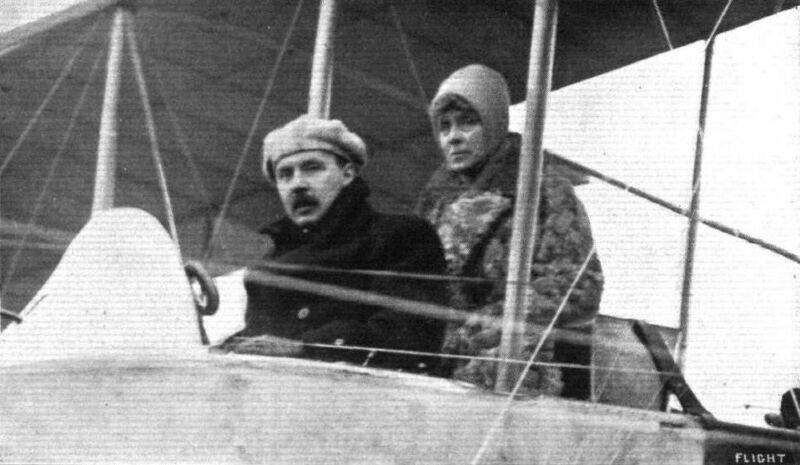 In our photograph Mr. Noel, with Mrs. Stocks as passenger, is flying in the speed handicap last week-end. 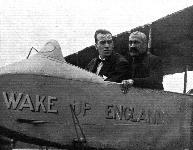 Mr. Grahame-Whlte in the seat of his n ew Henry Farman biplane, with Mr. Gates, the popular aerodrome manager, as his passenger. 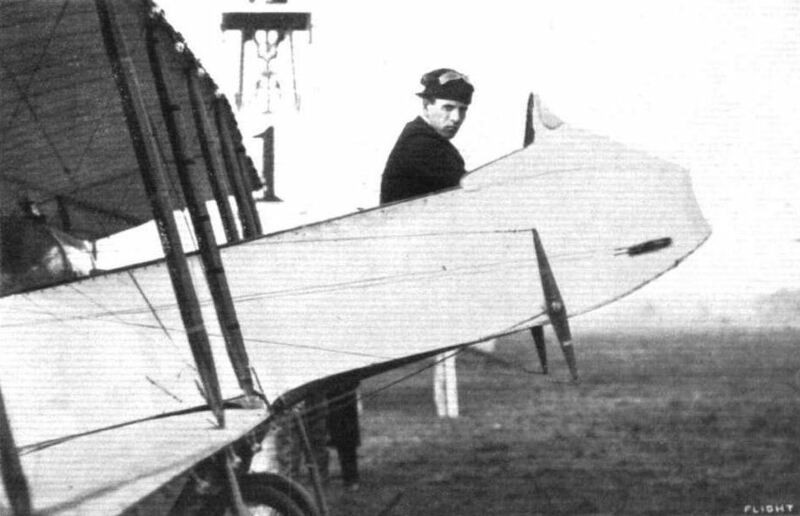 Mr. Claude Grahame-White, in his Henry Farman, about to take up as passenger, one of the King's Indian orderly officers, at the London Aerodrome, Hendon.